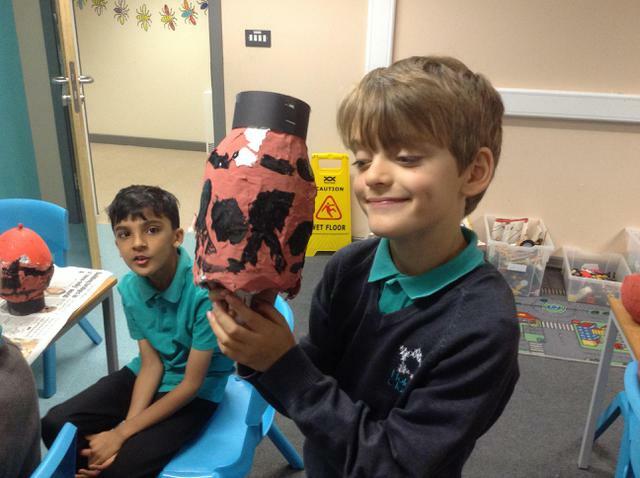 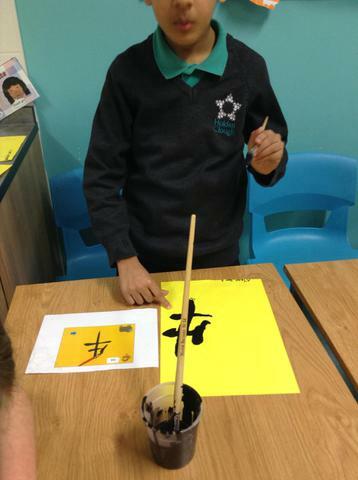 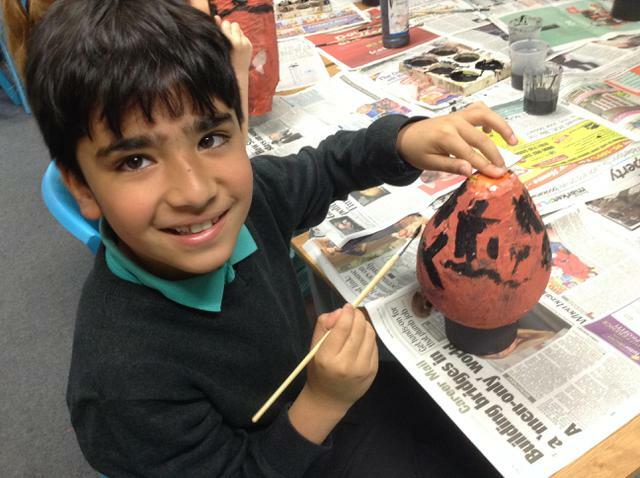 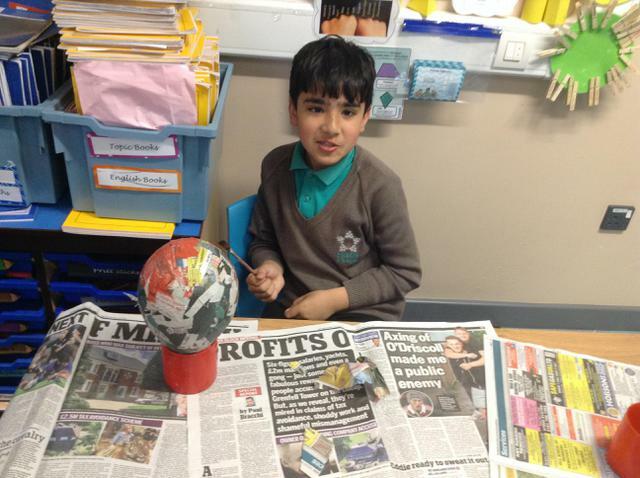 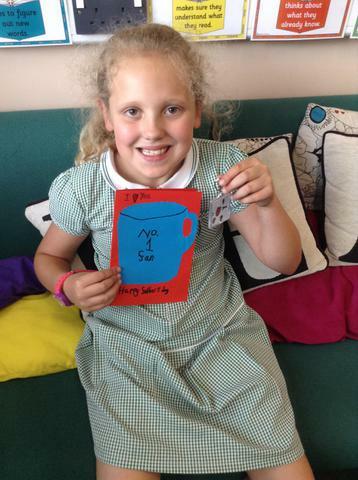 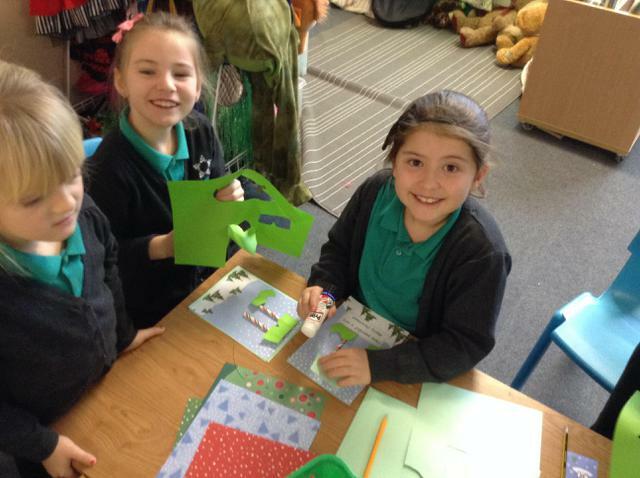 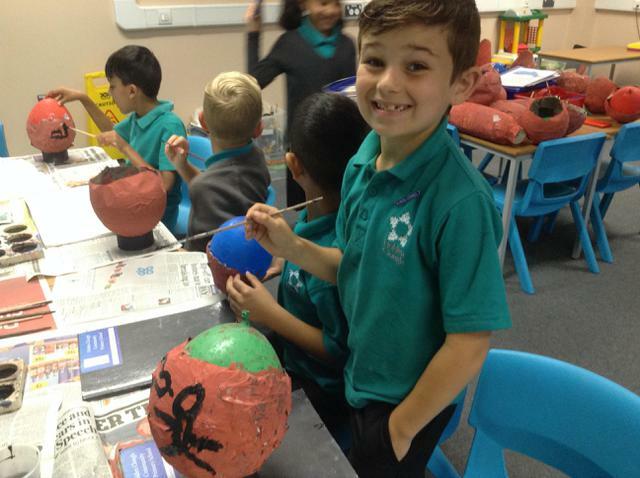 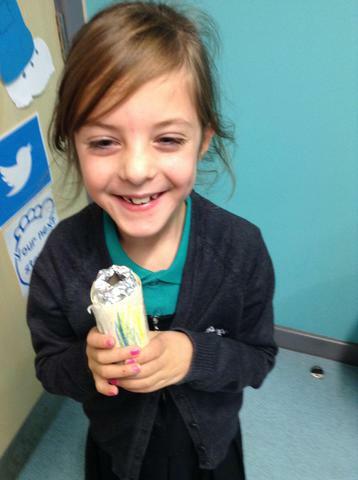 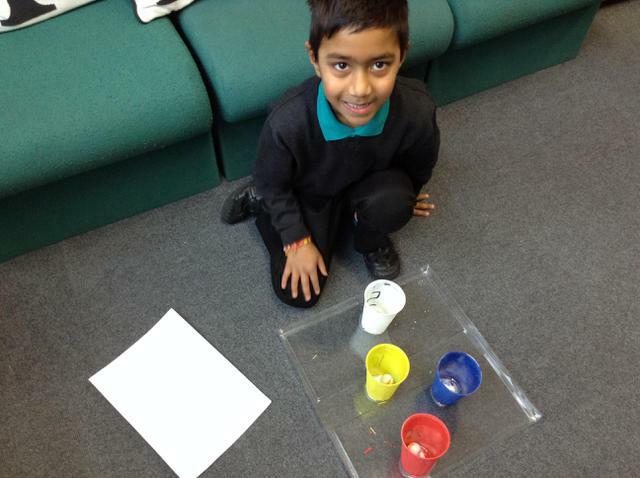 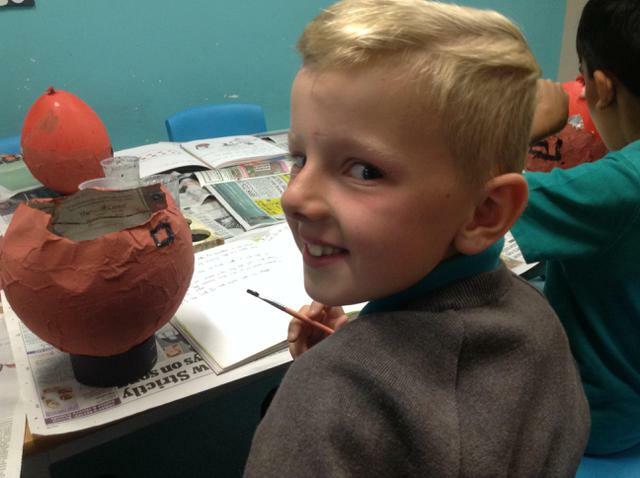 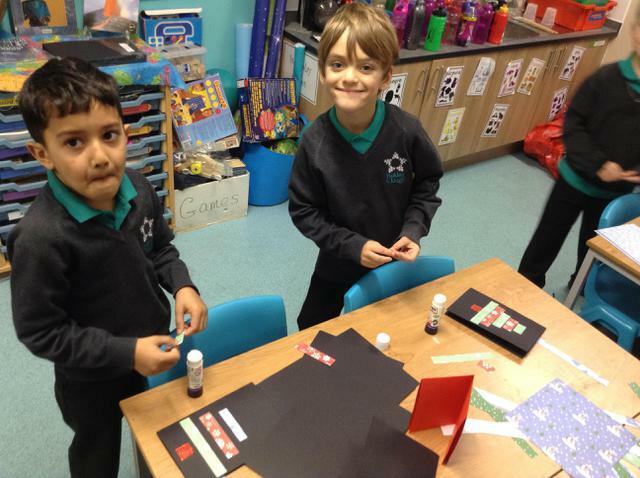 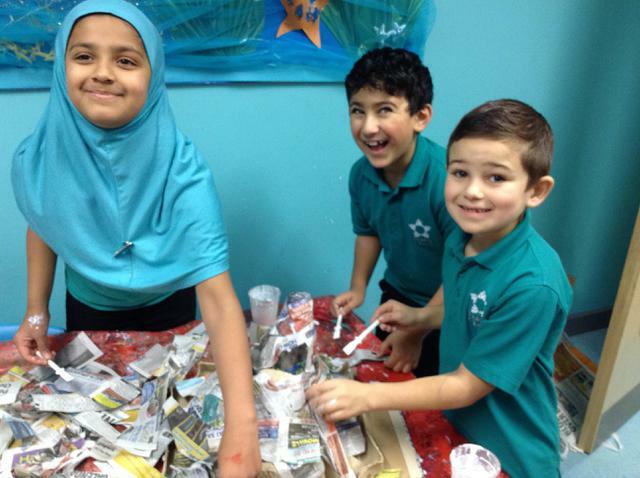 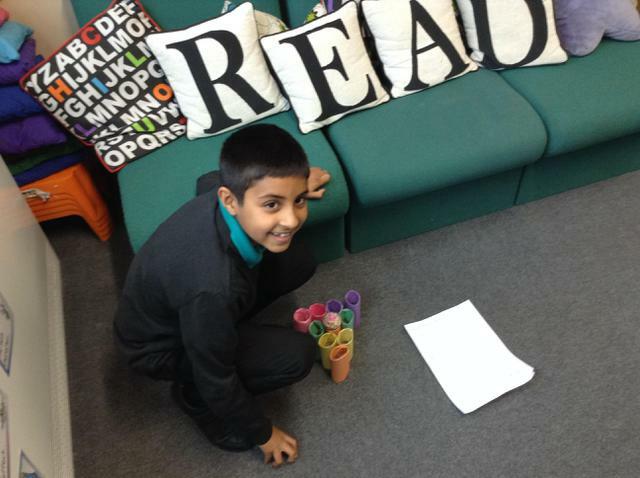 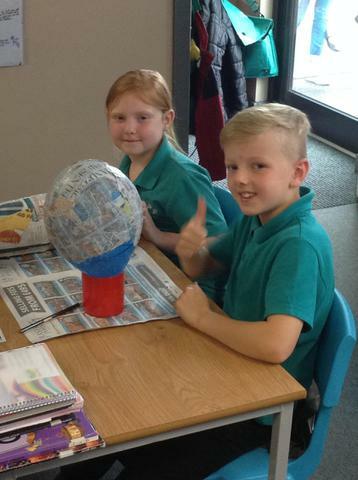 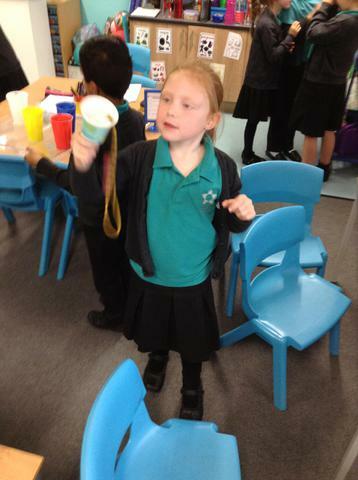 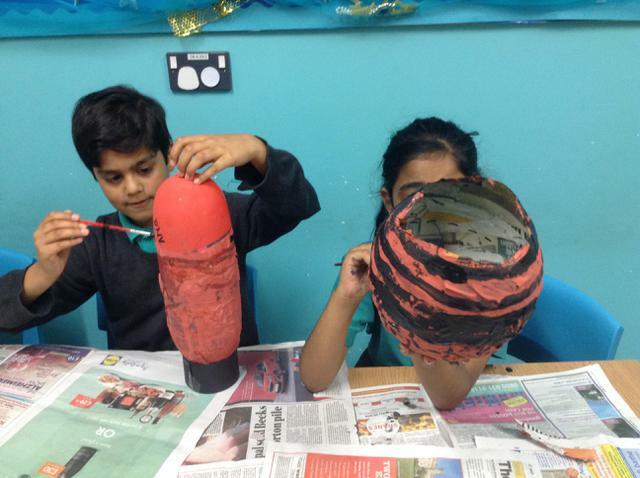 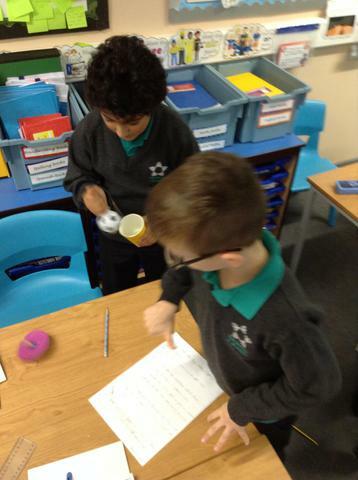 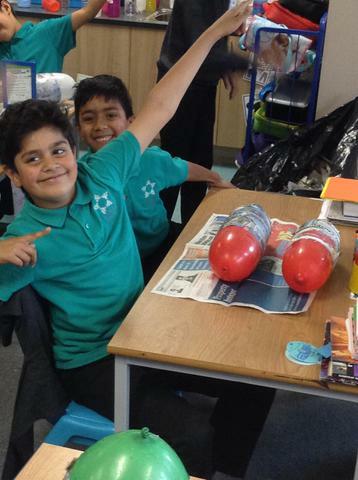 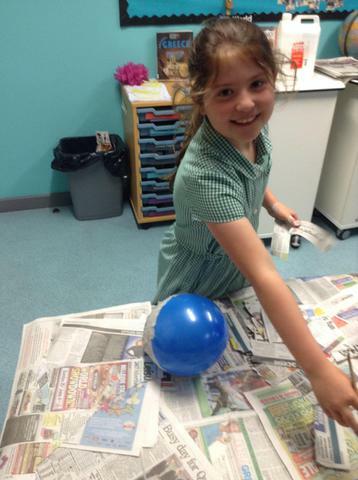 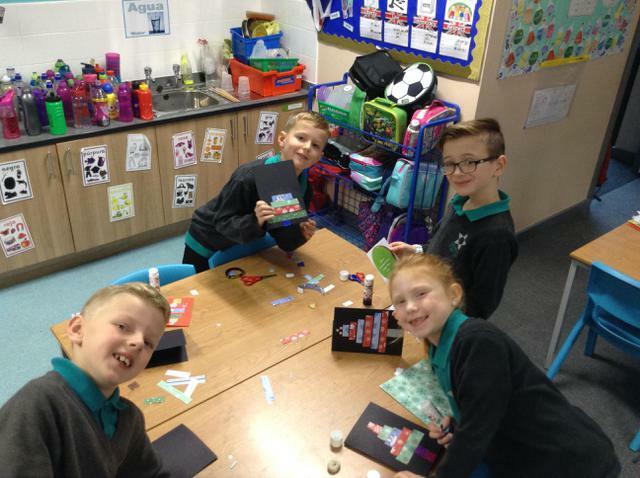 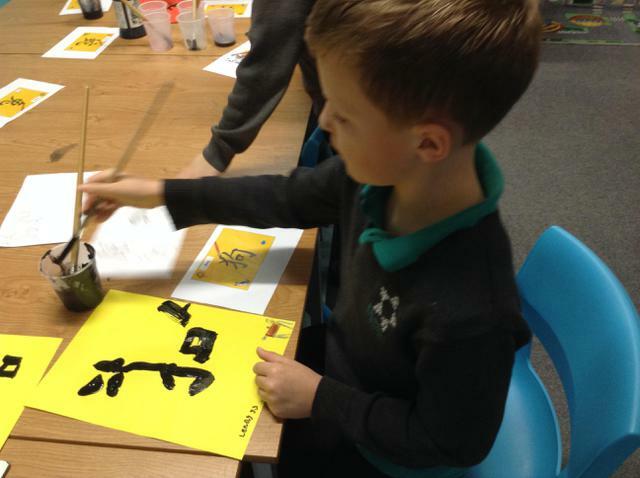 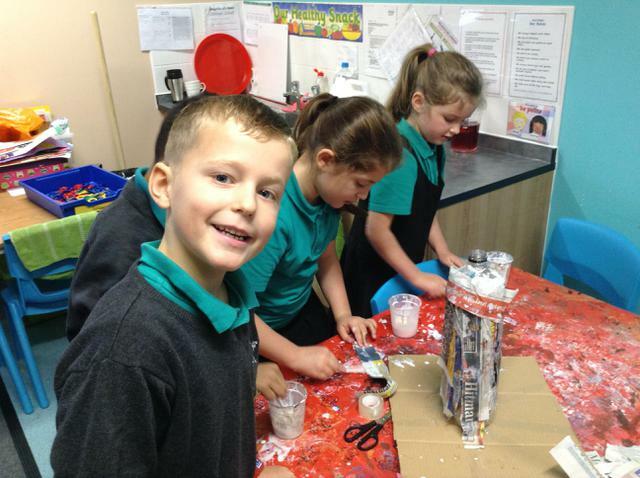 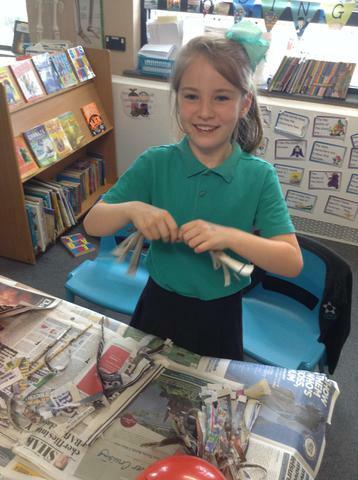 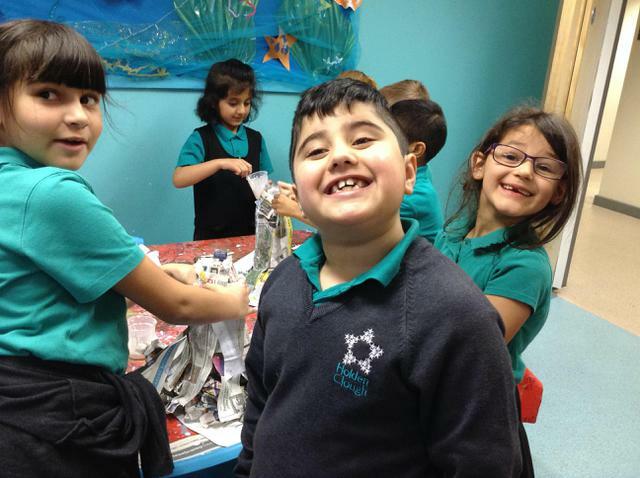 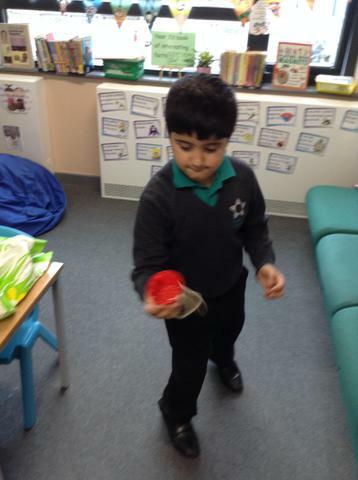 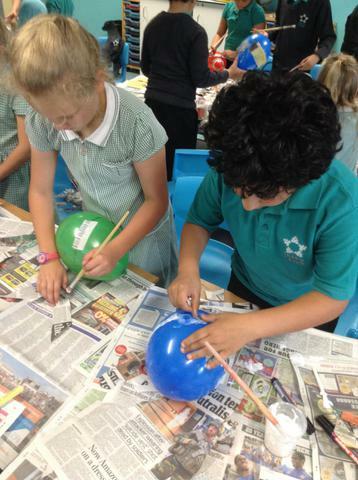 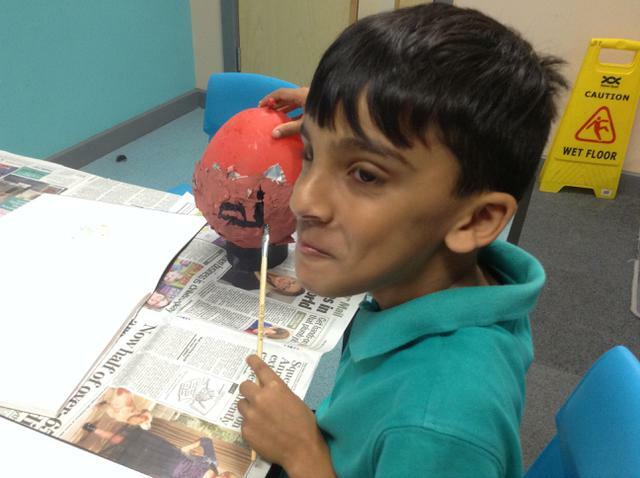 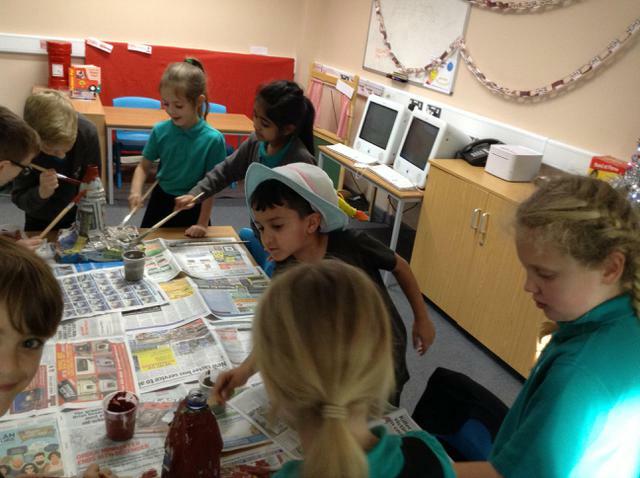 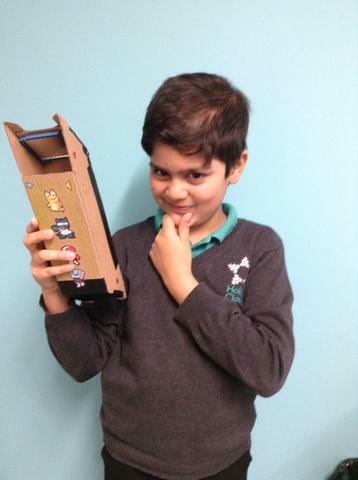 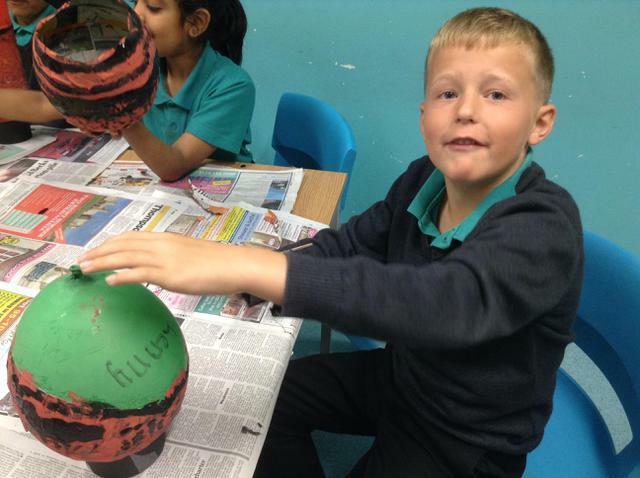 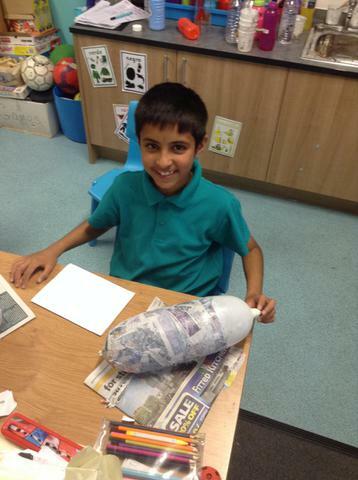 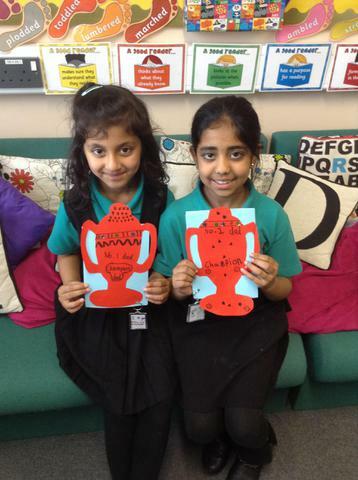 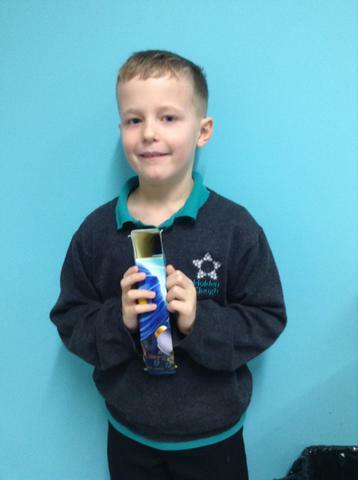 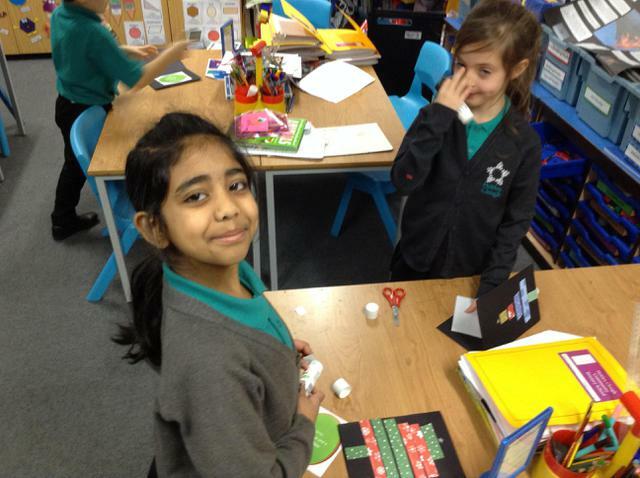 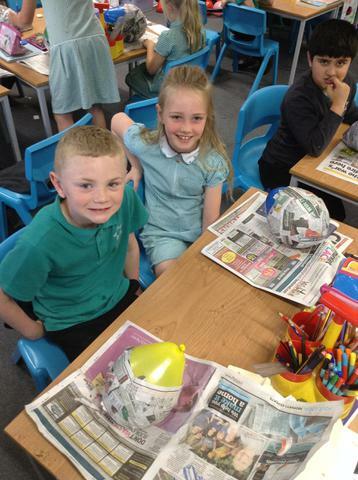 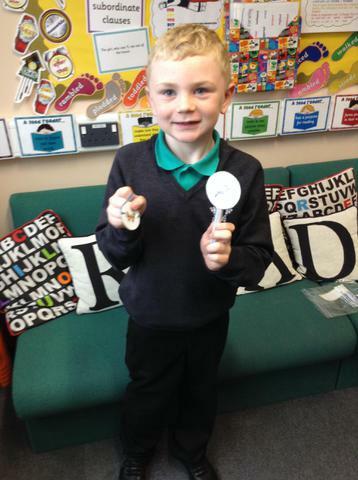 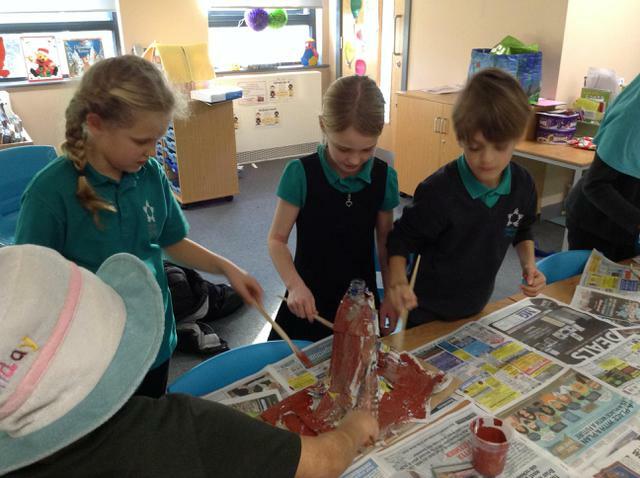 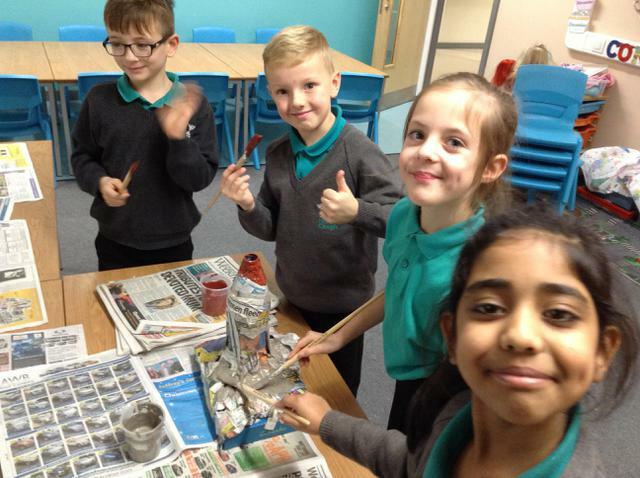 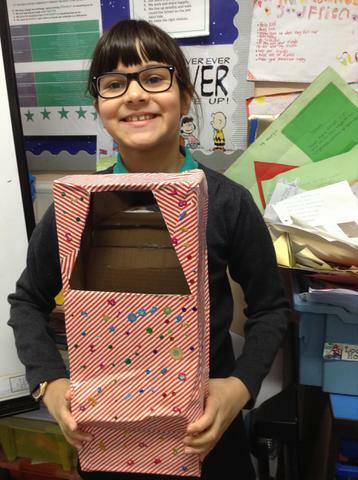 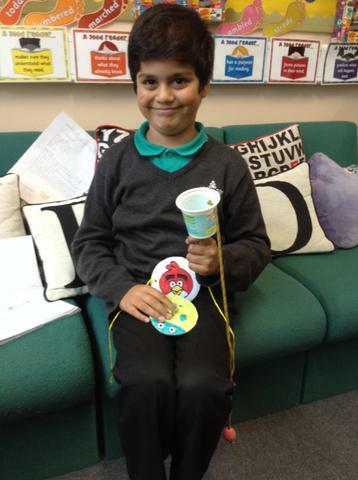 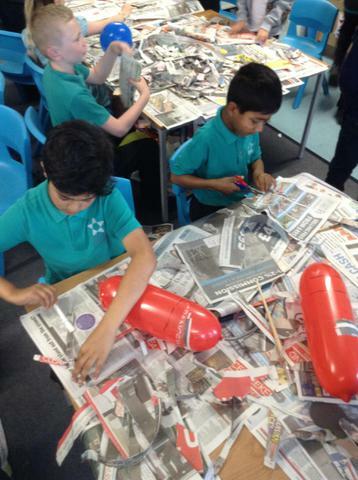 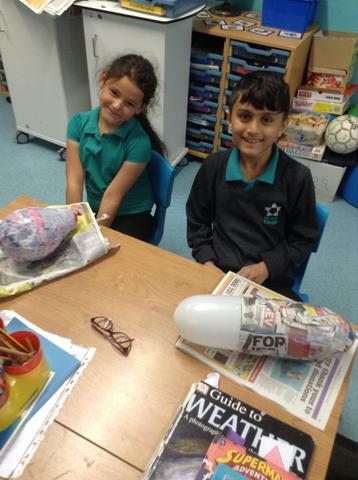 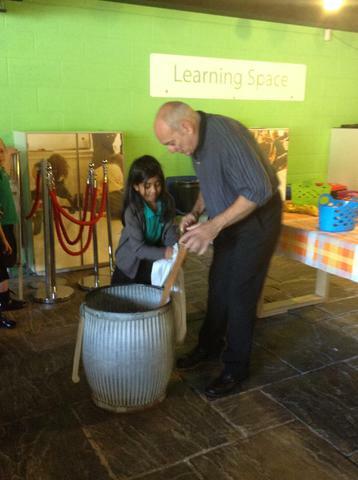 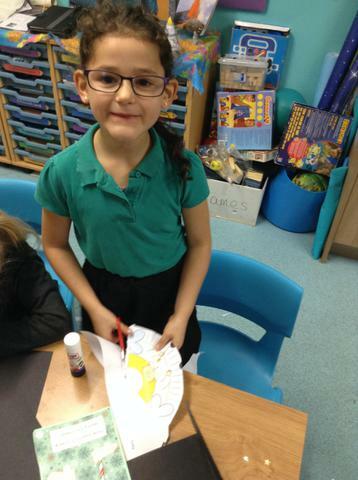 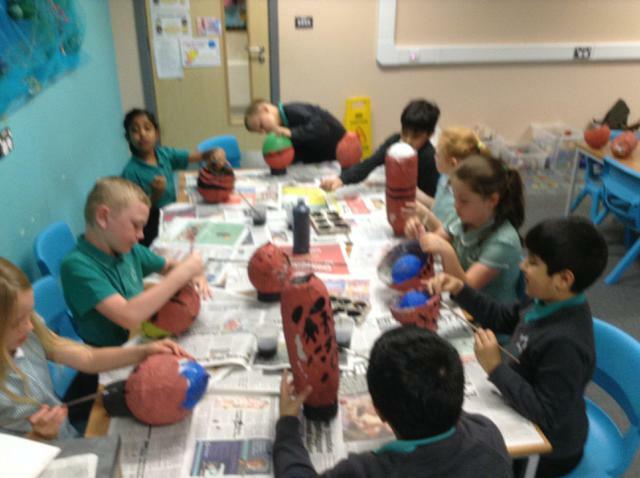 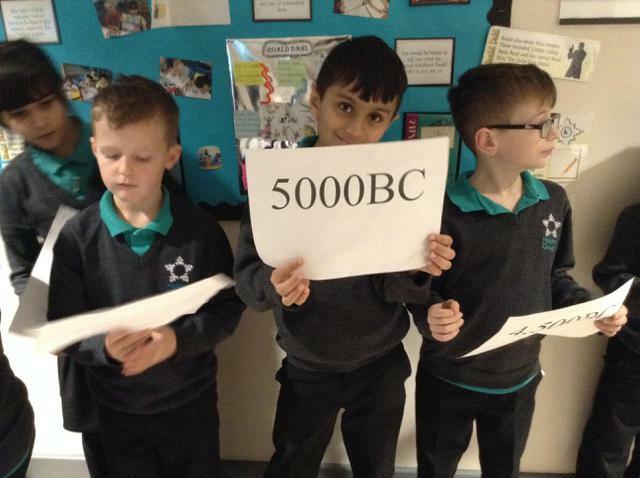 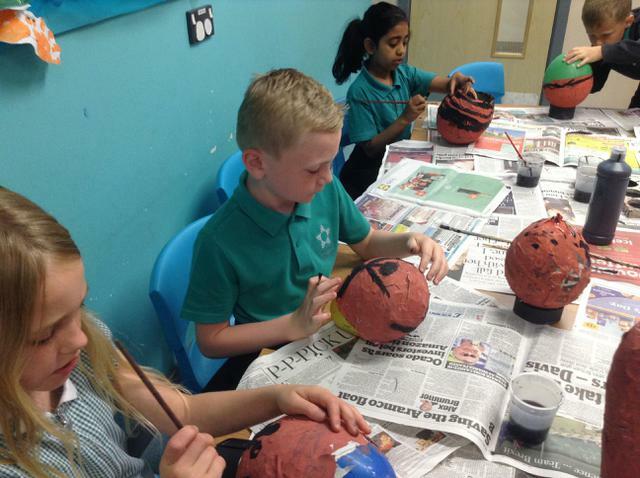 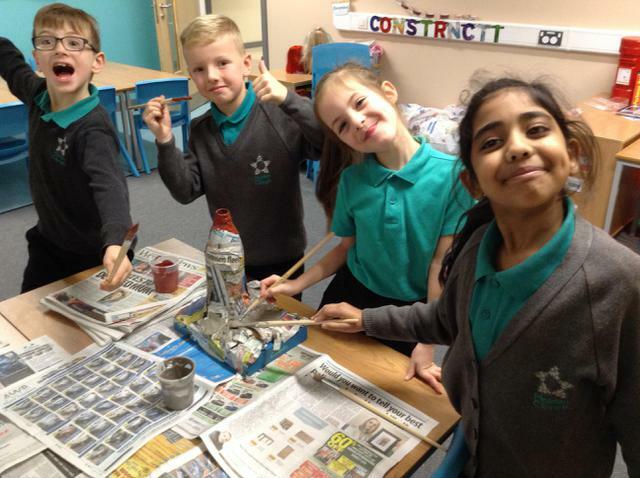 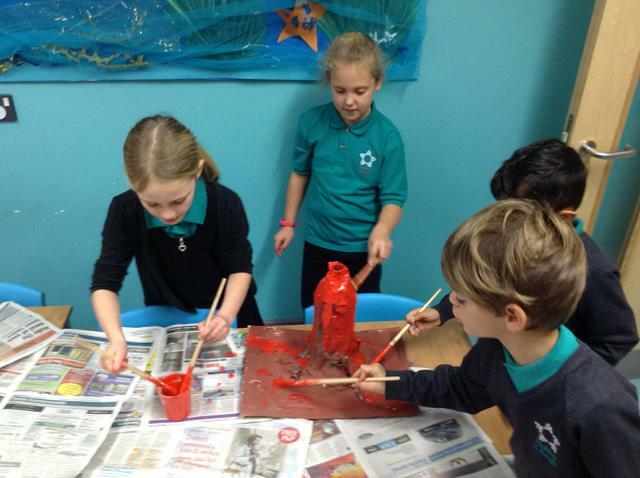 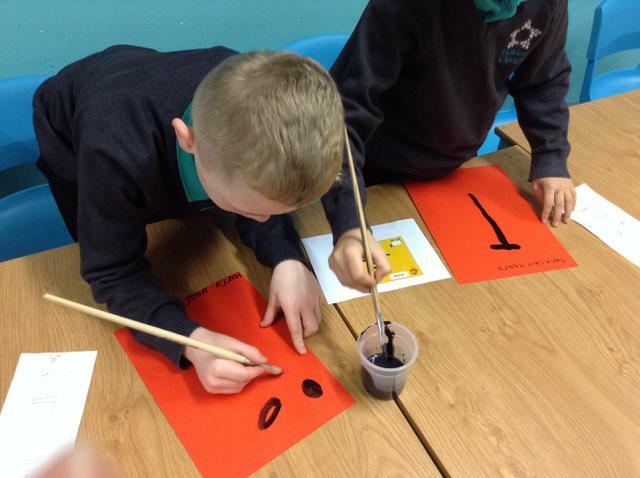 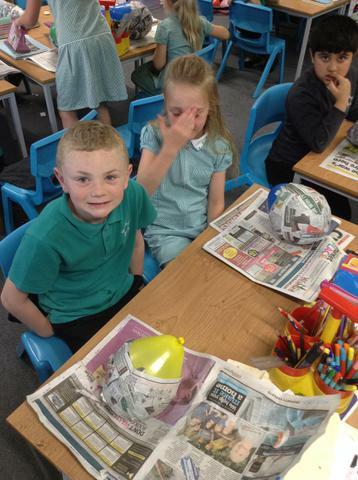 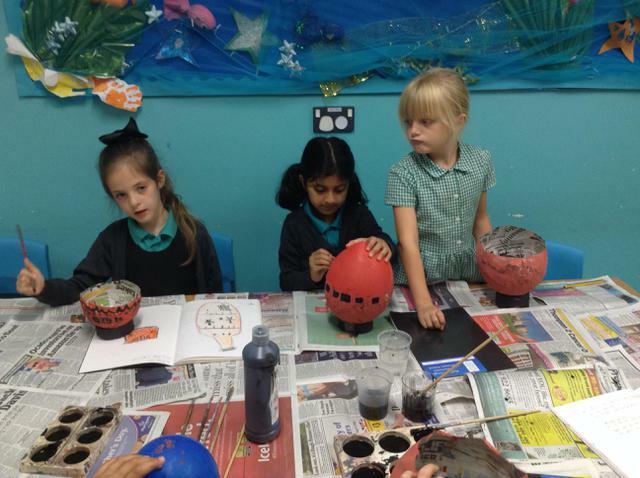 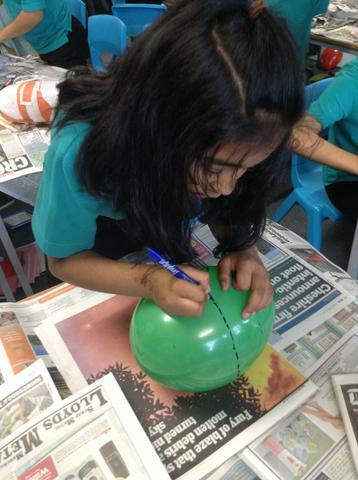 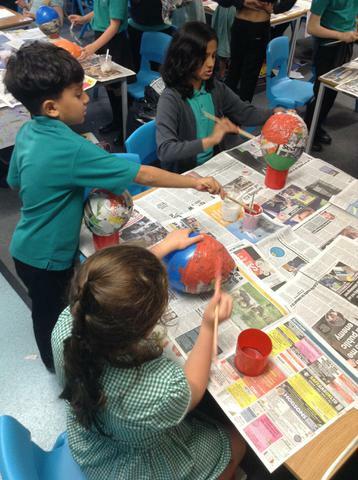 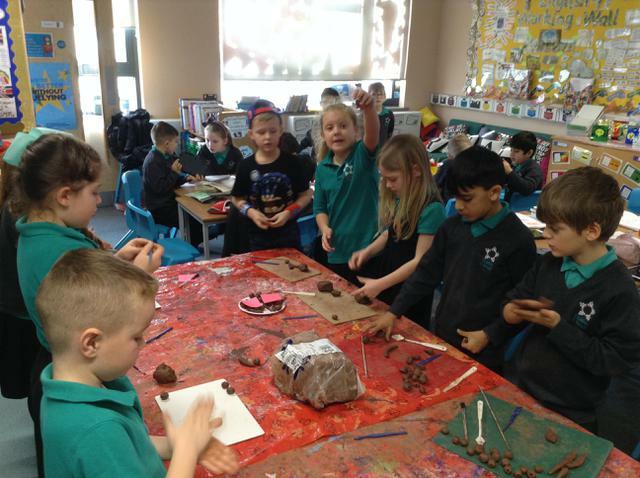 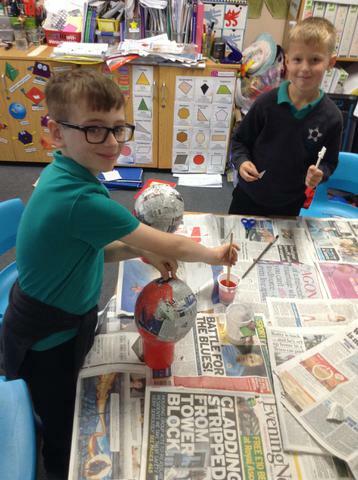 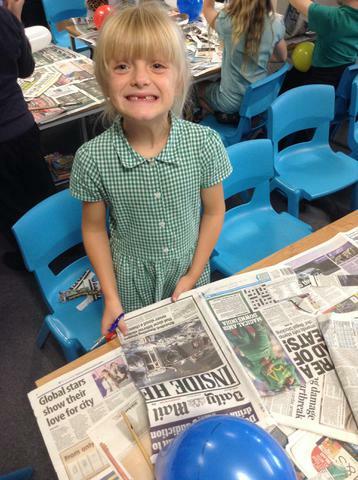 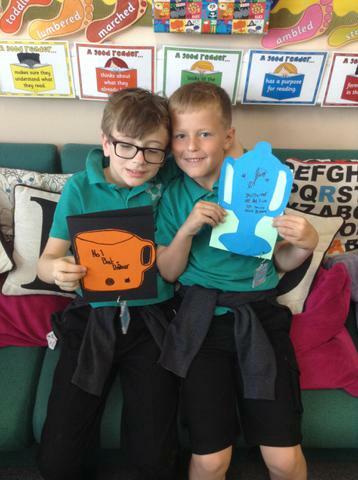 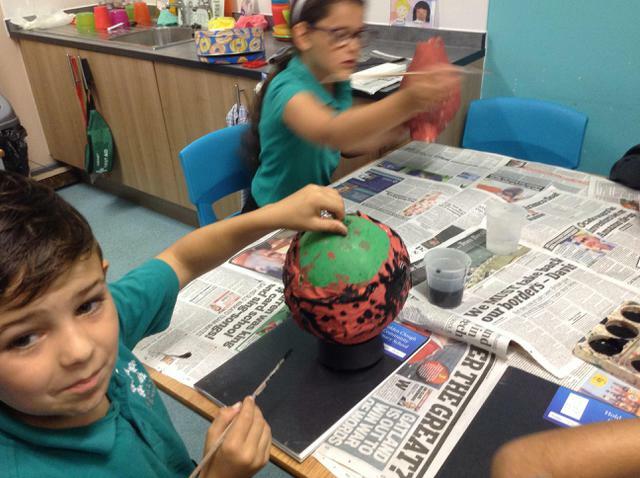 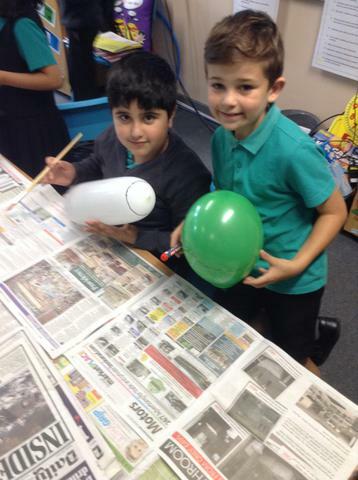 We have been researching, designing and making our own Greek pots. 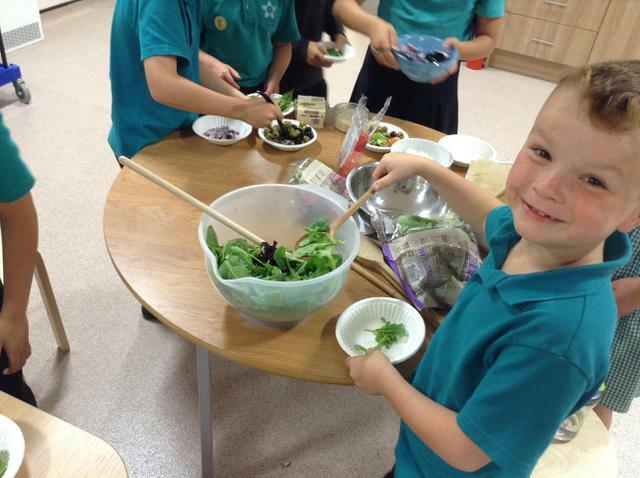 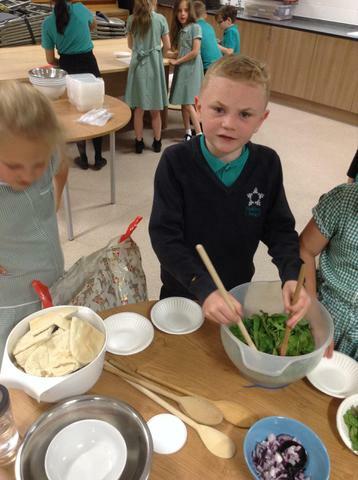 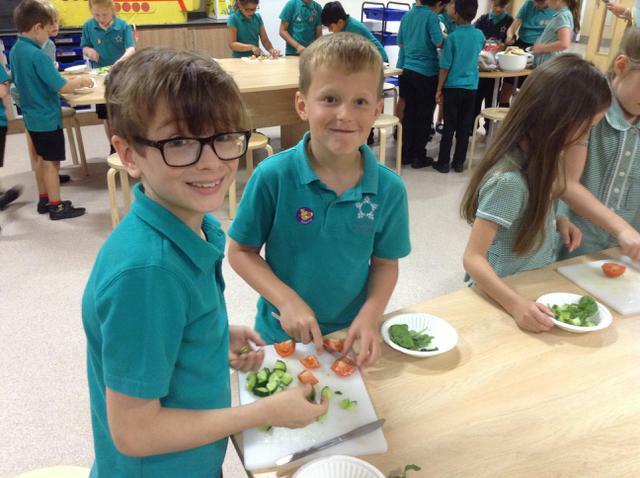 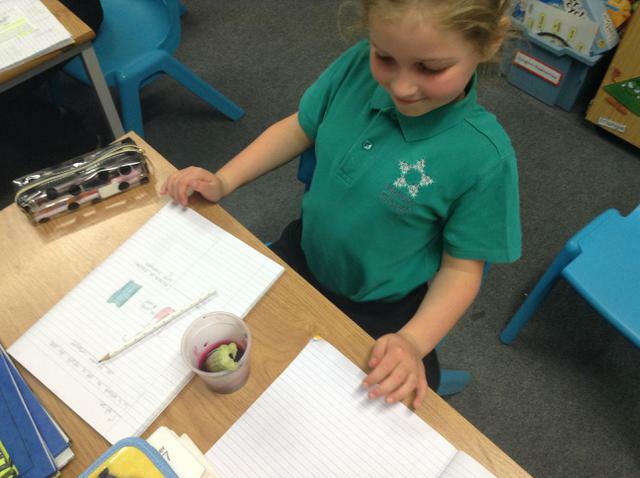 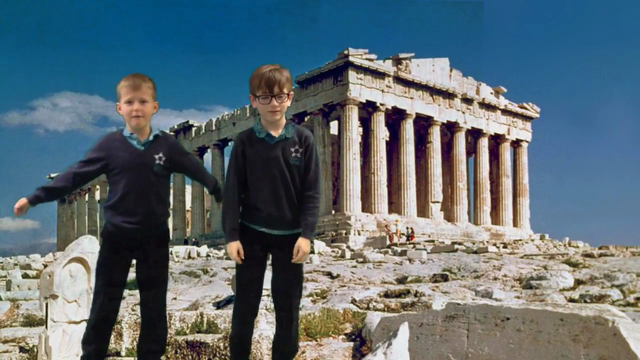 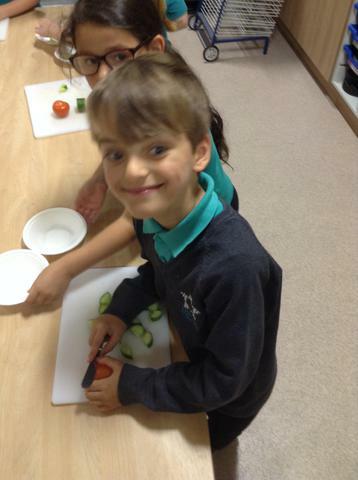 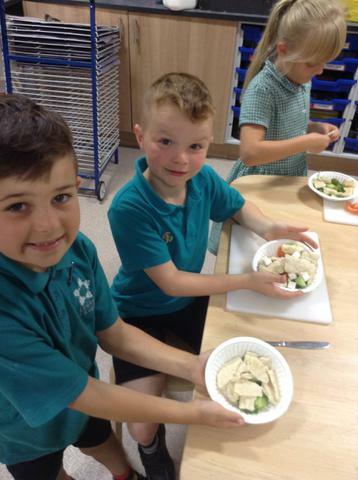 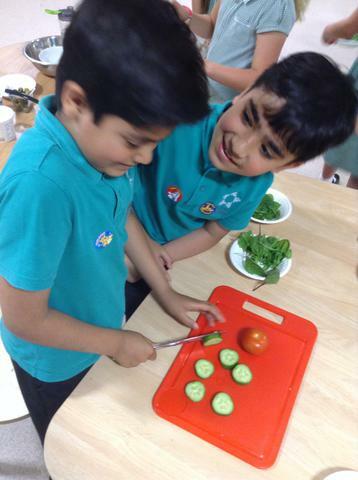 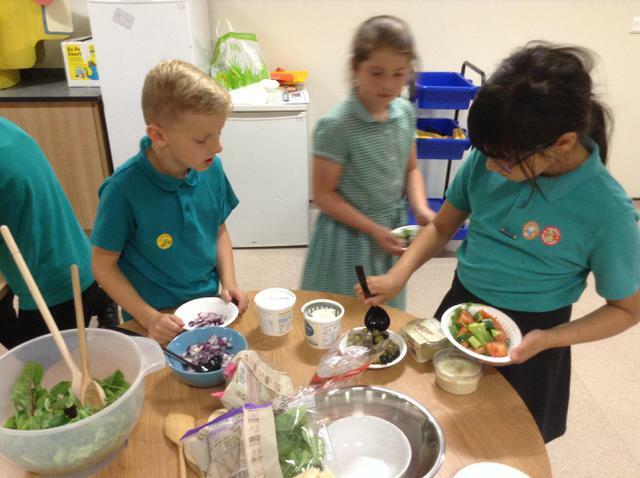 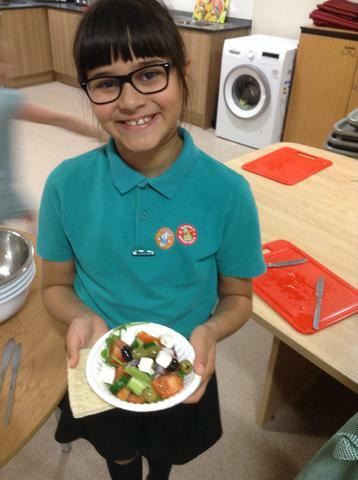 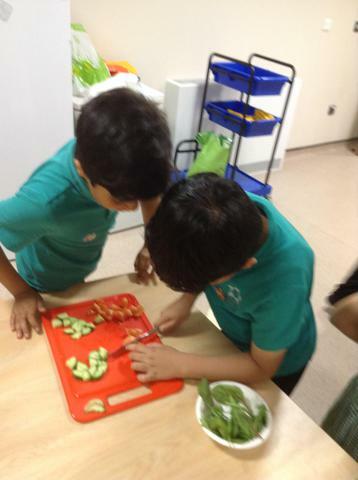 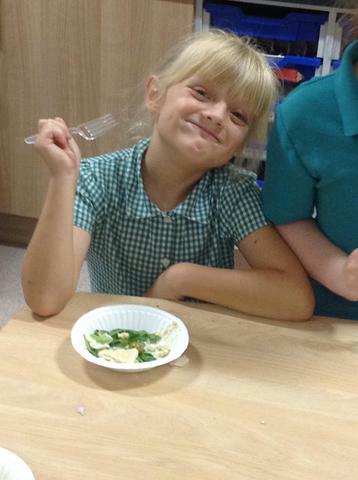 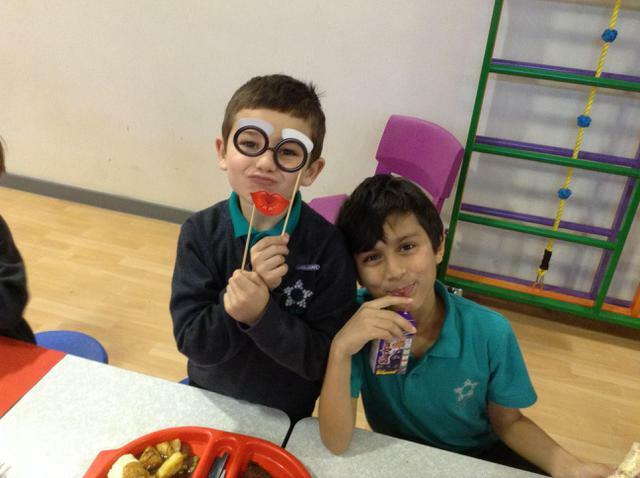 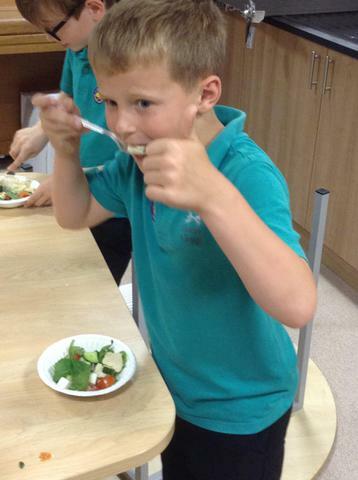 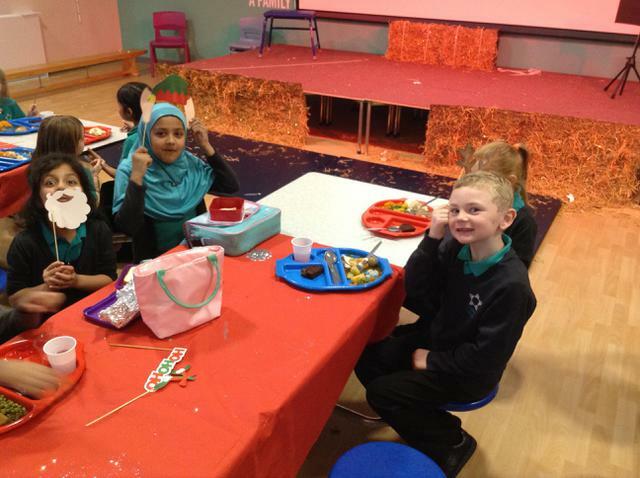 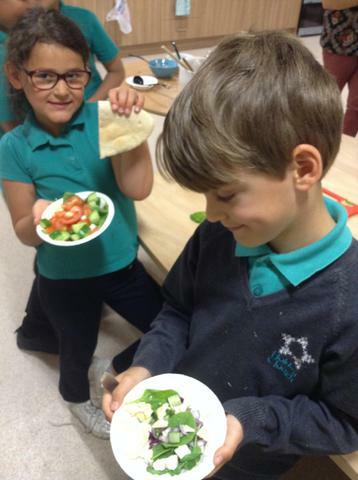 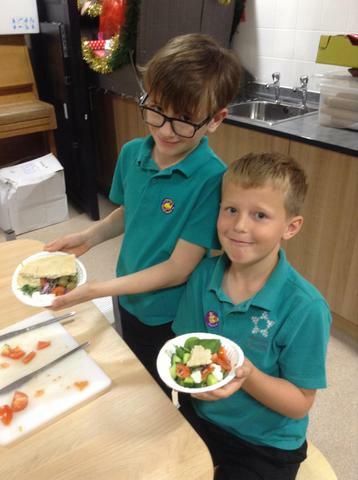 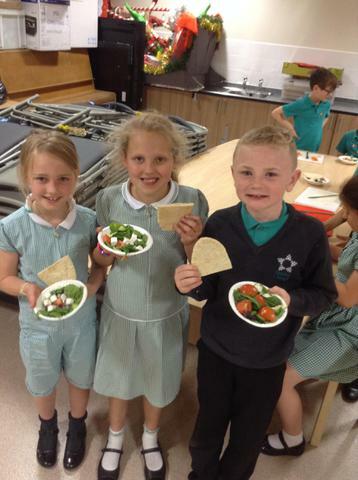 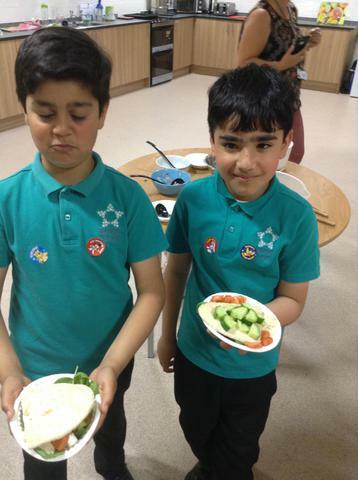 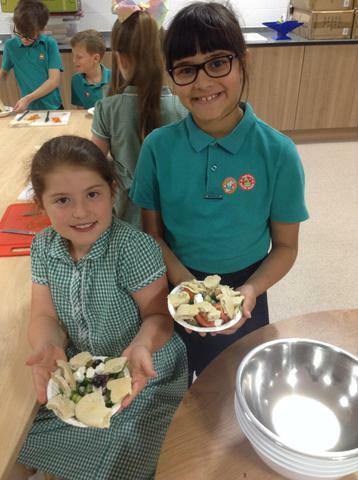 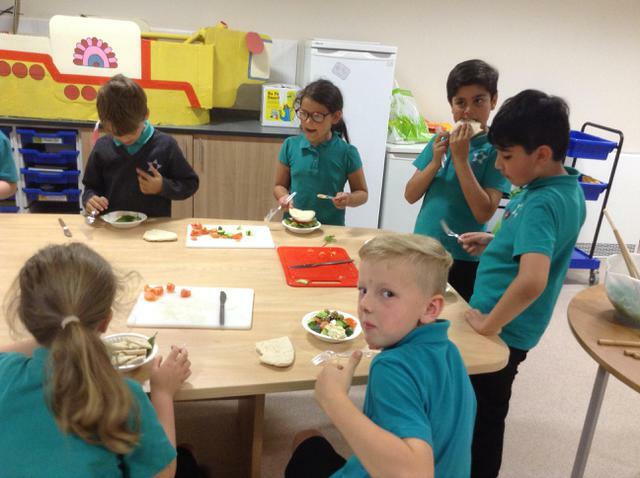 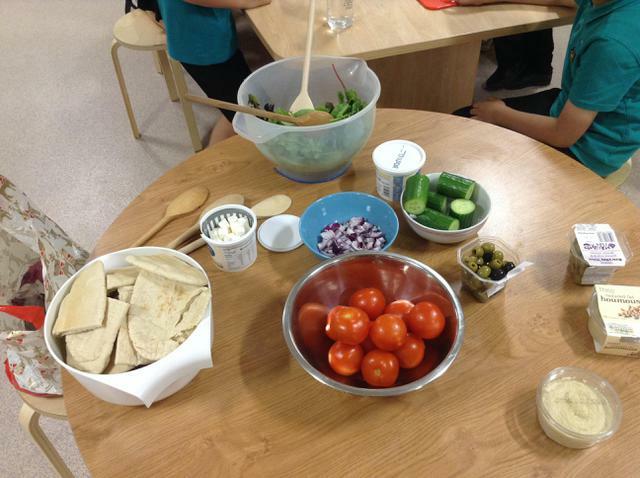 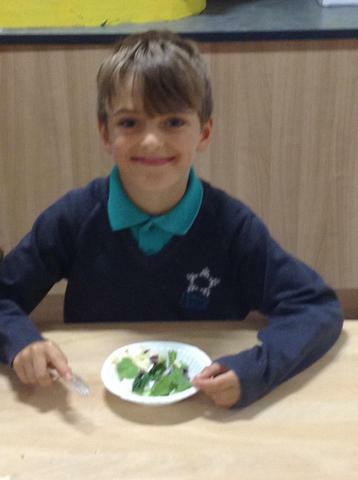 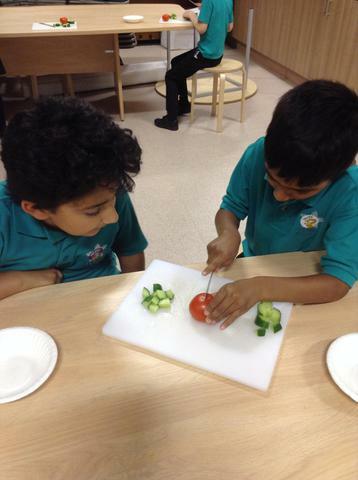 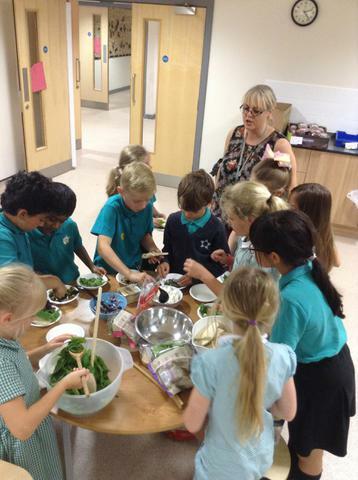 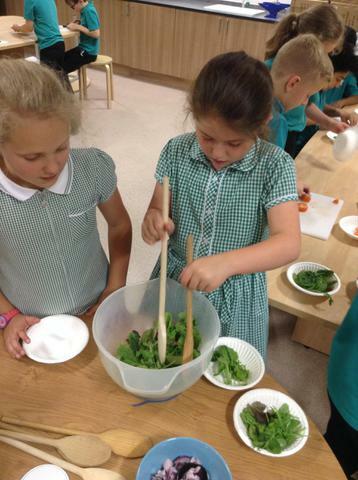 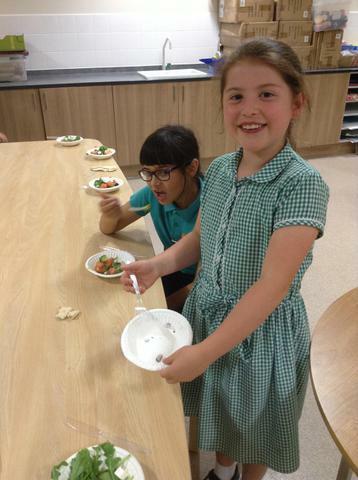 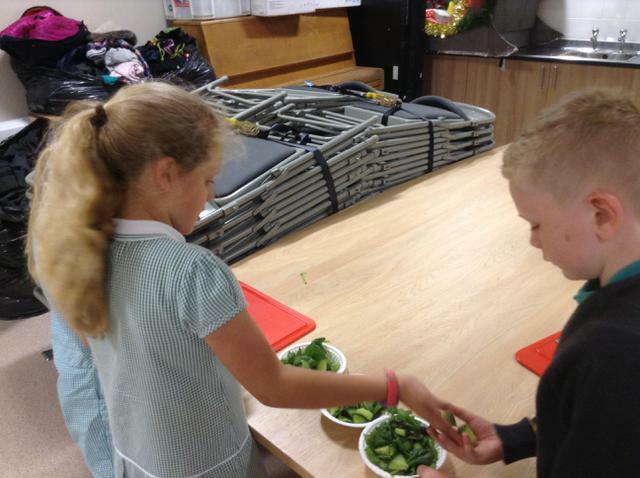 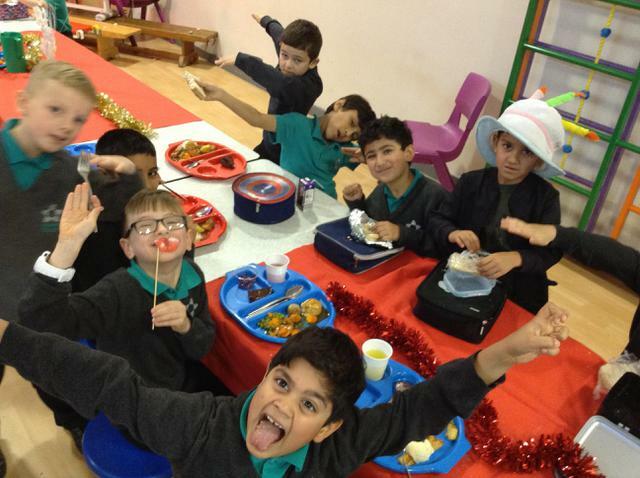 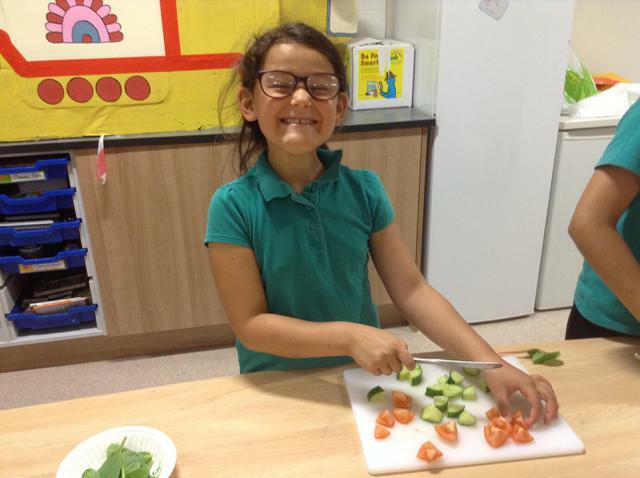 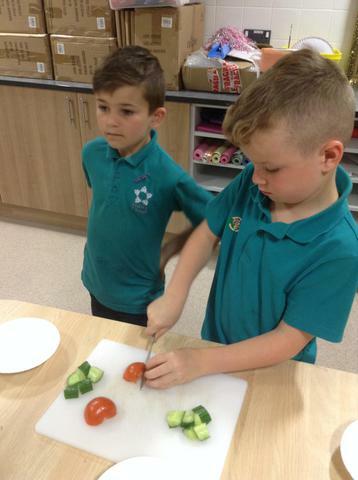 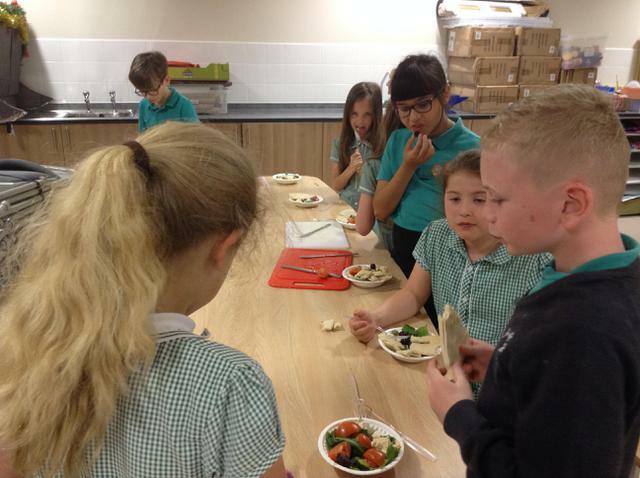 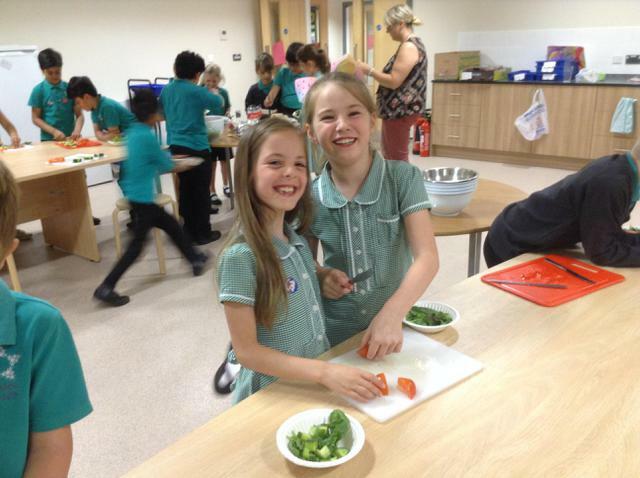 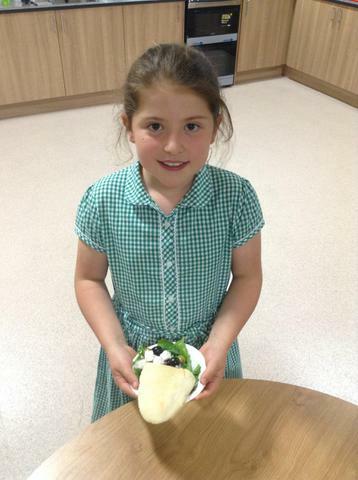 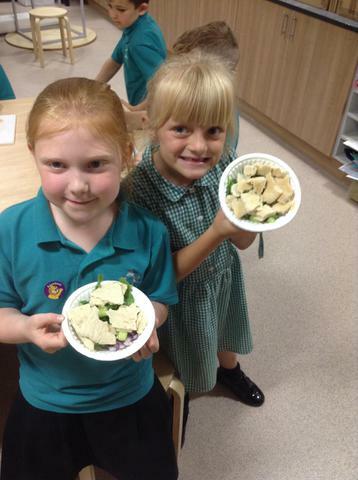 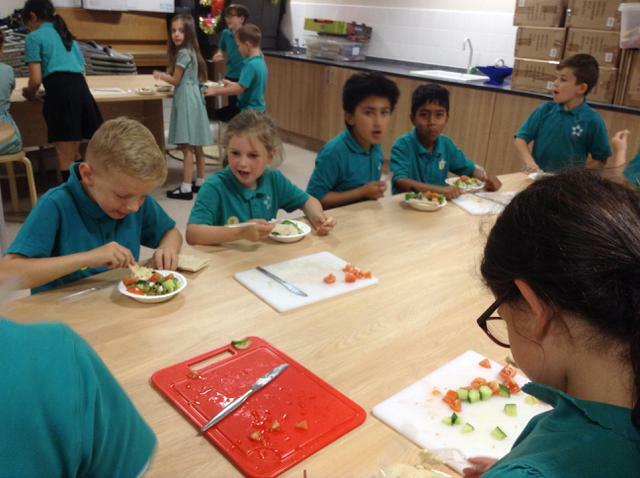 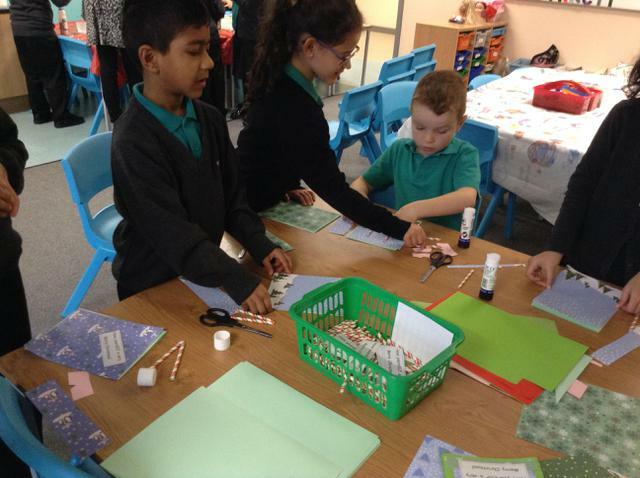 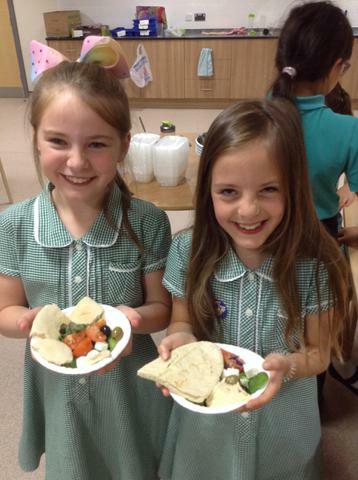 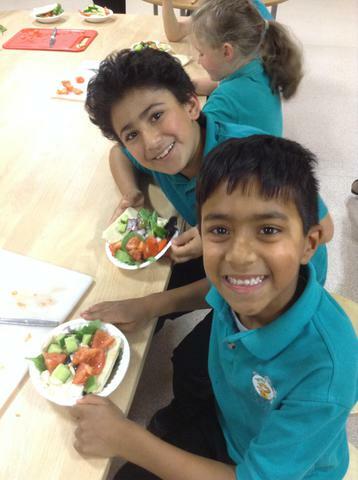 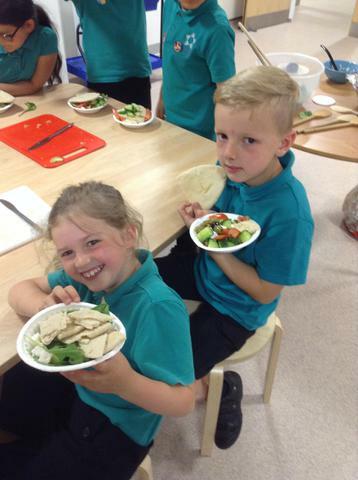 We linked our topic work with Health Week and made a Greek Salad. 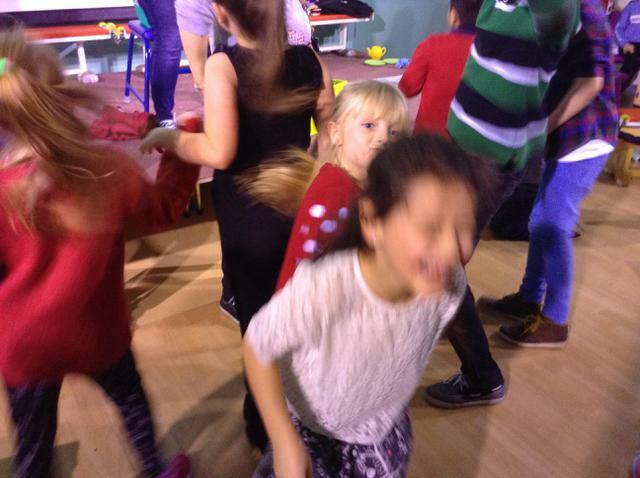 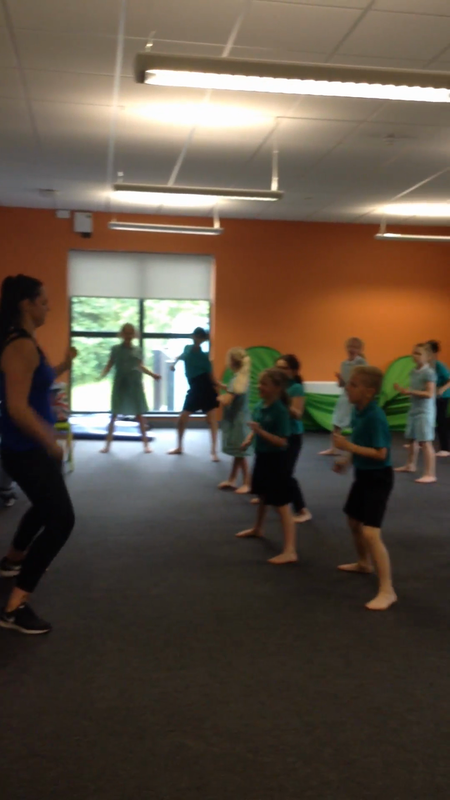 Kicking off Health Week with a bit of Zumba! 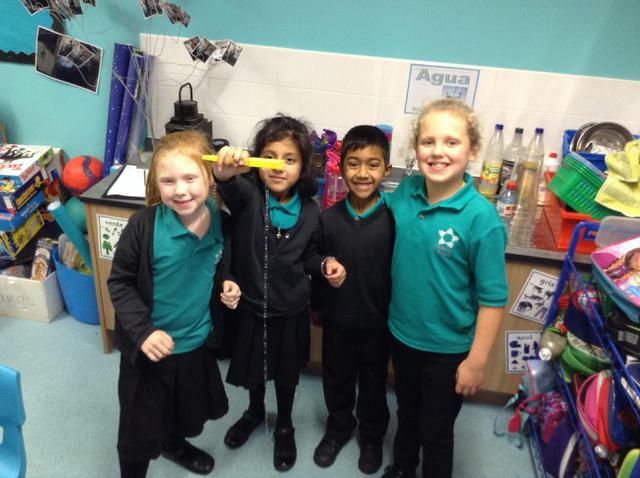 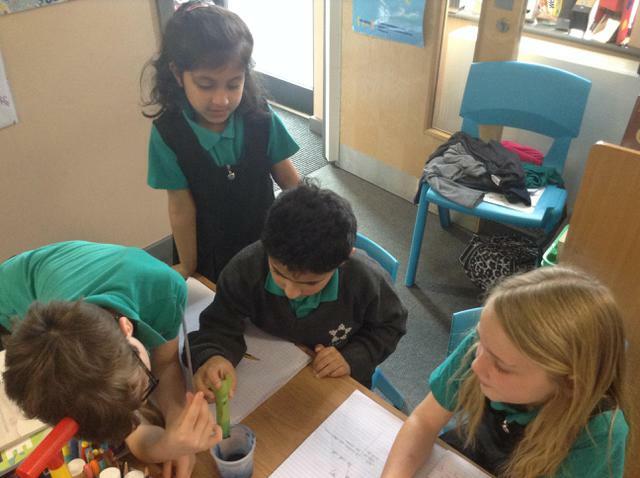 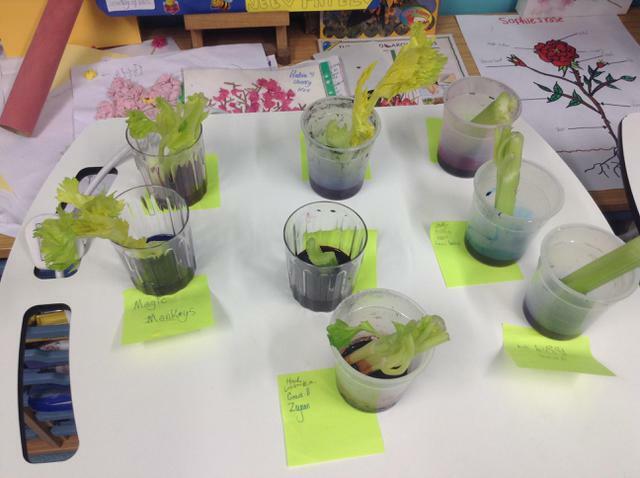 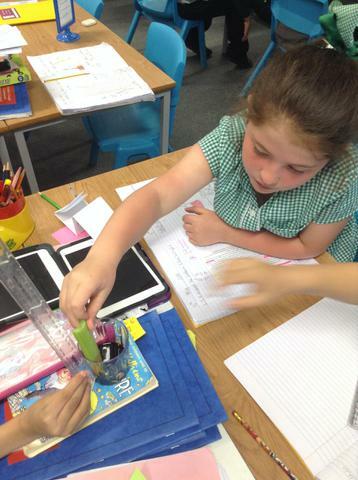 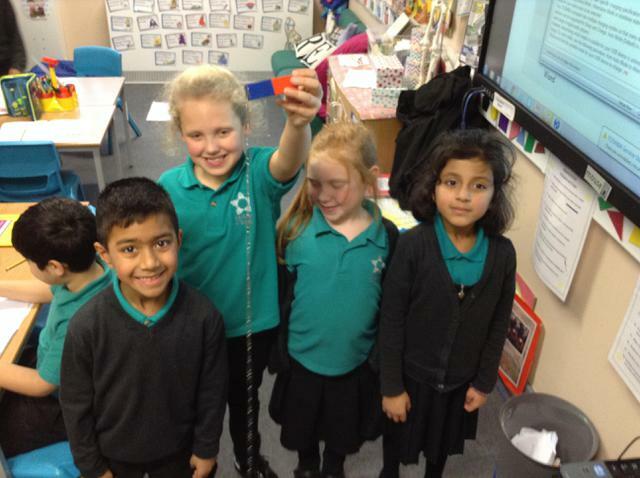 Investigating the transportation of water in plants. 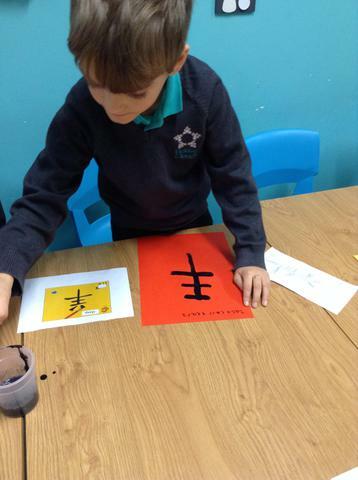 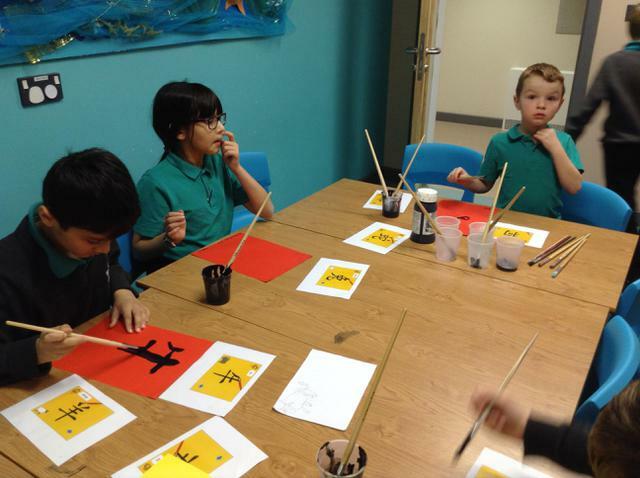 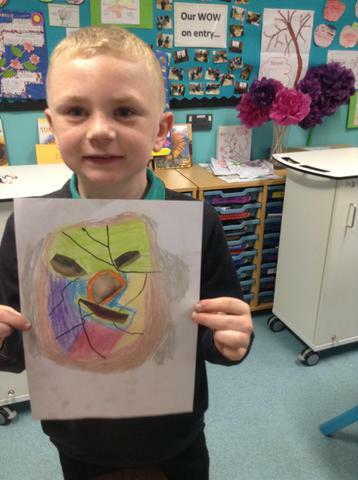 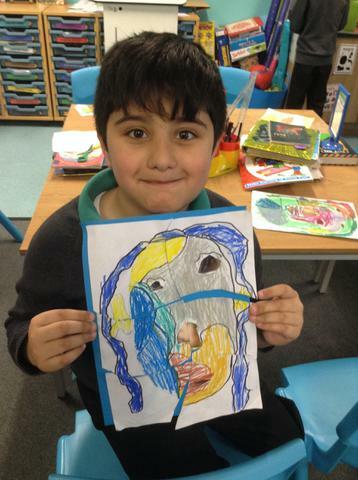 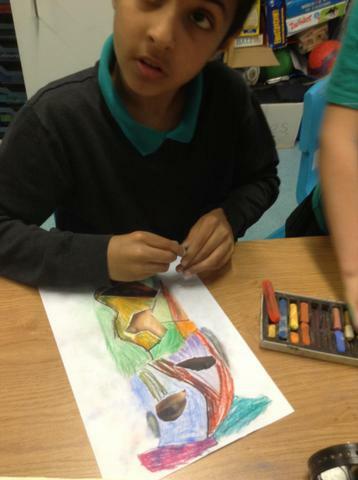 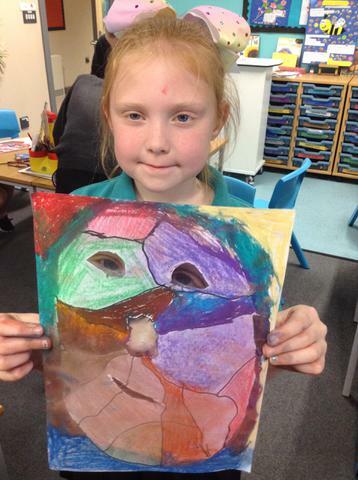 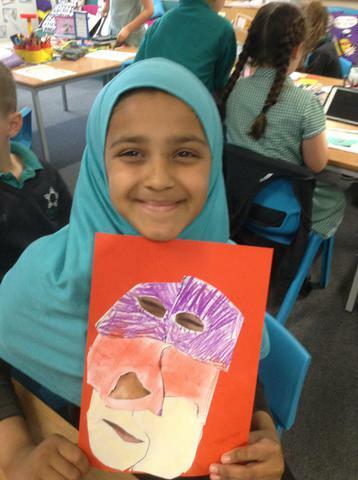 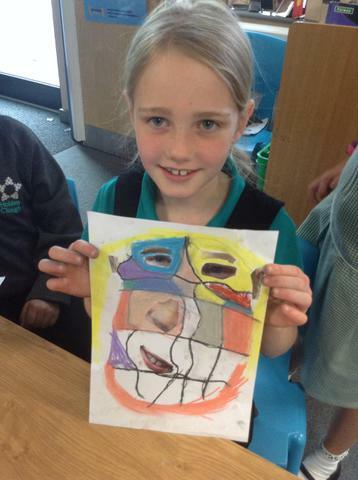 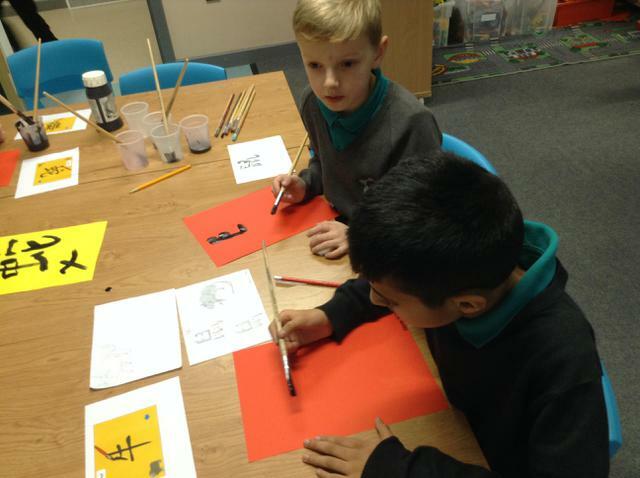 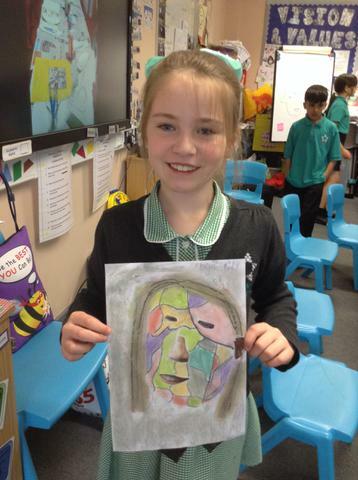 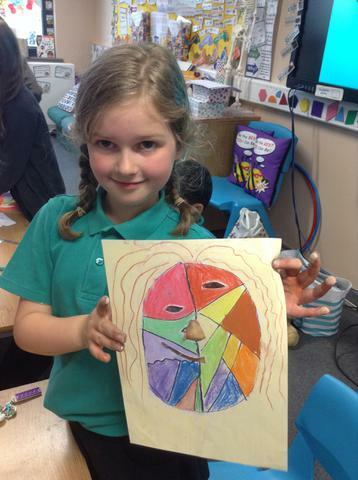 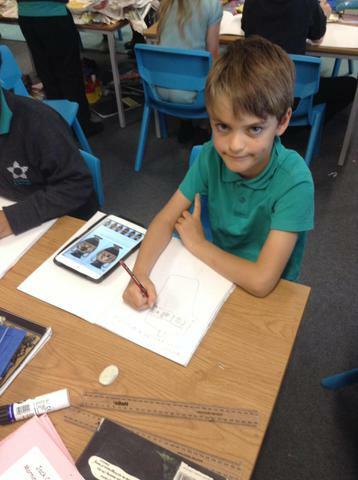 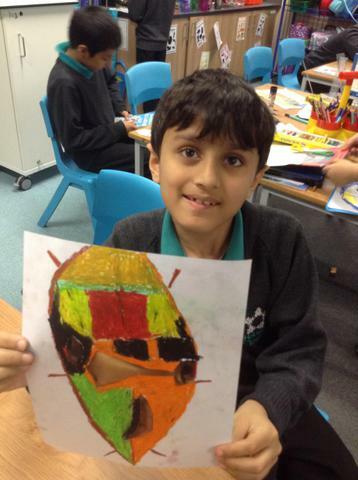 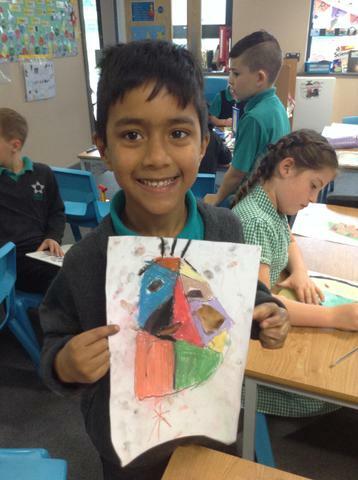 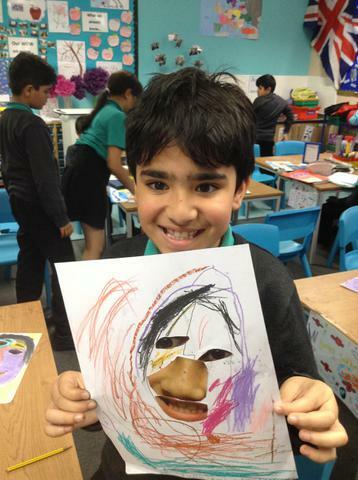 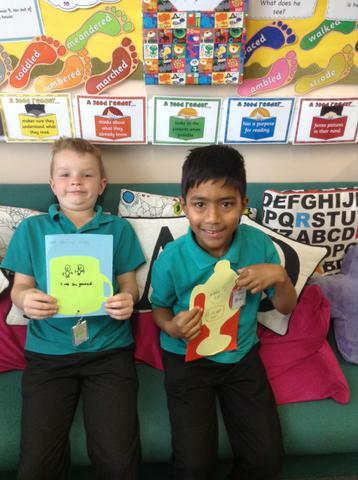 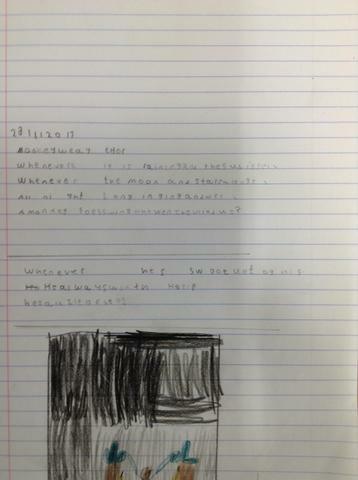 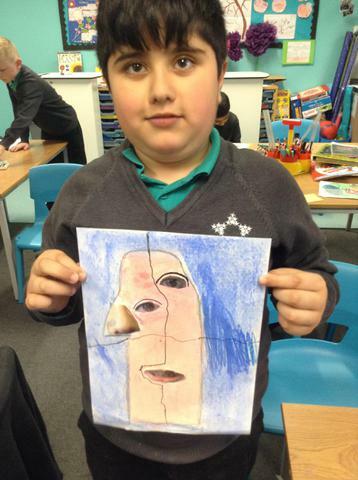 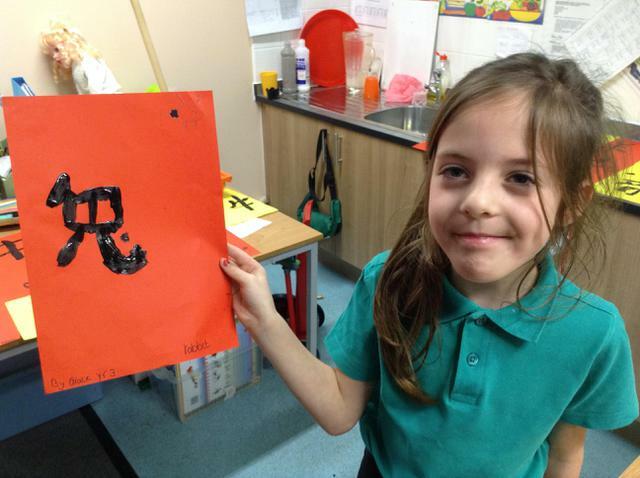 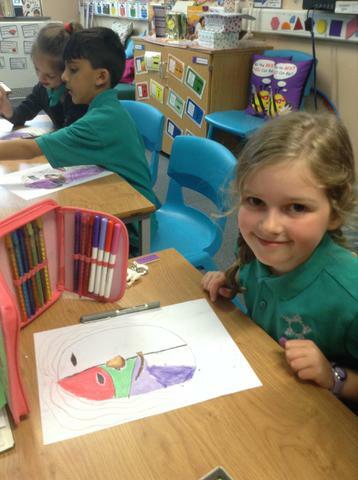 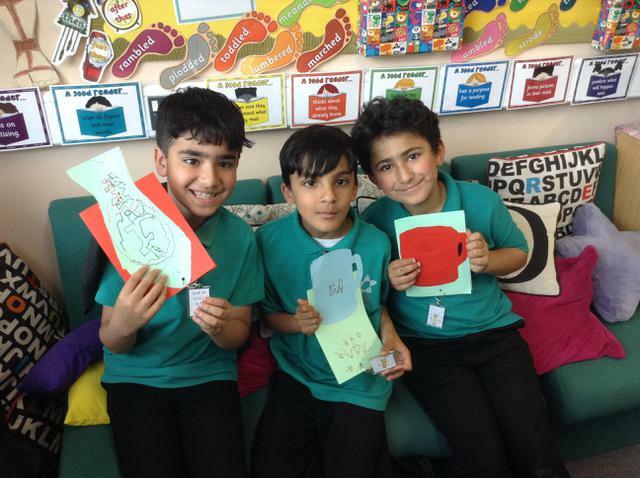 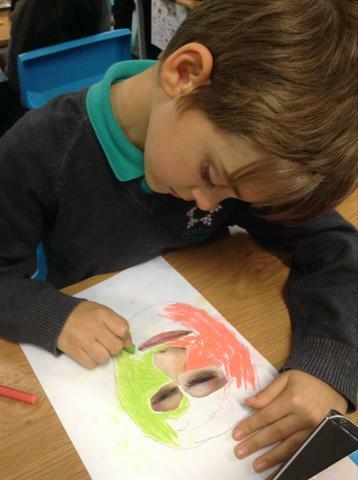 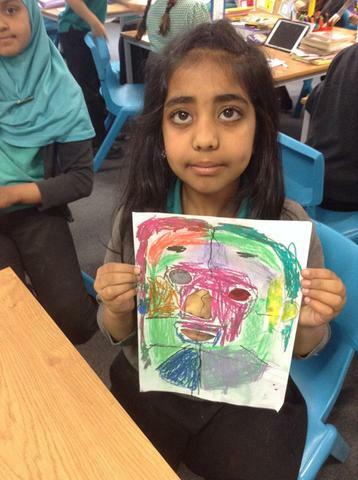 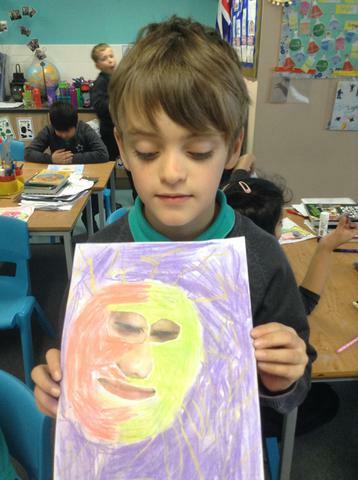 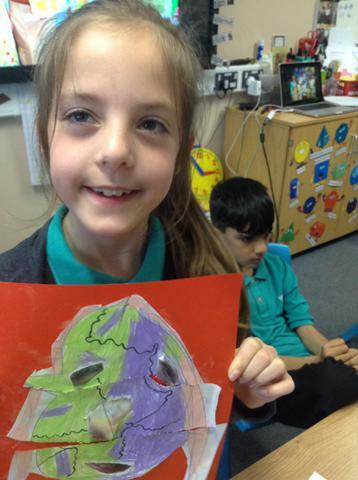 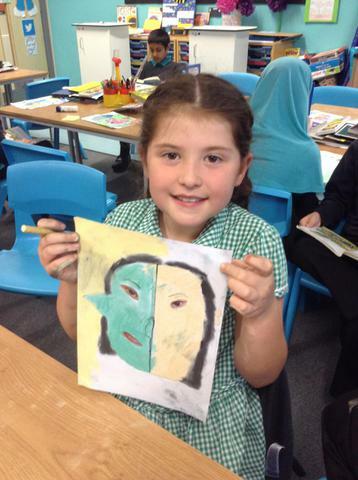 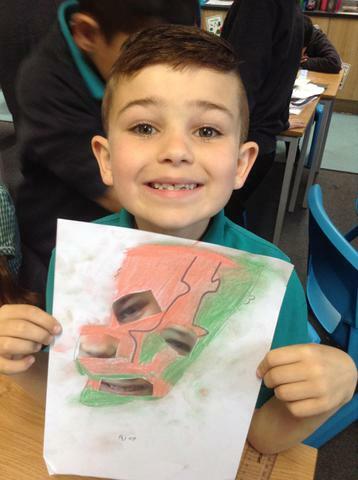 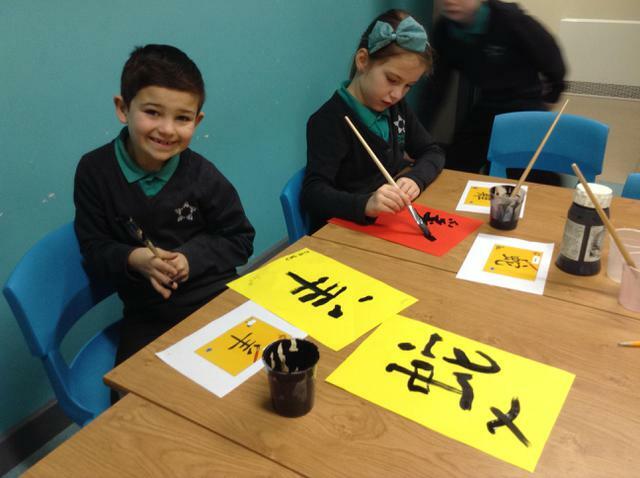 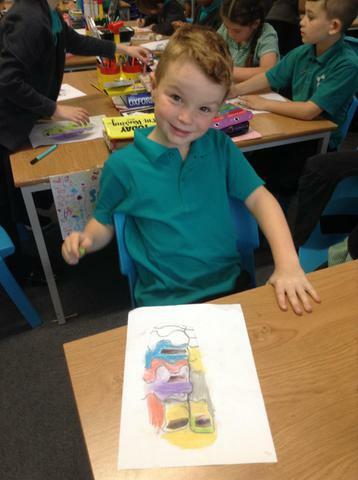 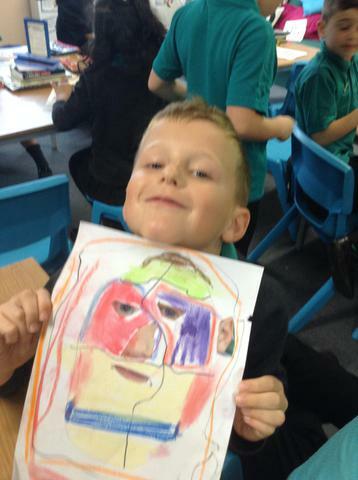 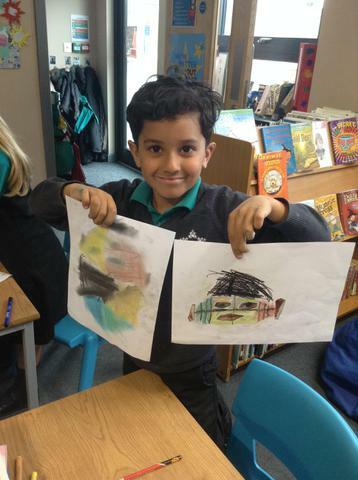 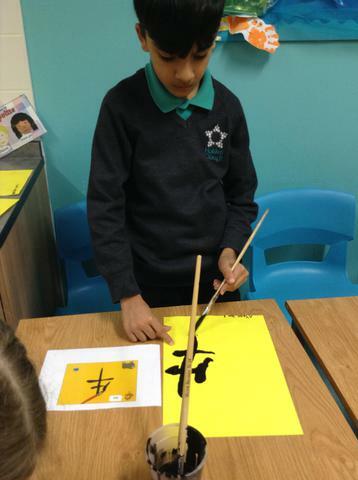 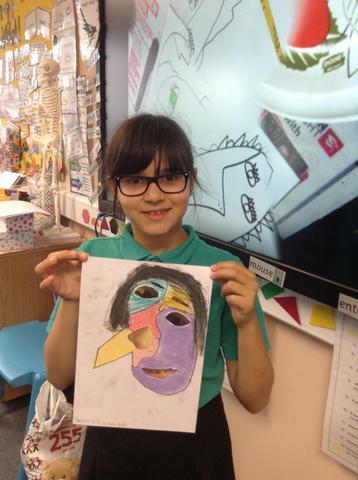 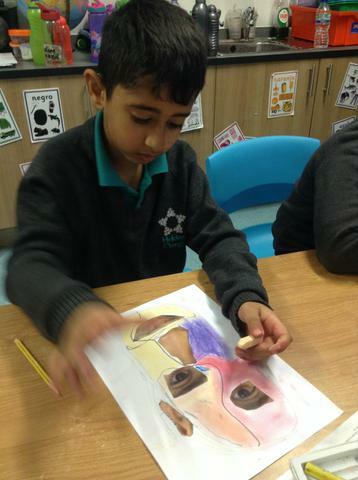 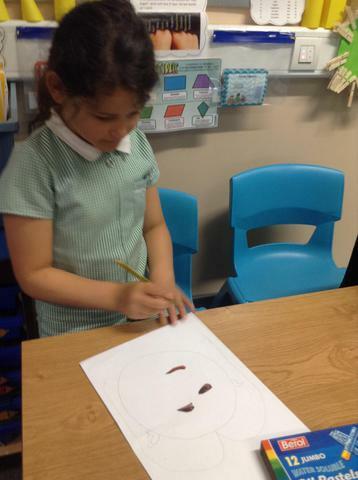 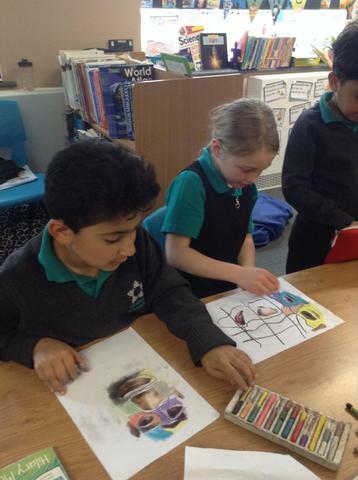 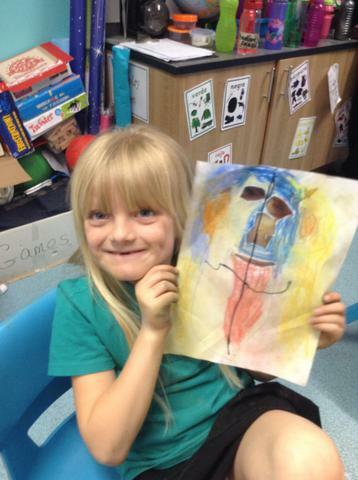 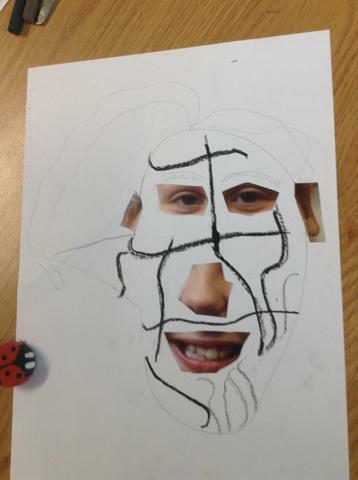 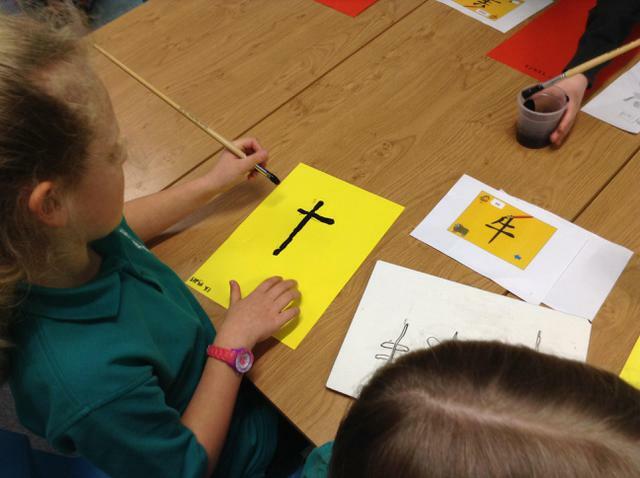 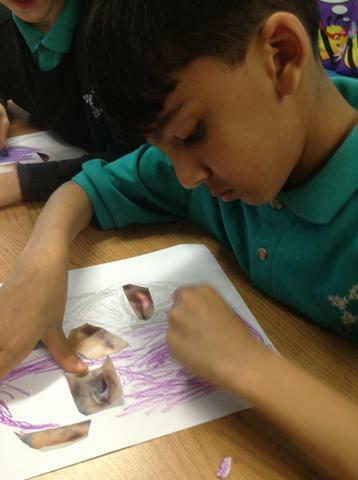 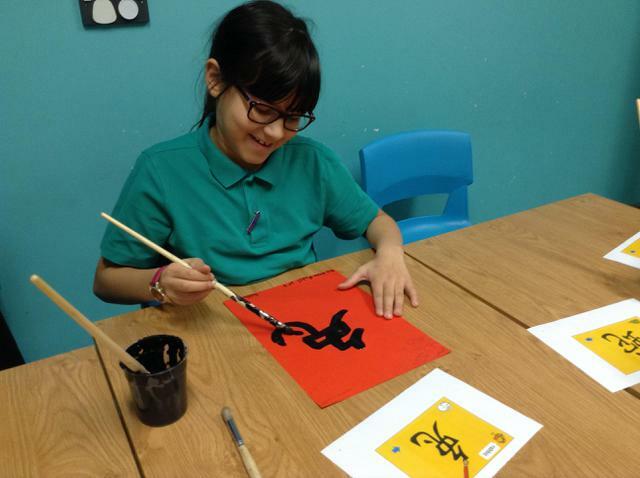 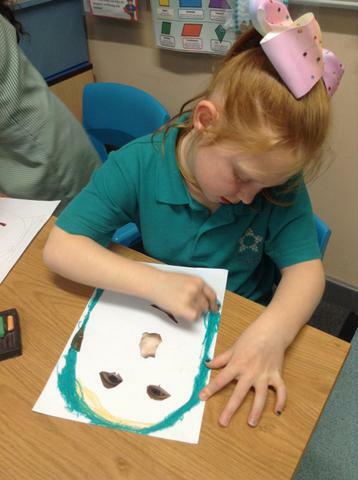 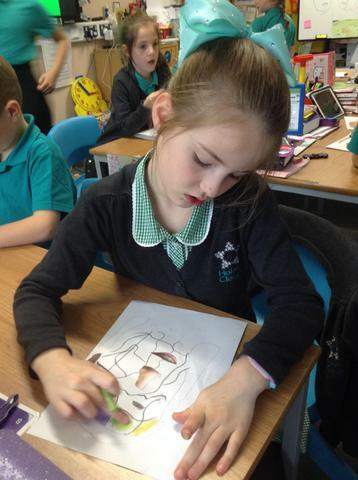 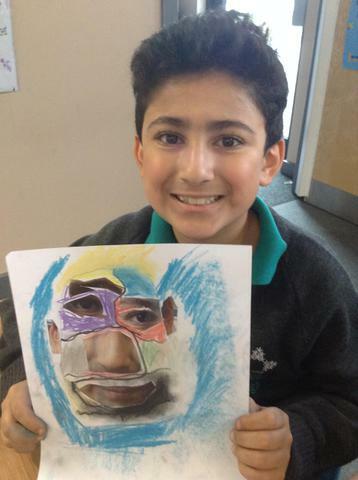 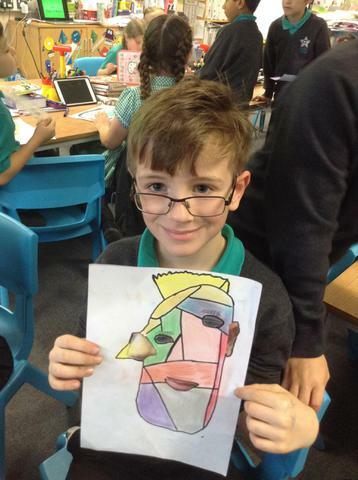 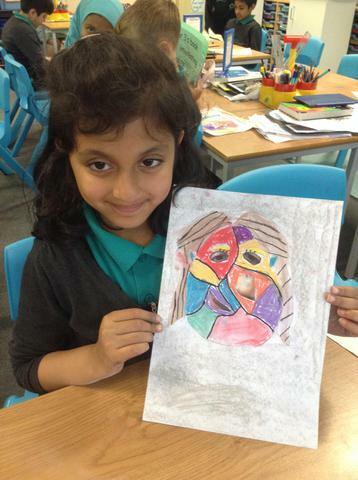 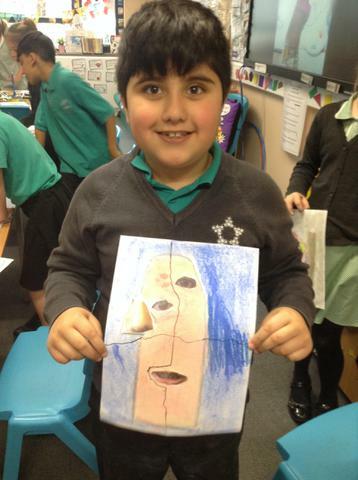 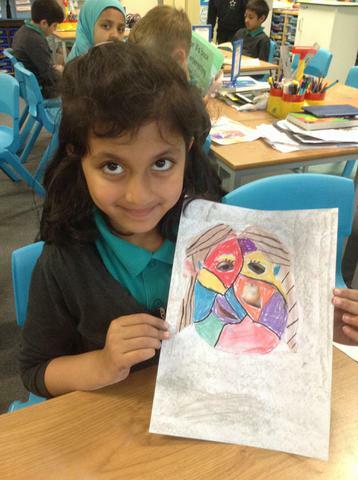 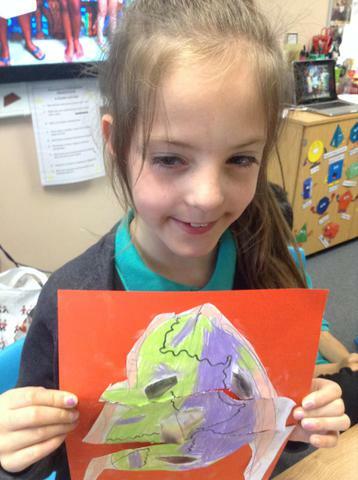 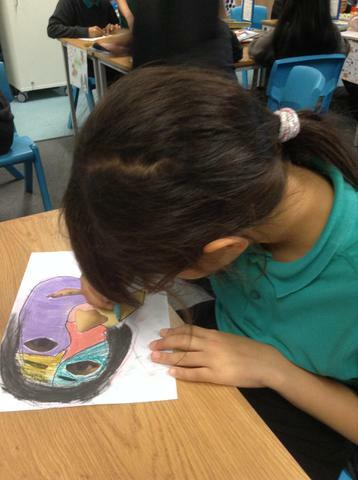 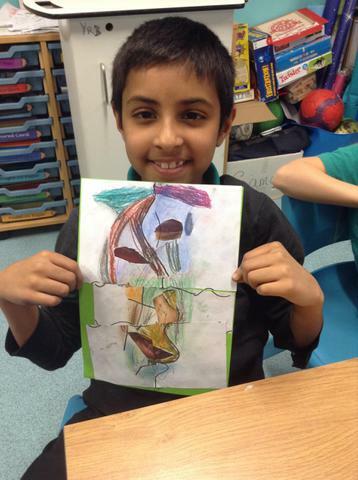 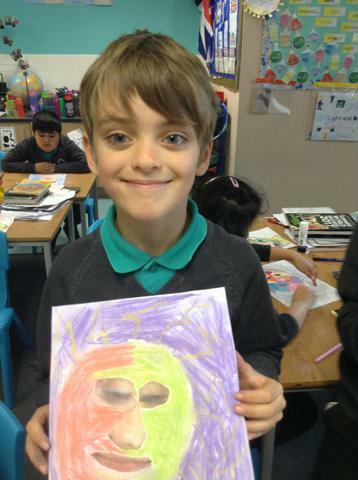 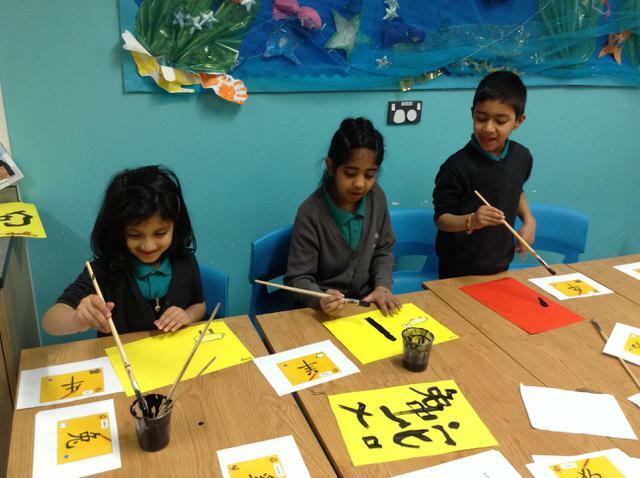 In Spanish we found out about Picasso and created our own portaits. 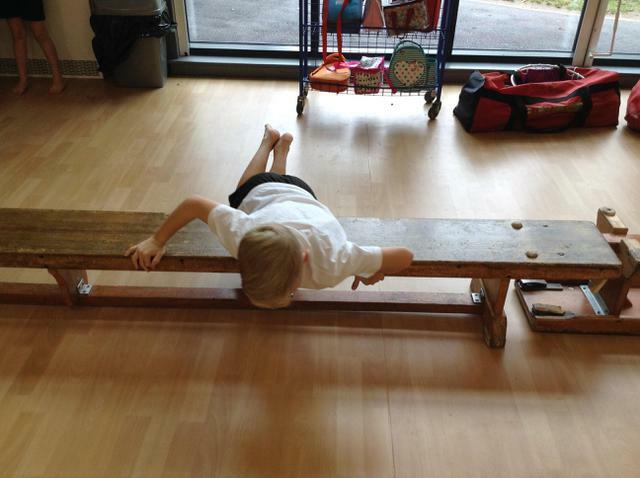 Swimming lessons begin on Tuesday 25th April for the Summer term. 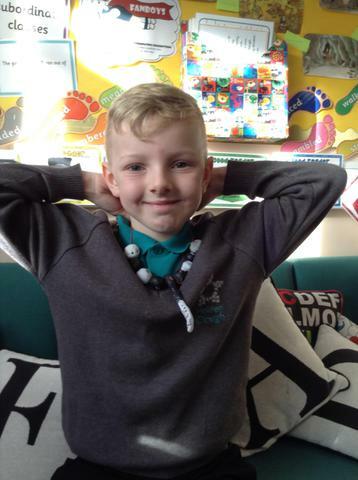 A full swimming costume or pair of trunks should be worn. 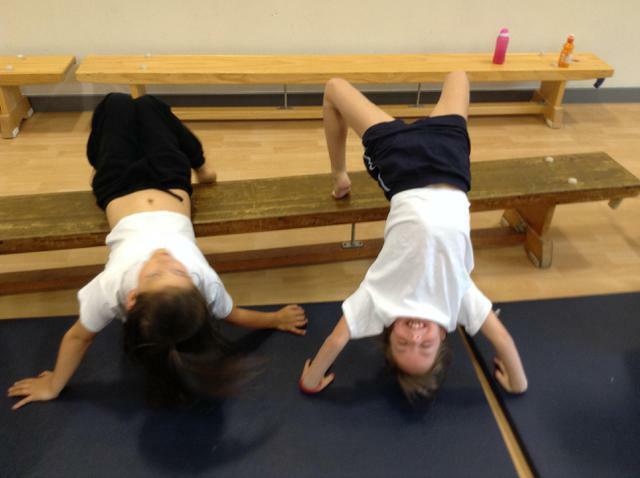 Hair needs to be tied back. 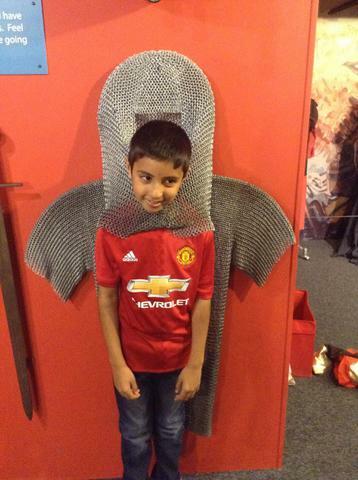 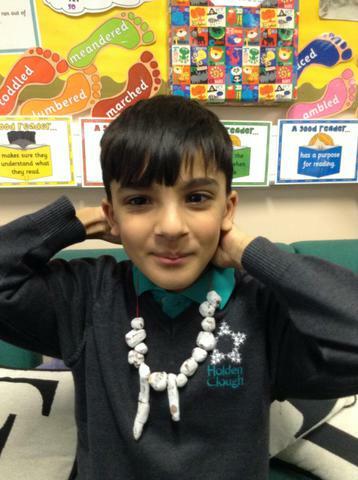 Jewellery is not allowed to be worn. 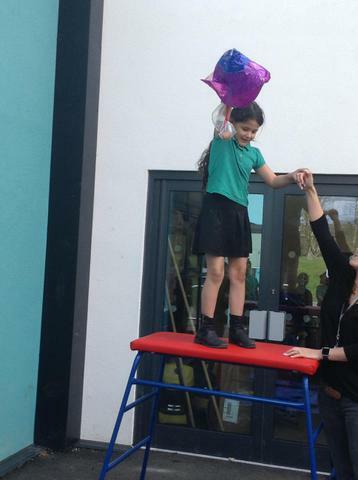 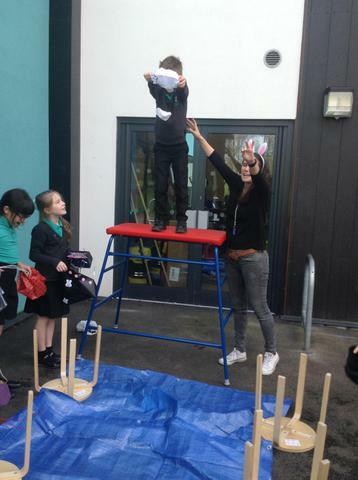 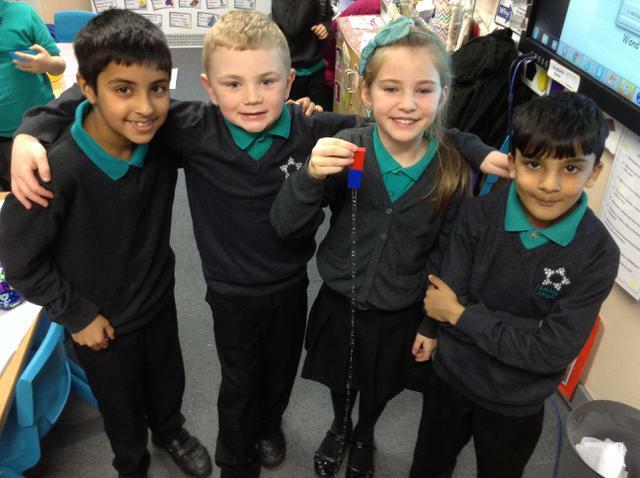 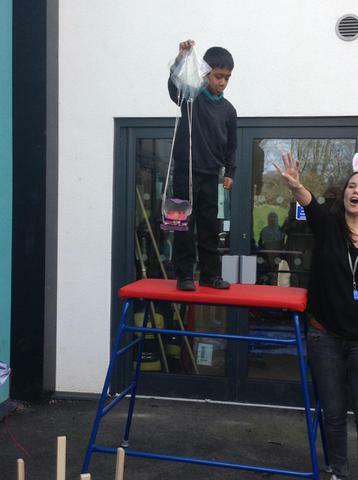 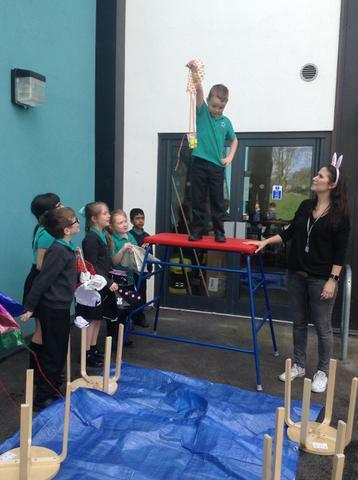 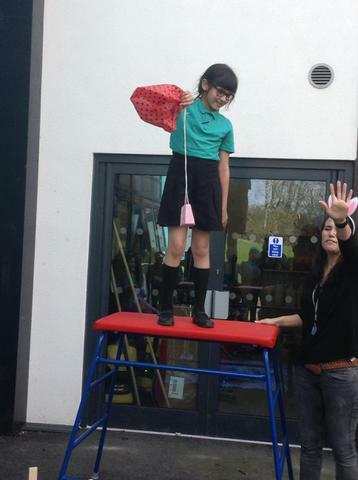 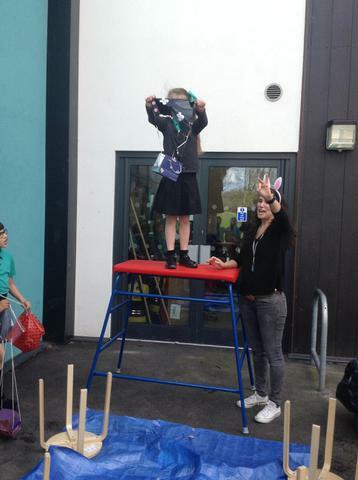 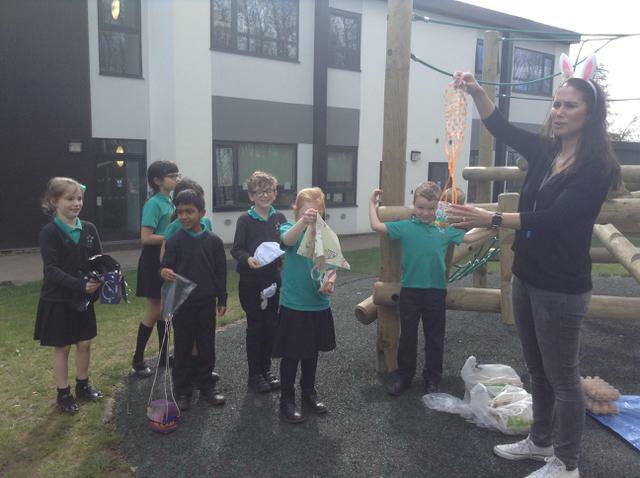 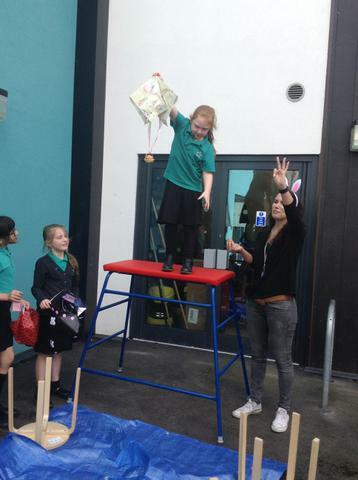 Egg parachute competition. 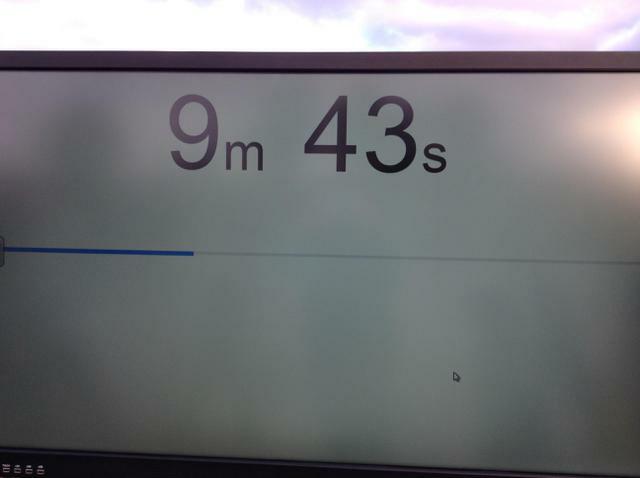 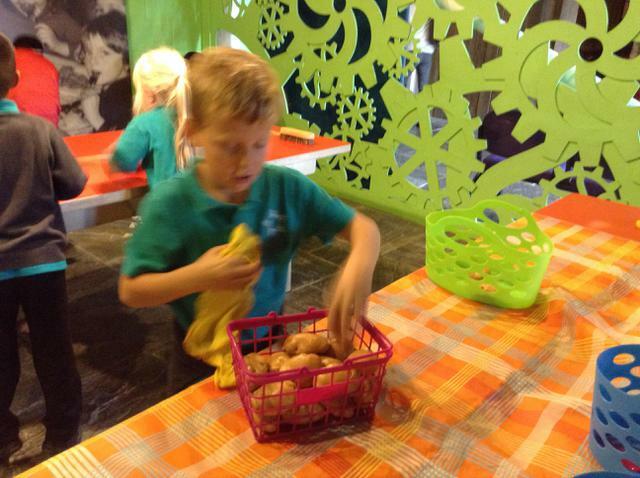 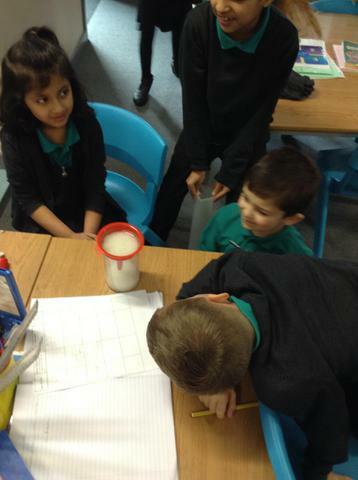 Will the eggs crack? 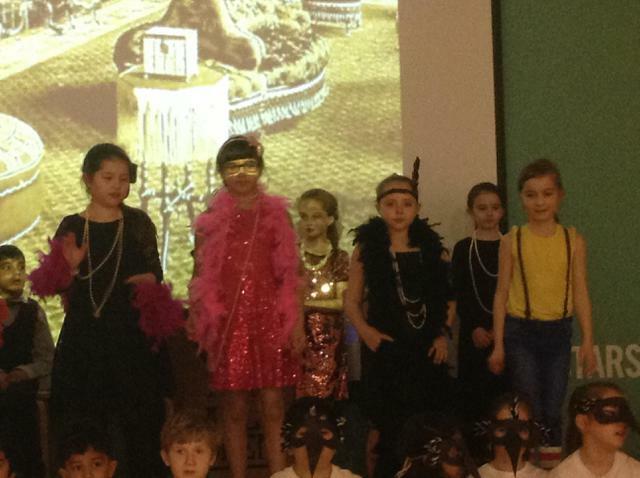 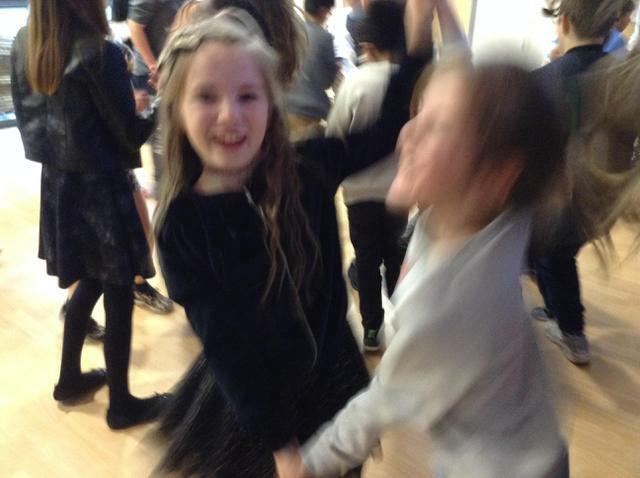 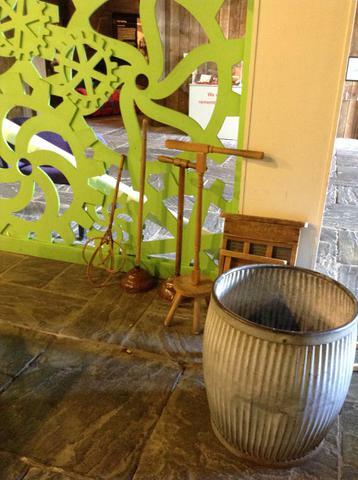 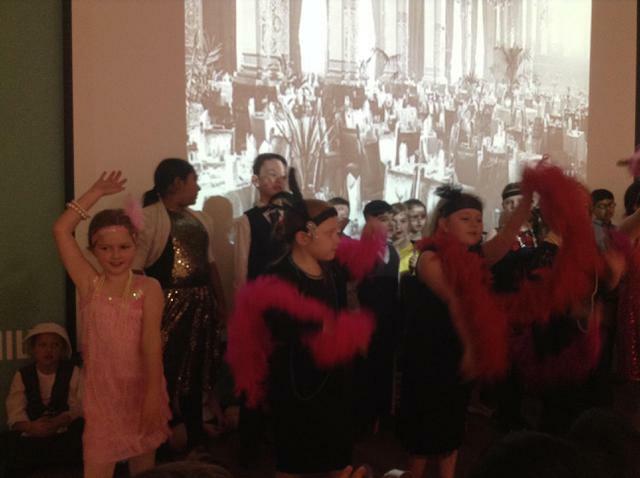 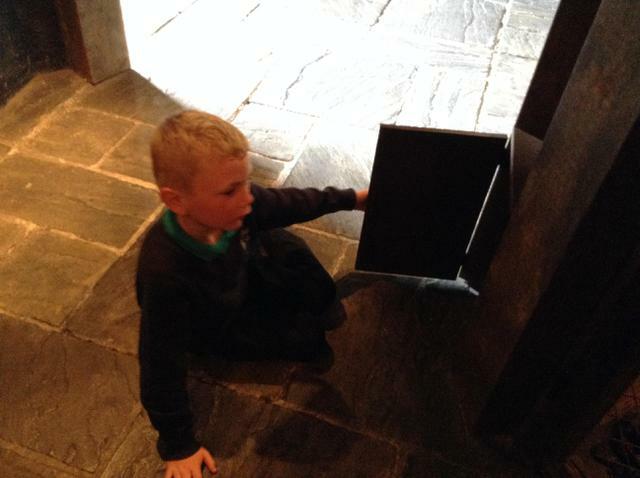 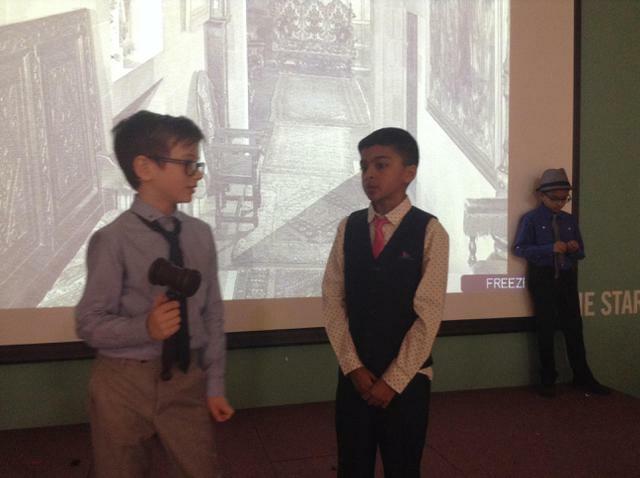 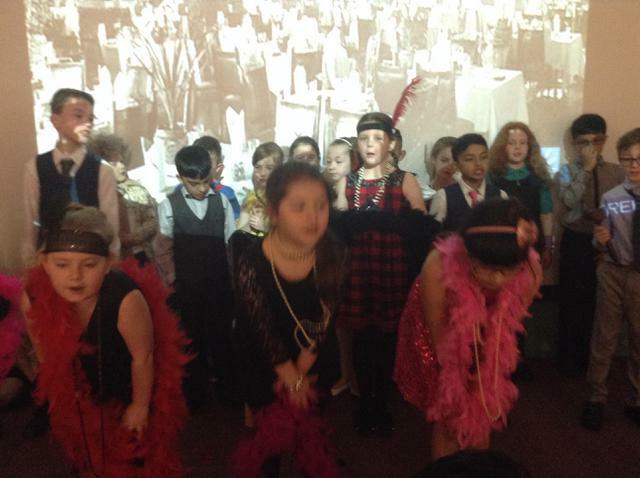 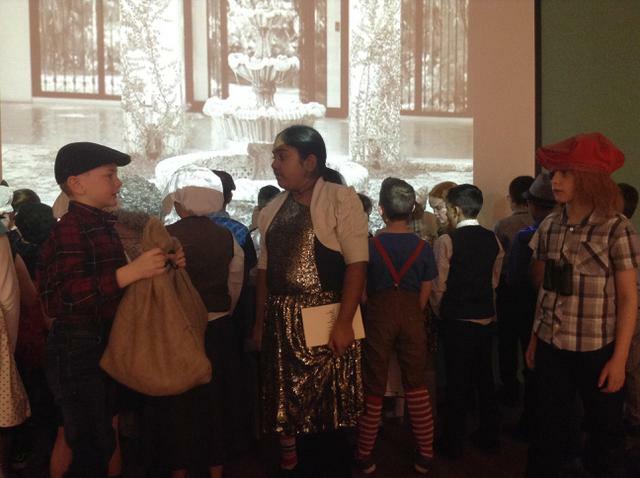 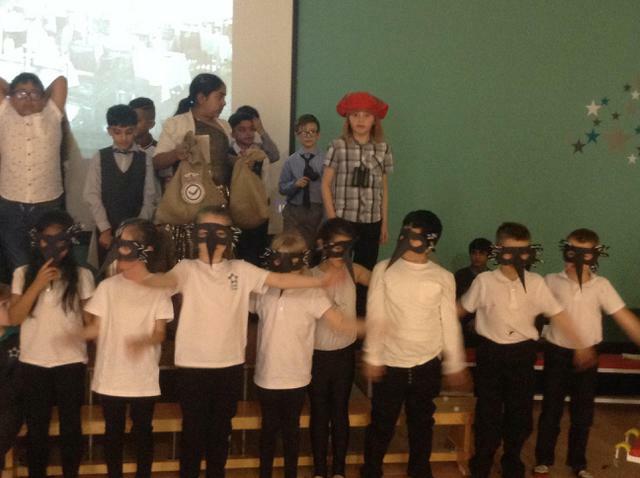 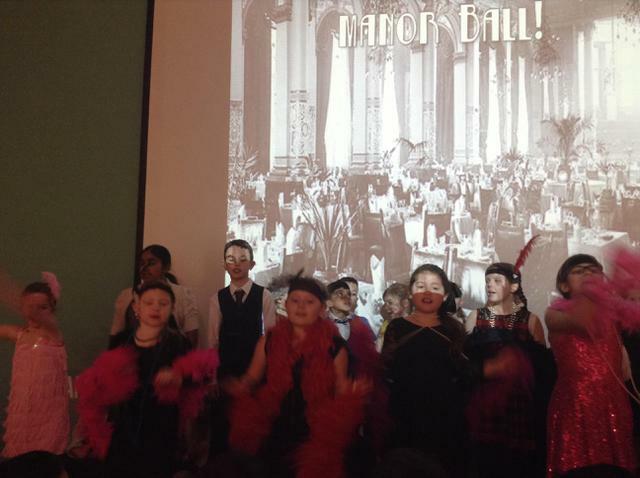 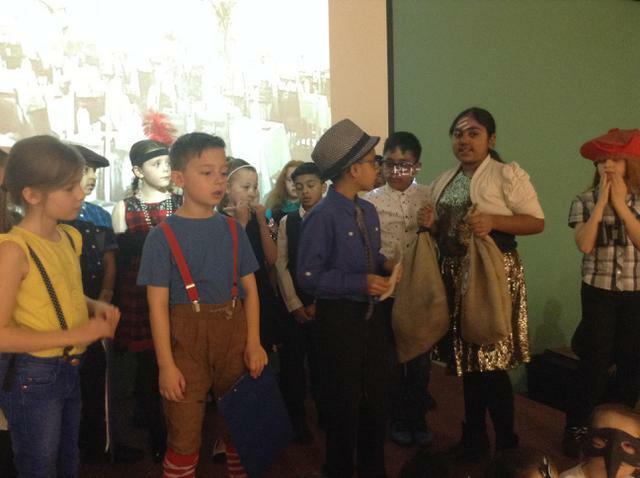 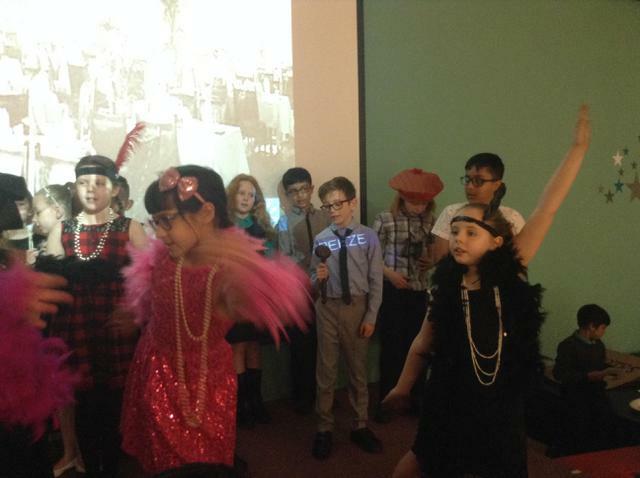 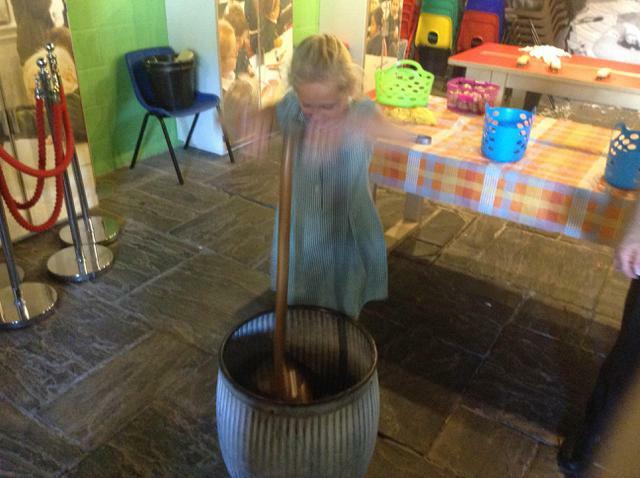 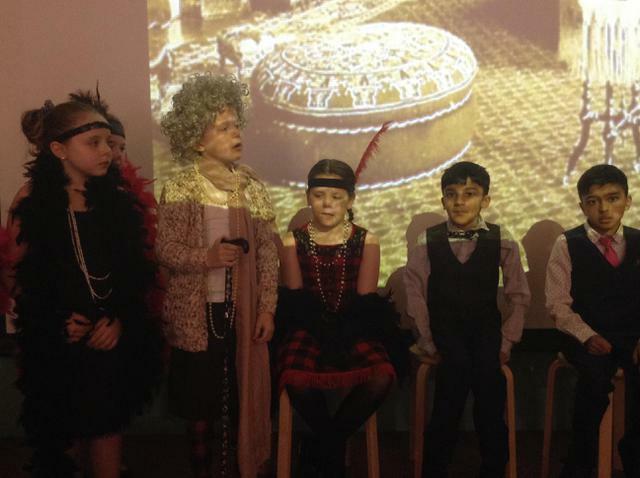 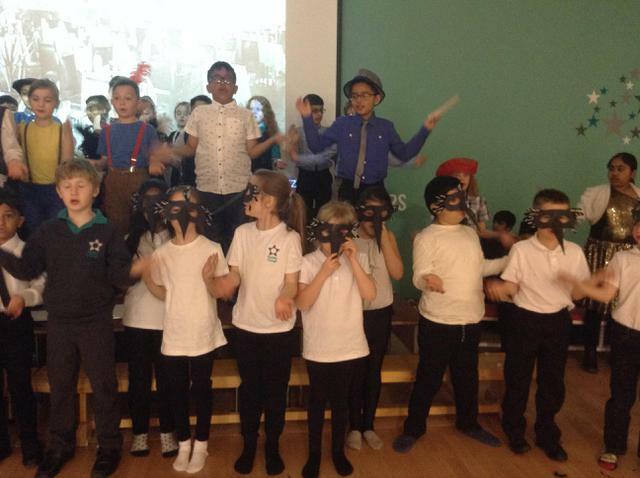 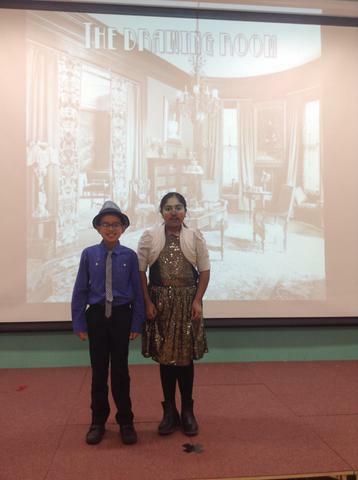 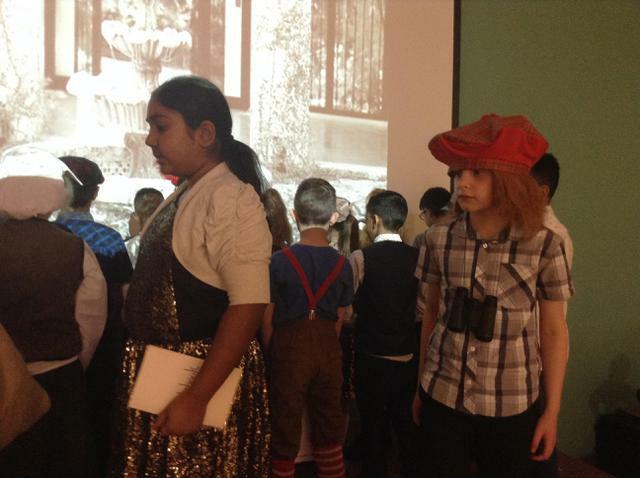 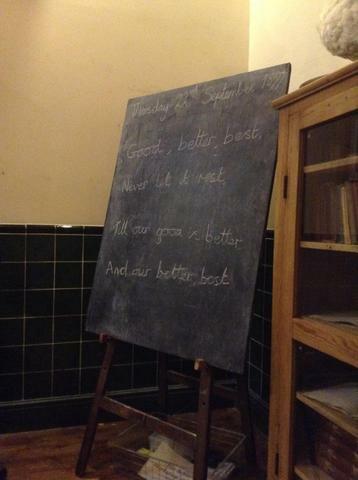 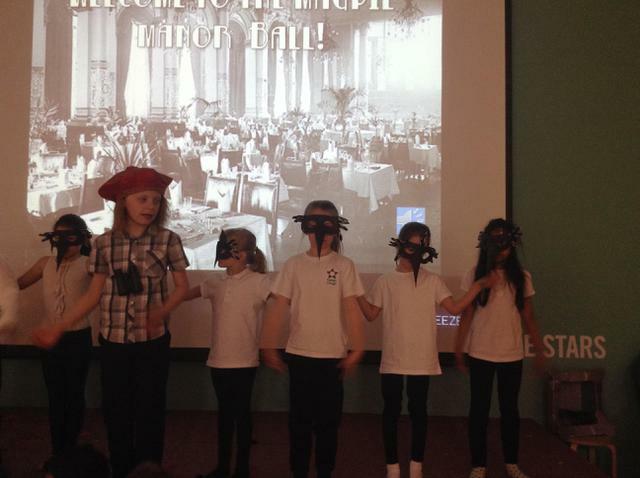 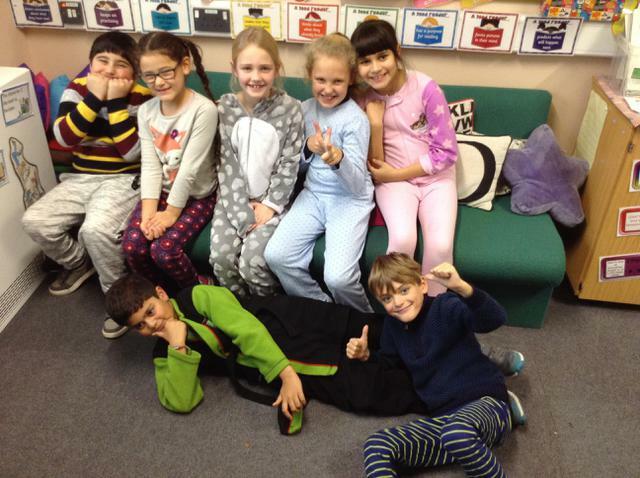 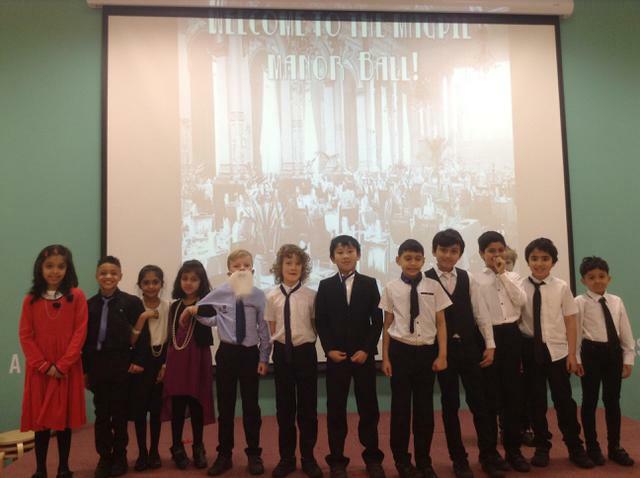 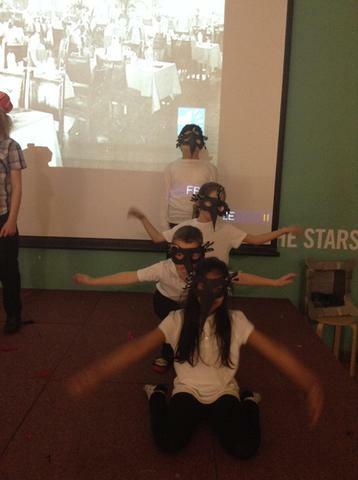 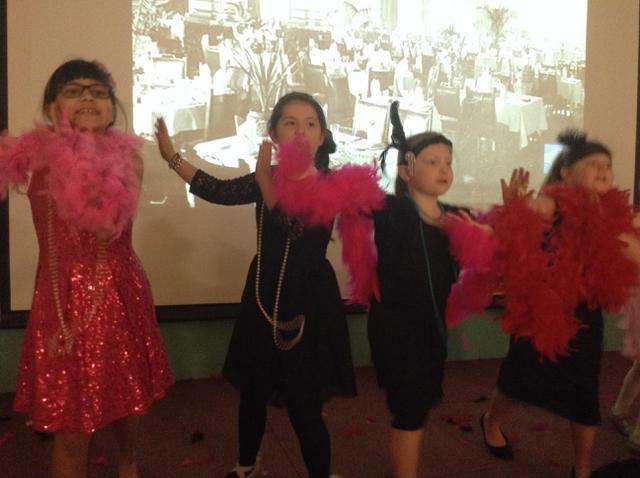 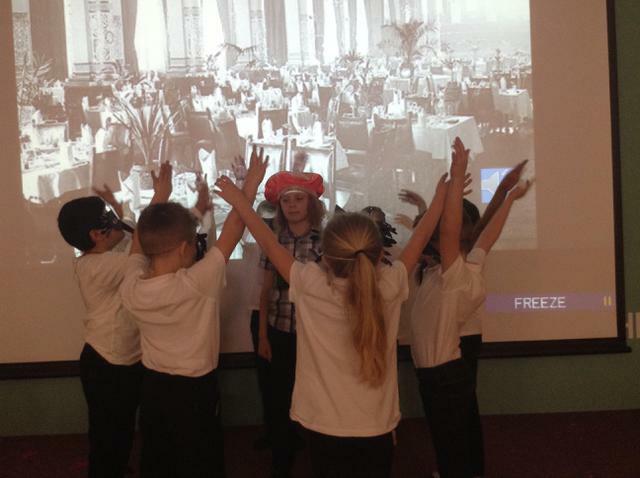 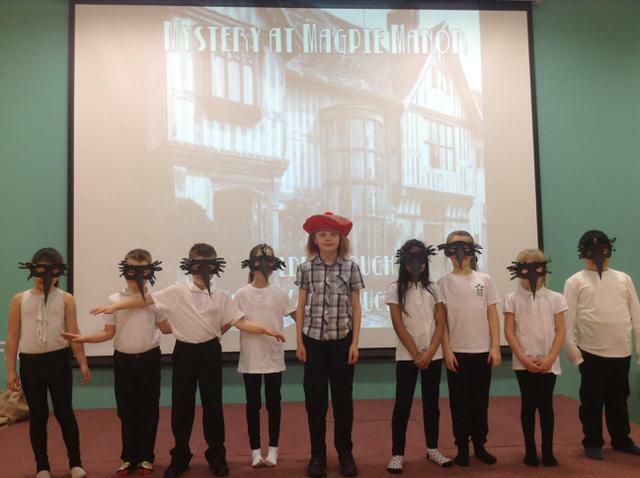 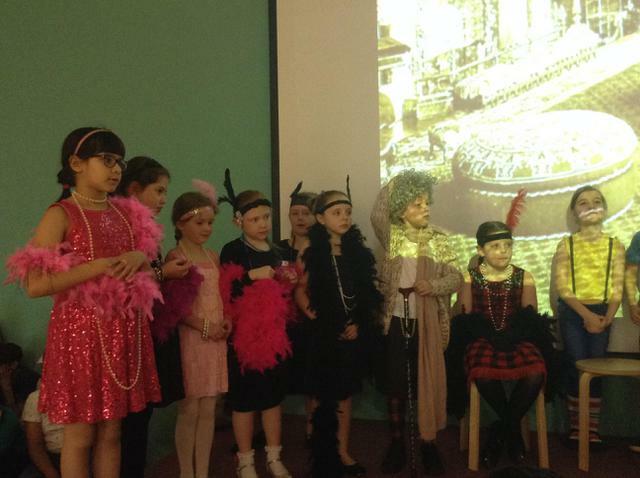 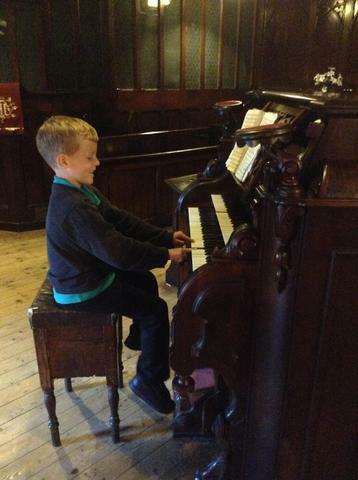 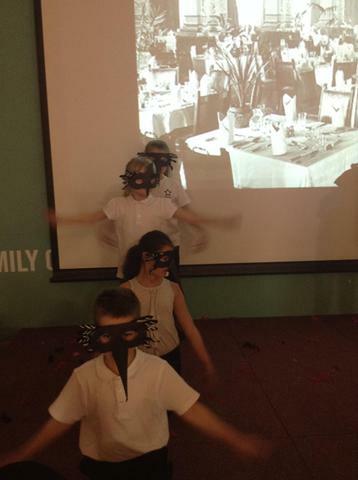 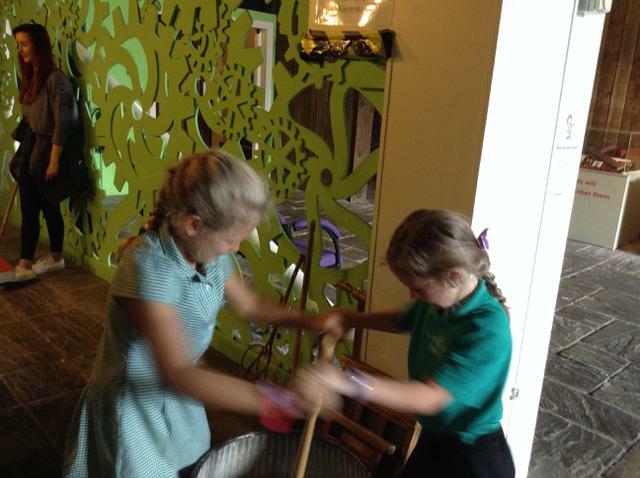 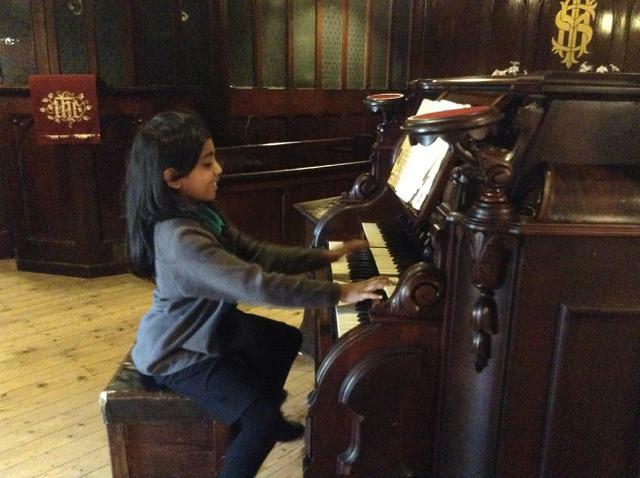 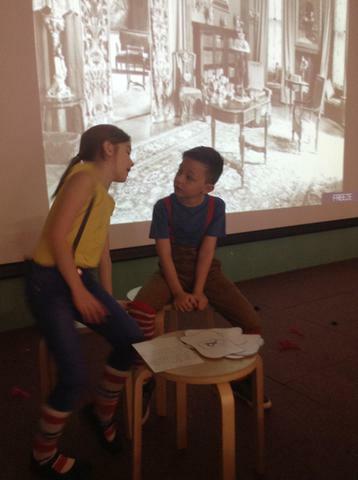 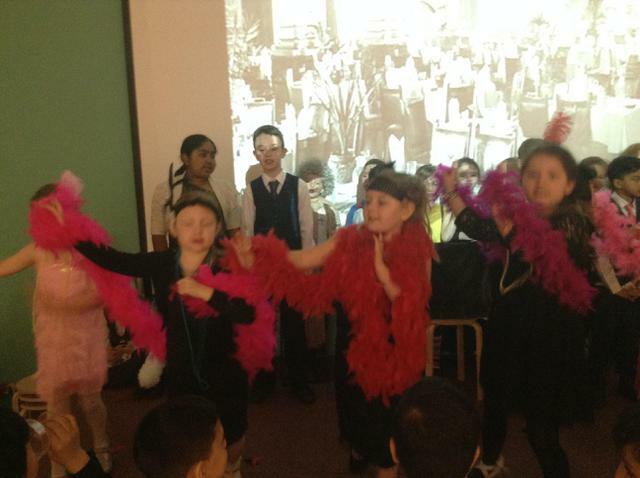 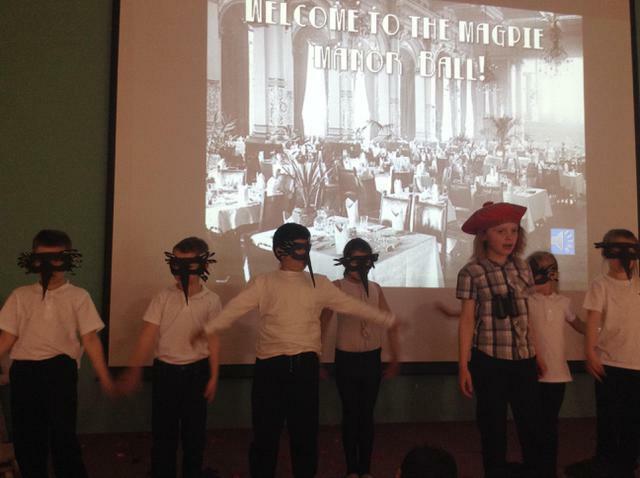 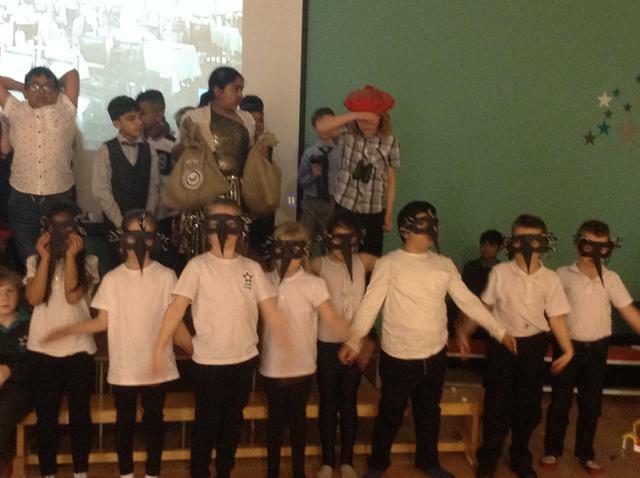 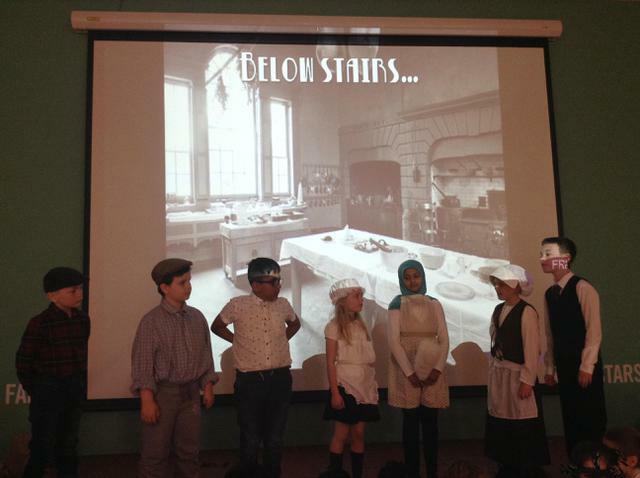 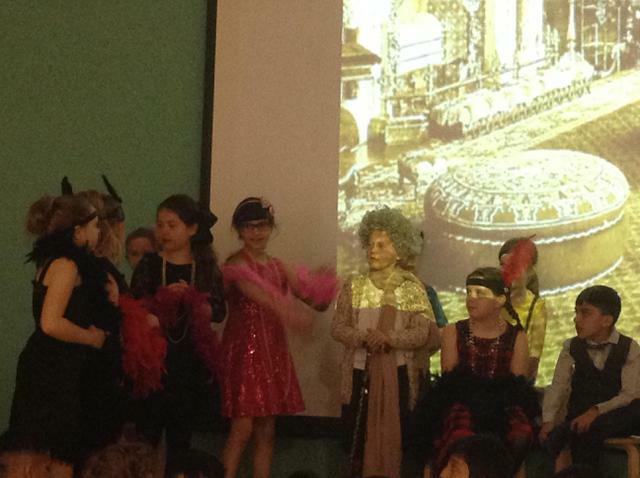 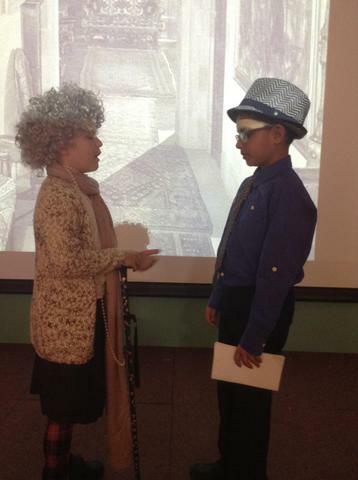 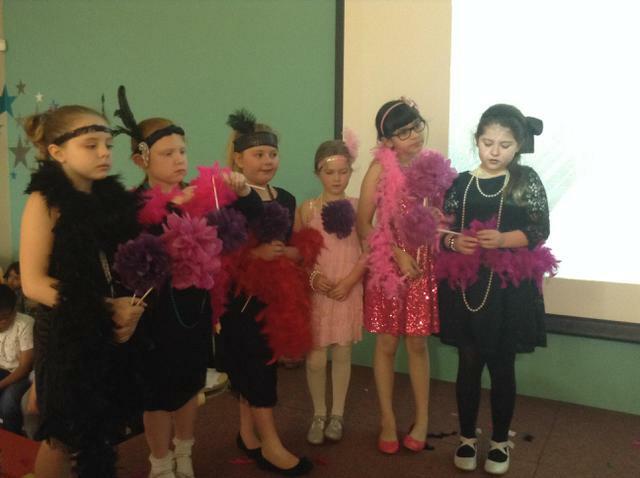 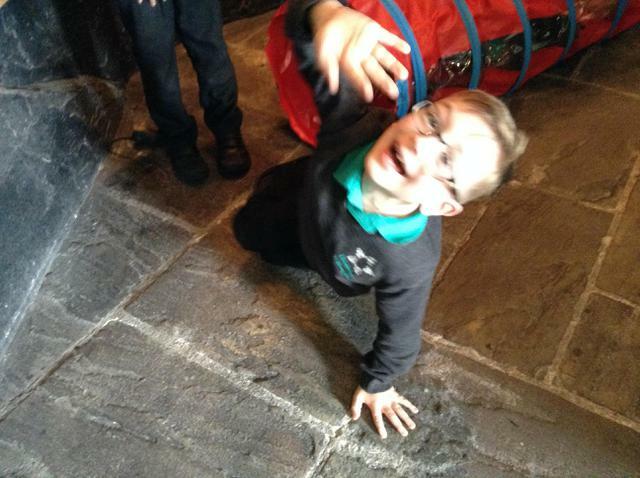 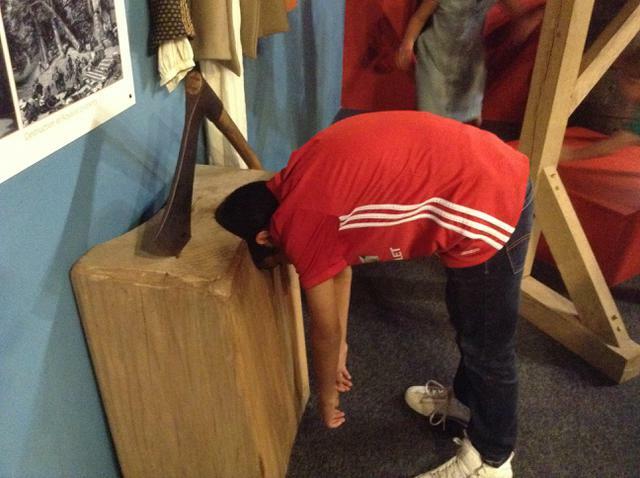 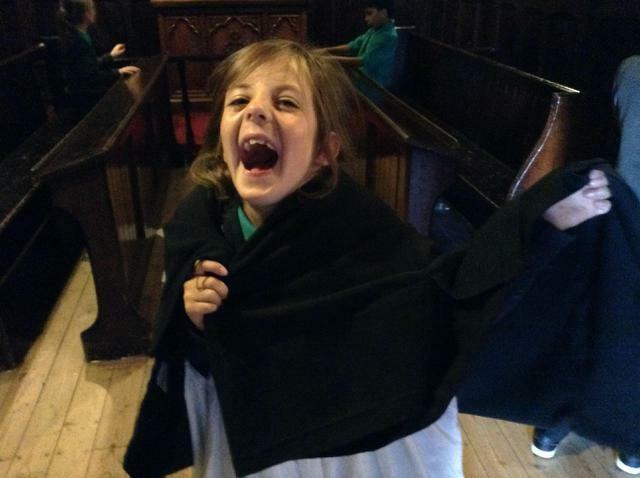 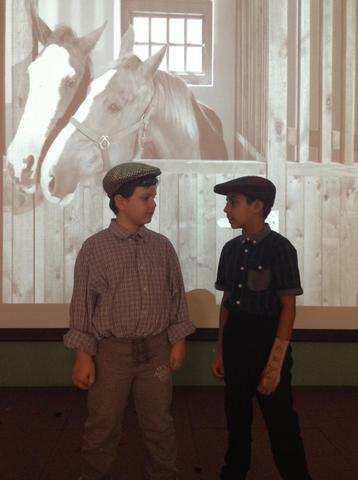 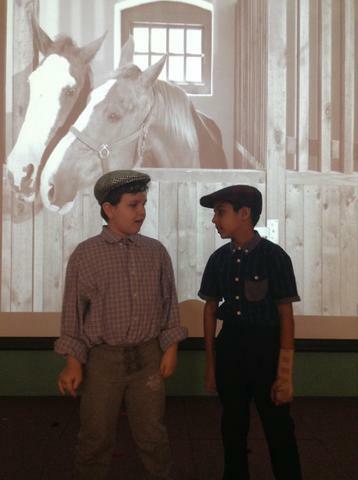 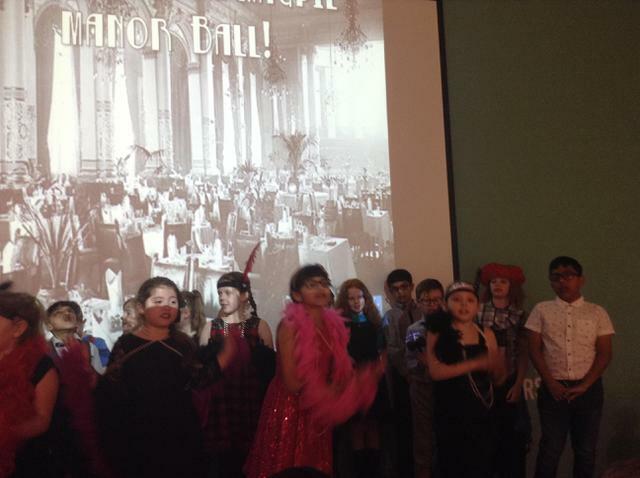 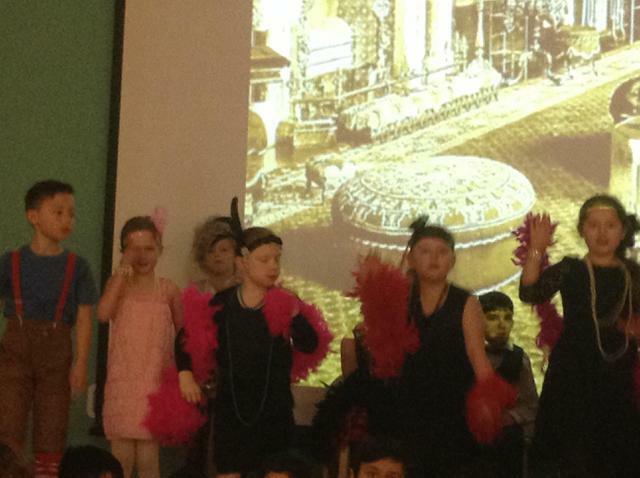 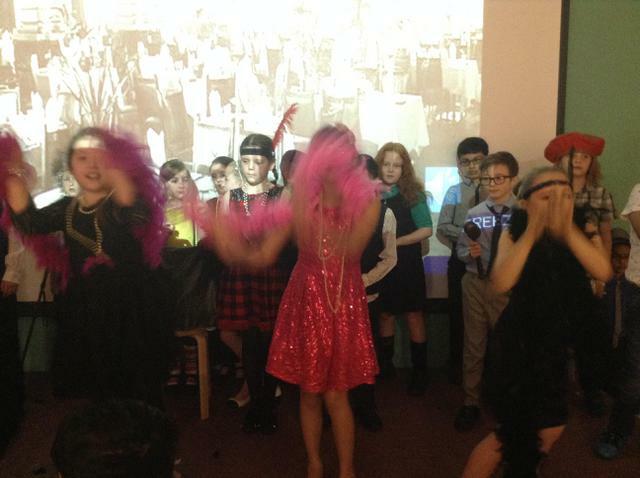 We have been really busy these last few weeks reheasing for our performance of 'Mystery at Magpie Manor'. 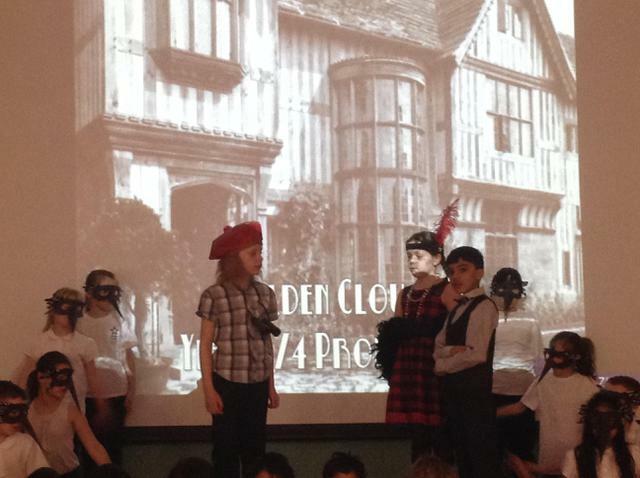 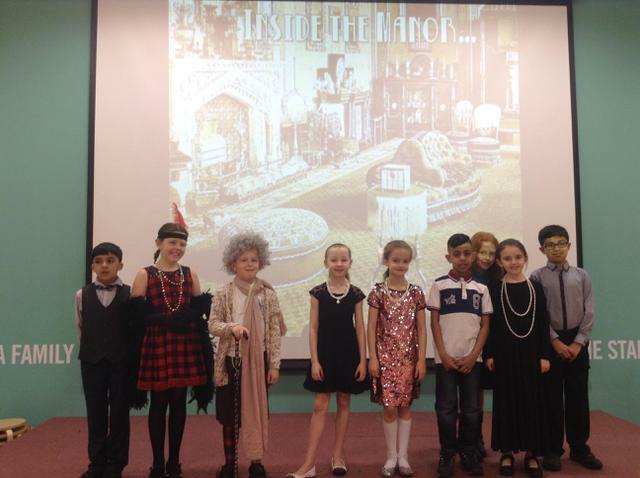 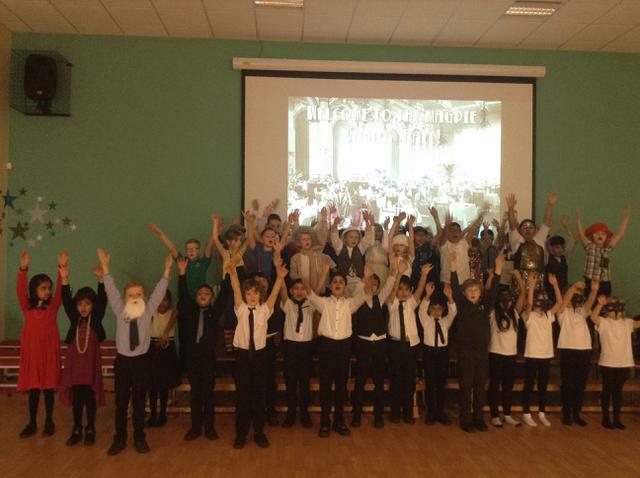 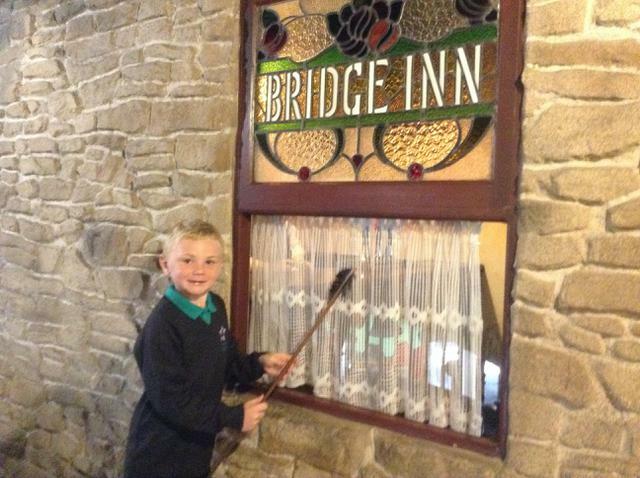 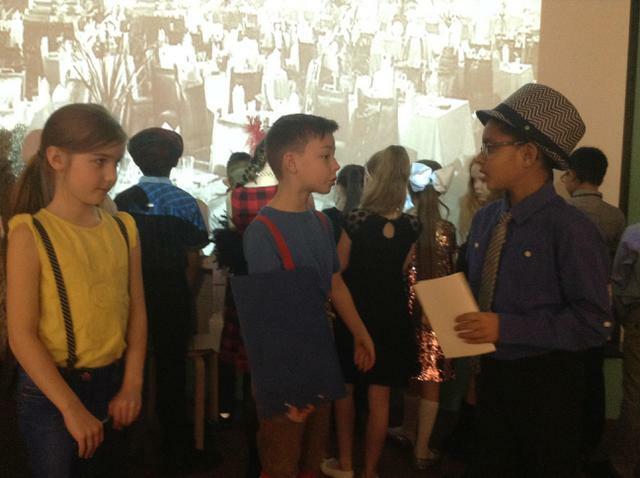 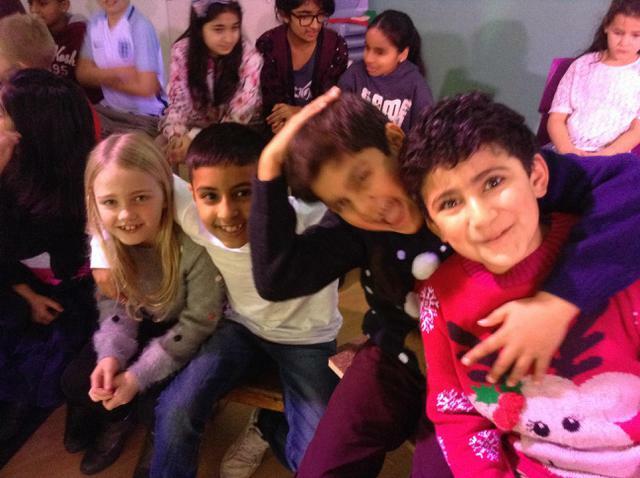 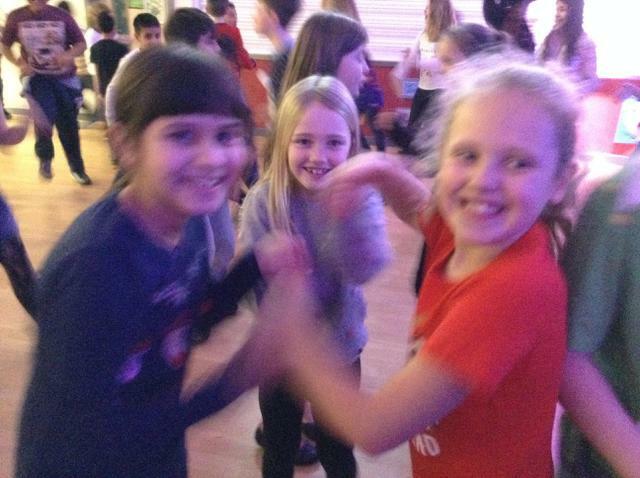 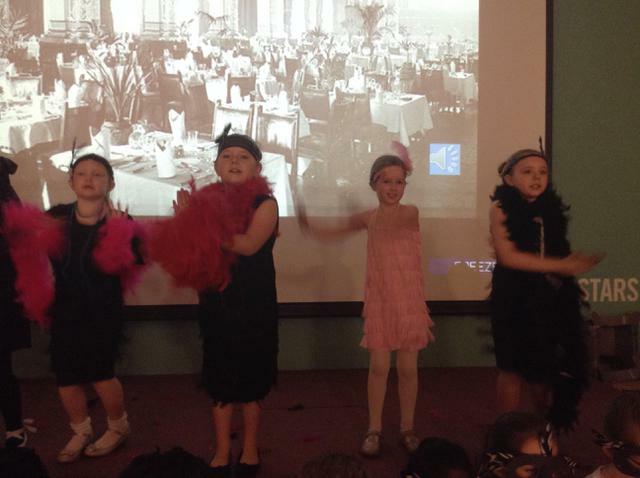 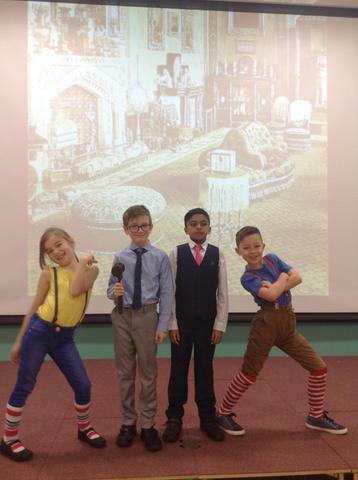 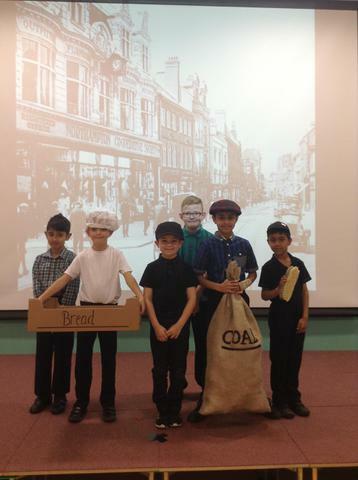 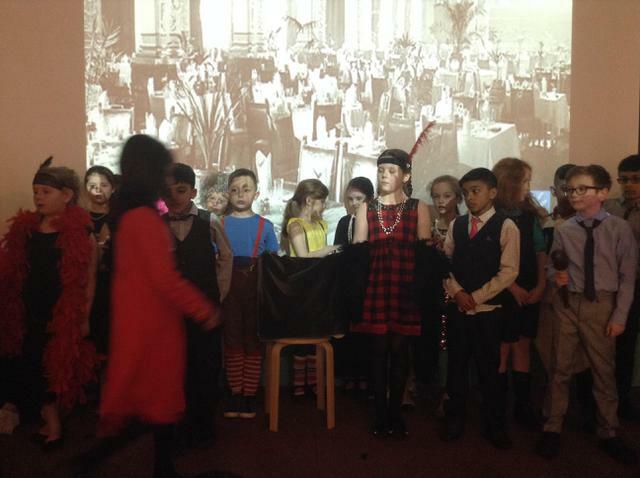 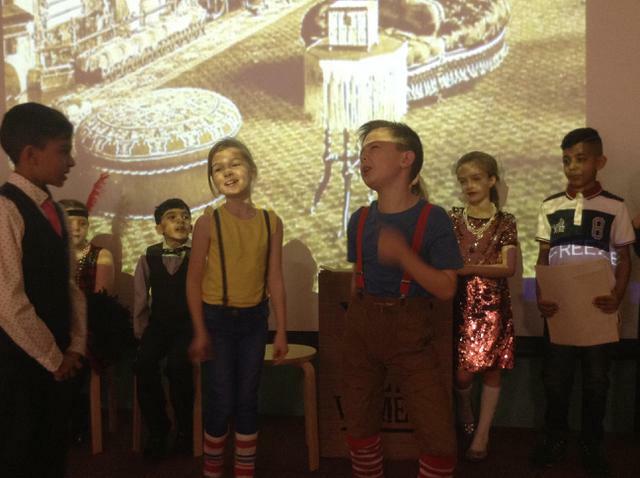 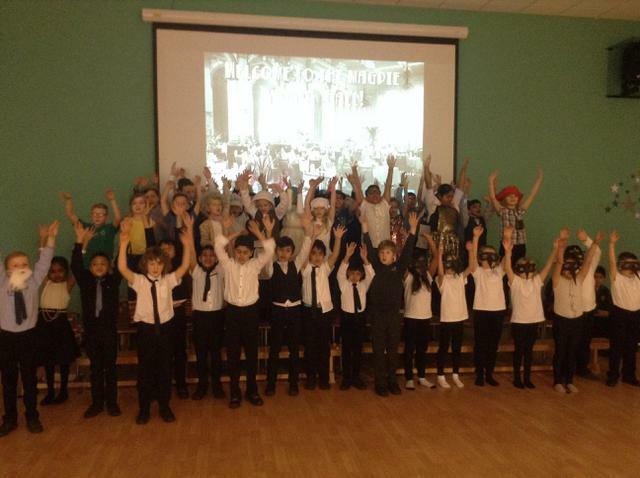 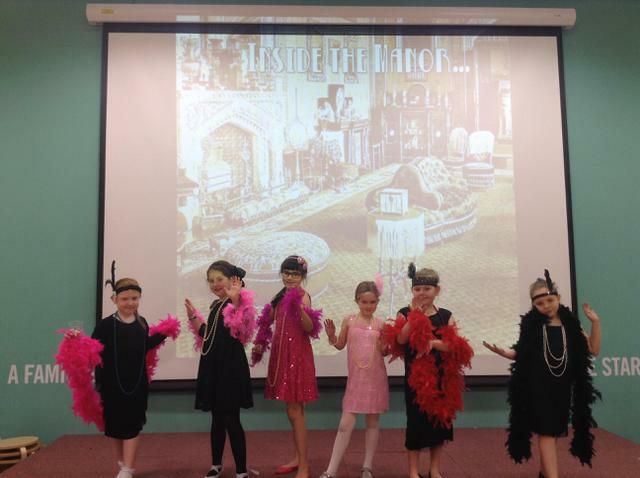 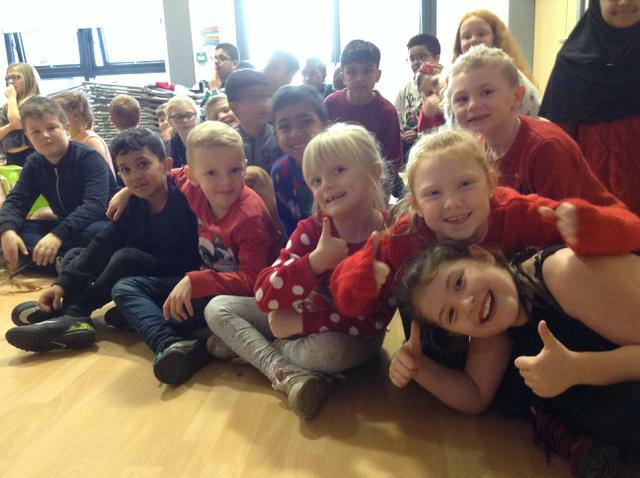 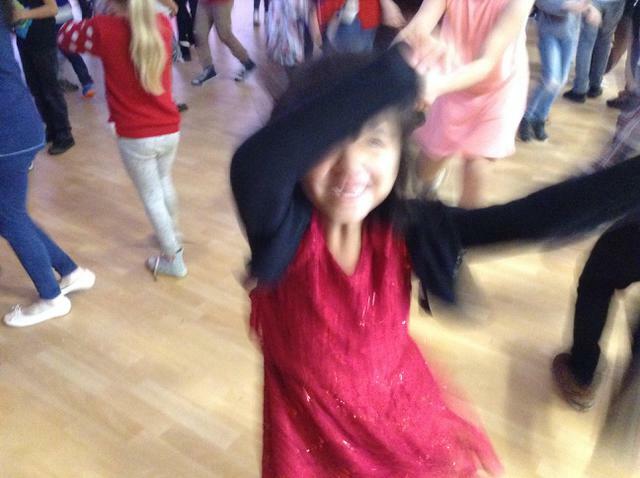 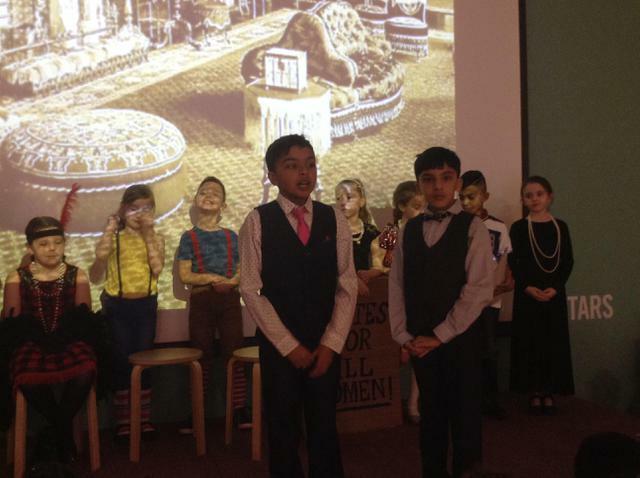 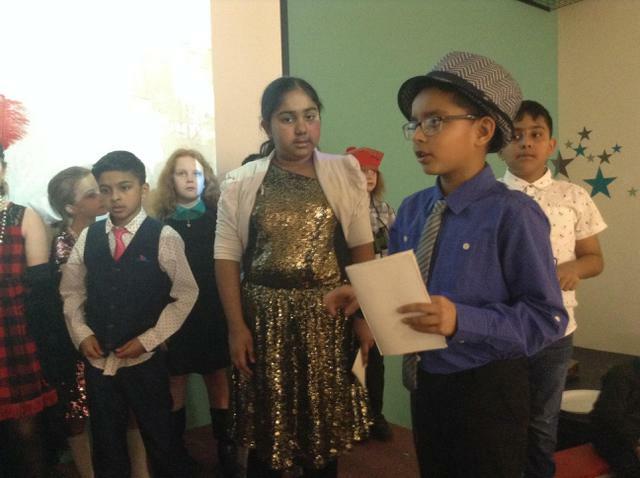 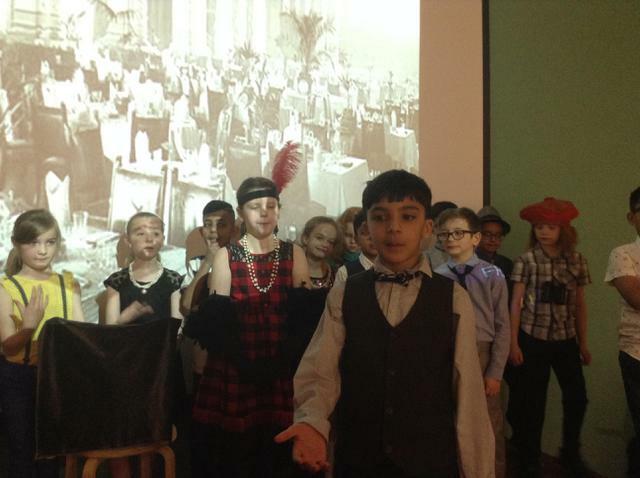 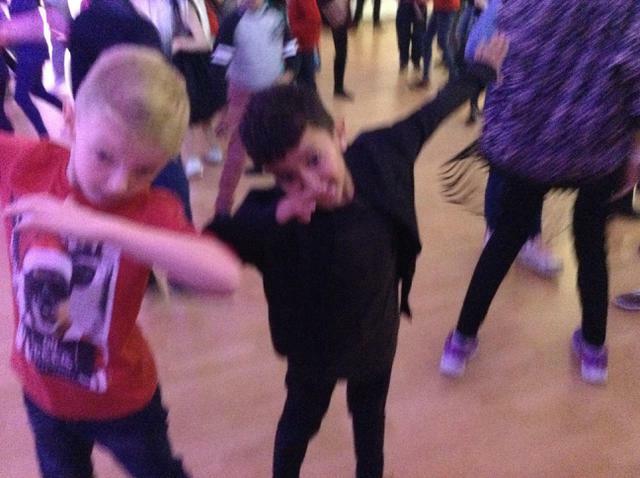 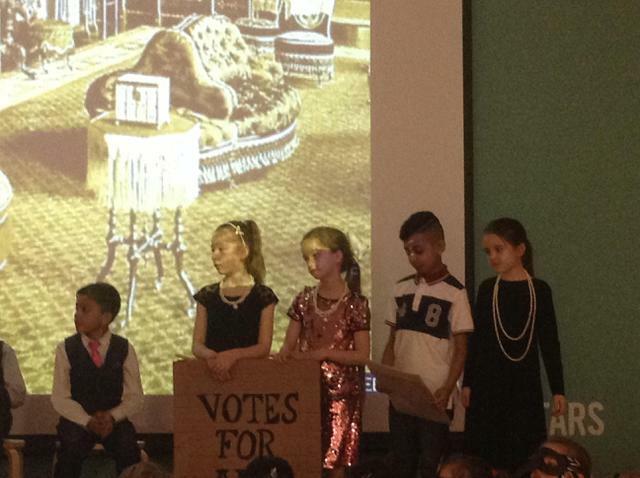 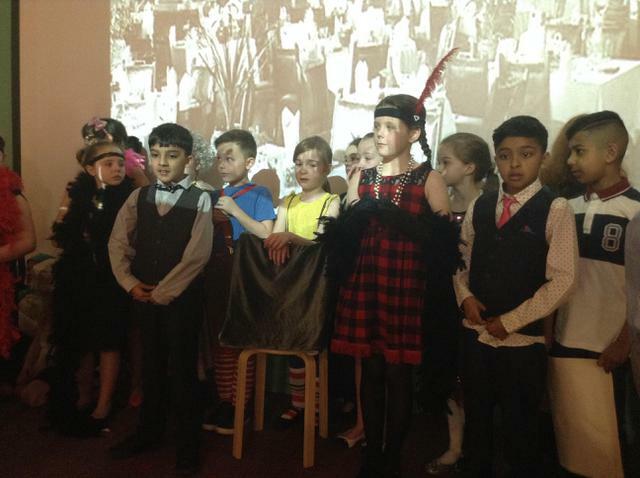 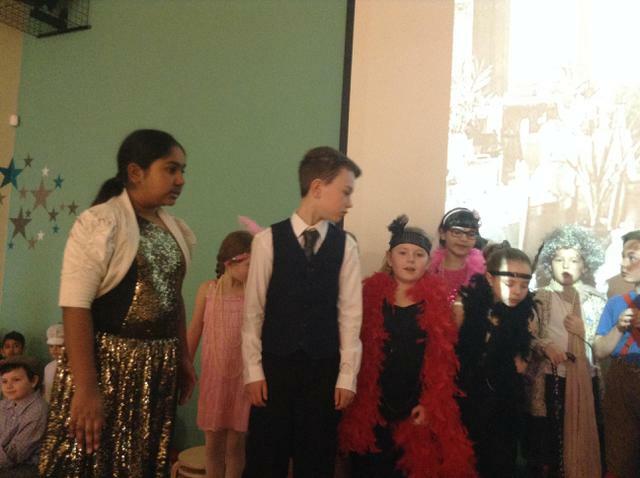 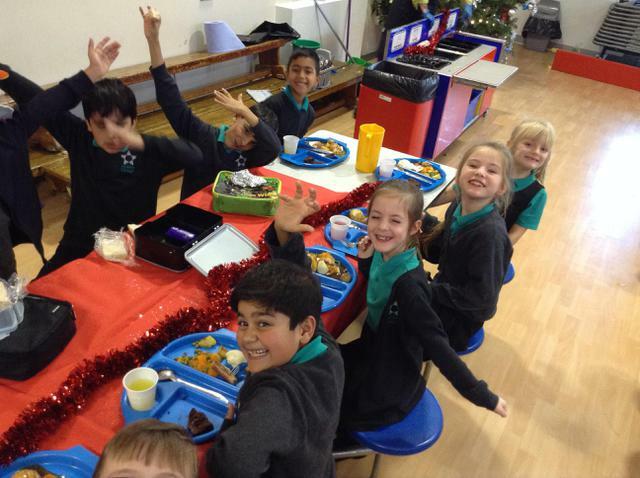 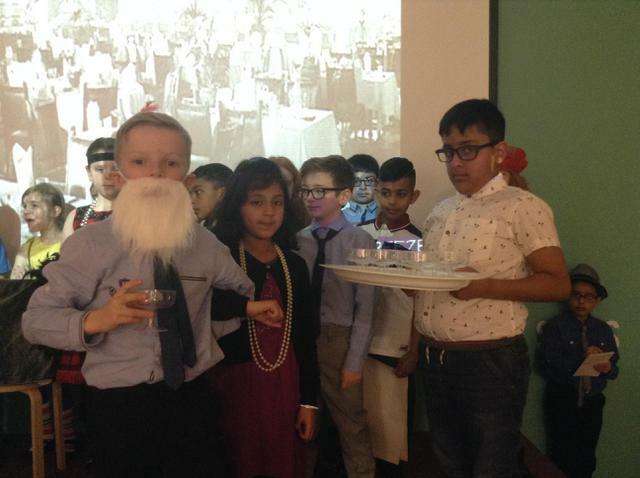 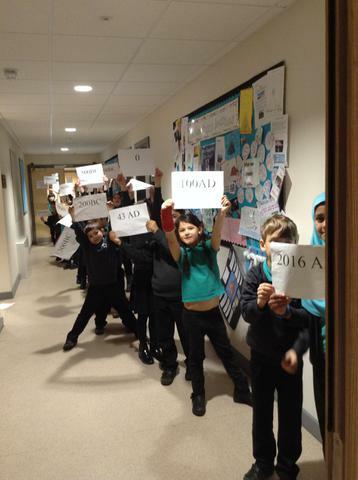 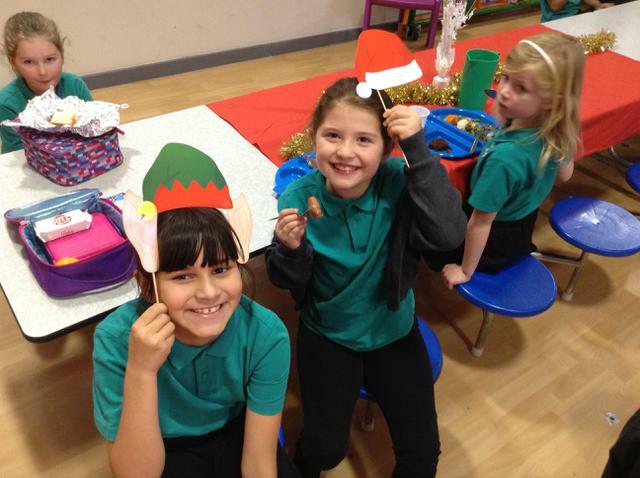 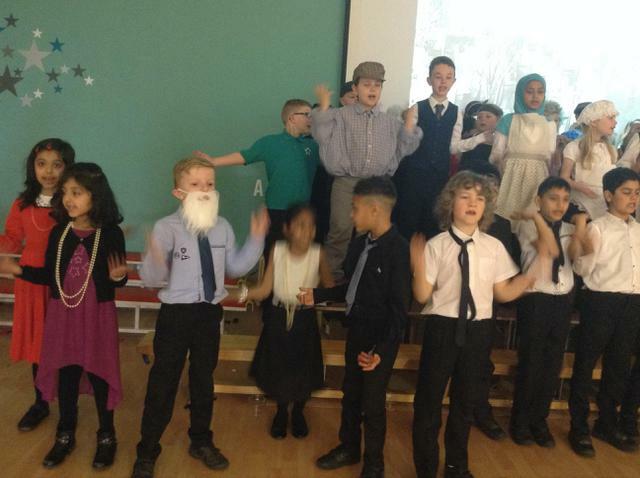 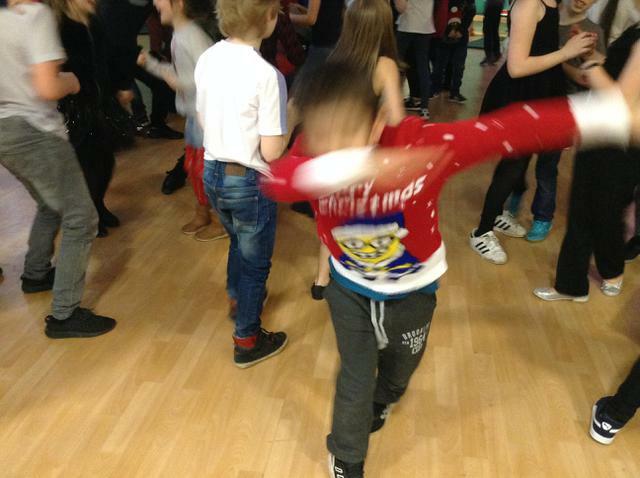 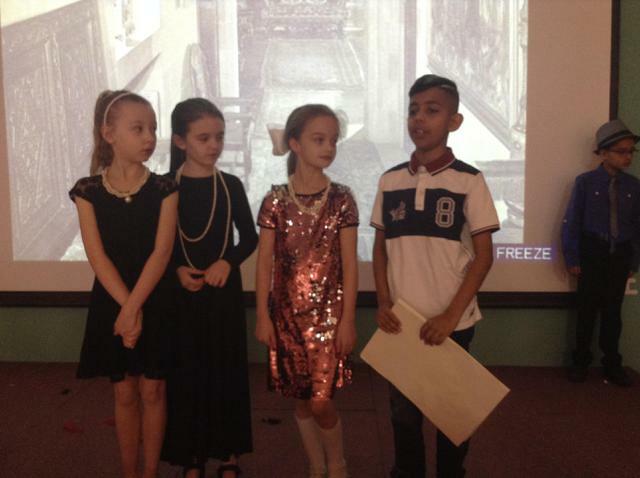 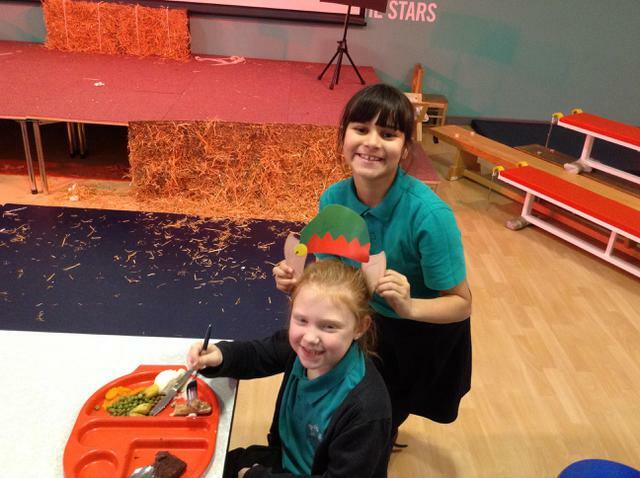 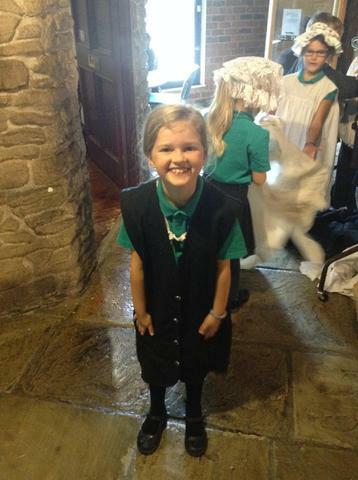 All the children have worked hard and it's going to be amazing...make sure you've got your tickets! 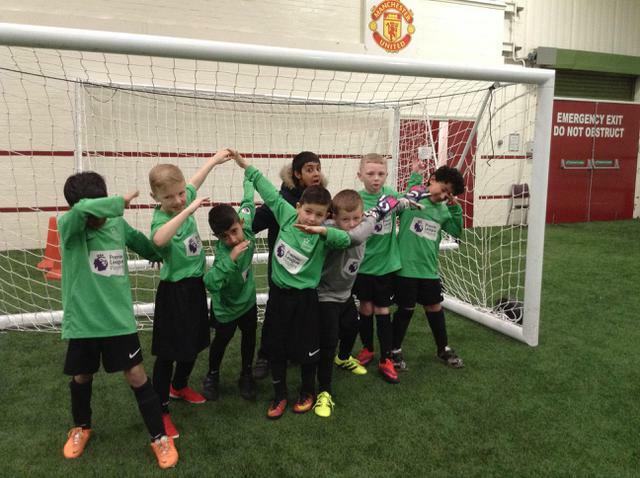 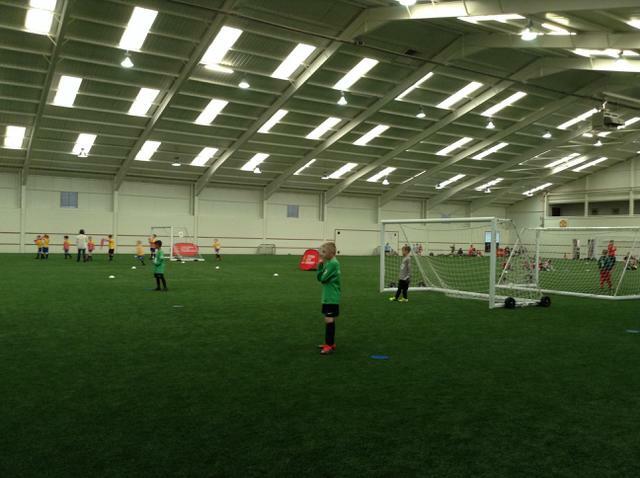 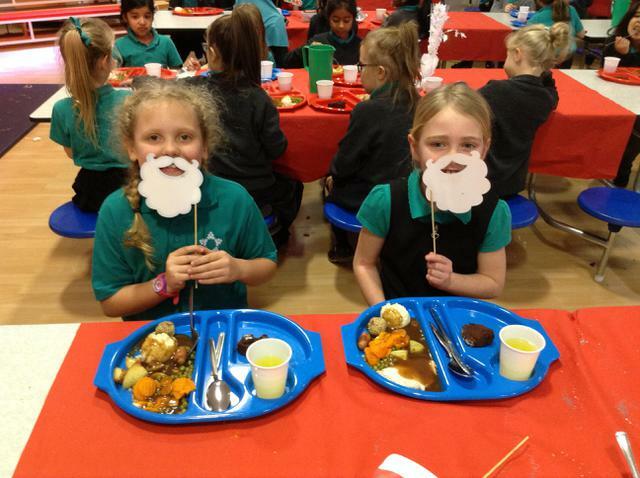 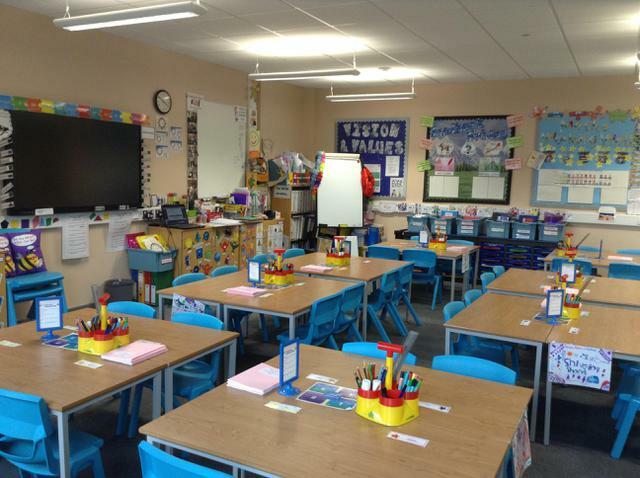 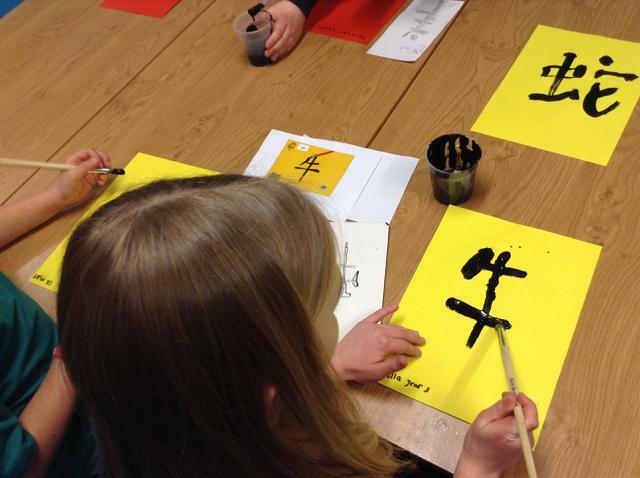 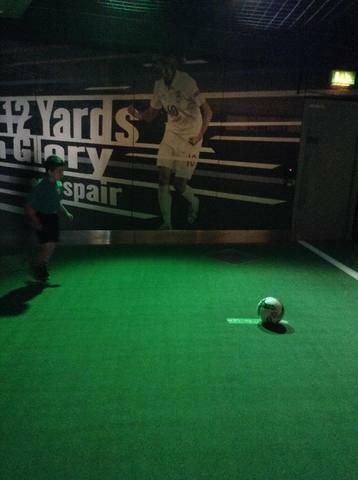 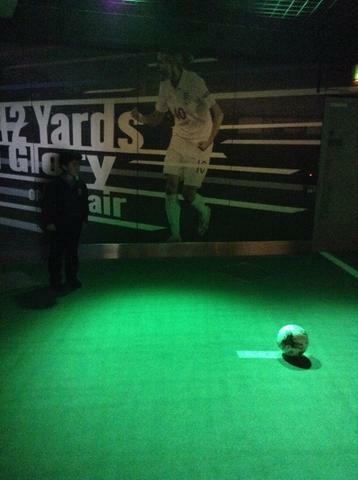 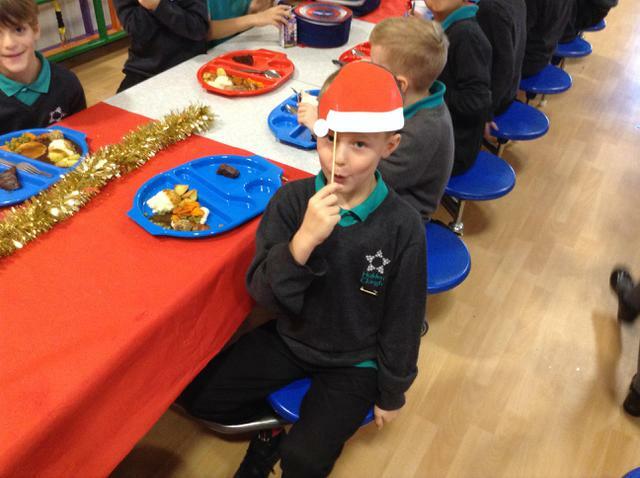 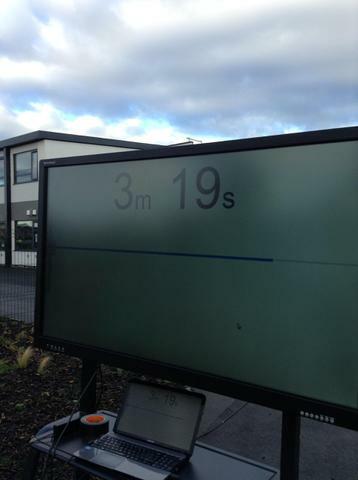 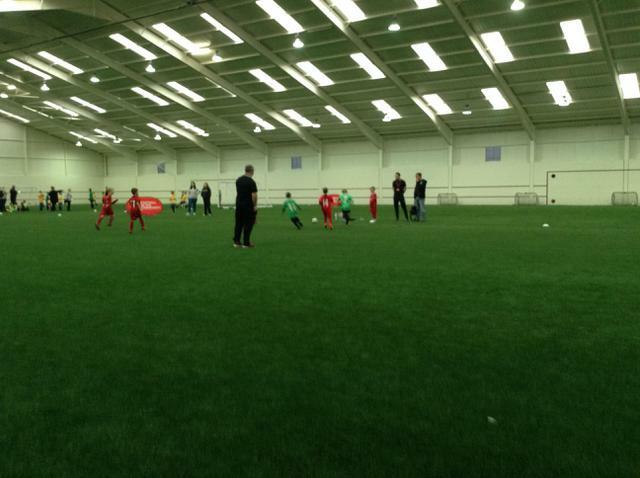 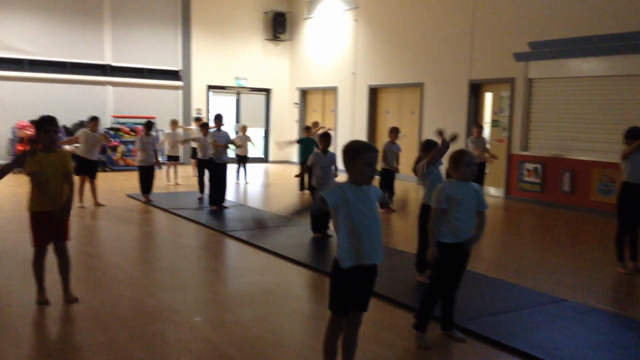 Wednesday 29th at 1.45pm and Thursday 30th at 9.30am. 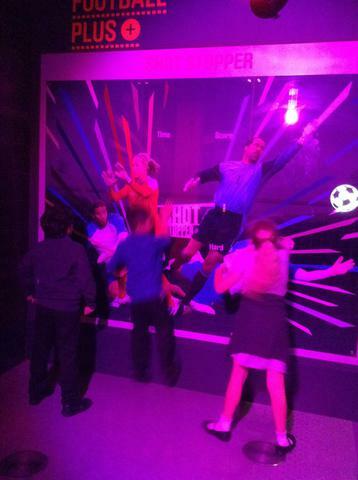 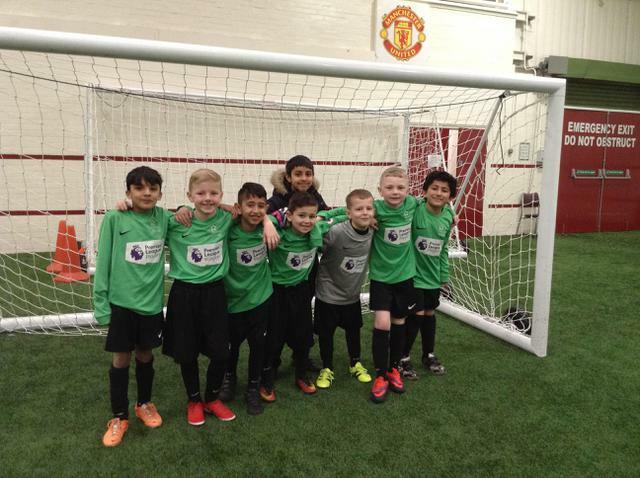 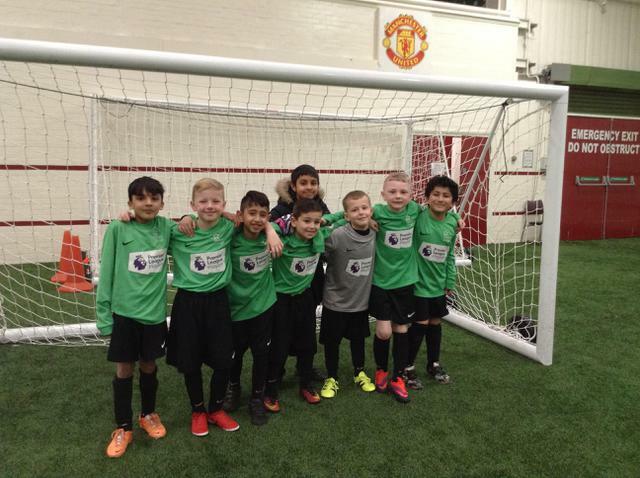 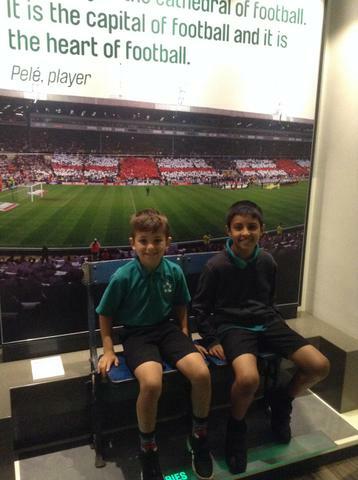 Some of our boys had a great time representing our school at The Cliff. 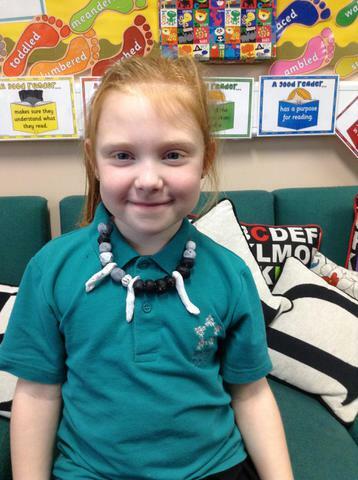 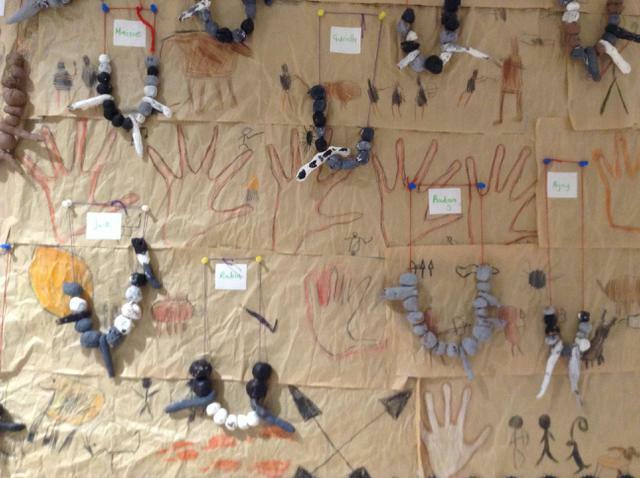 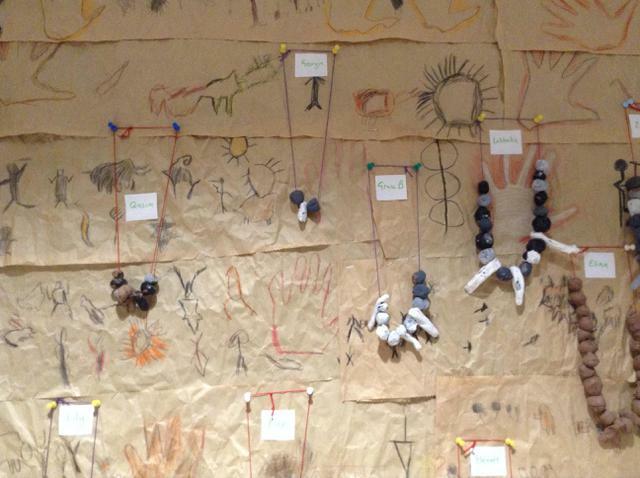 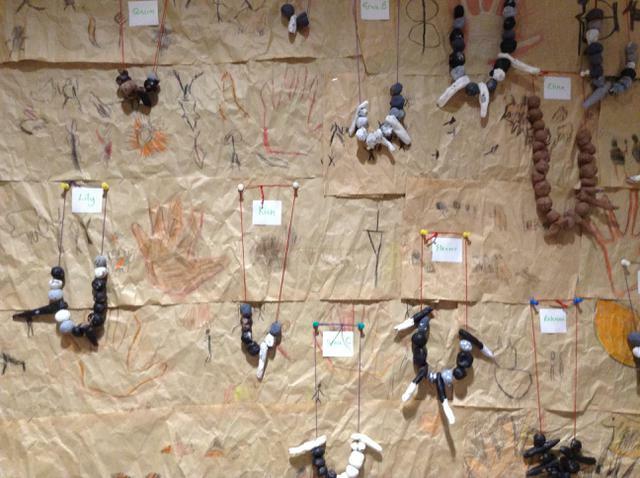 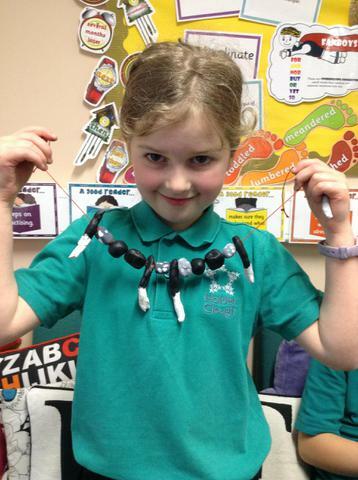 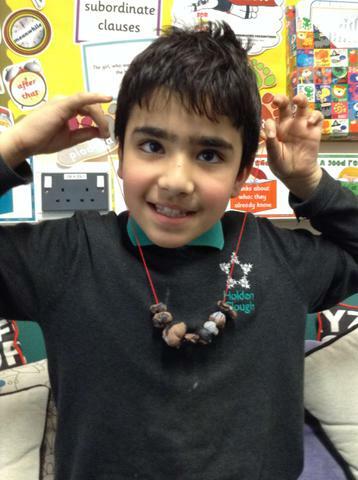 Our amazing Stone Age Jewellery. 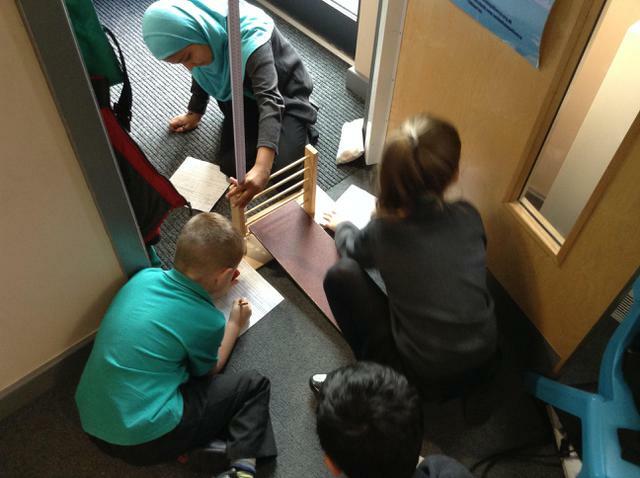 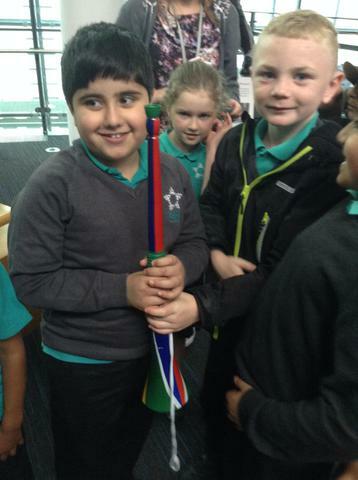 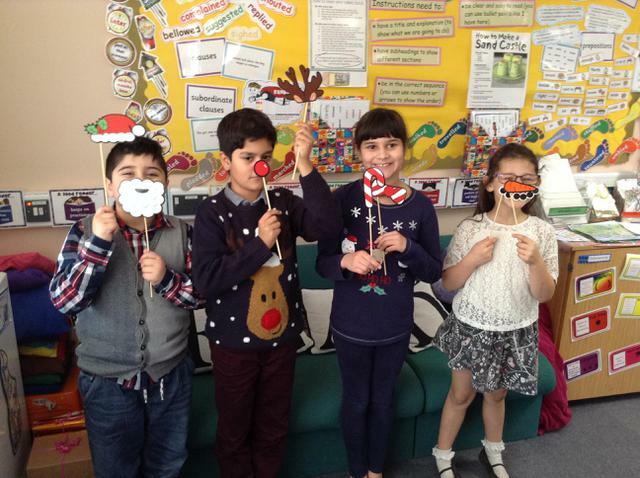 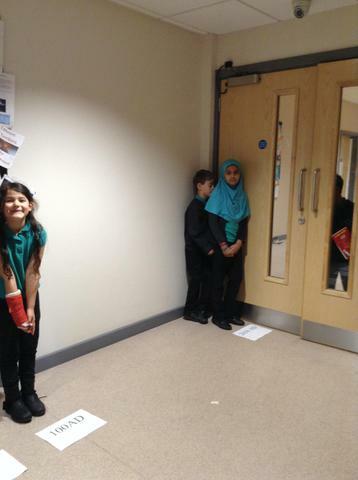 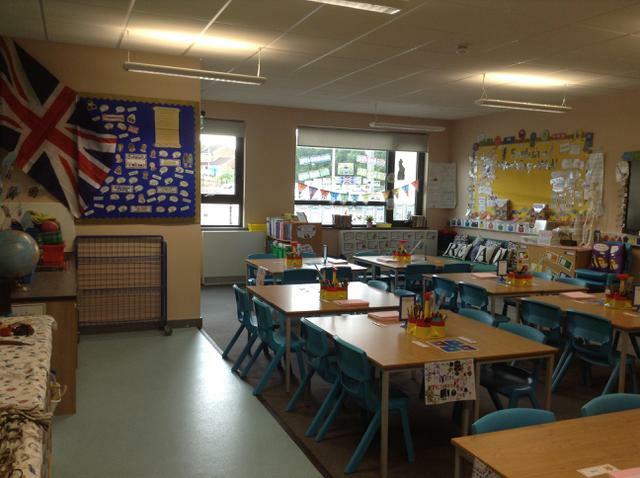 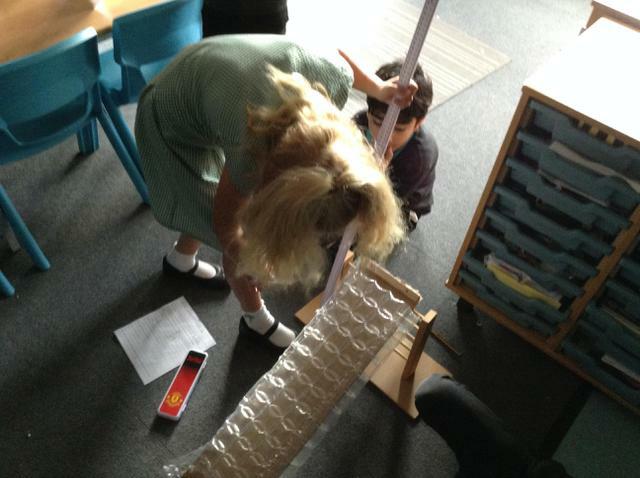 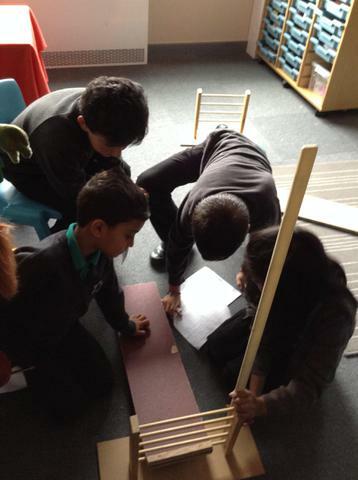 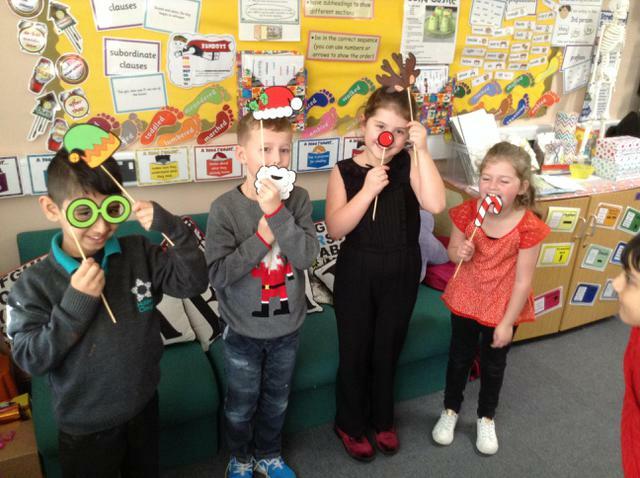 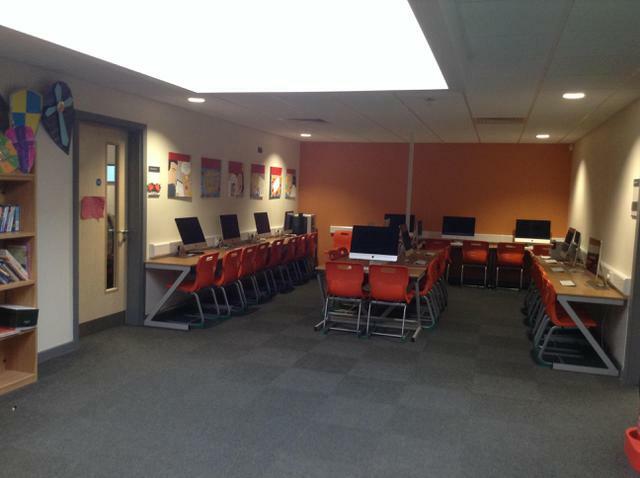 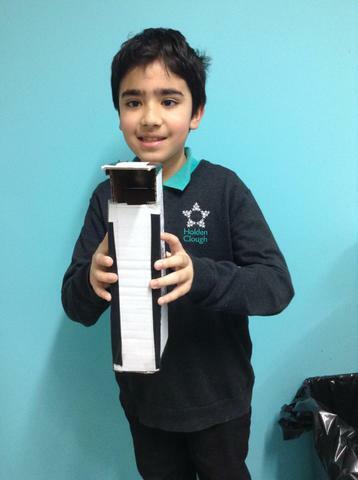 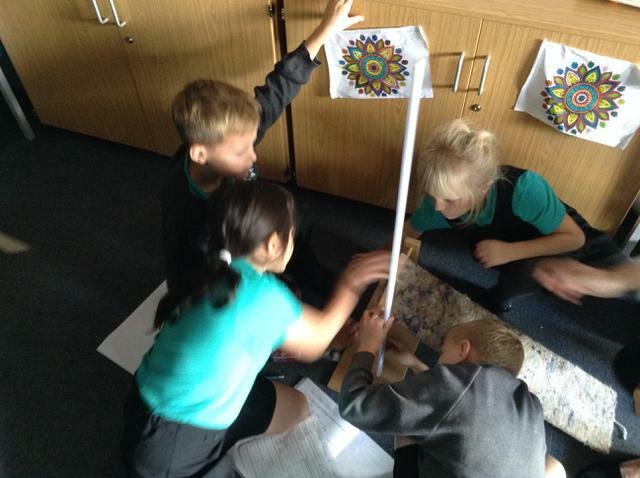 Look at our amazing periscopes! 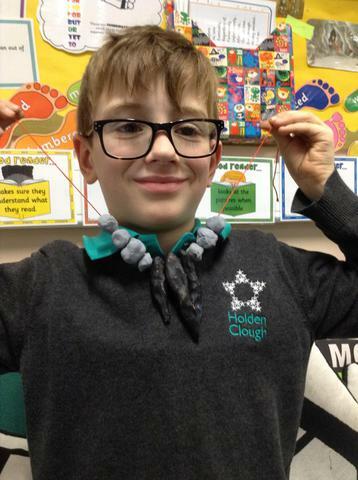 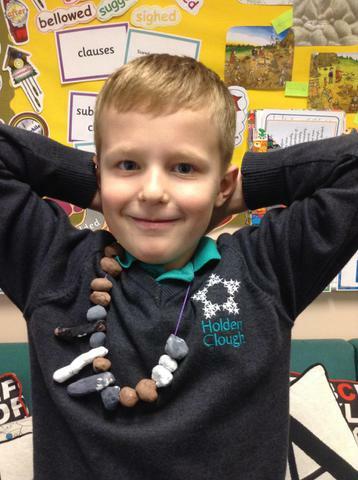 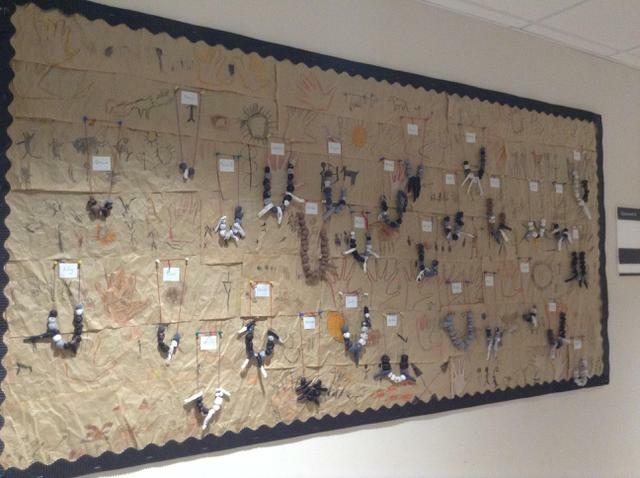 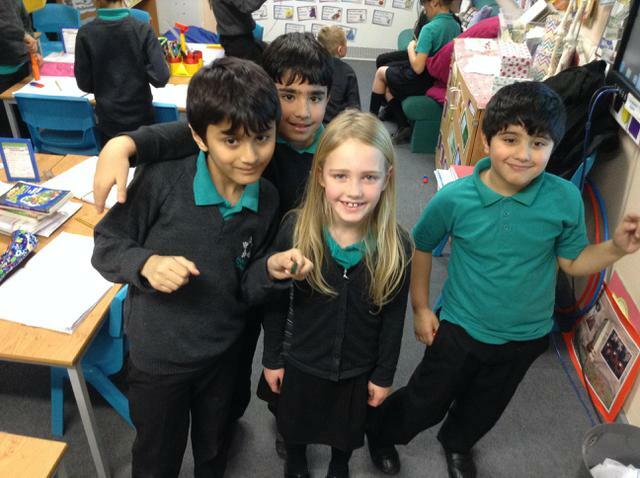 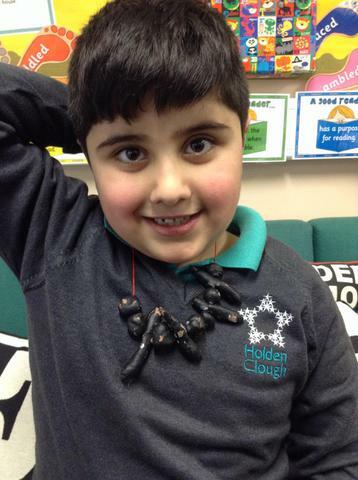 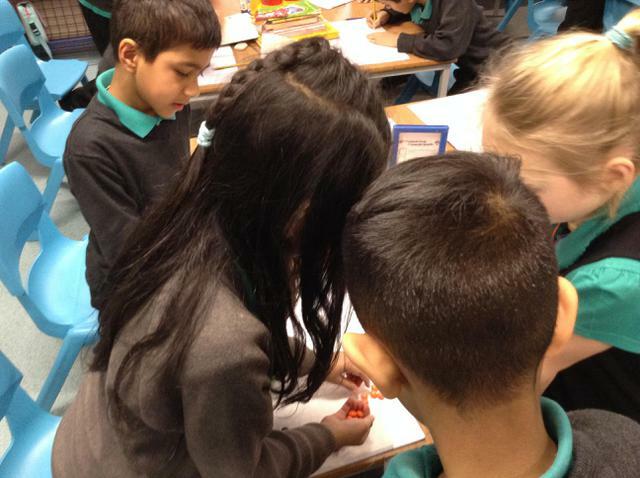 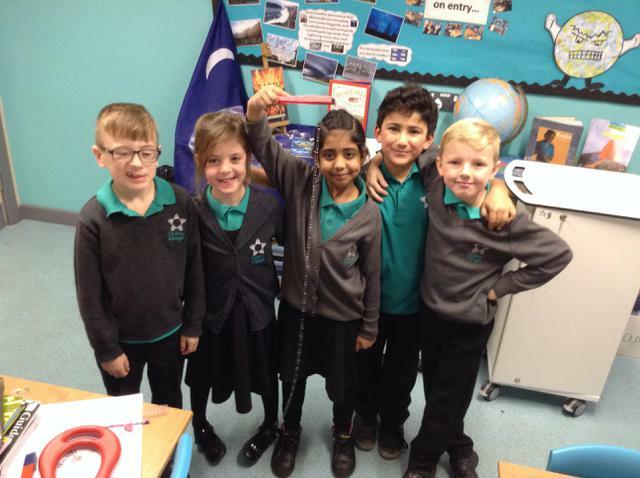 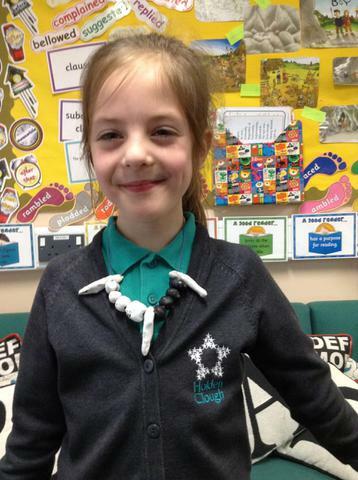 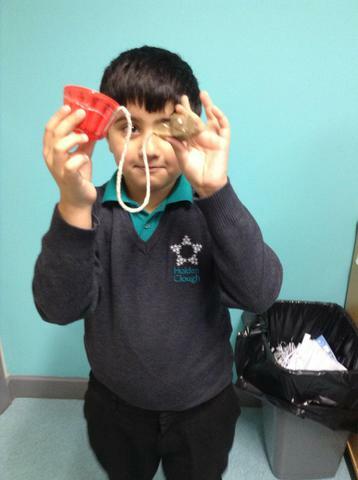 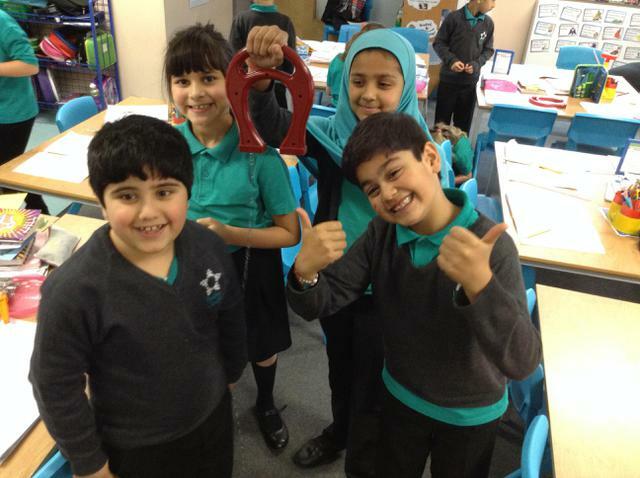 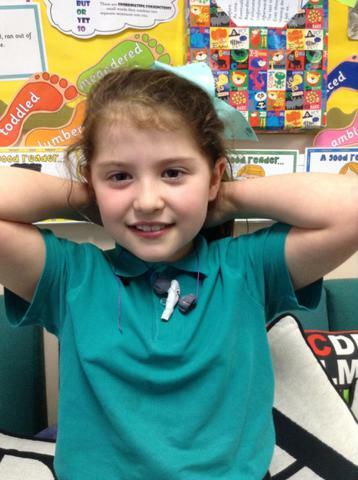 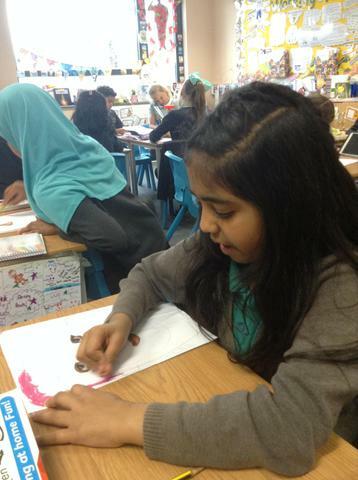 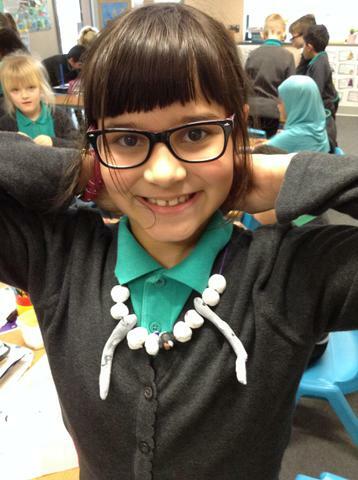 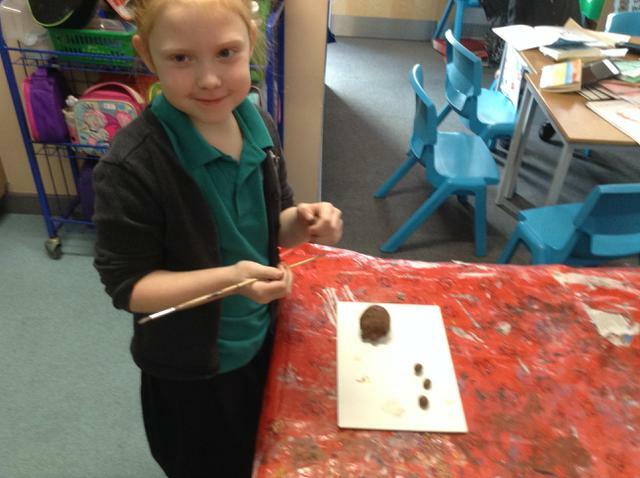 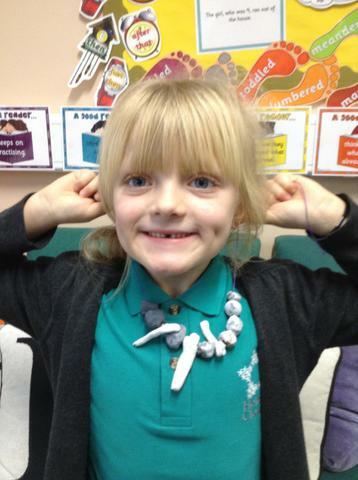 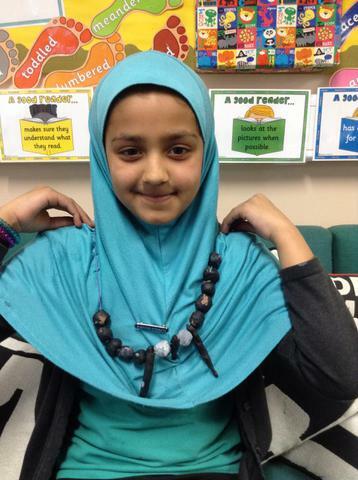 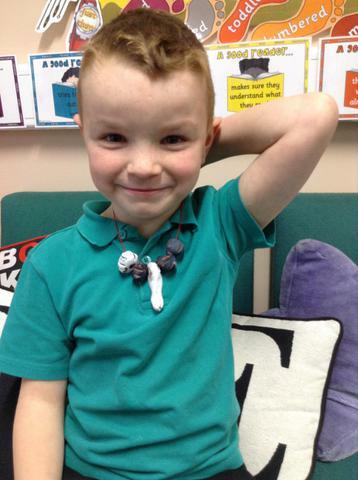 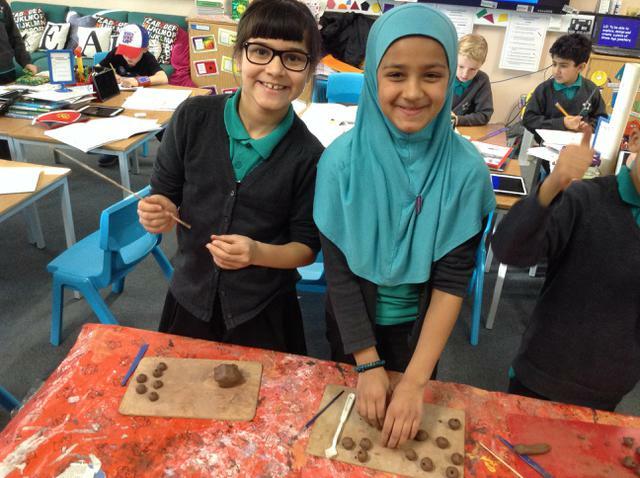 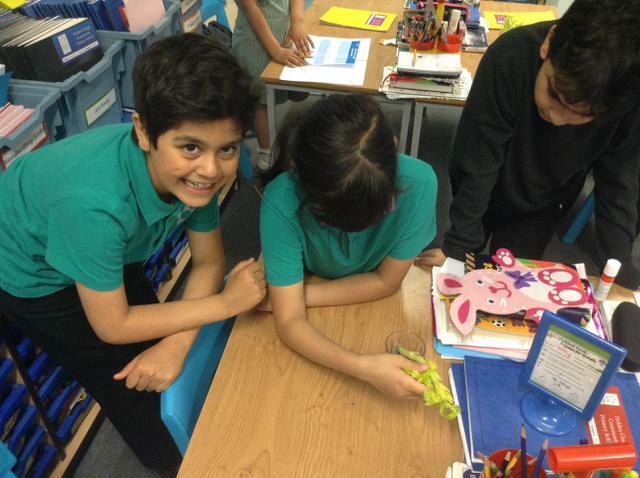 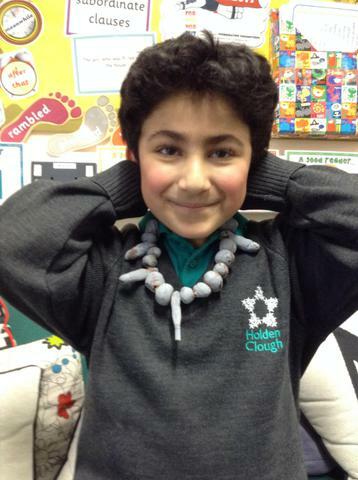 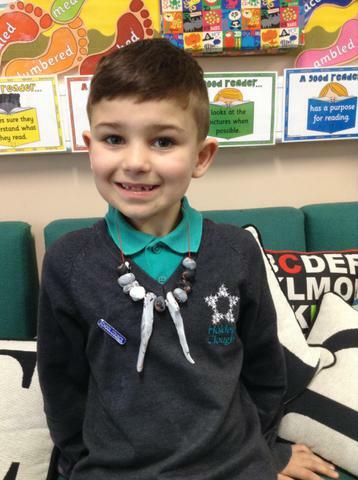 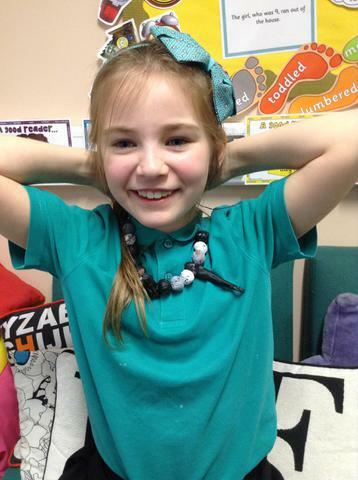 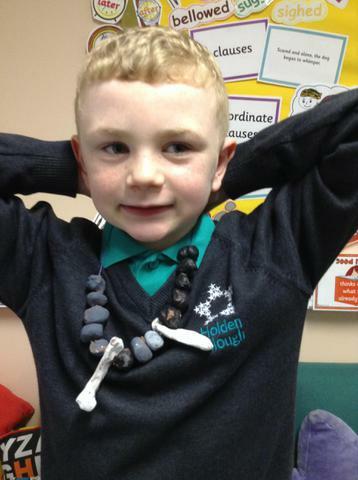 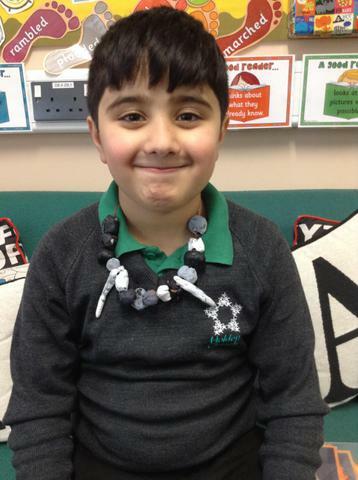 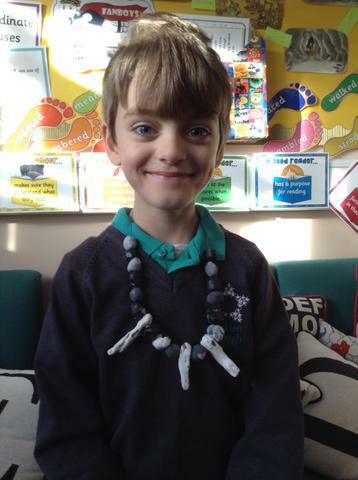 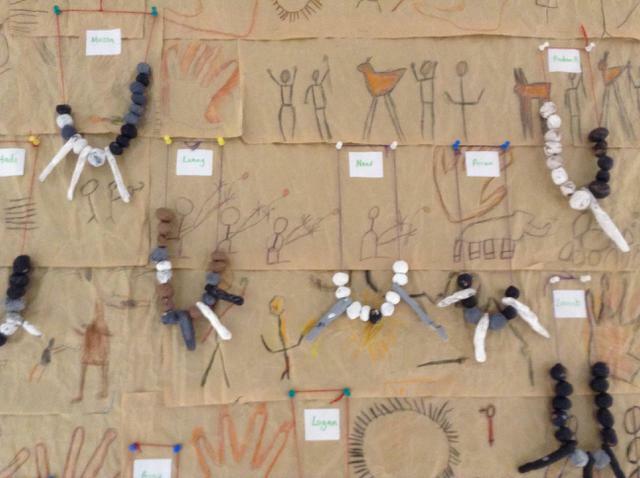 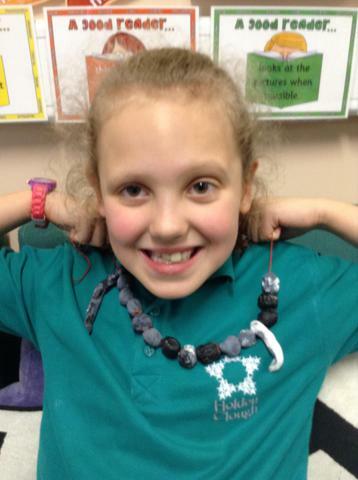 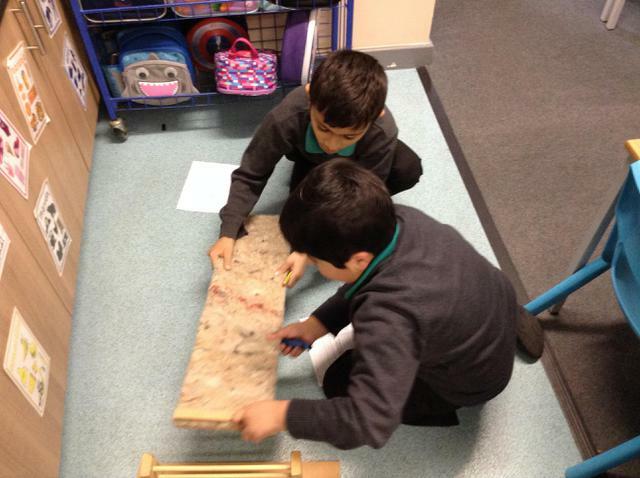 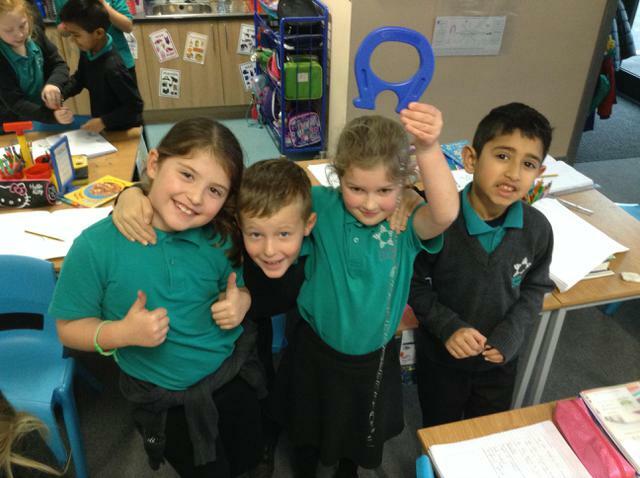 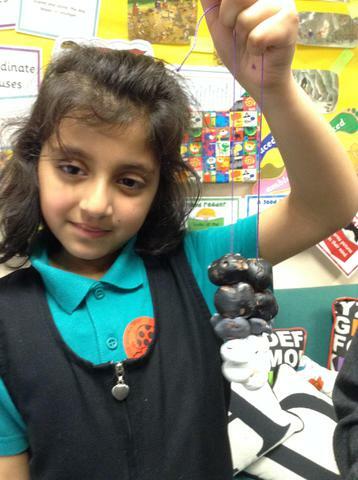 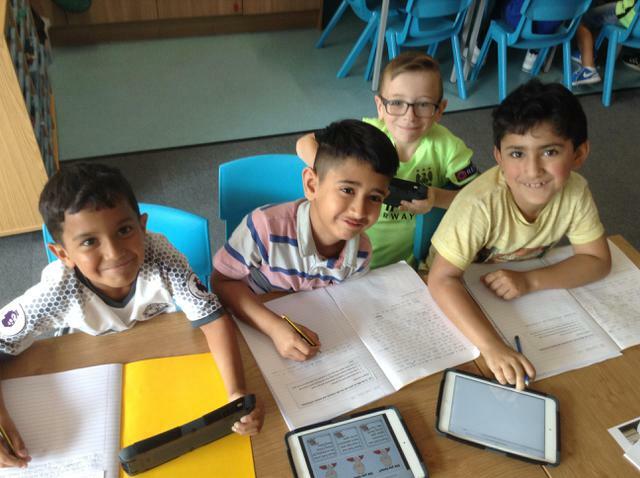 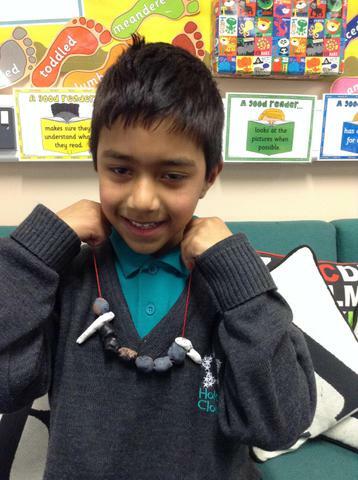 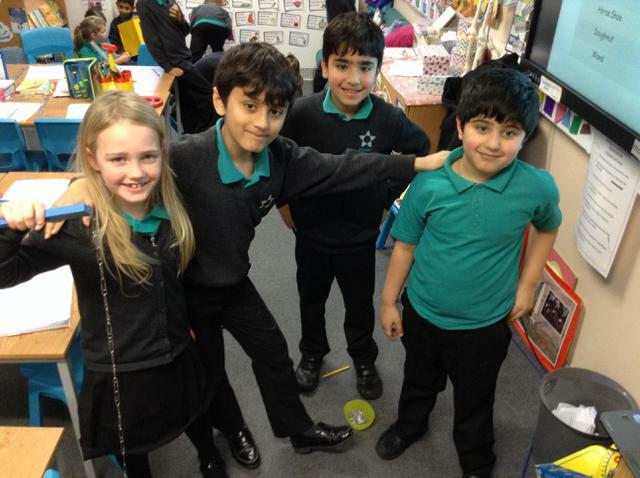 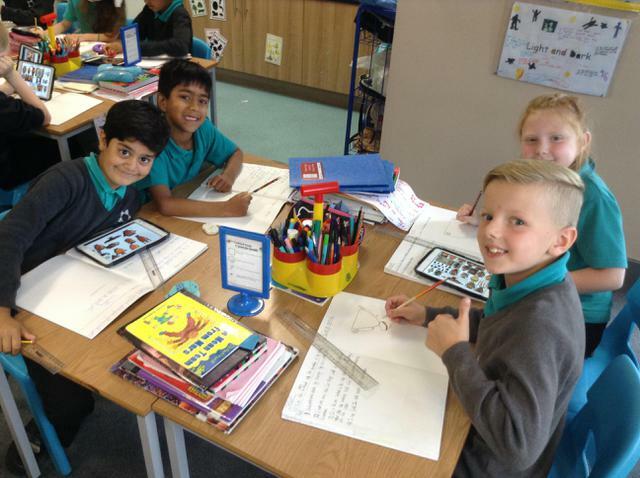 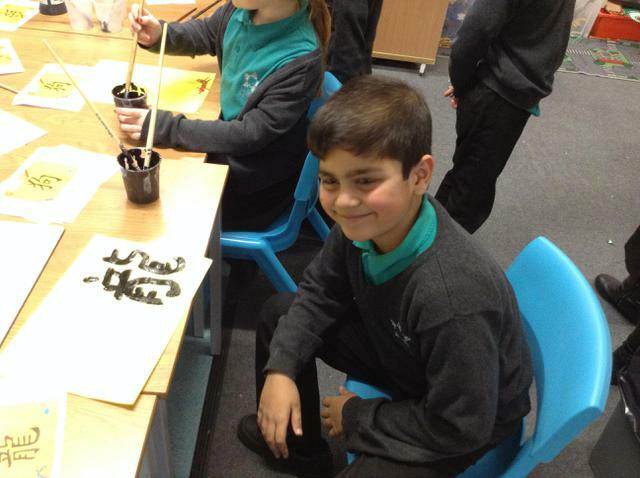 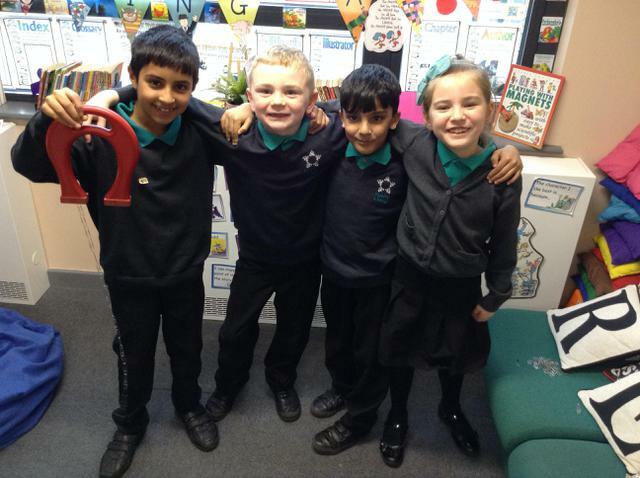 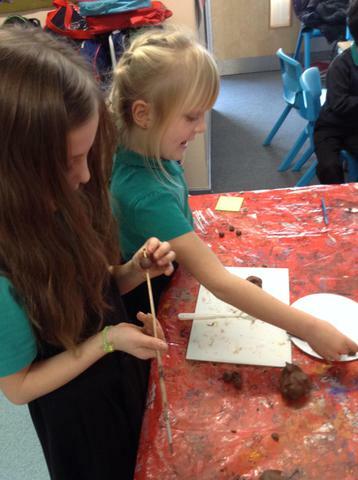 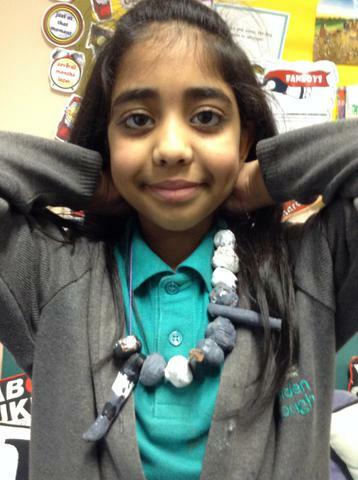 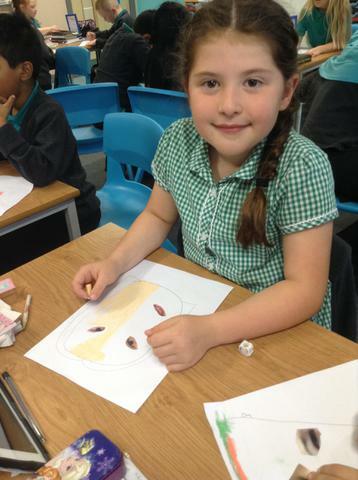 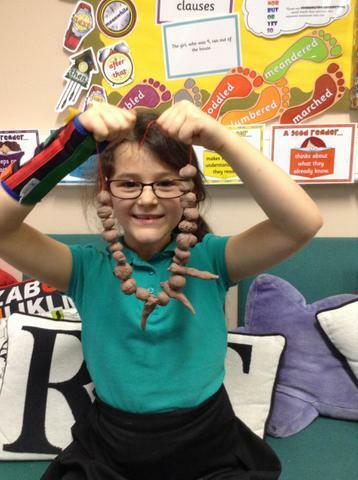 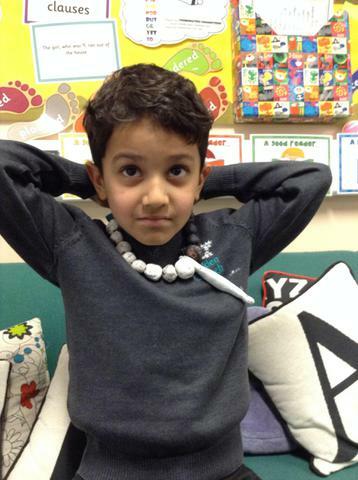 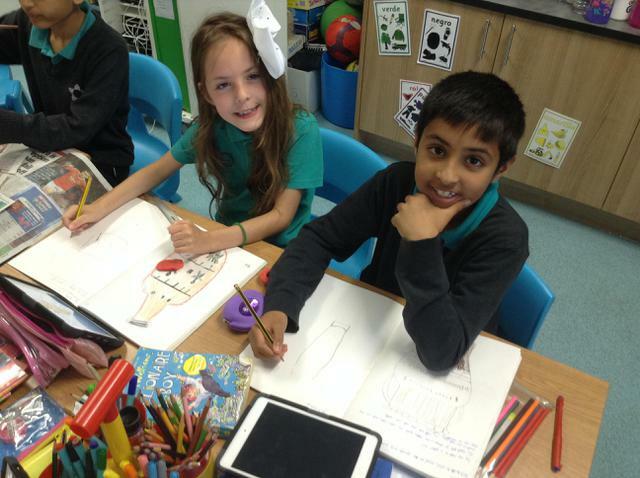 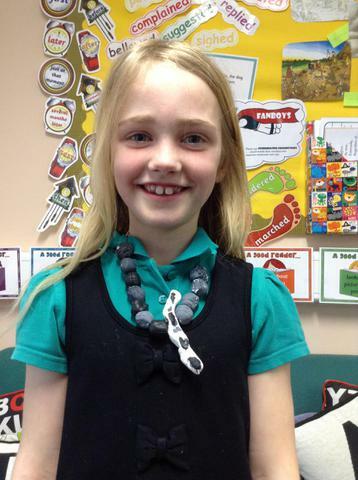 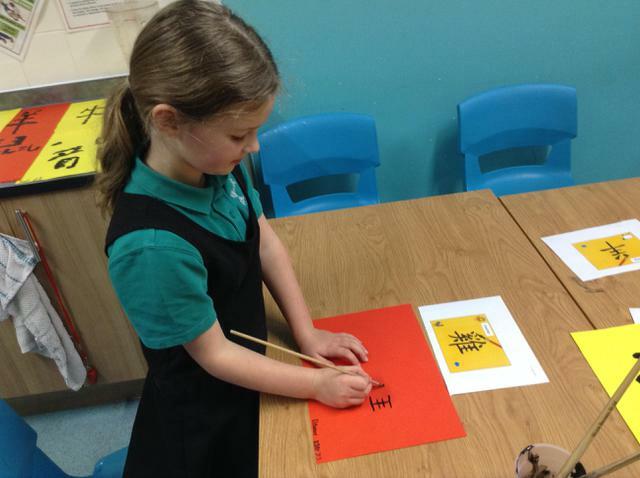 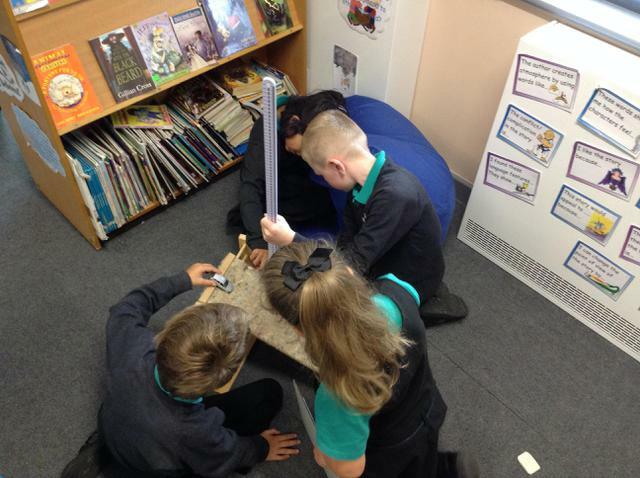 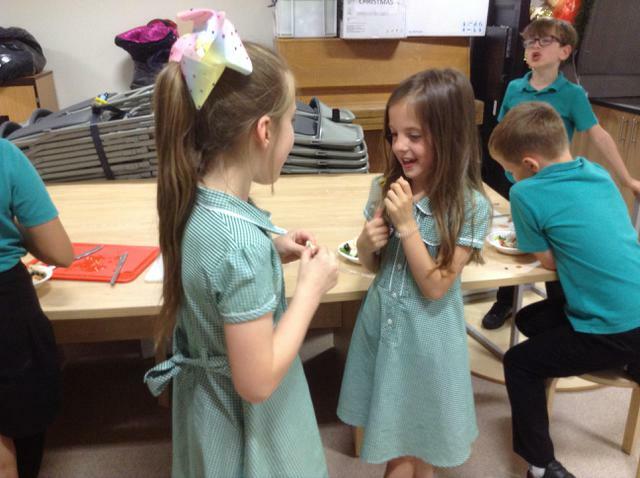 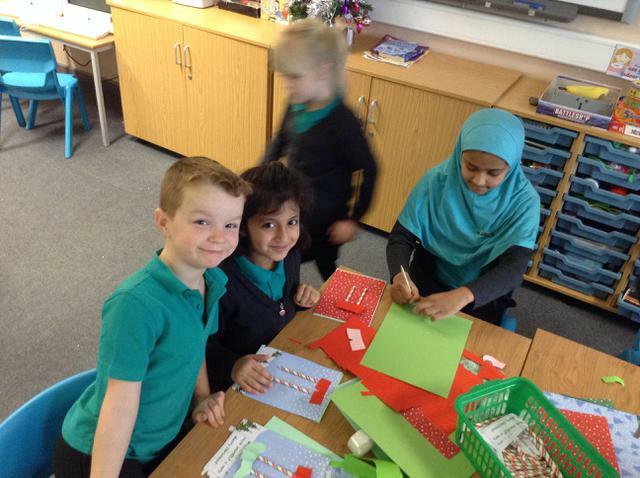 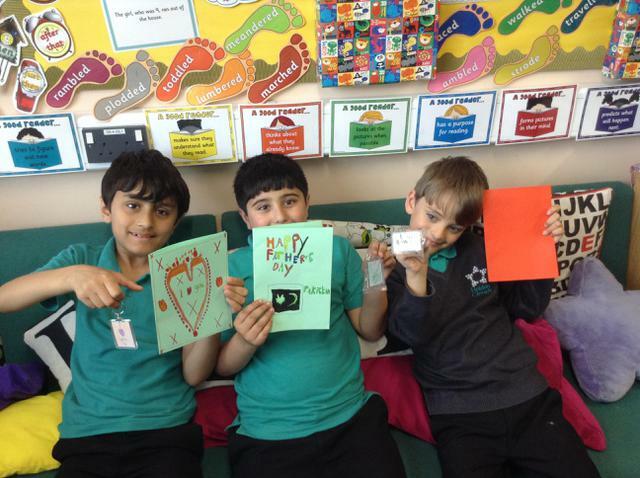 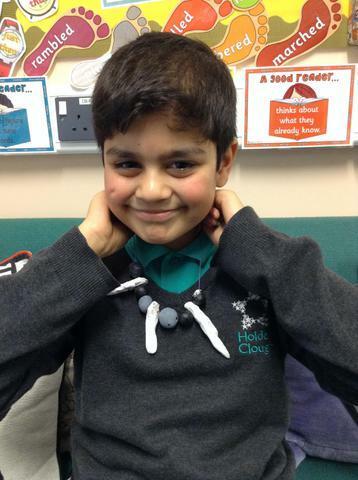 In DT we have been inspired to design and create our own Stone Age jewellery. 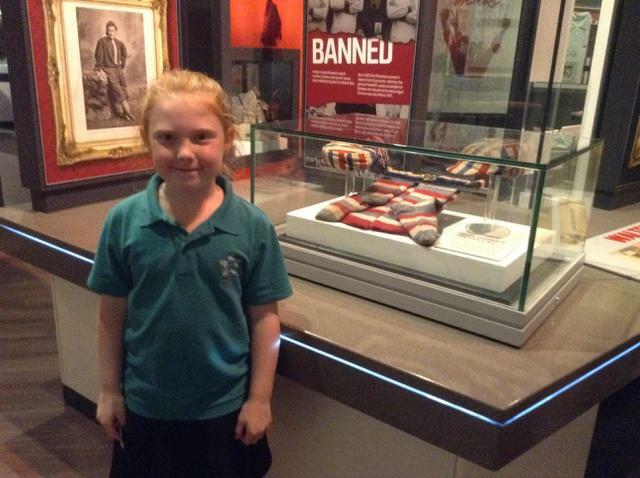 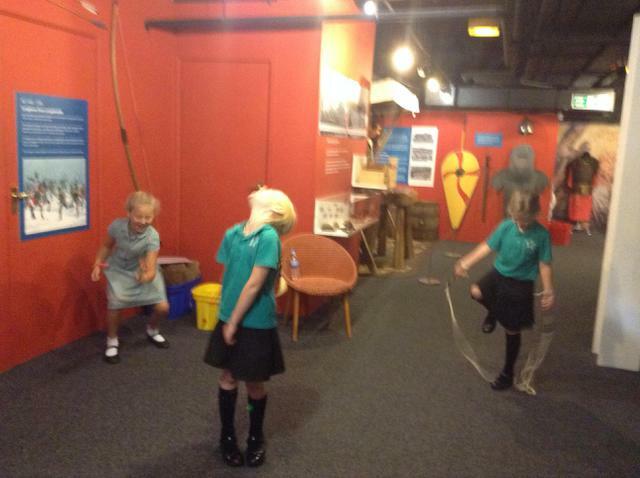 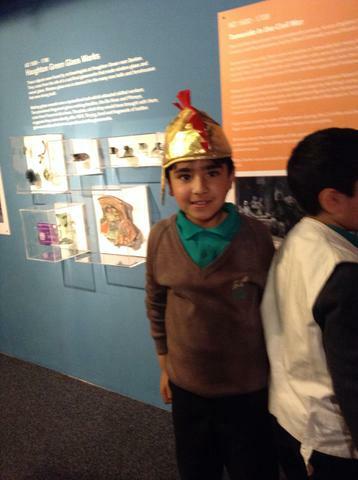 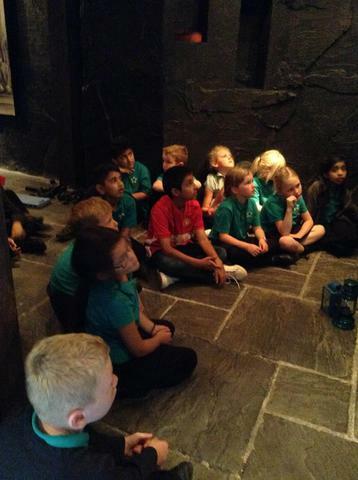 We looked at photographs of jewellery which was discovered at Skara Brae. 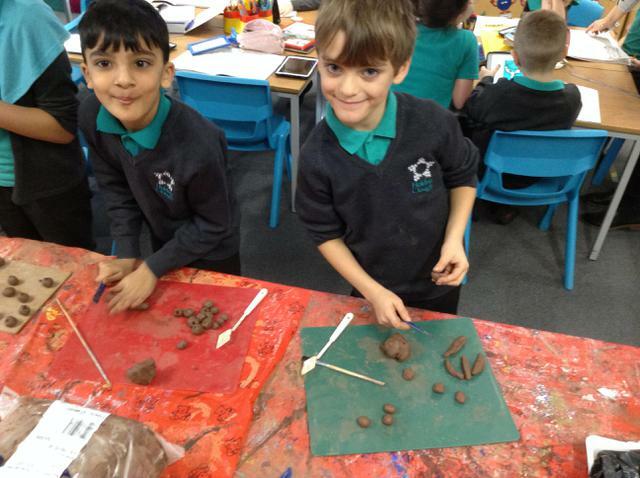 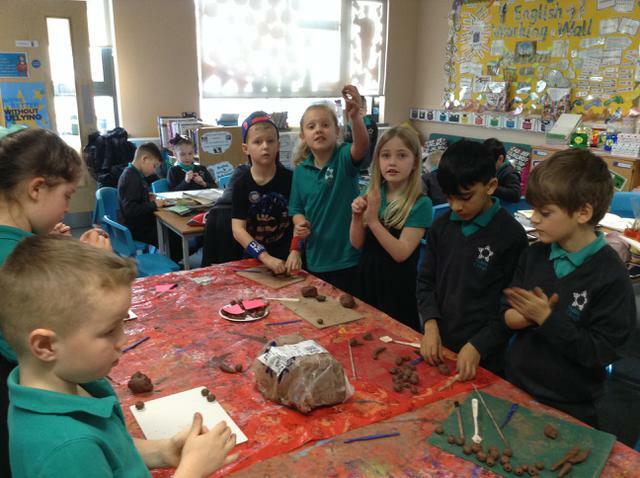 We looked carefully at the shape of the animal teeth, bones and fossils to help us create our own out of earth coloured clay. 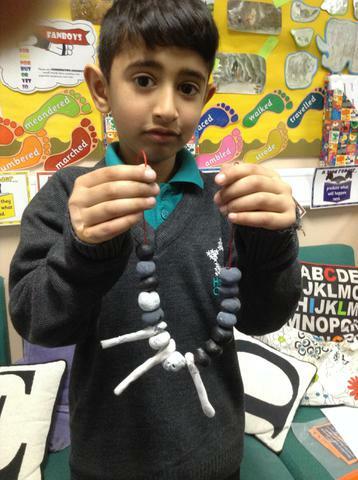 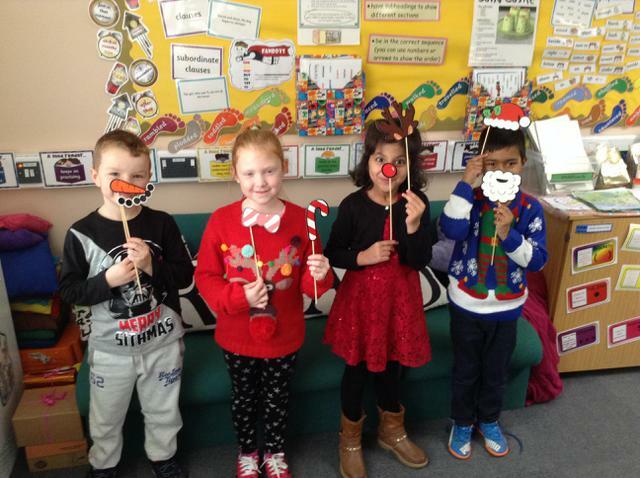 We painted them and used thread to string them together. 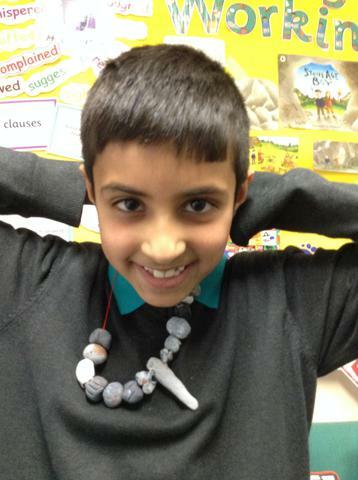 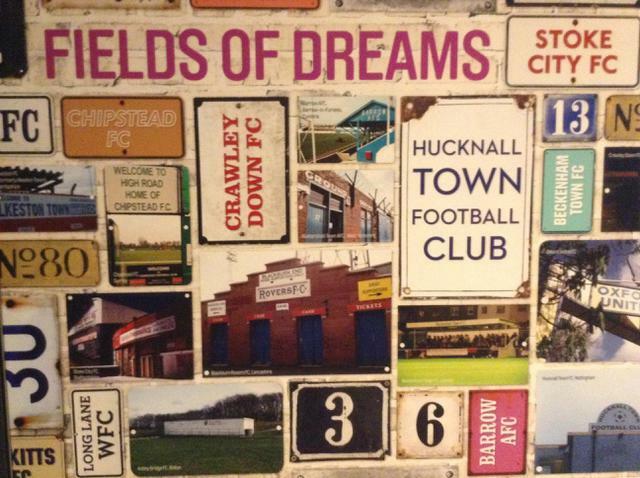 Take a look at the photographs to see our amazing pieces of jewellery. 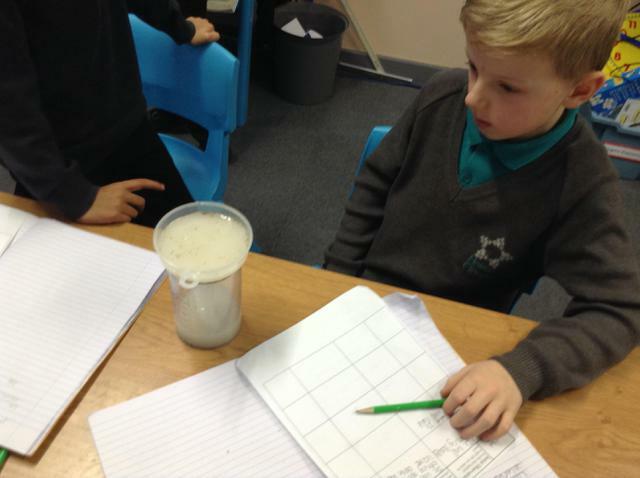 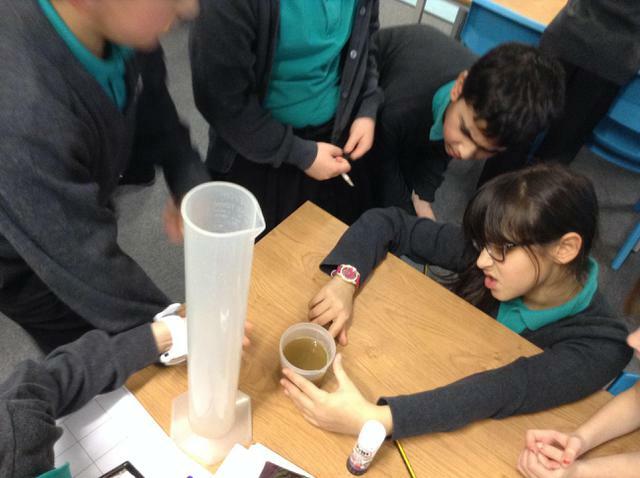 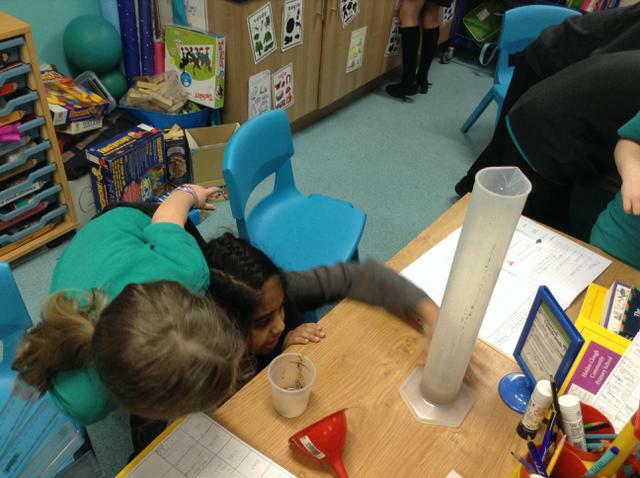 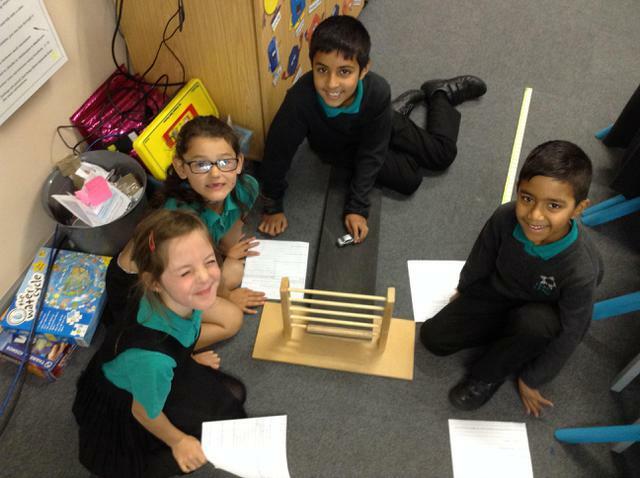 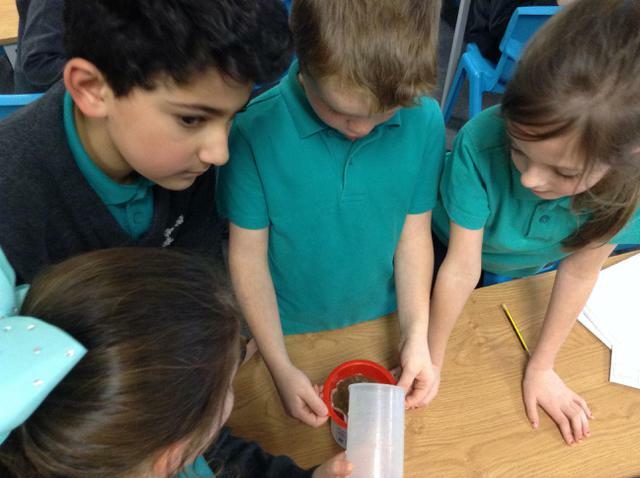 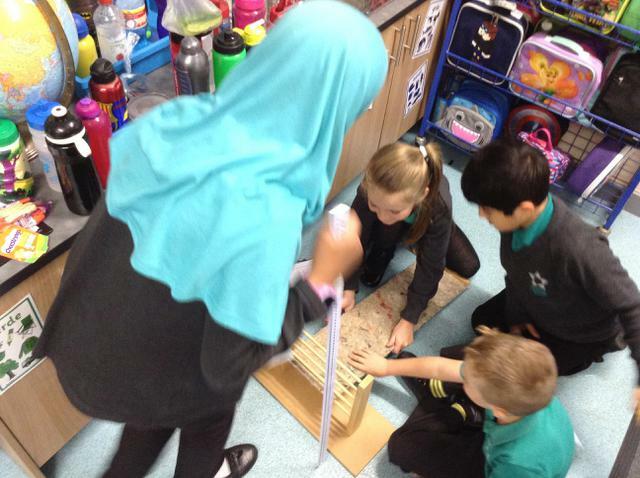 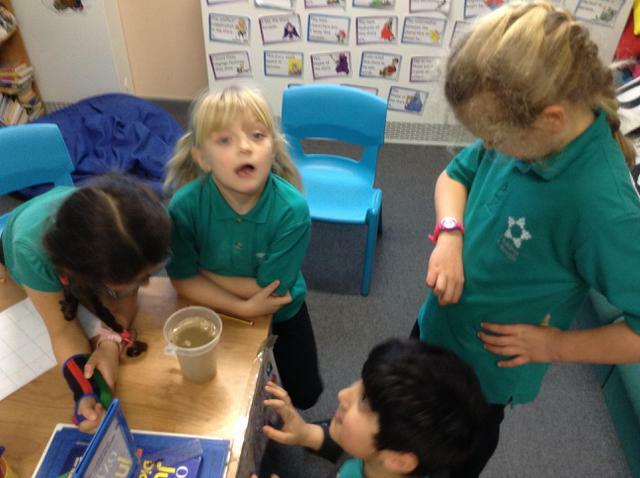 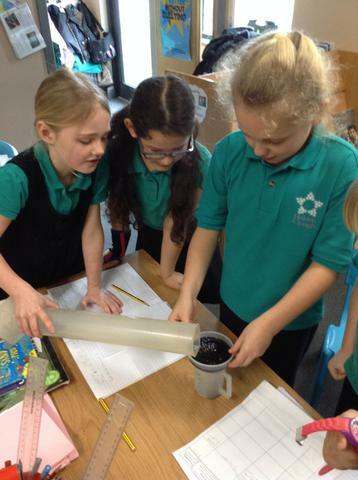 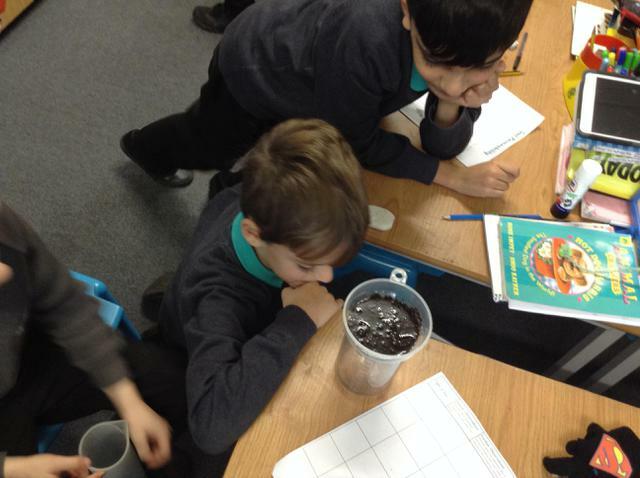 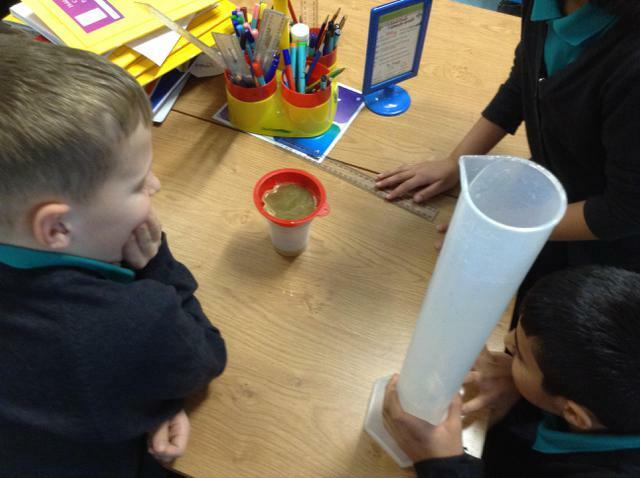 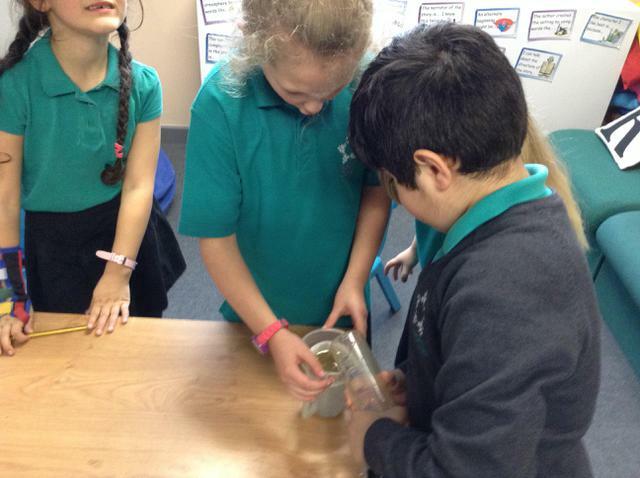 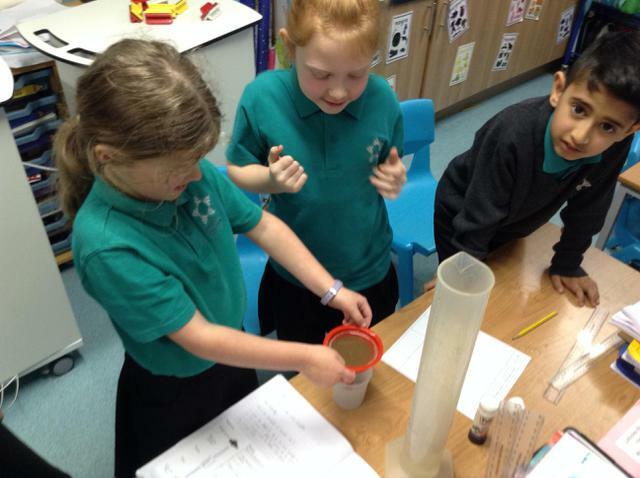 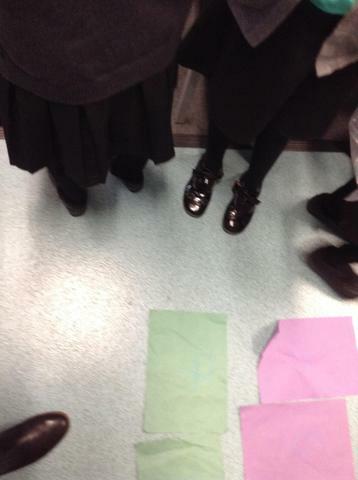 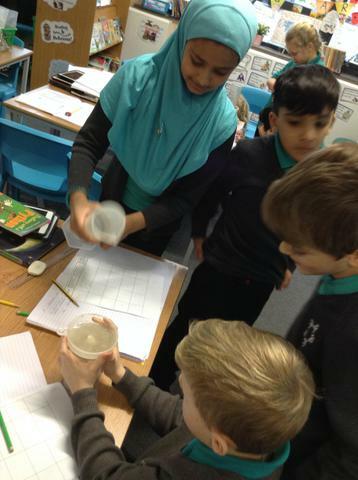 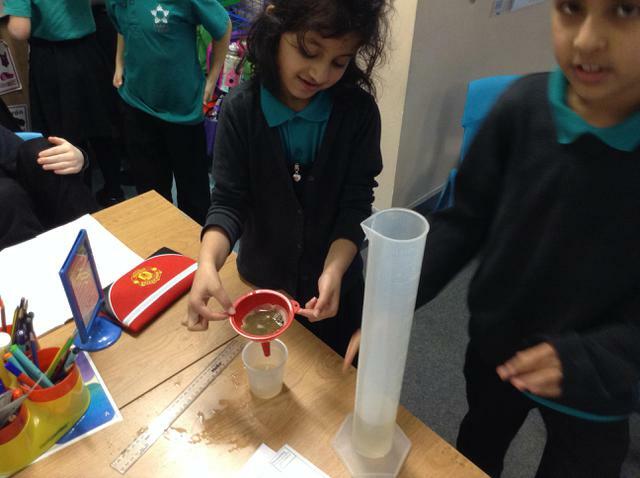 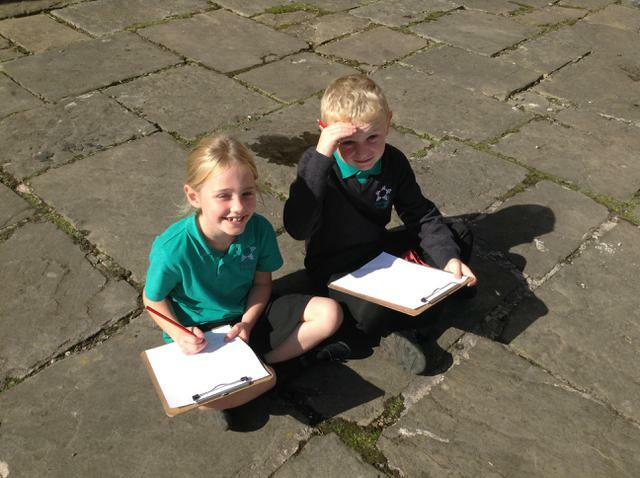 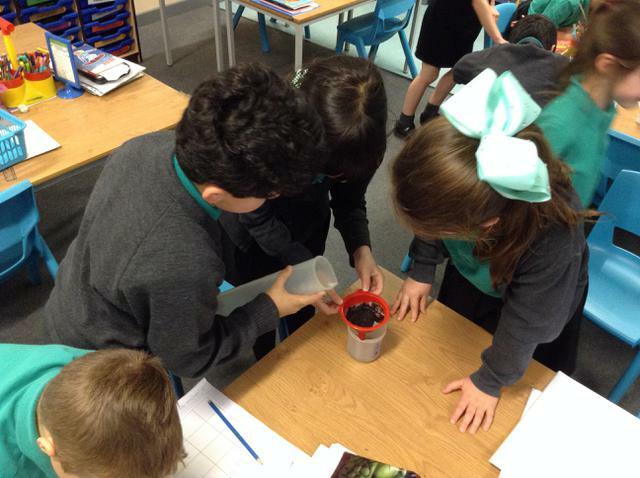 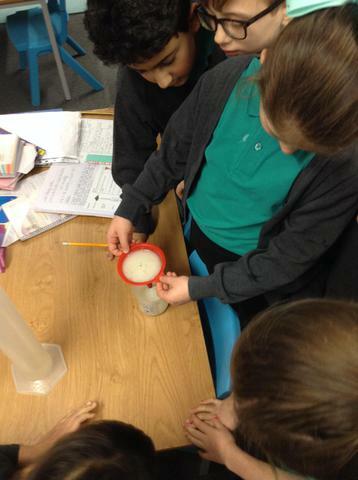 We enjoyed investigating the permeability of different soils. 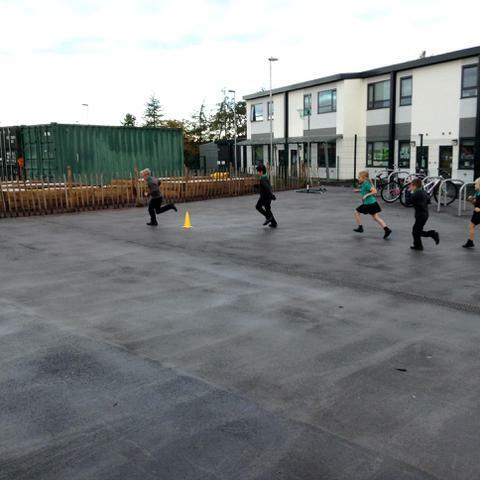 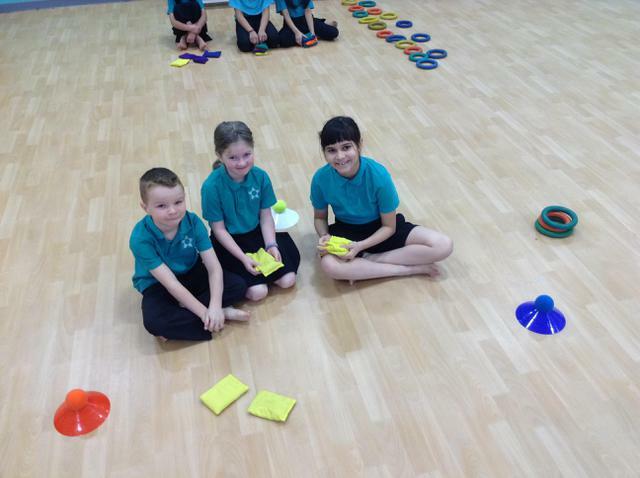 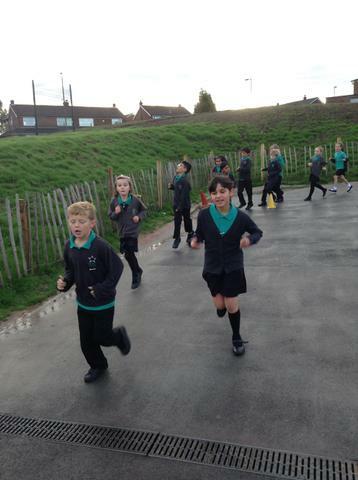 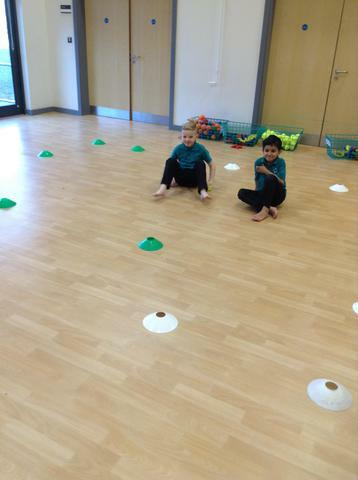 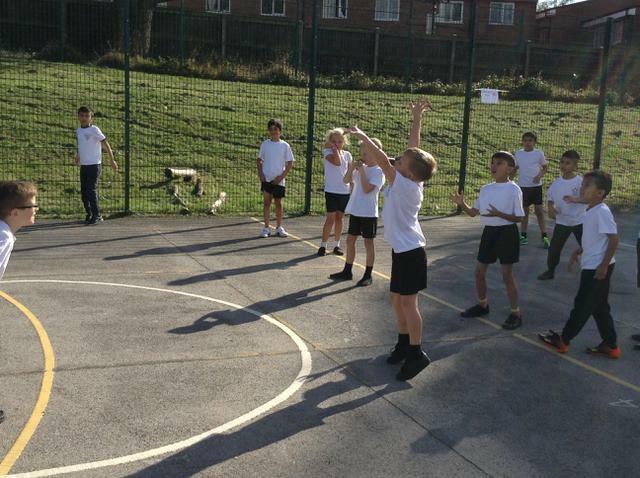 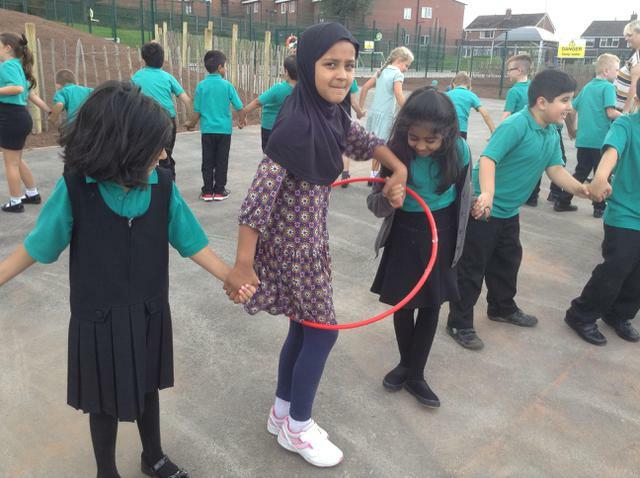 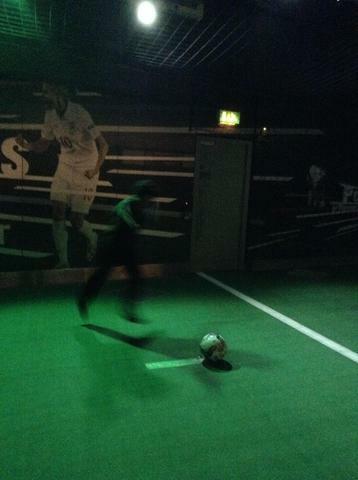 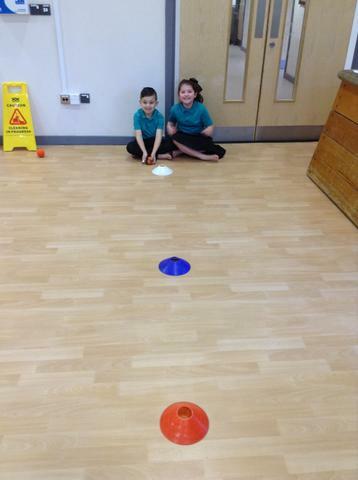 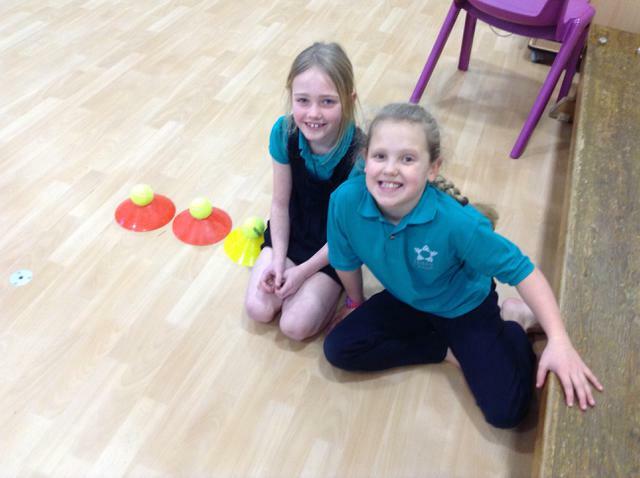 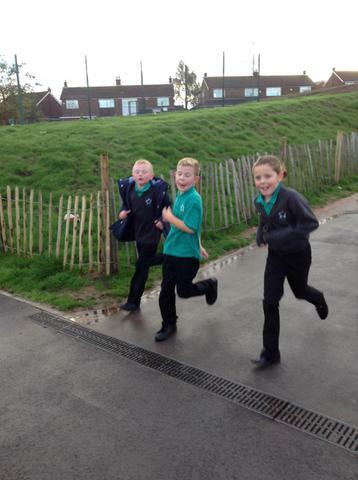 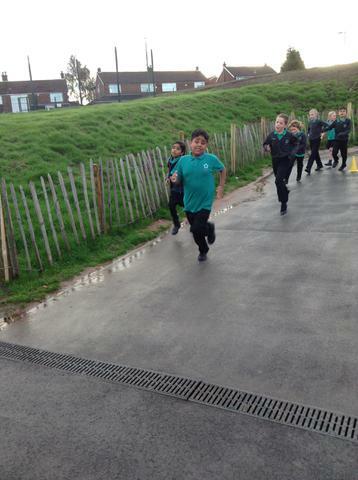 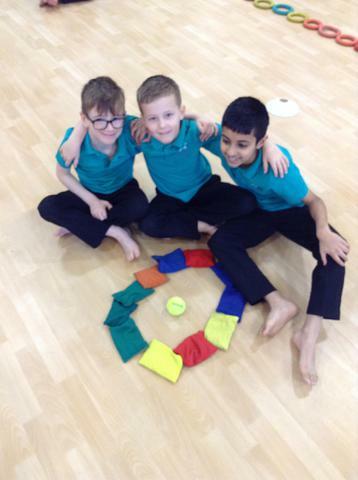 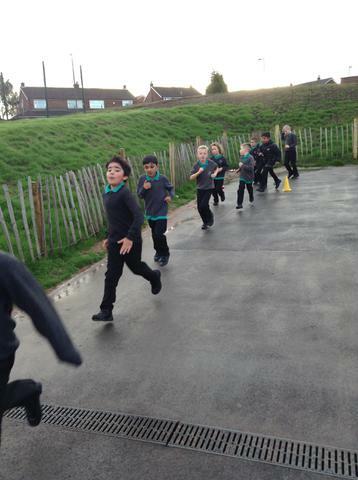 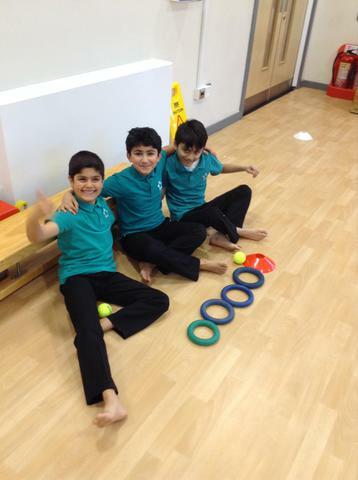 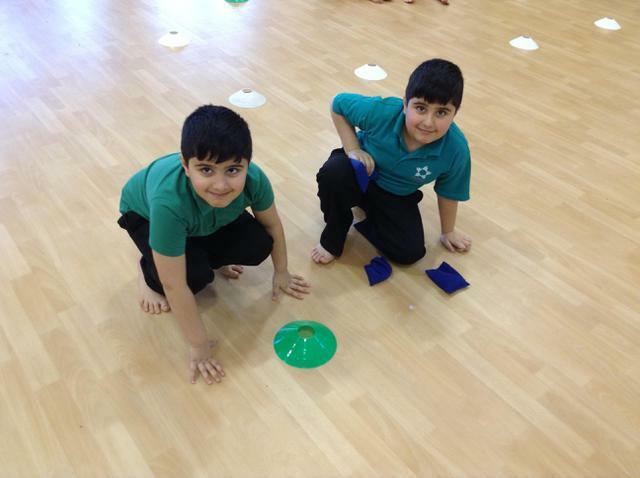 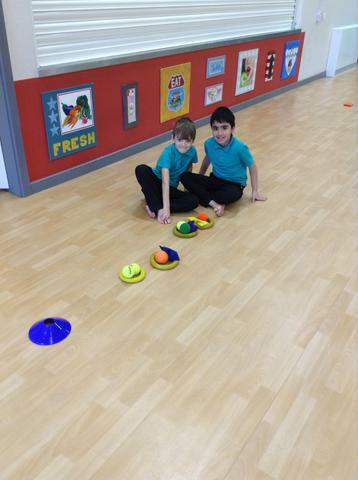 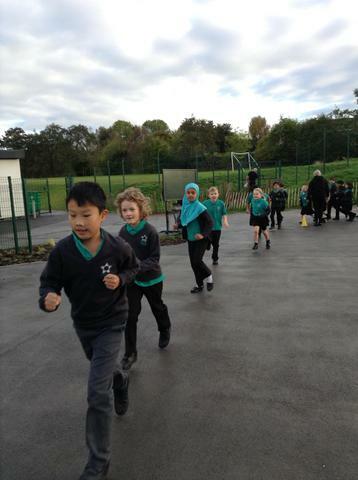 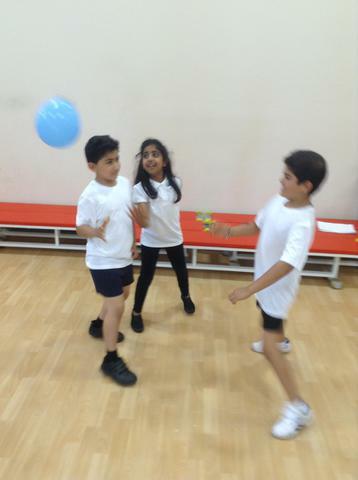 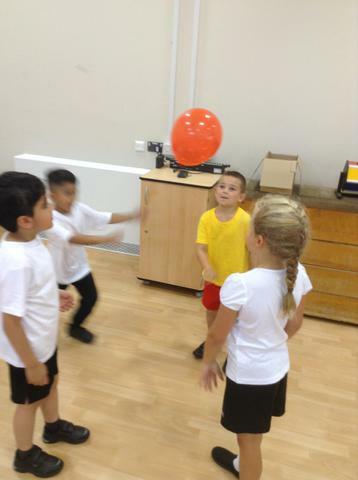 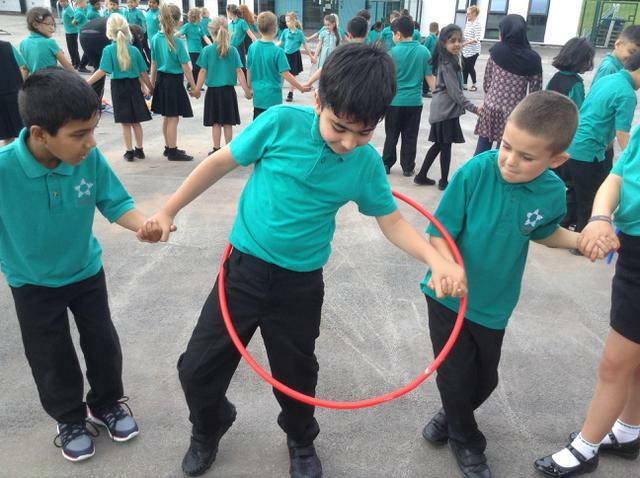 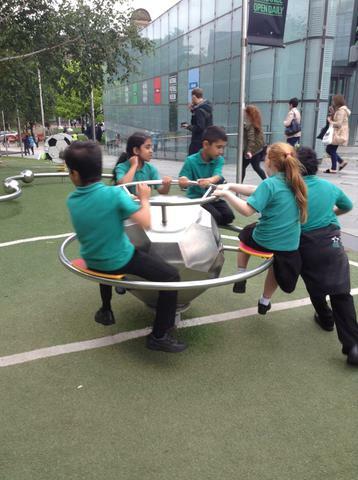 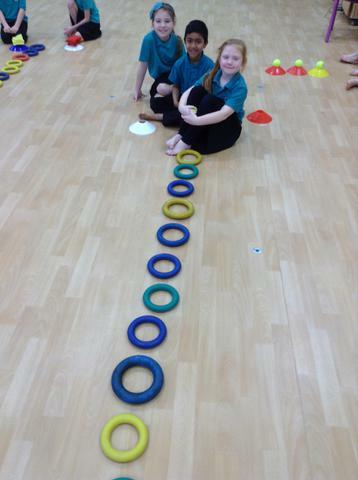 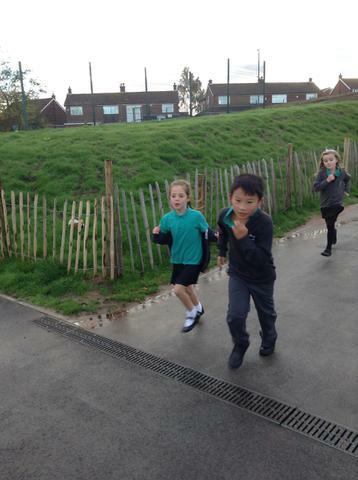 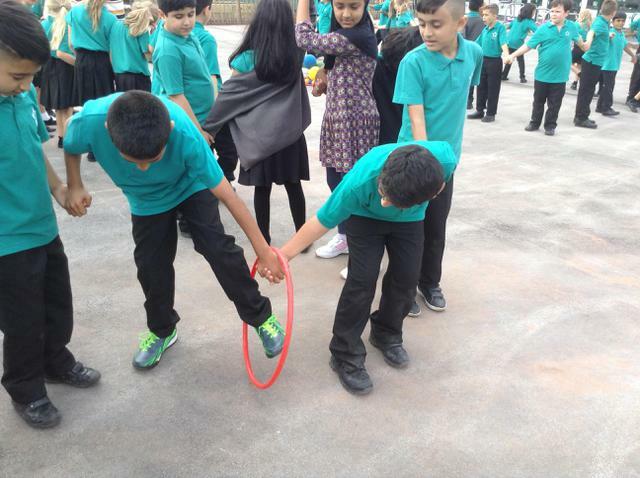 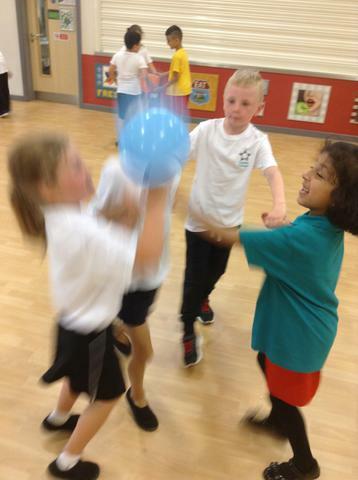 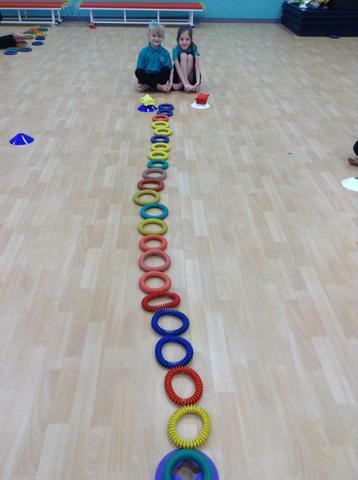 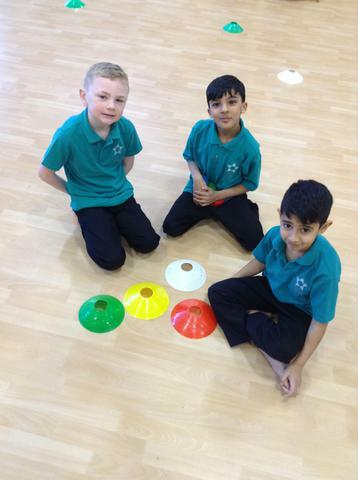 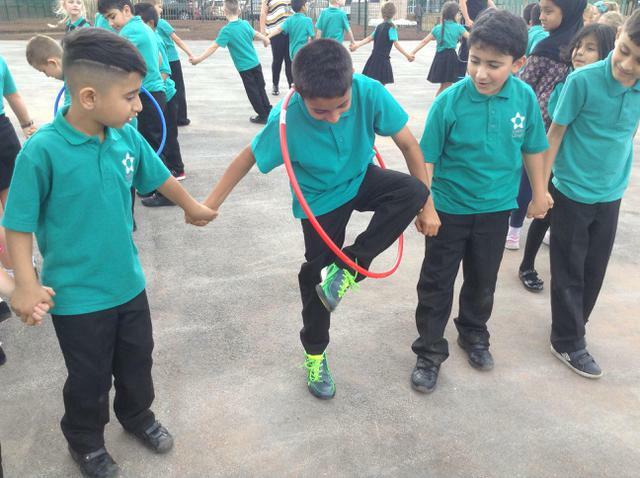 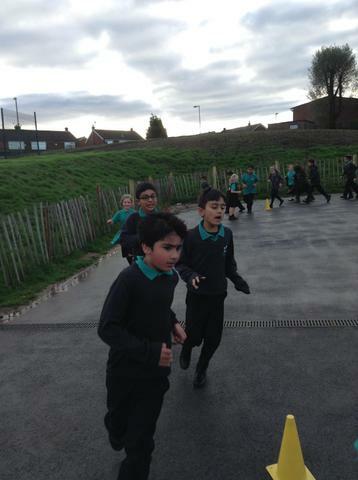 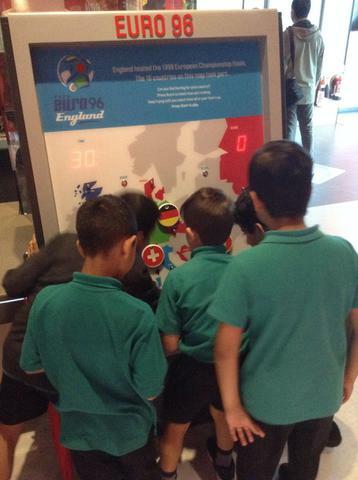 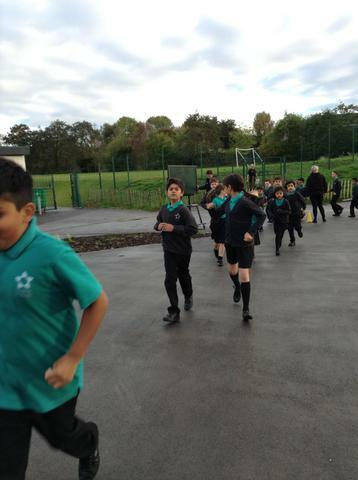 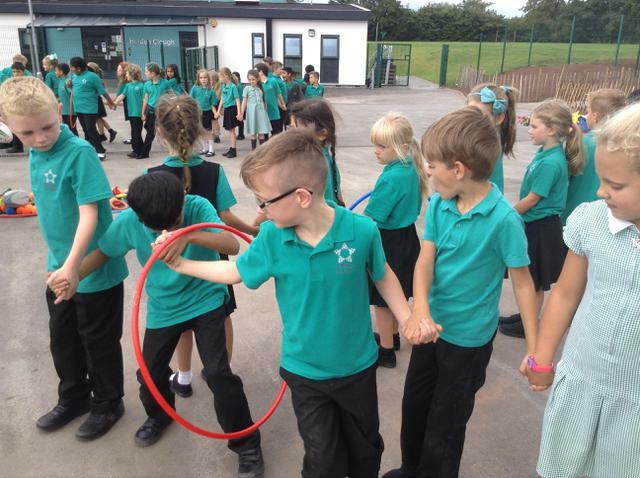 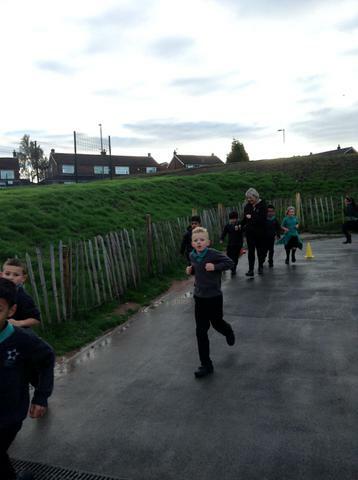 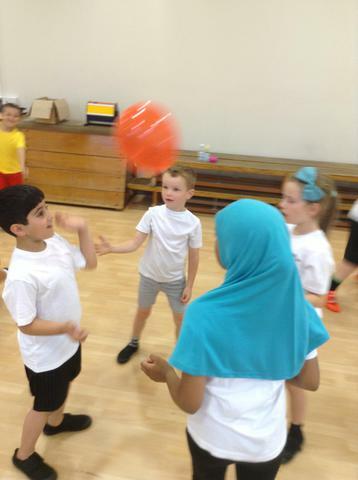 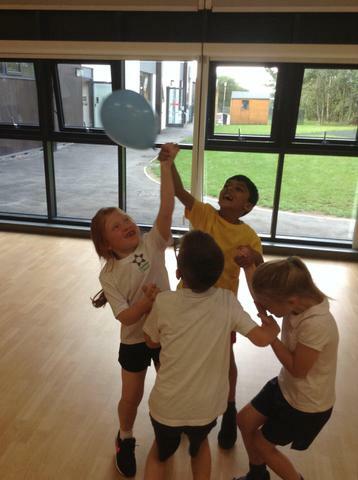 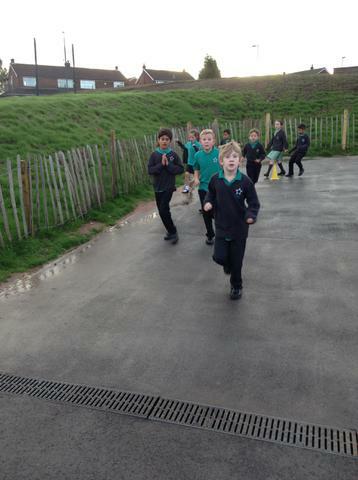 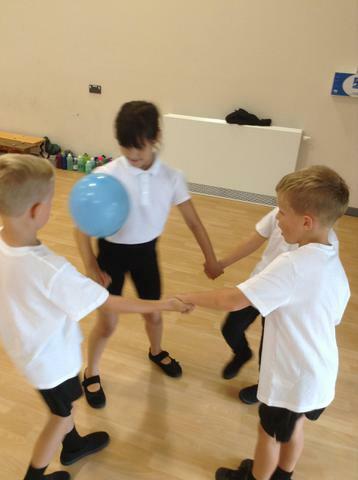 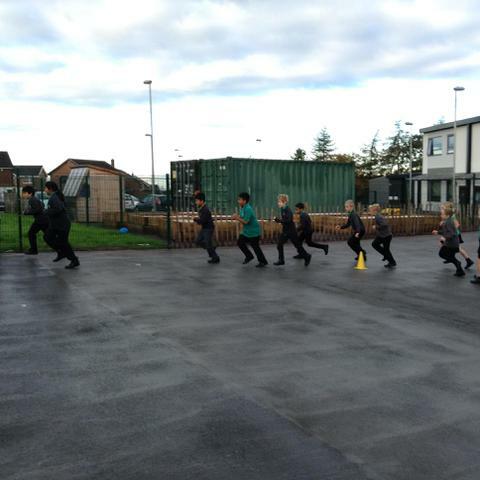 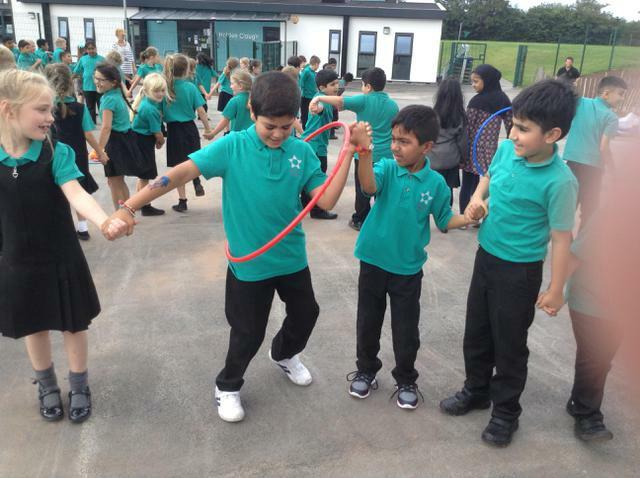 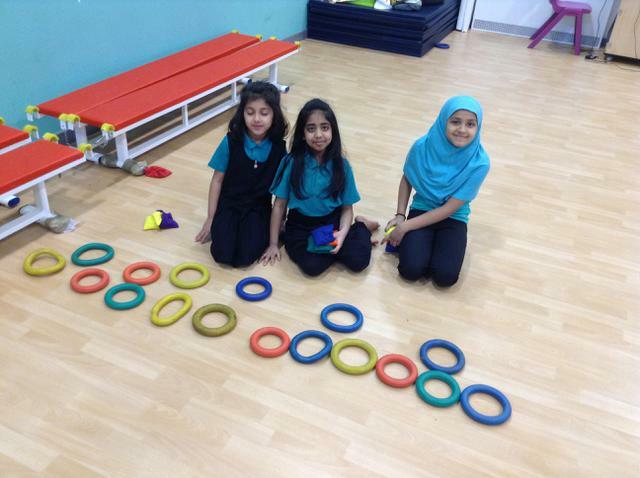 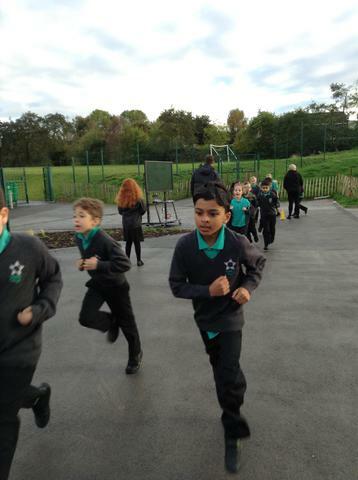 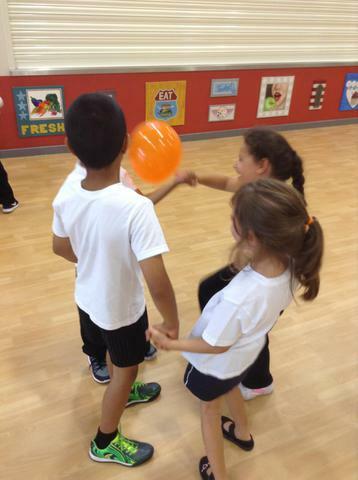 Creating games in PE to practise throwing different pieces of equipment, aiming and point scoring. 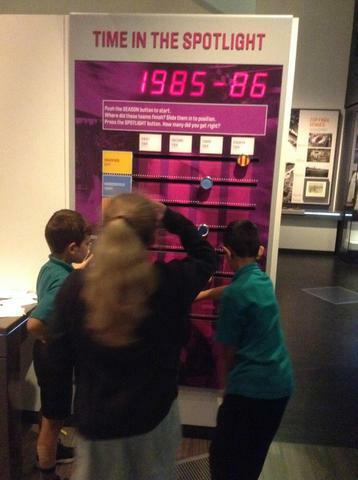 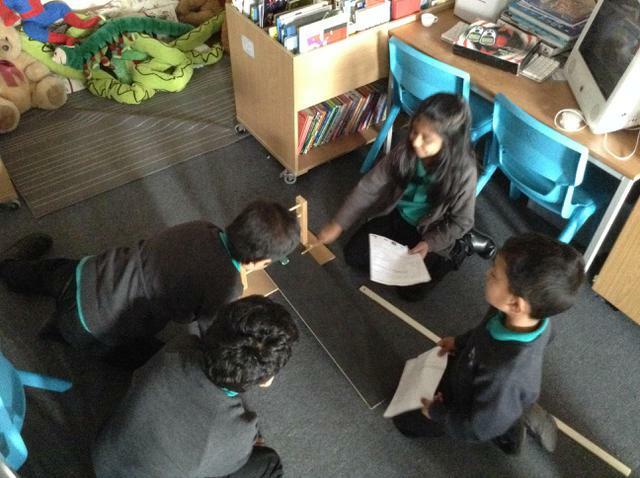 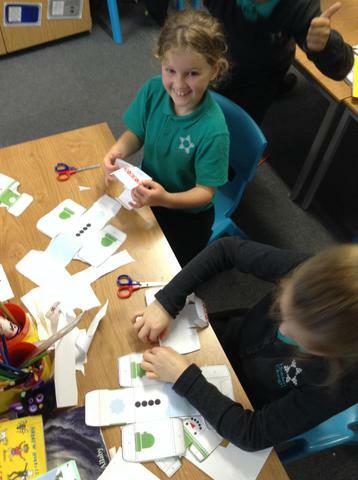 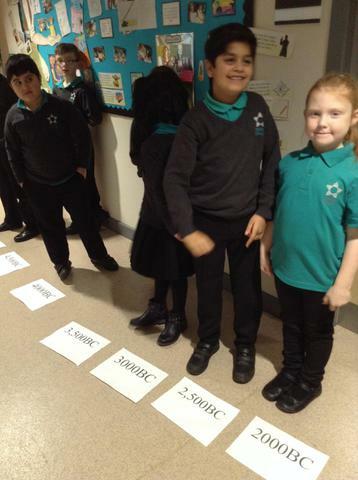 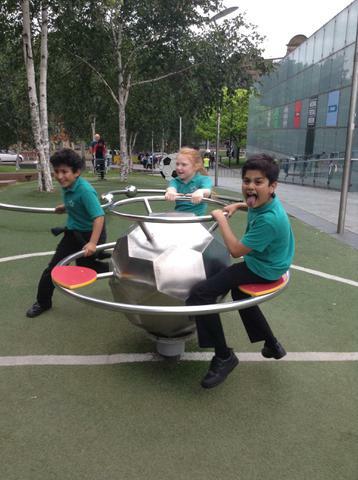 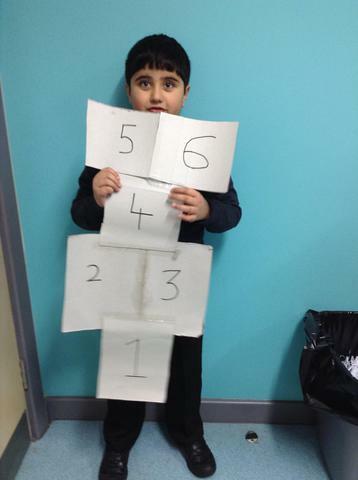 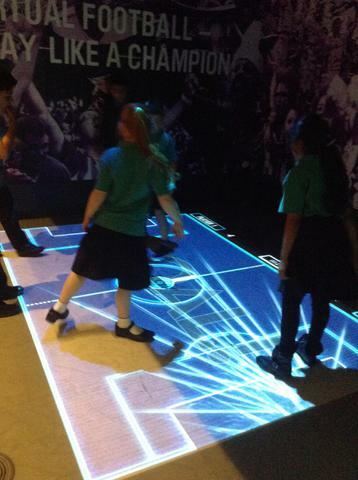 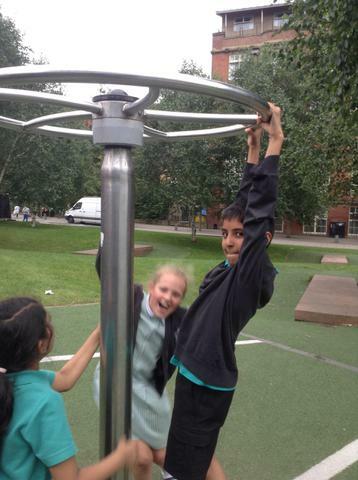 Whoever thought fractions could be so much fun! 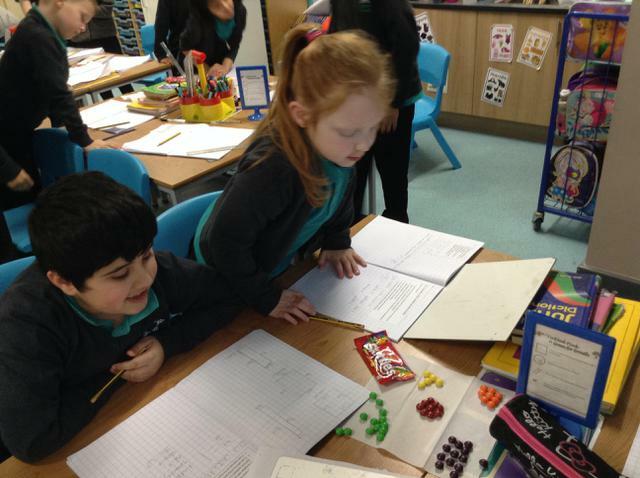 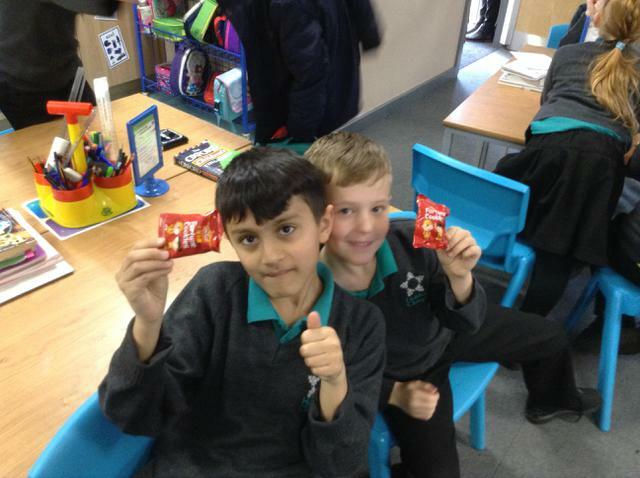 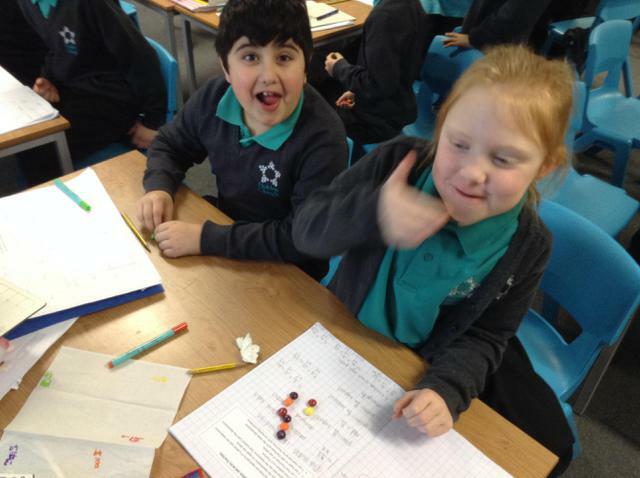 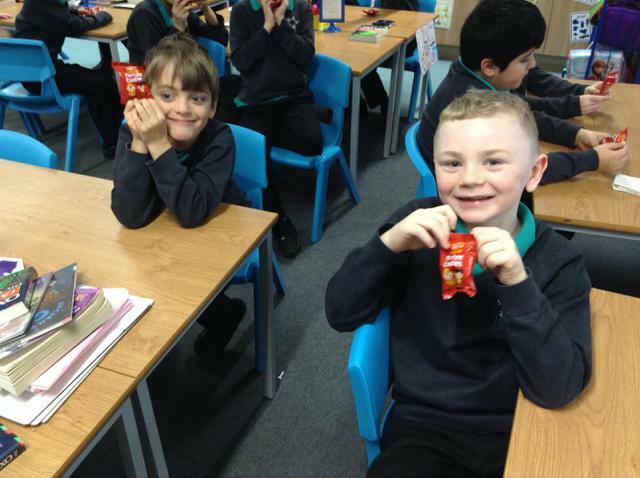 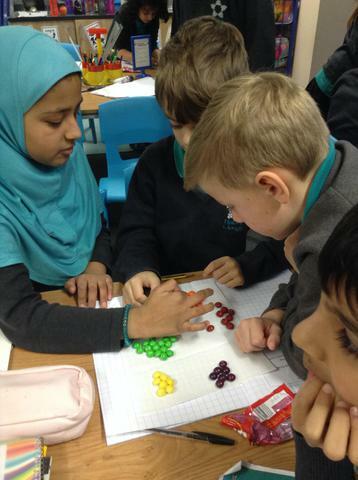 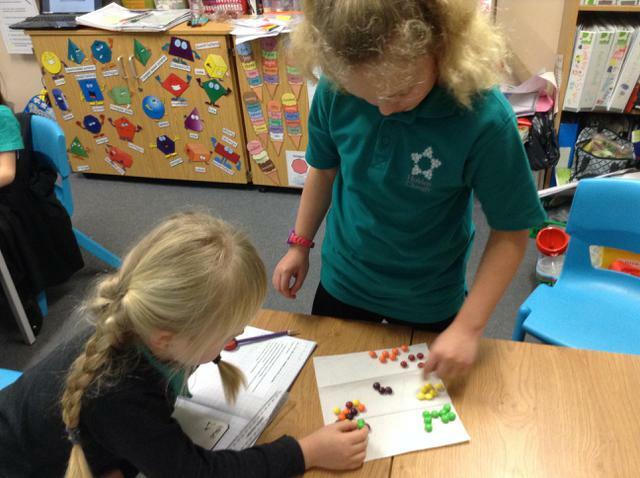 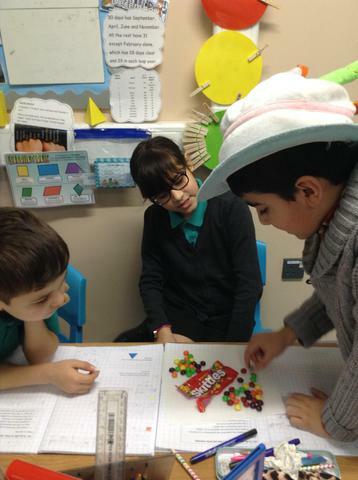 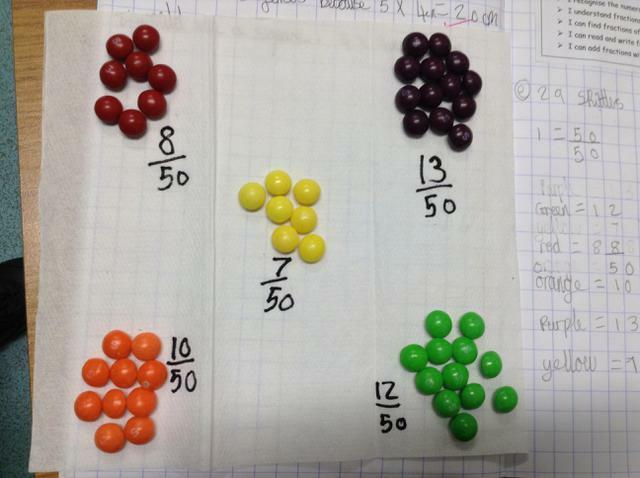 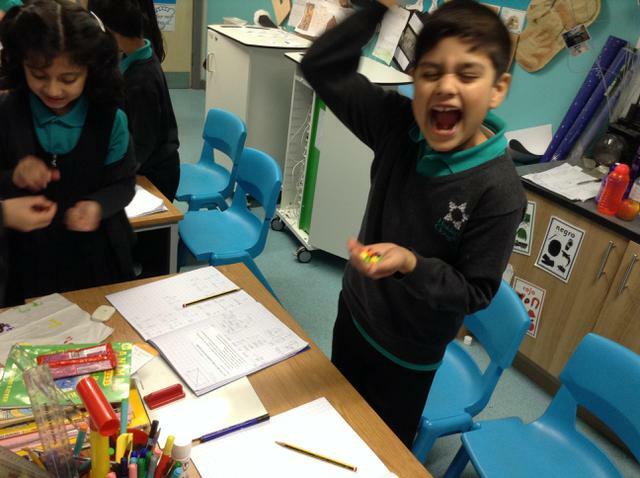 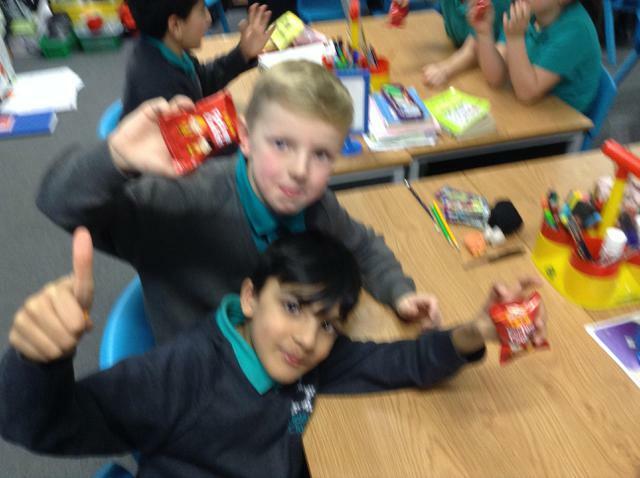 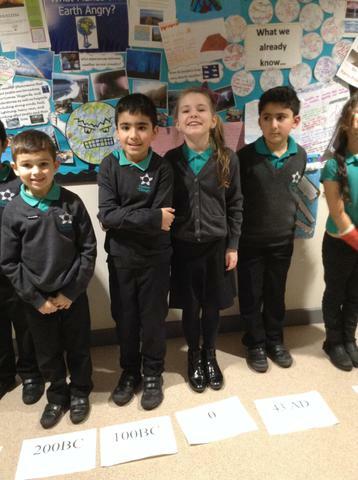 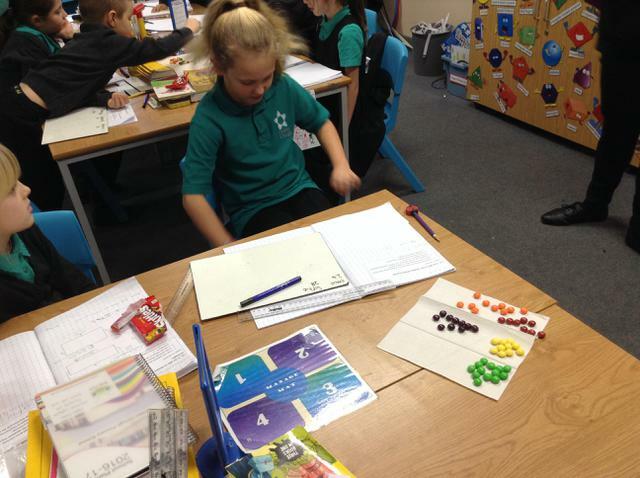 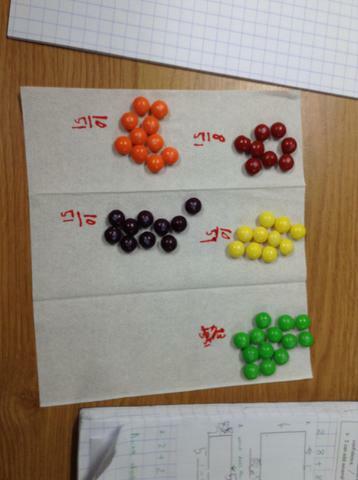 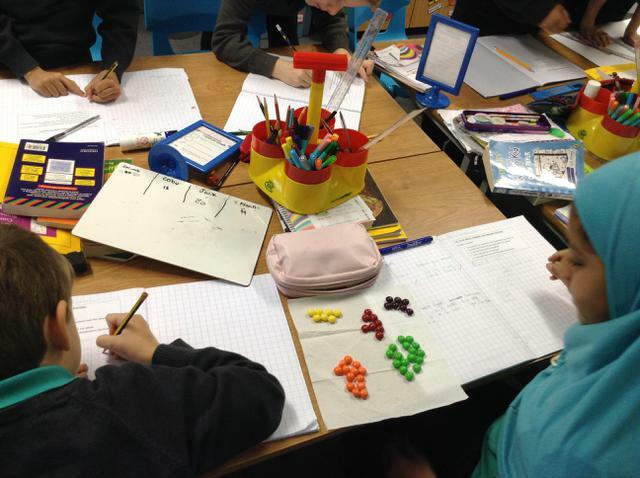 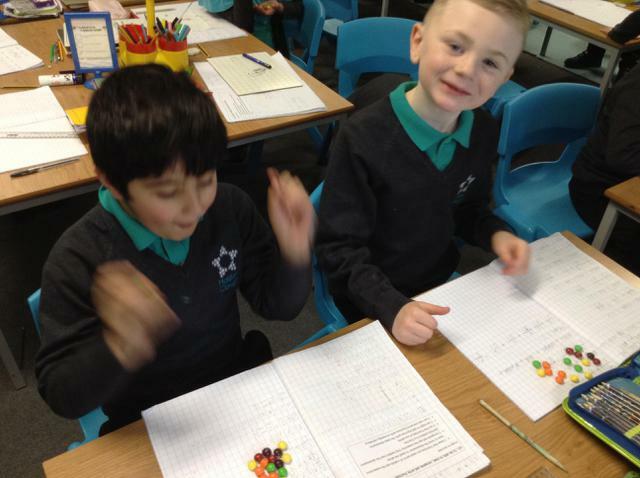 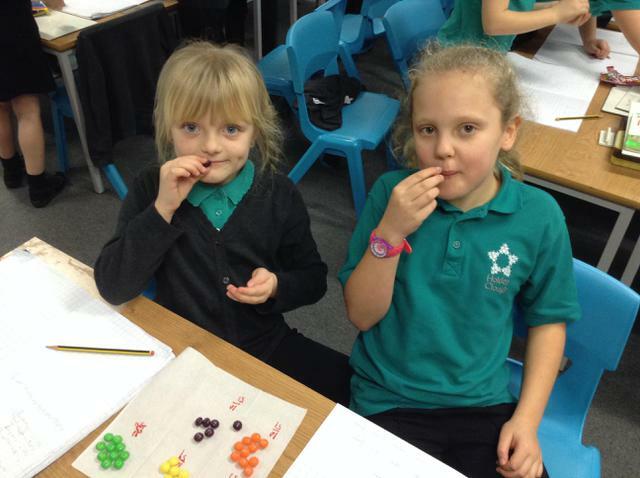 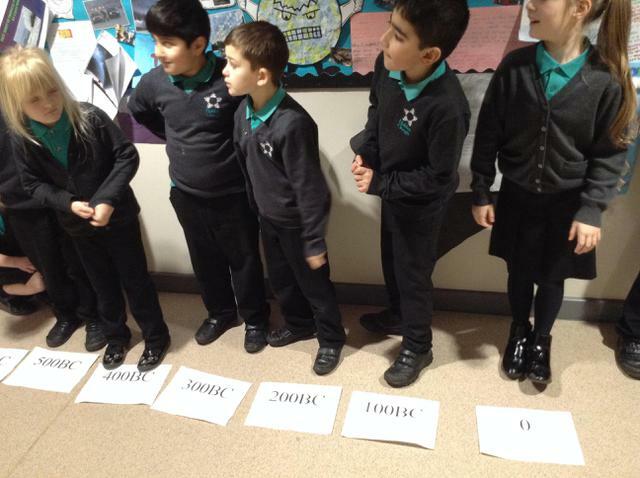 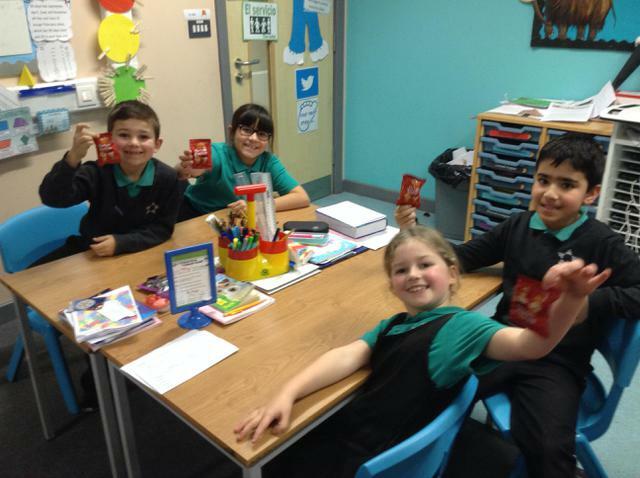 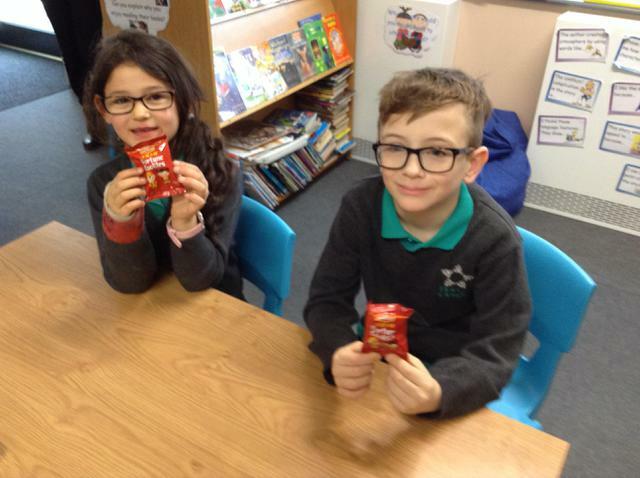 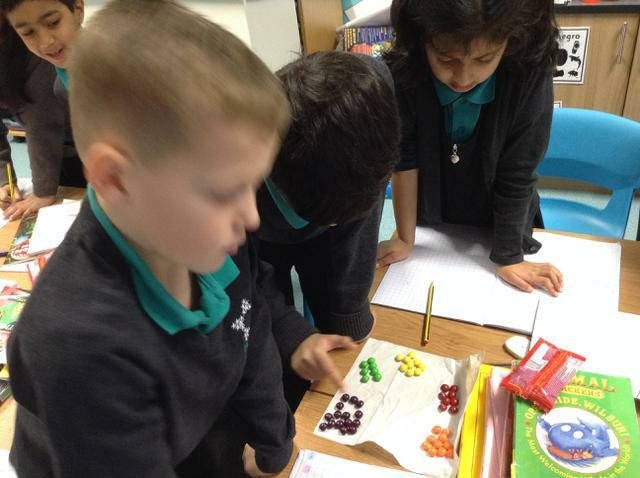 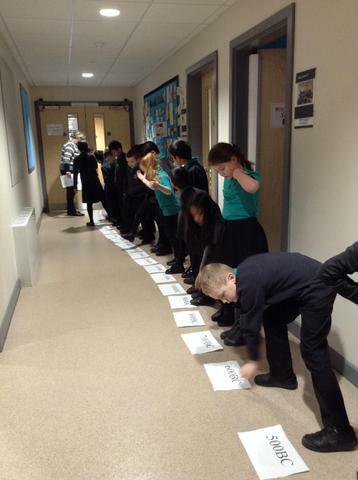 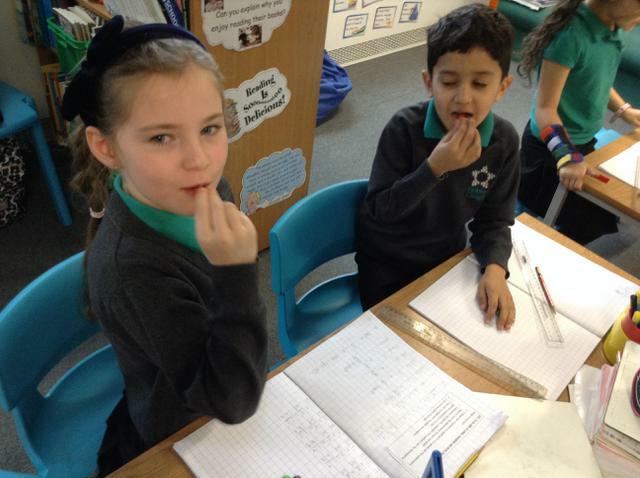 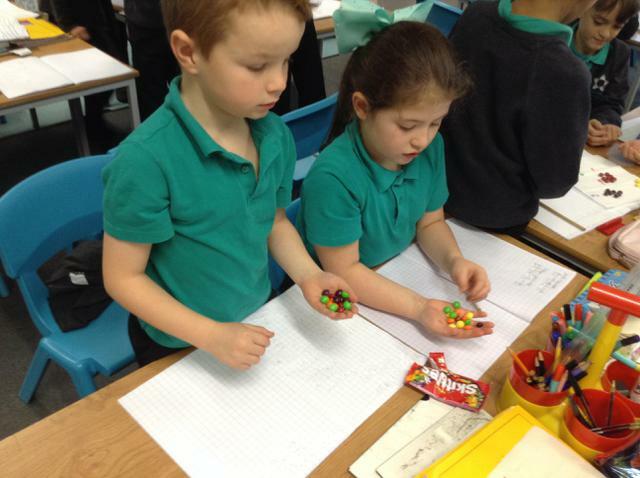 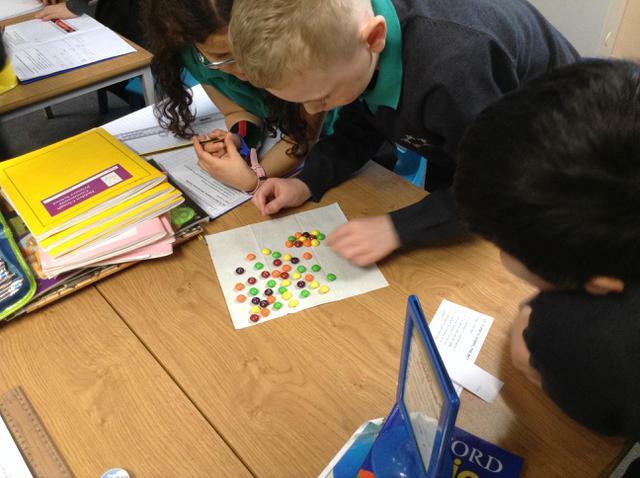 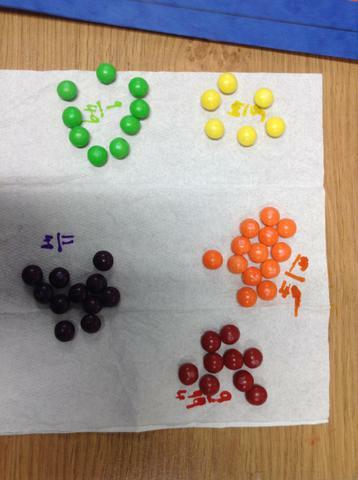 We have been recognising fractions, finding fractions of a whole, writing fractions, comparing fractions, adding fractions and finding fractions of an amount in order to share our Skittles out before eating them!! 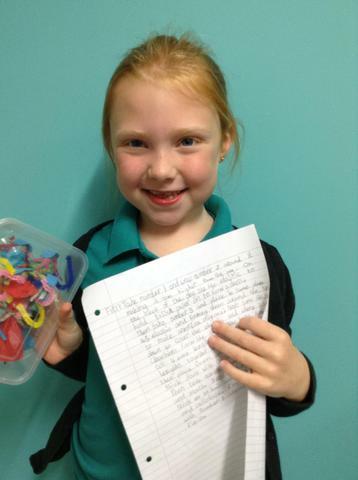 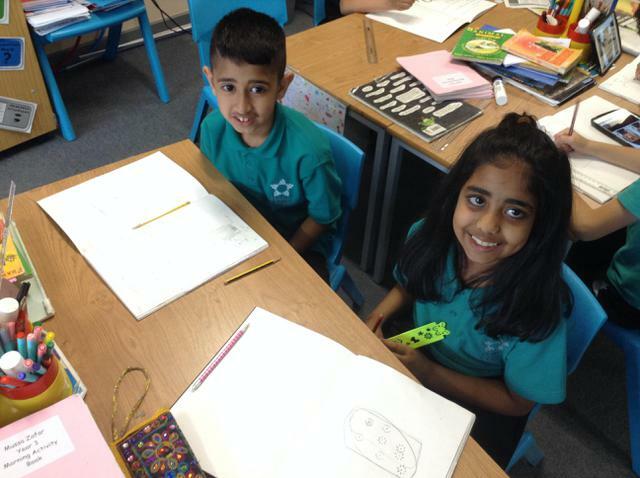 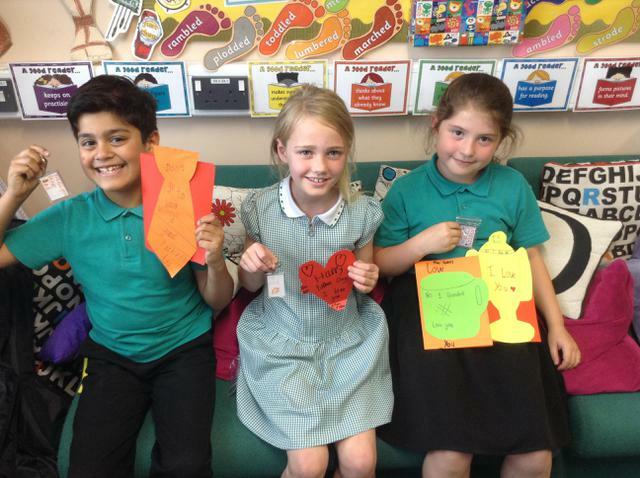 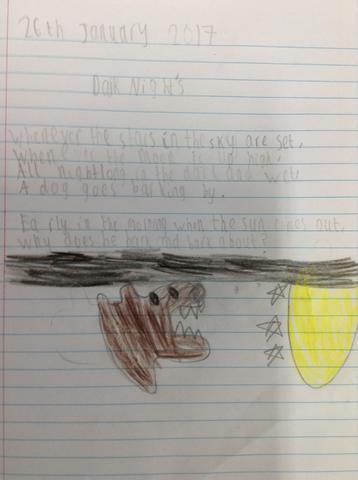 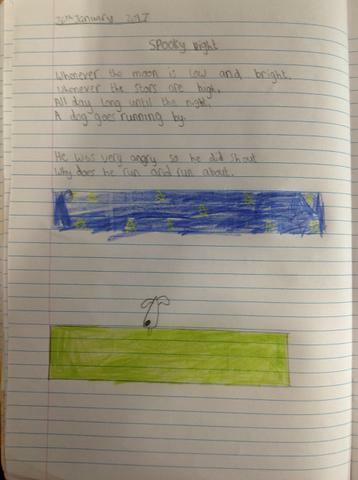 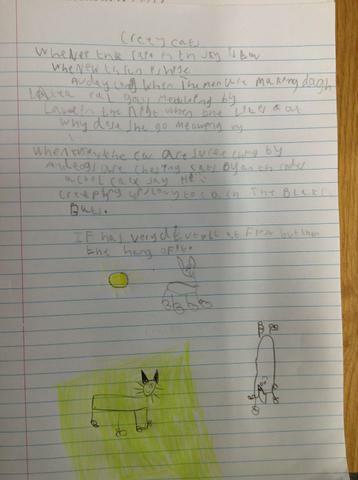 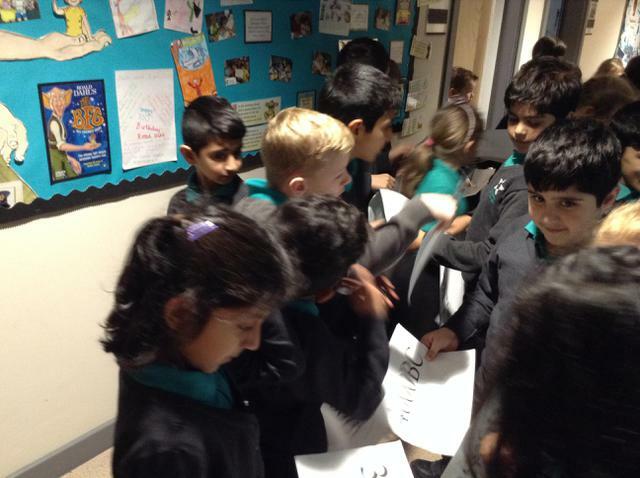 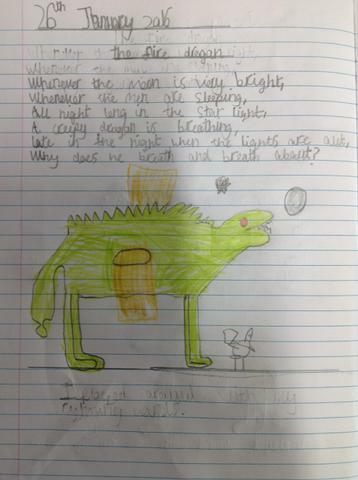 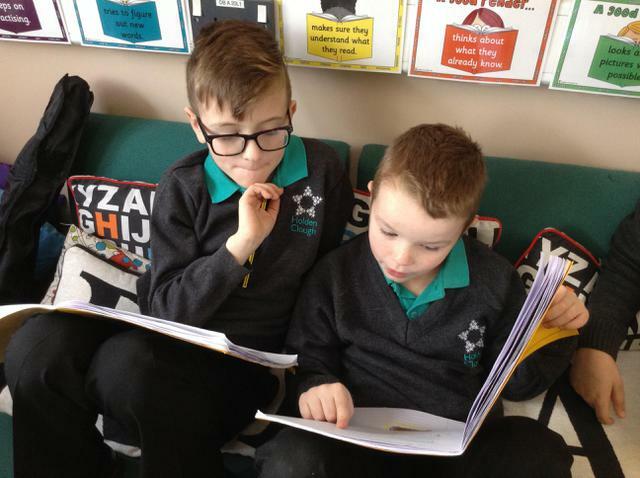 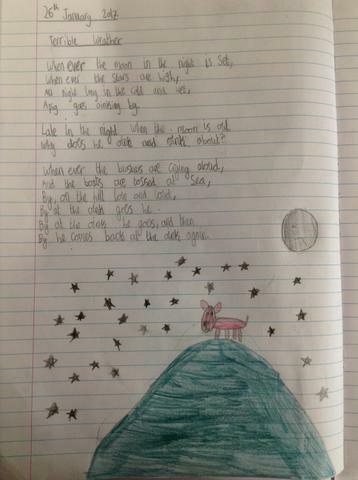 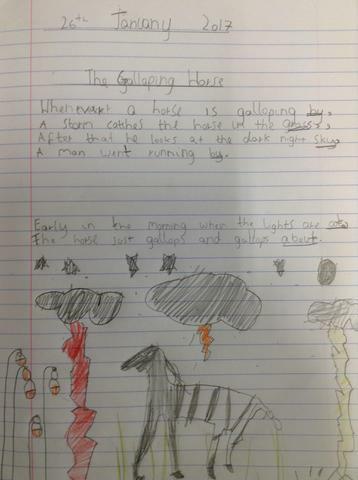 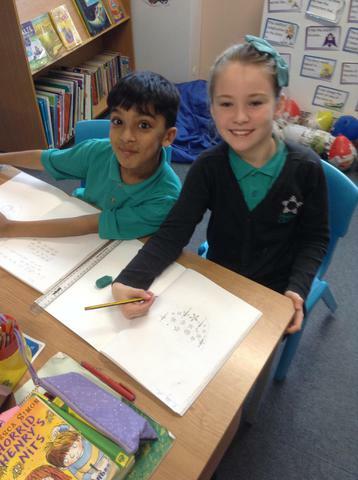 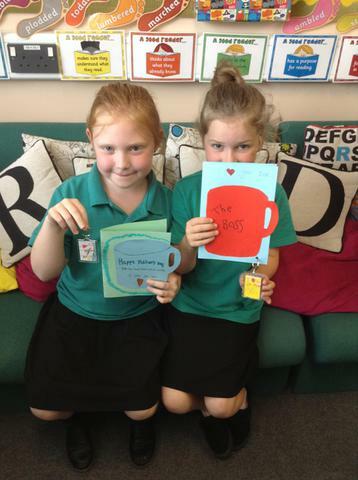 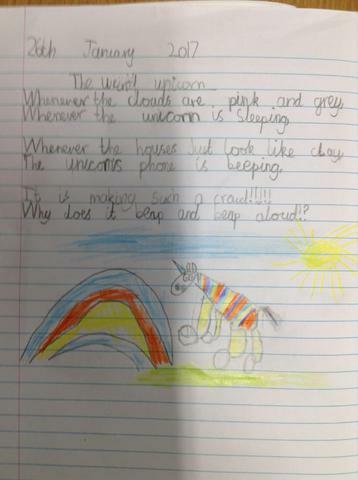 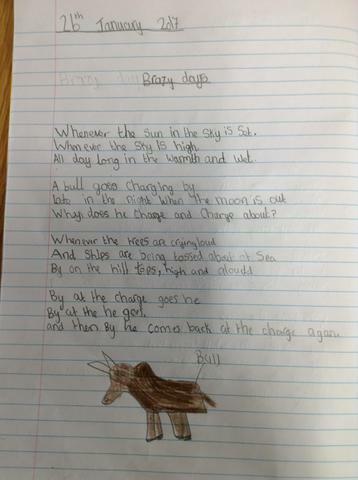 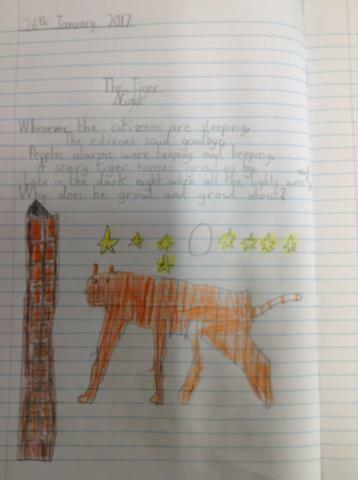 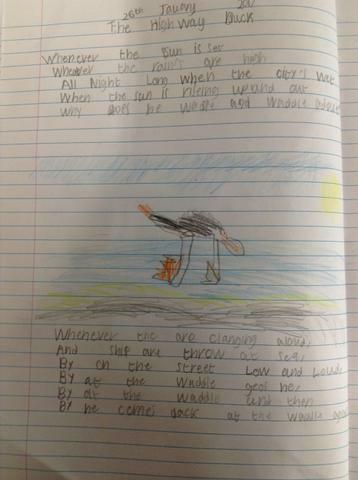 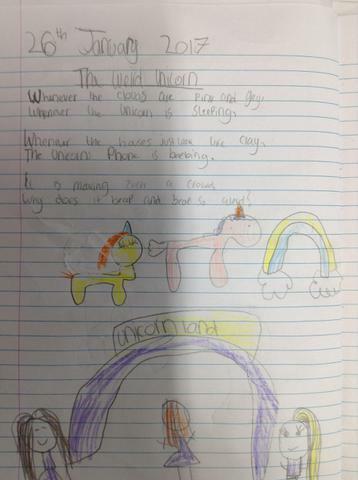 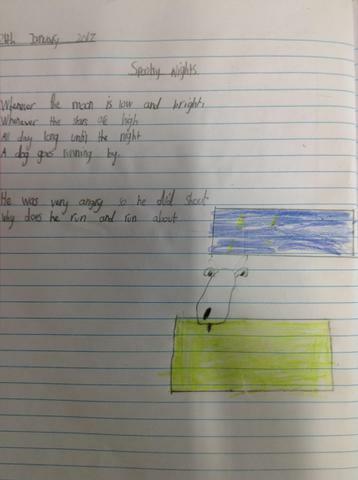 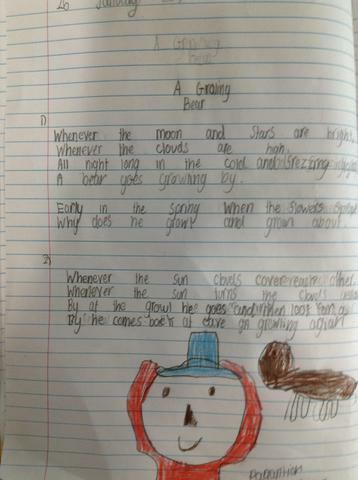 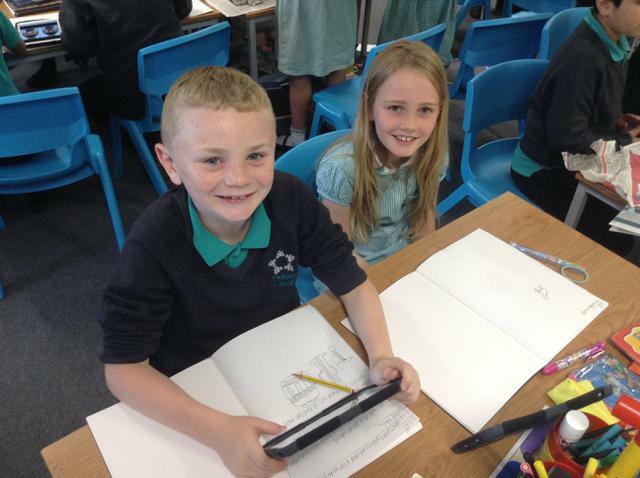 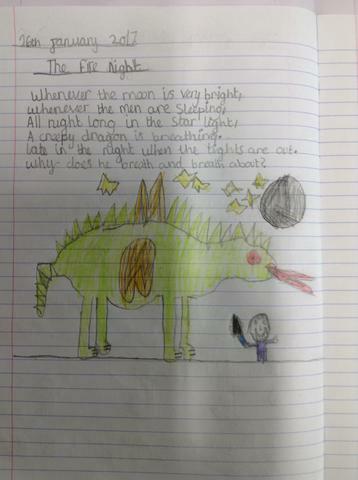 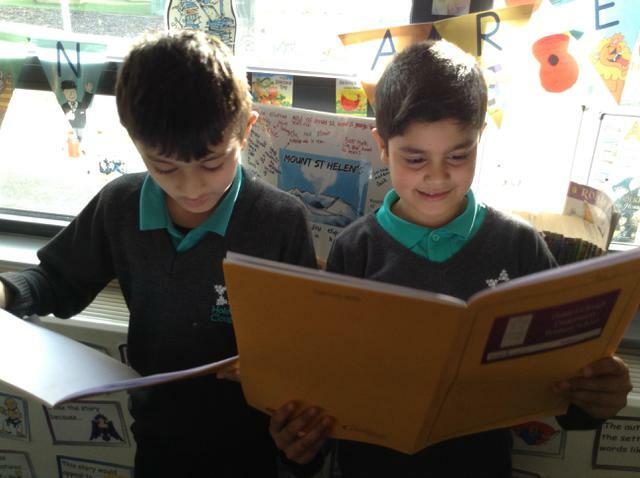 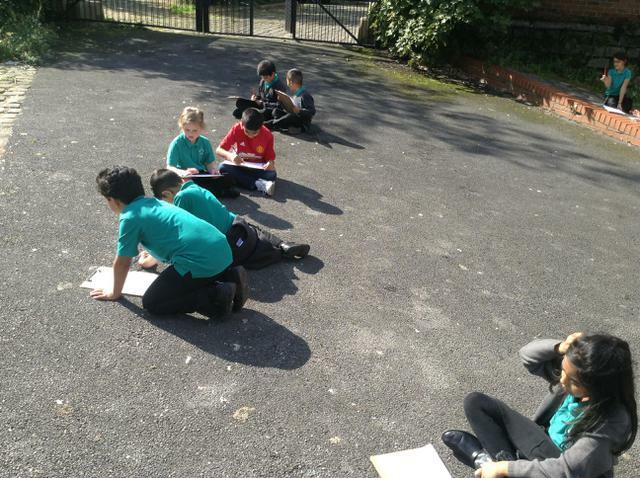 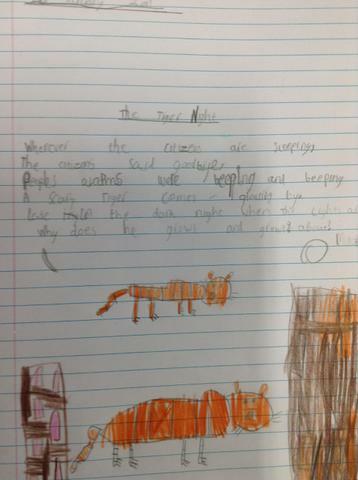 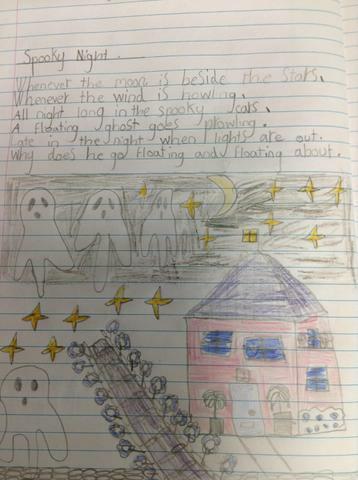 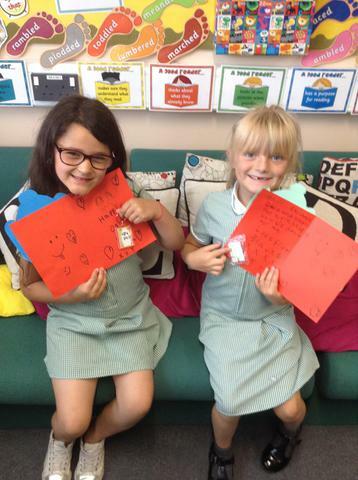 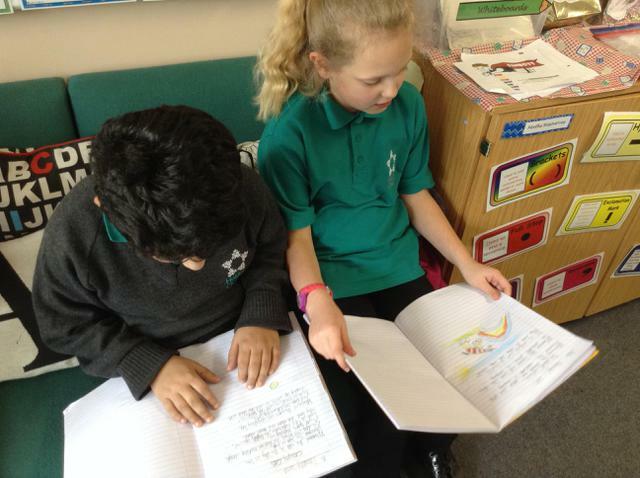 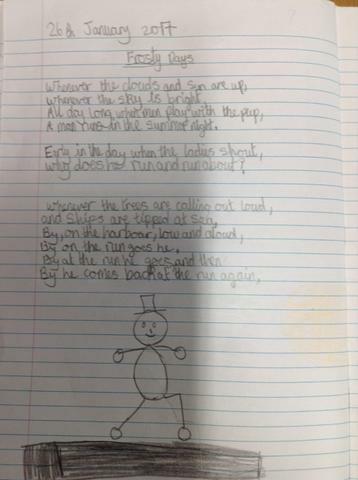 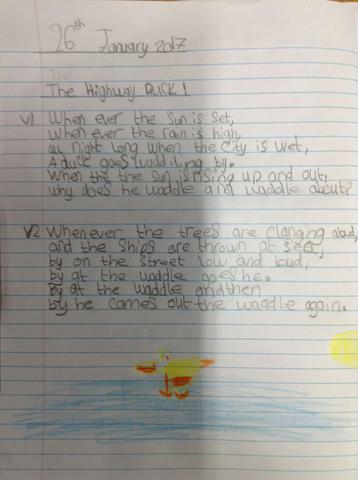 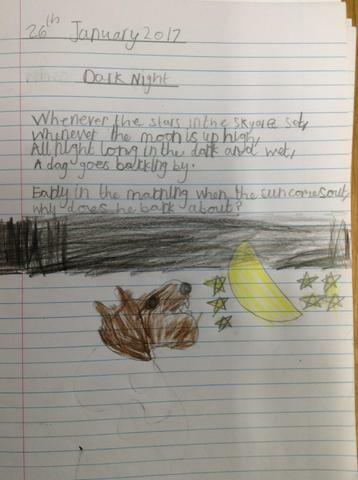 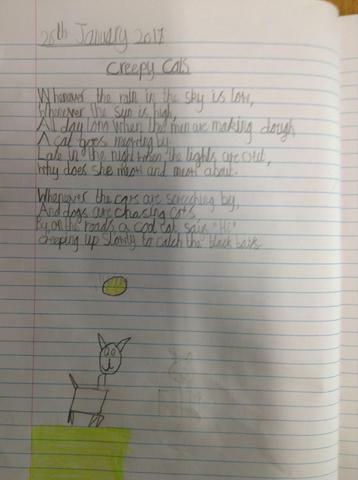 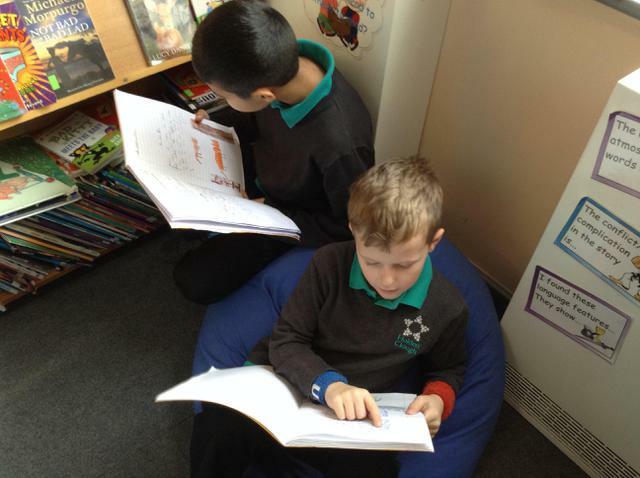 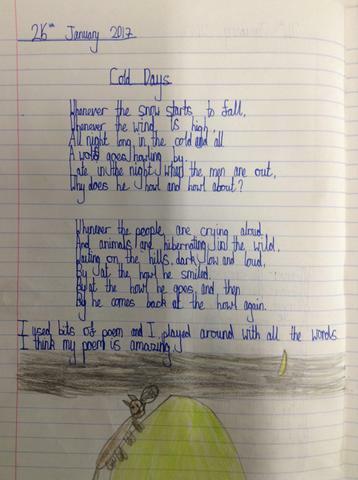 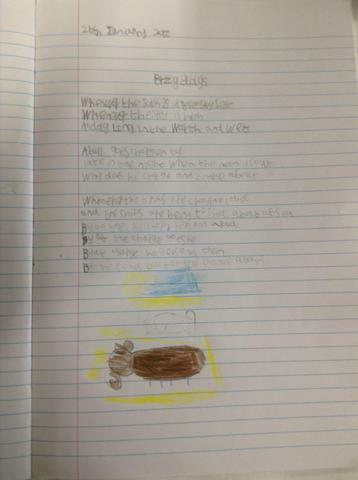 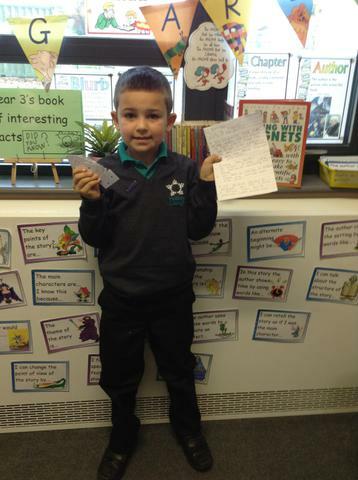 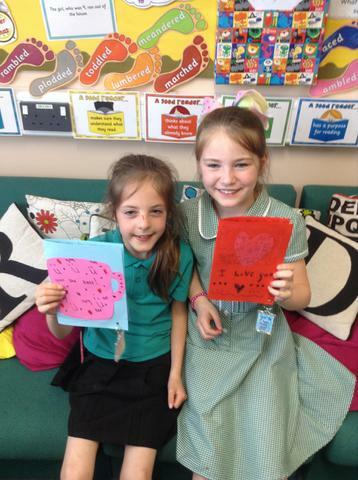 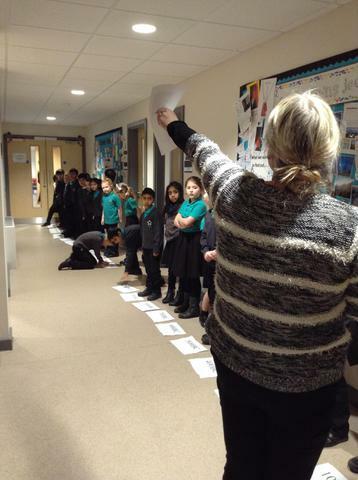 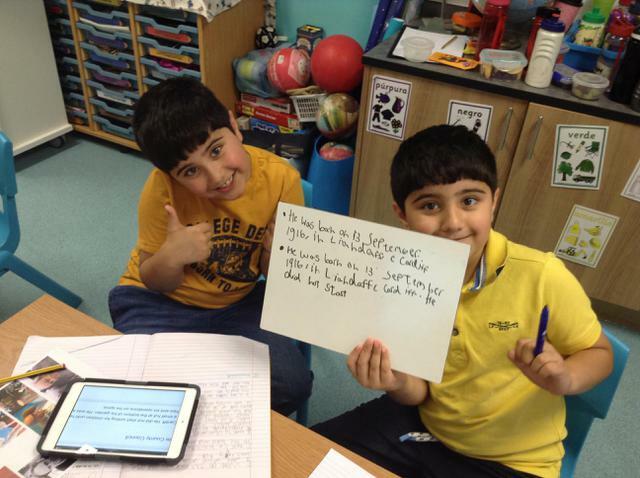 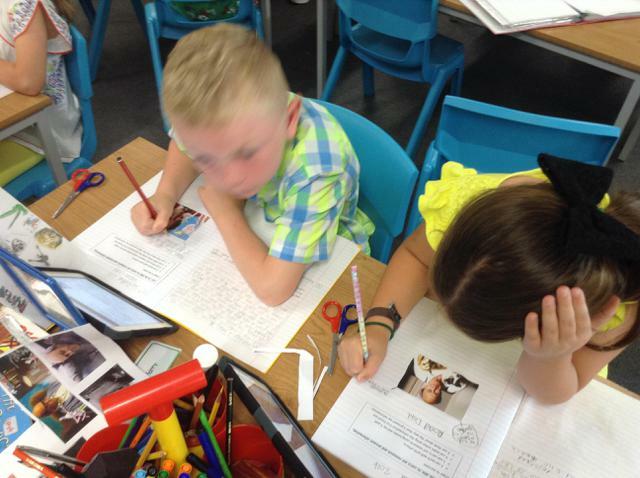 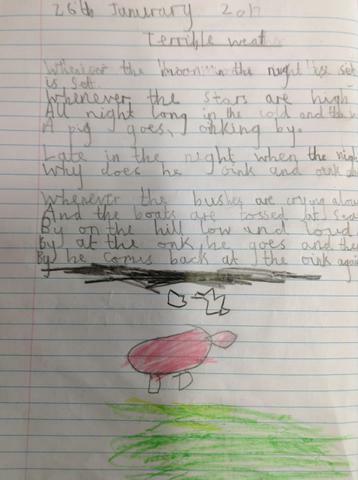 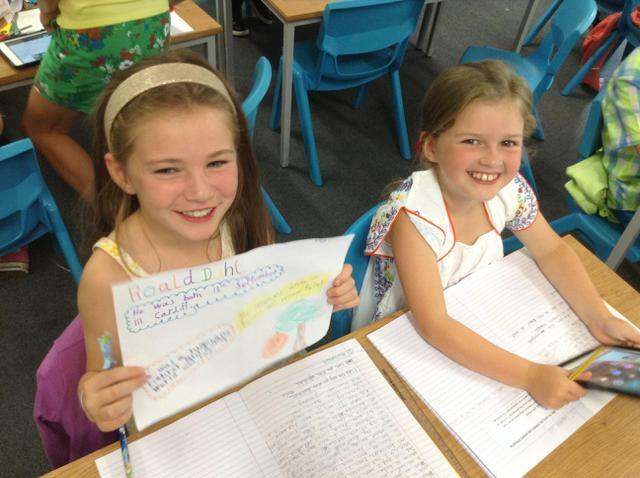 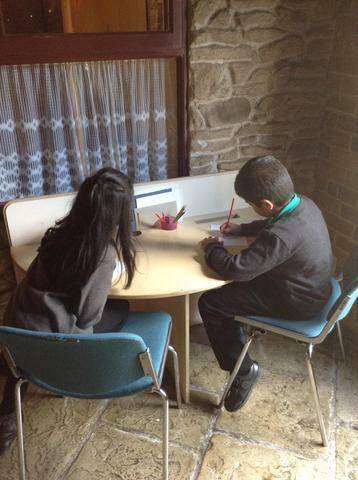 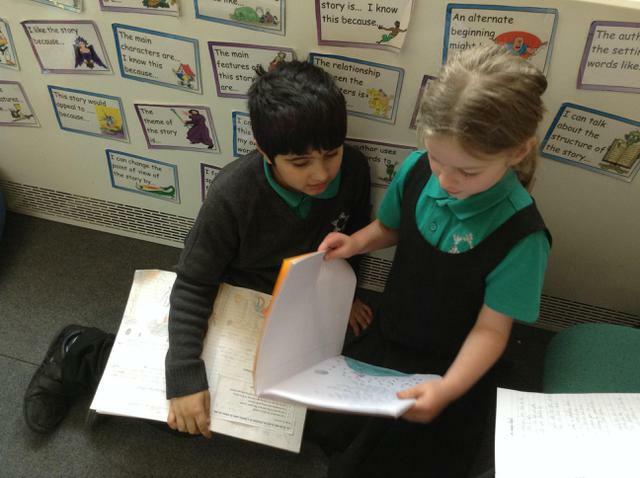 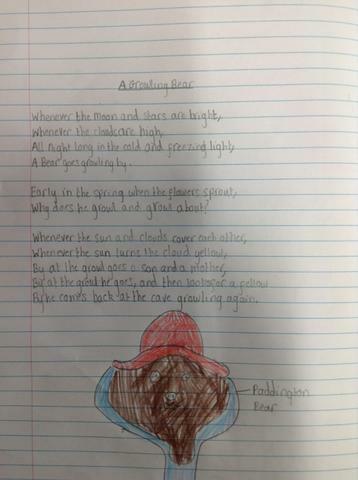 We enjoyed writing and sharing our poems based on the work of Robert Louis Stevenson. 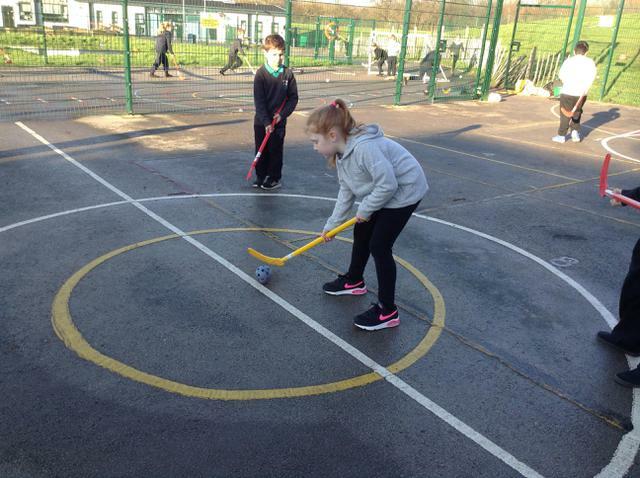 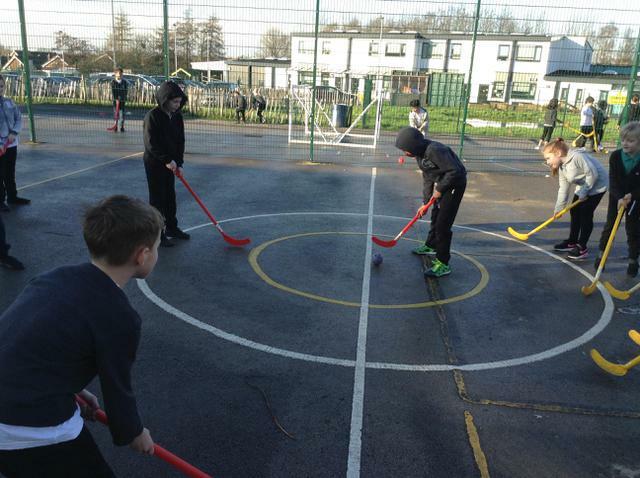 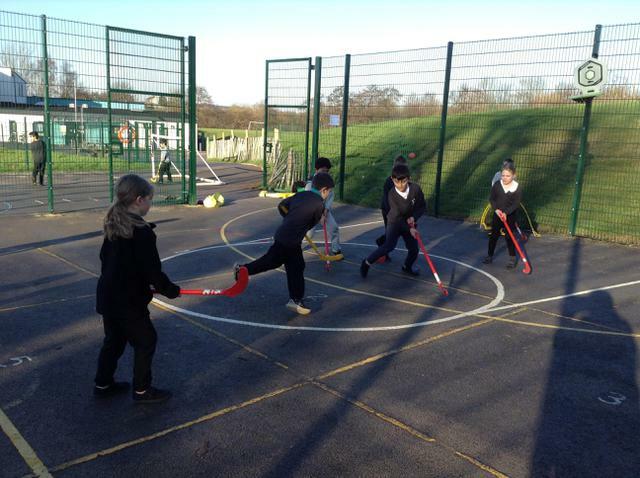 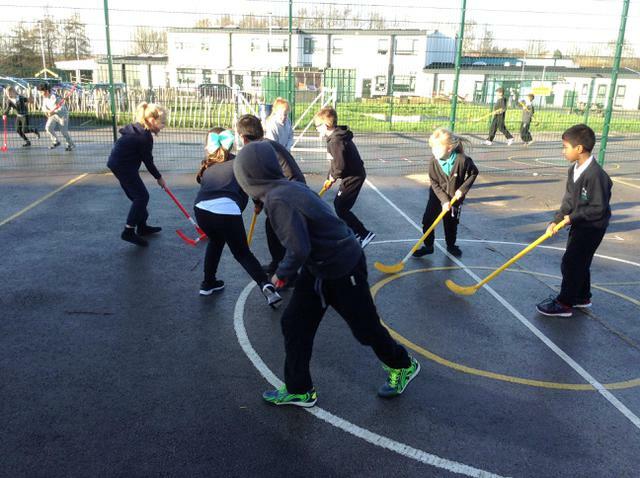 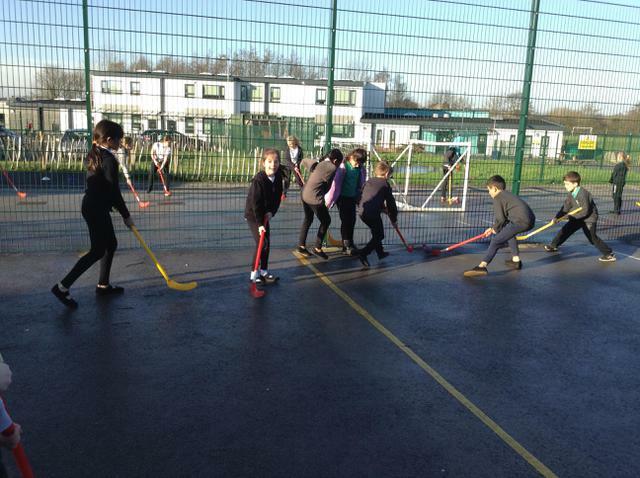 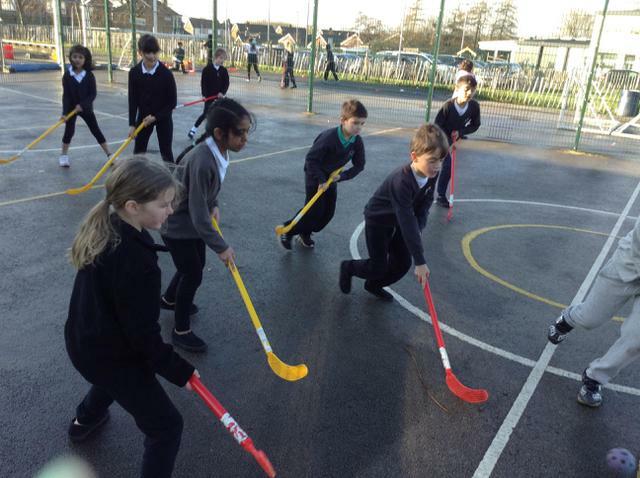 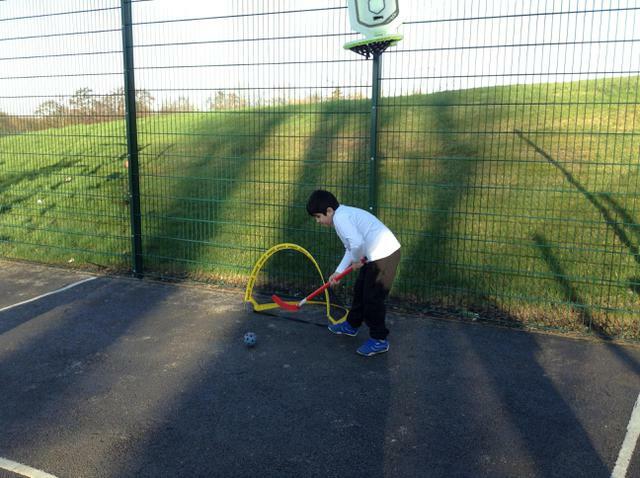 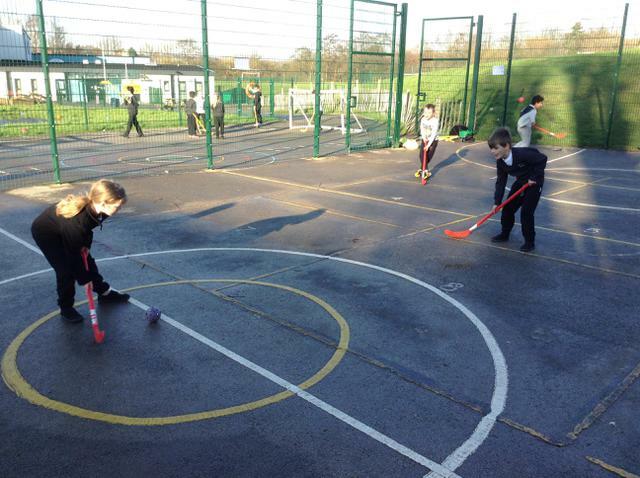 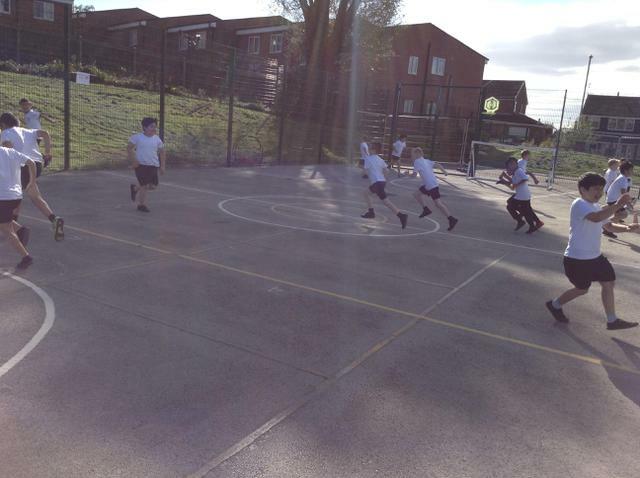 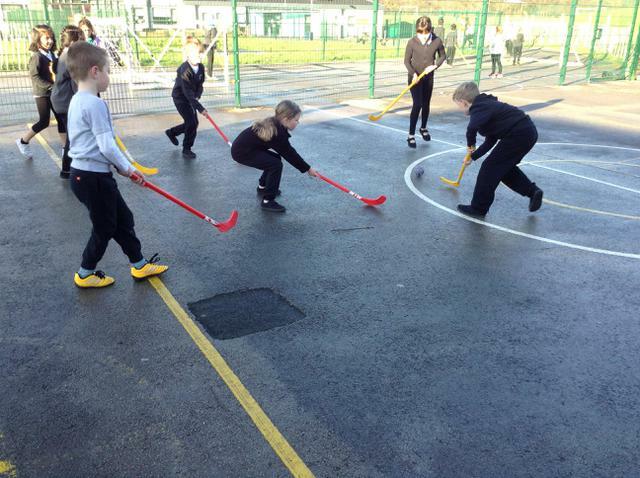 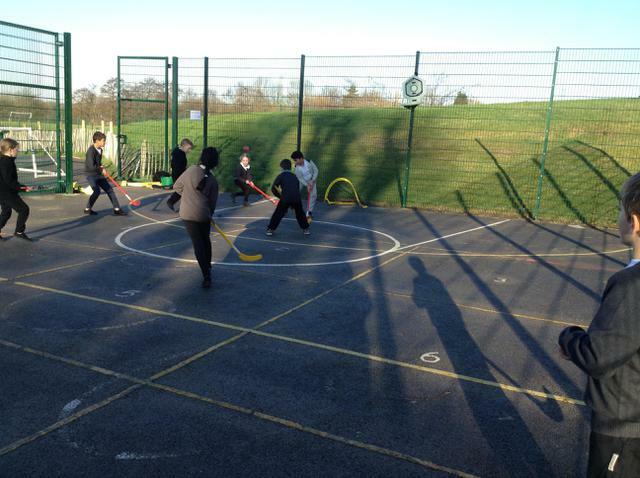 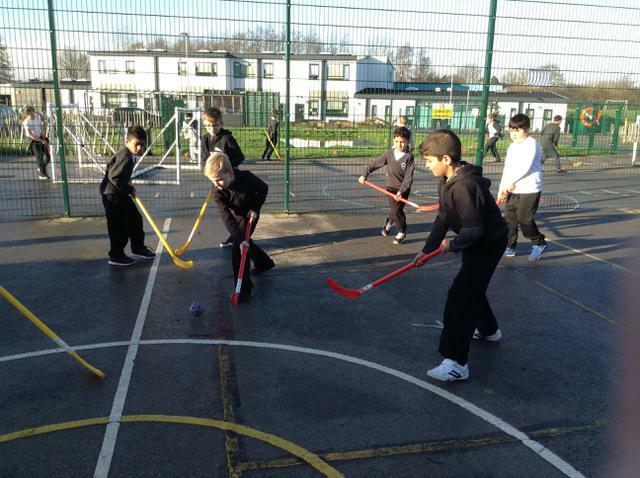 Enjoying a game of hockey in the Winter sun. 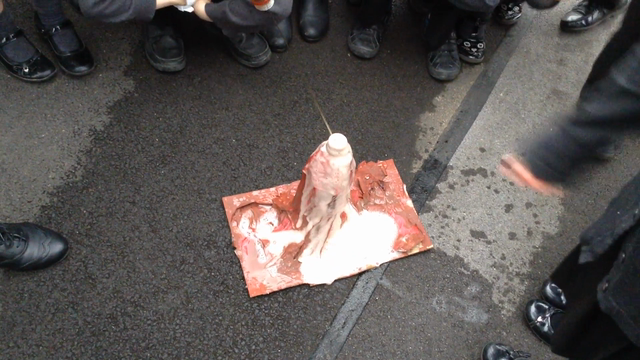 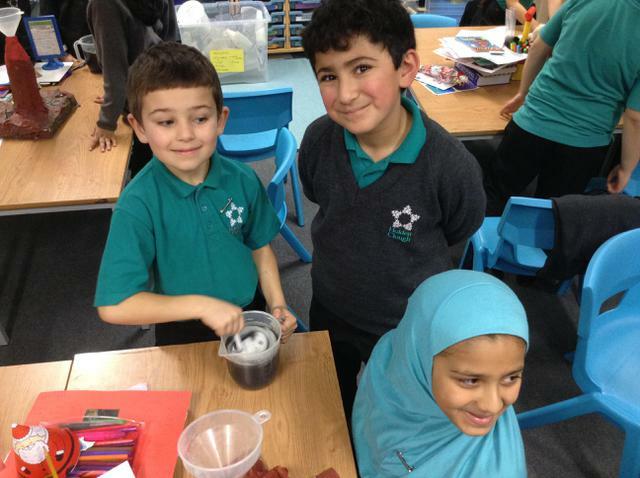 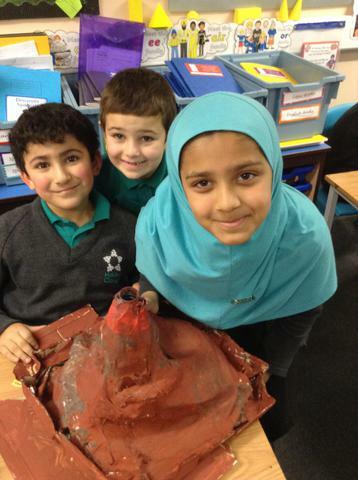 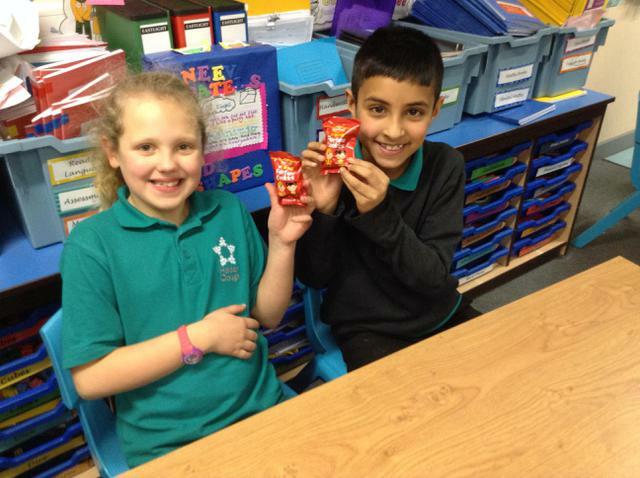 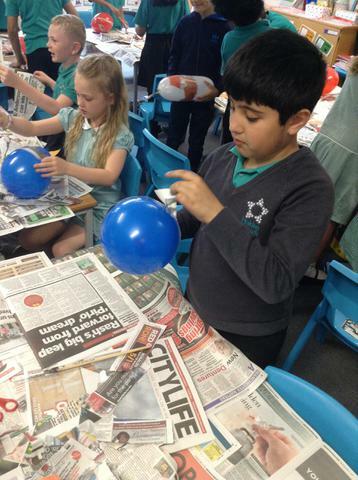 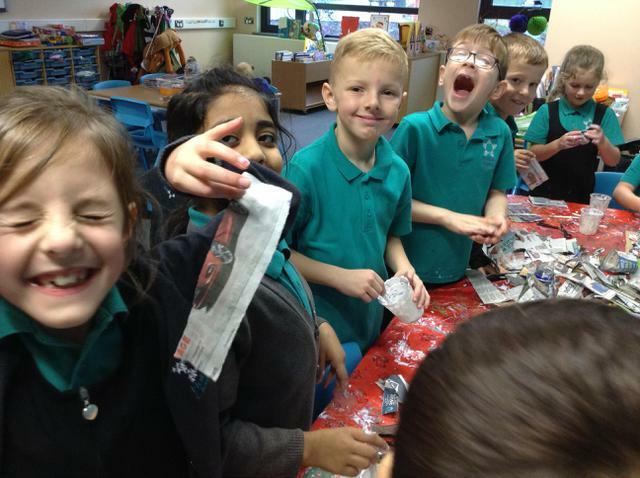 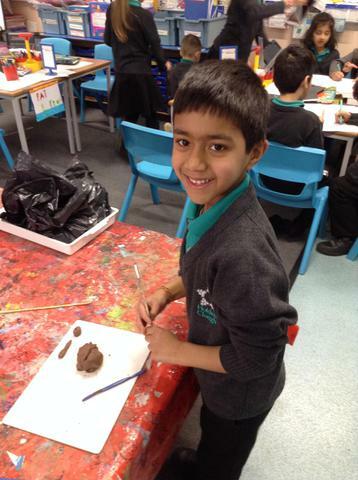 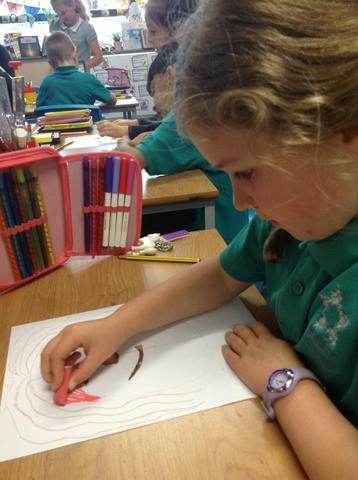 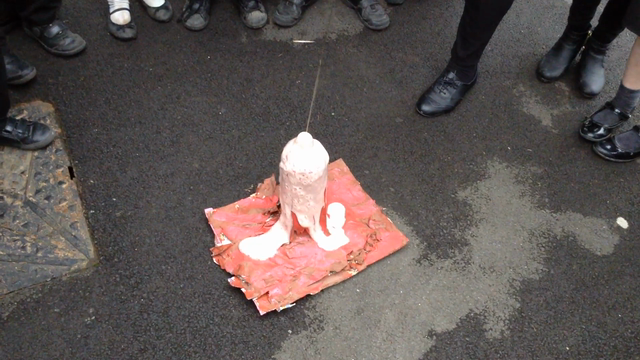 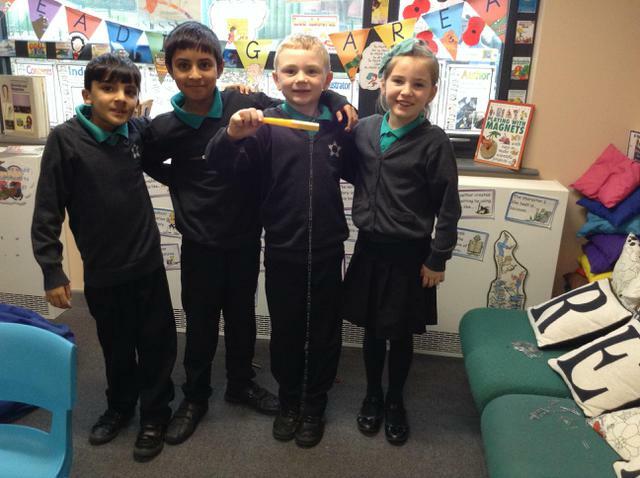 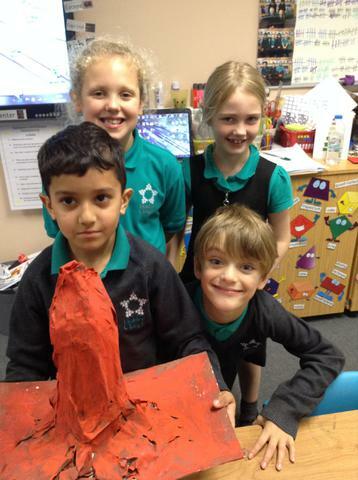 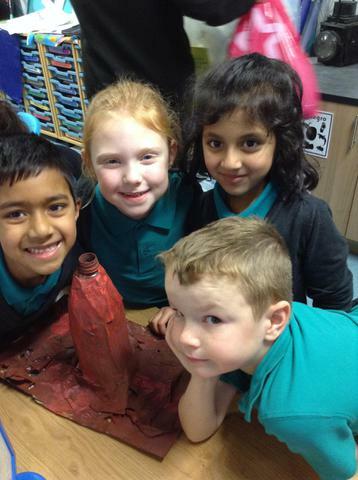 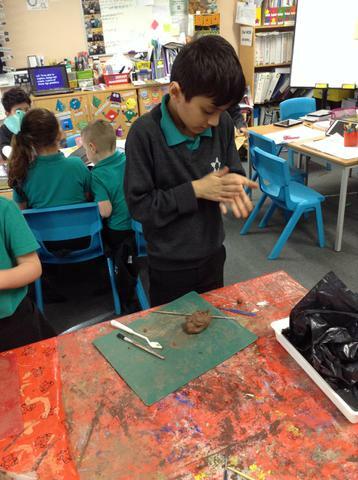 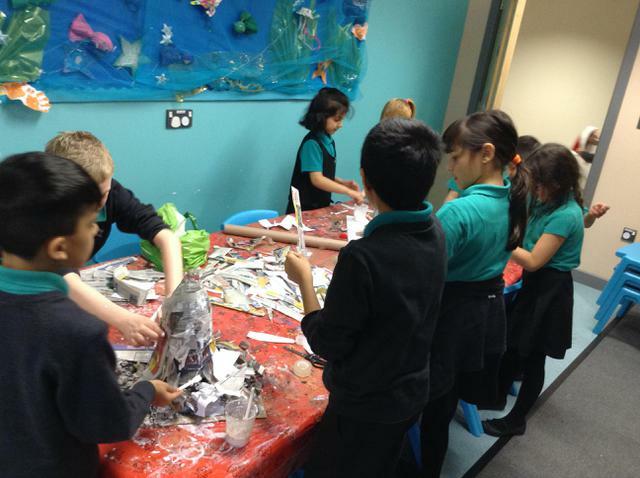 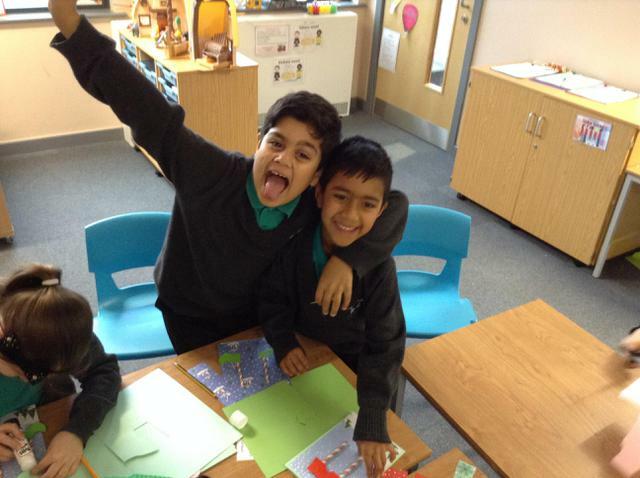 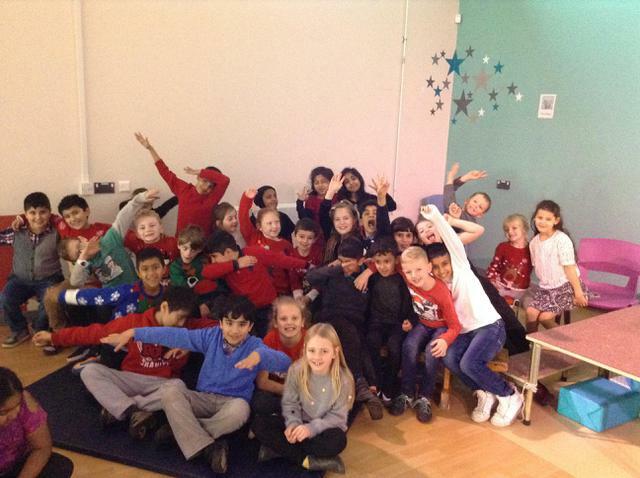 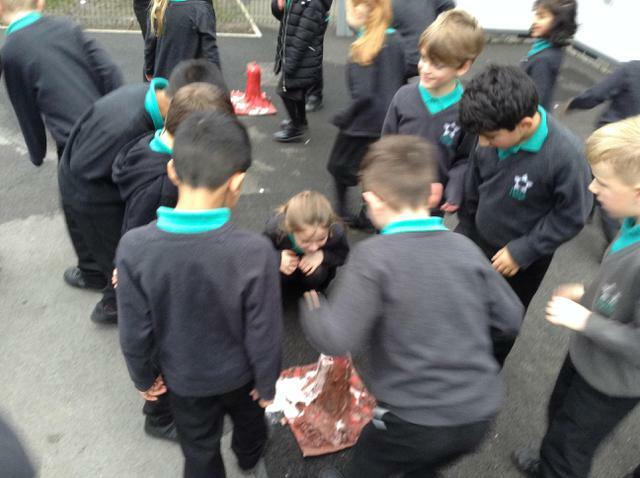 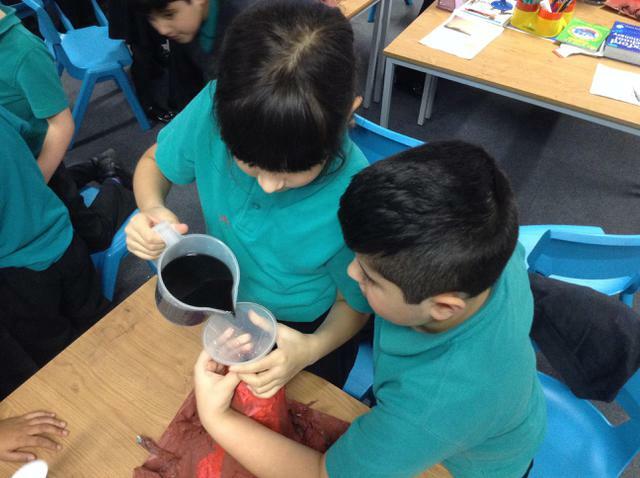 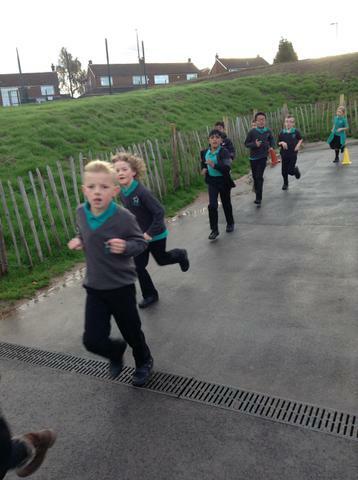 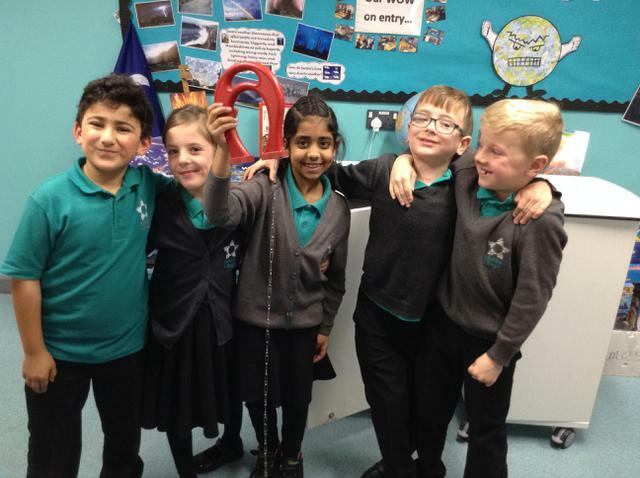 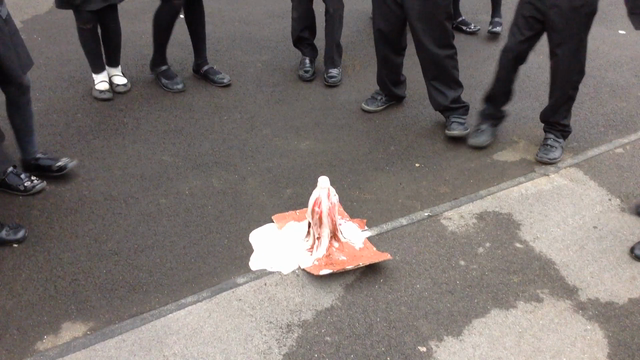 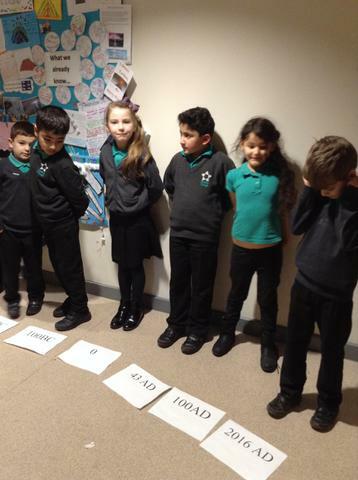 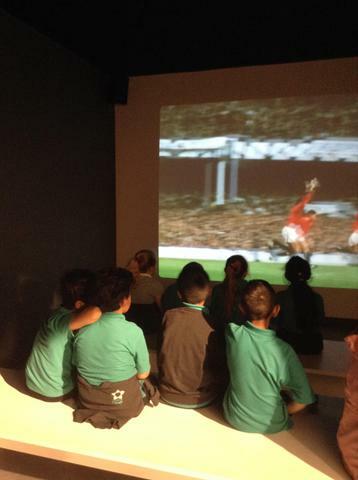 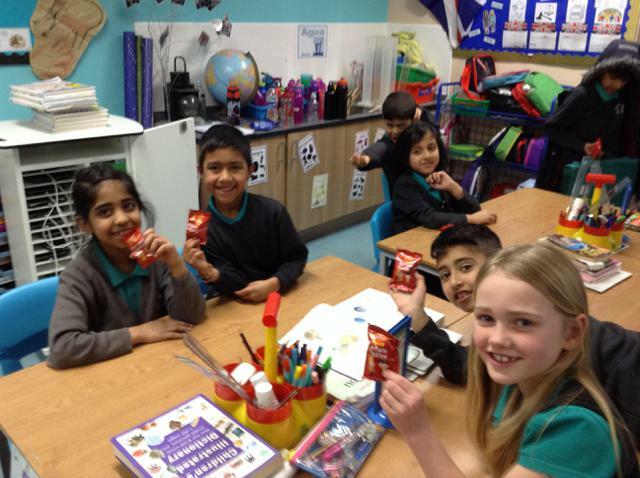 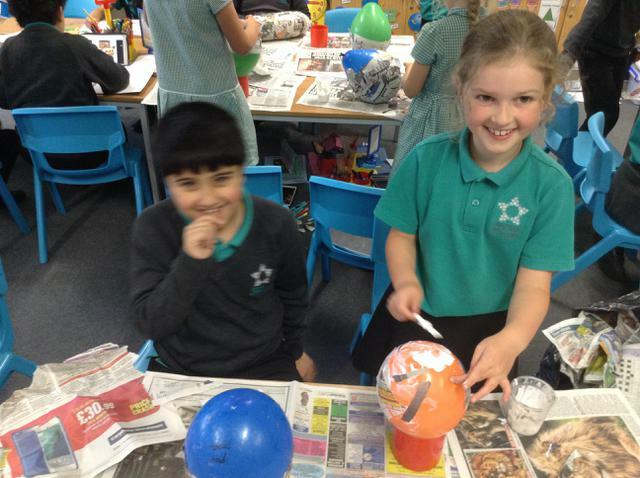 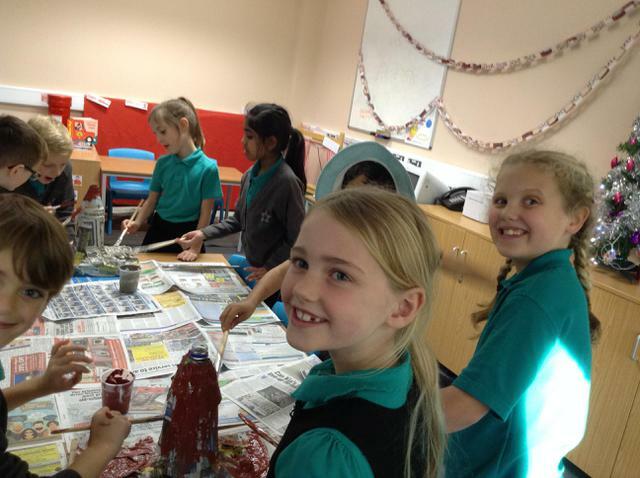 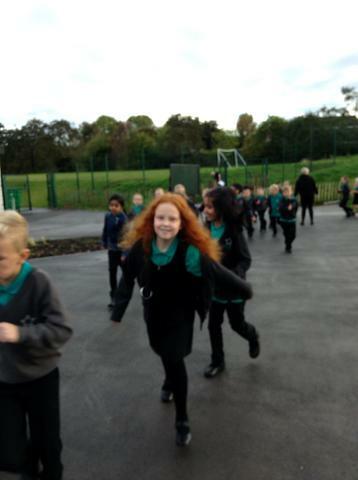 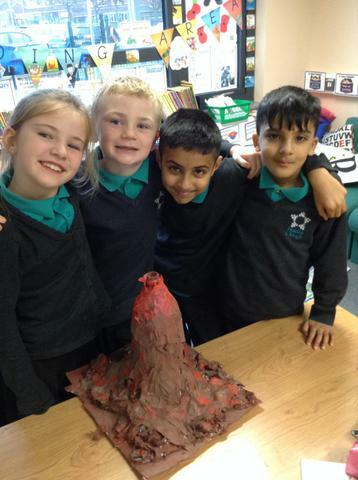 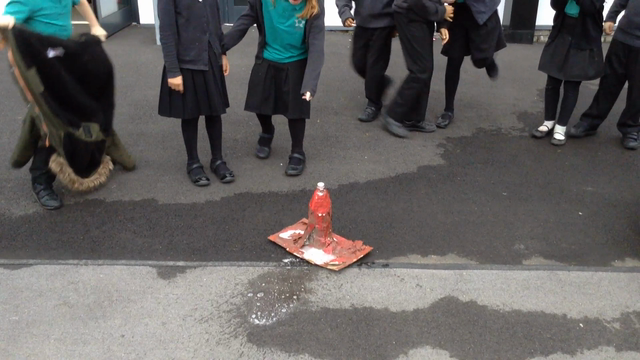 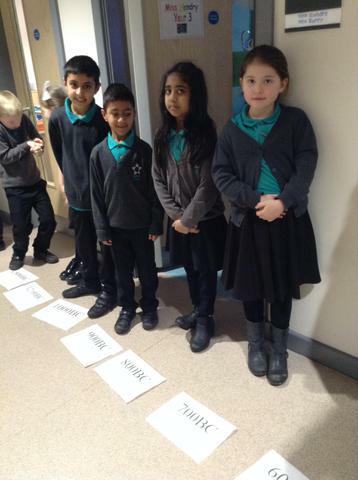 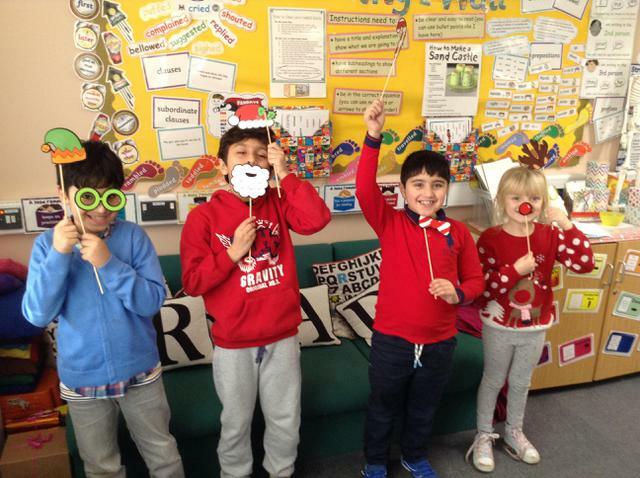 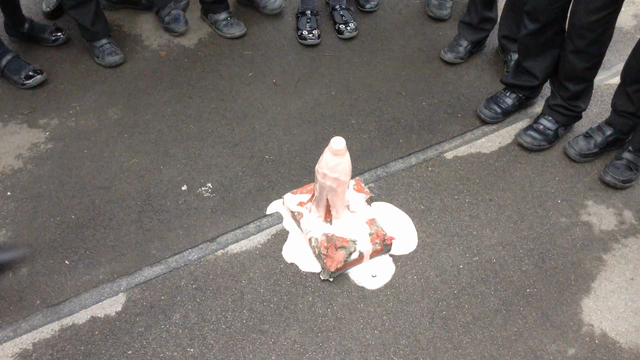 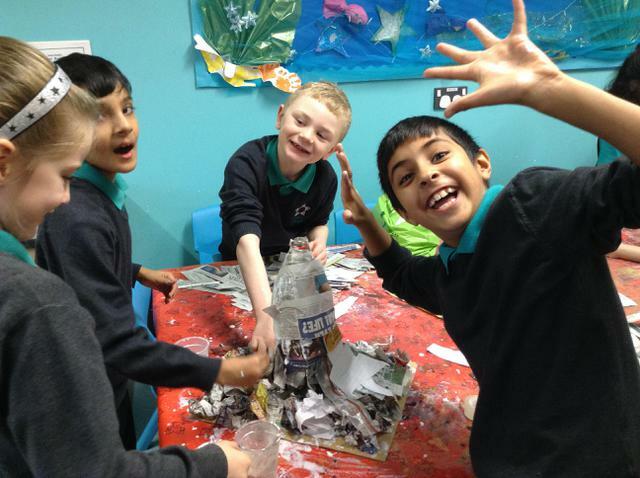 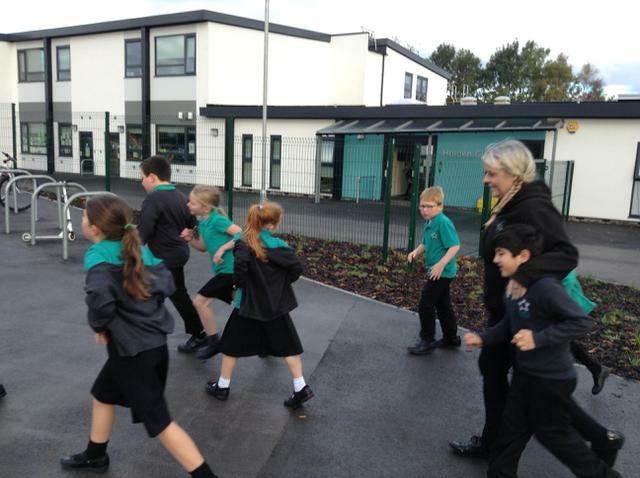 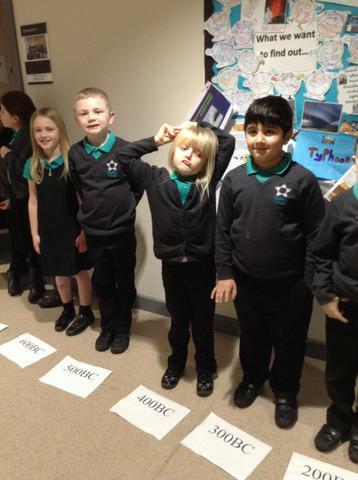 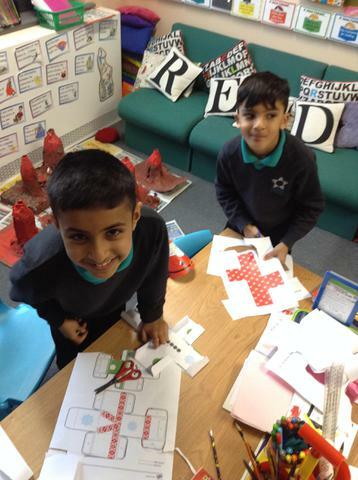 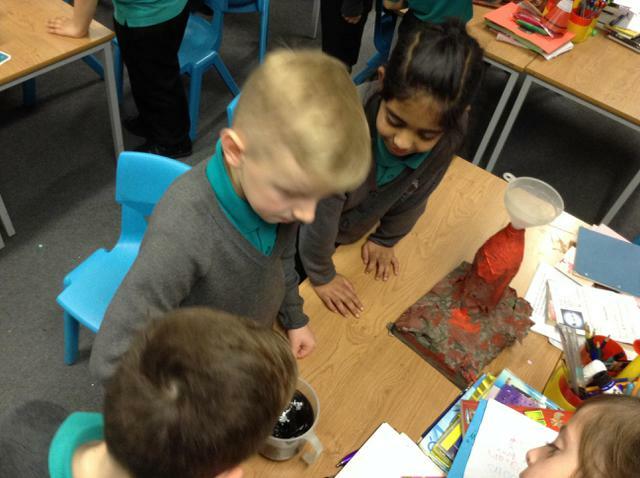 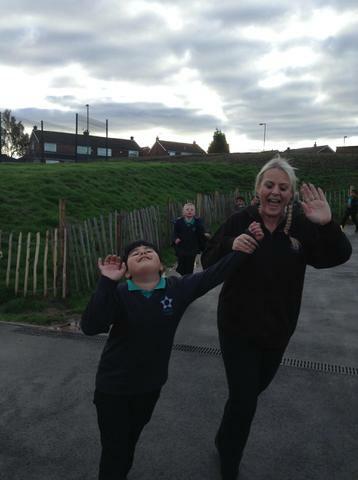 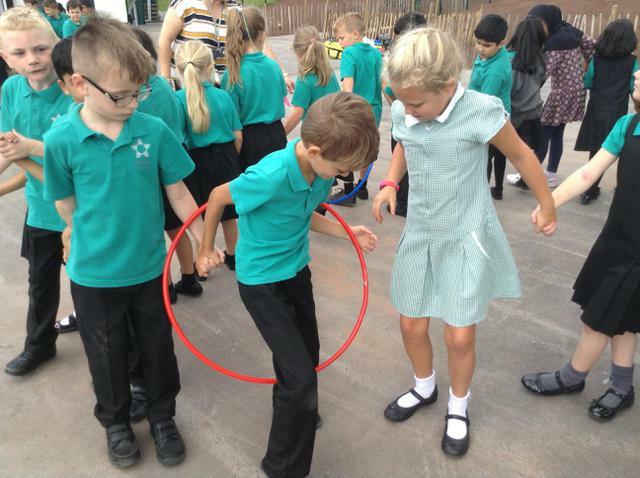 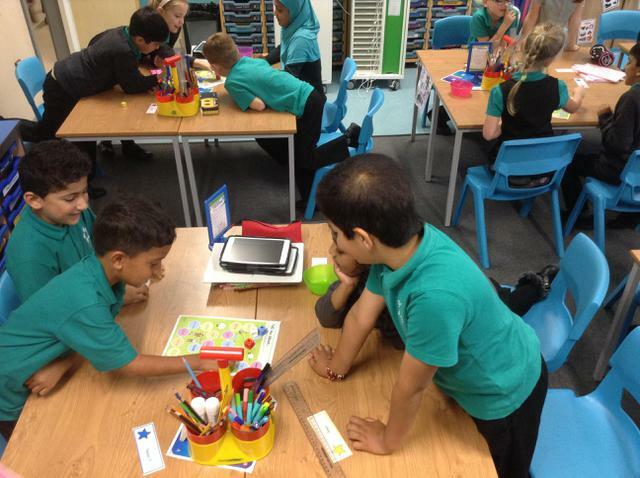 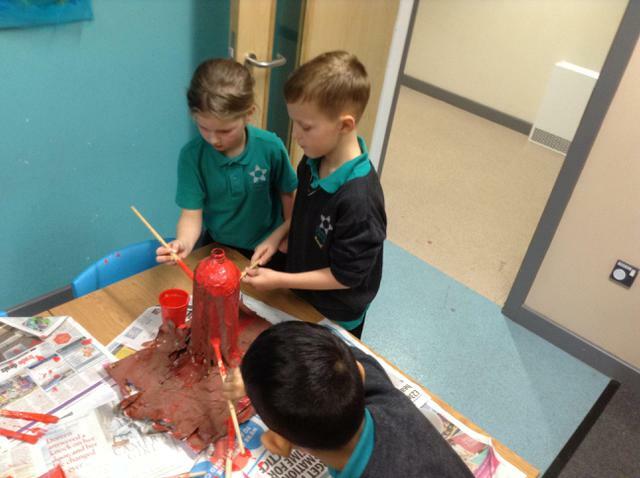 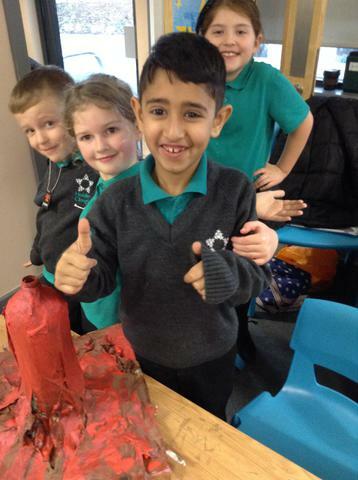 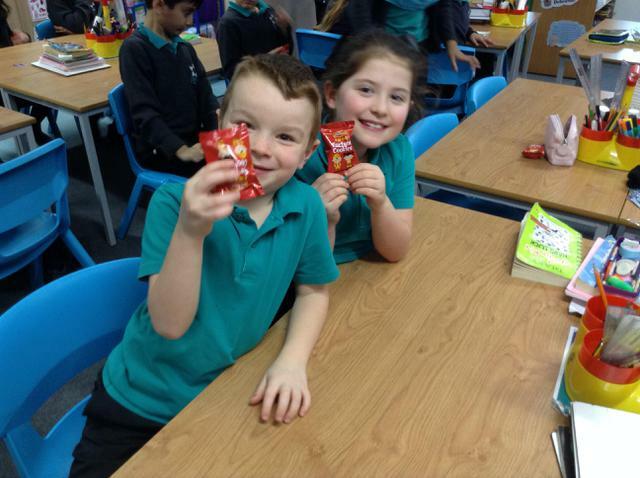 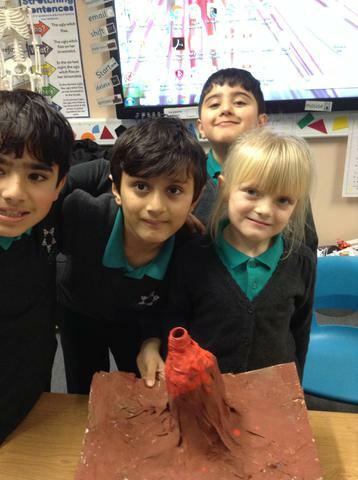 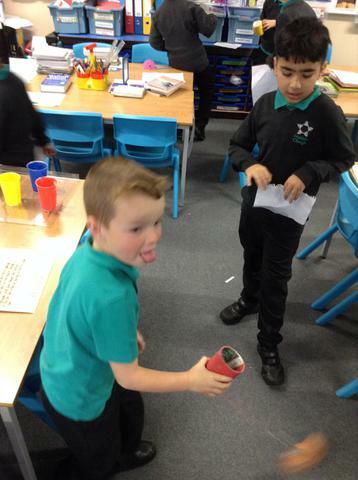 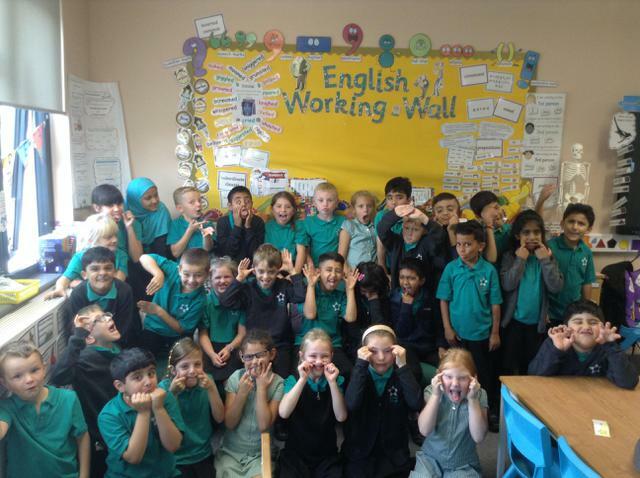 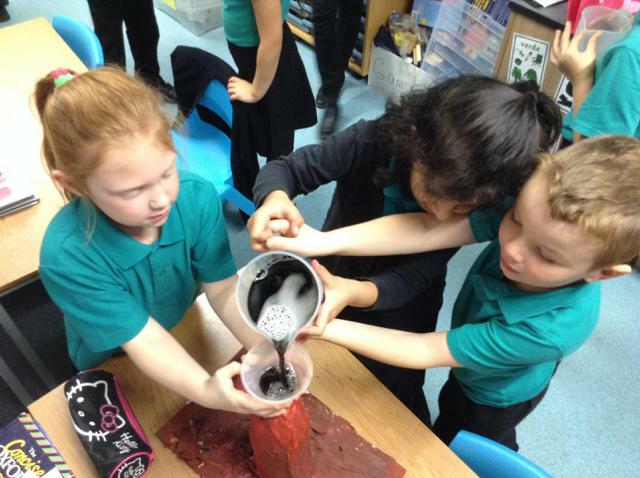 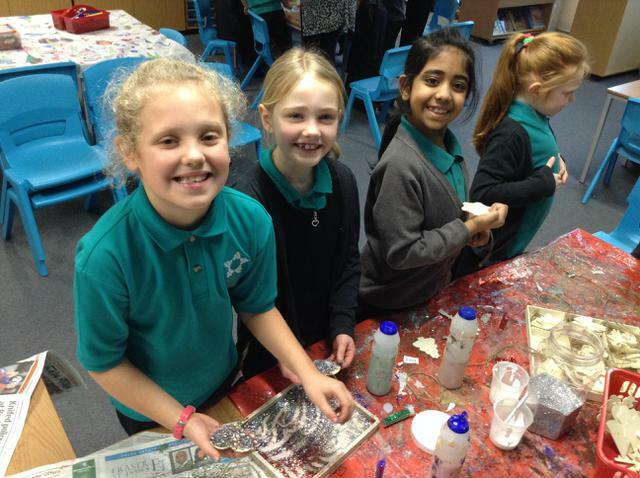 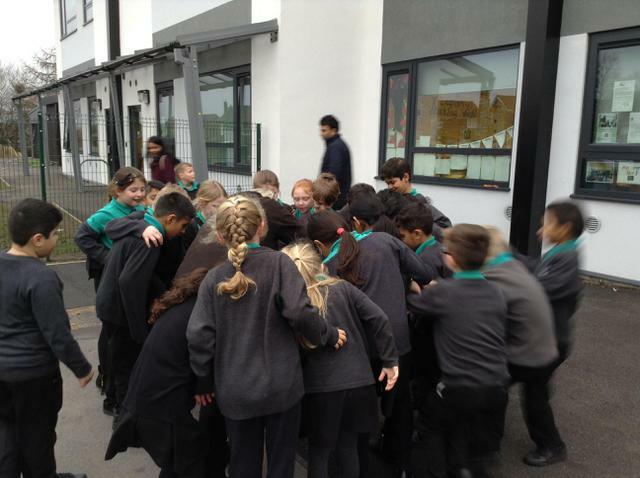 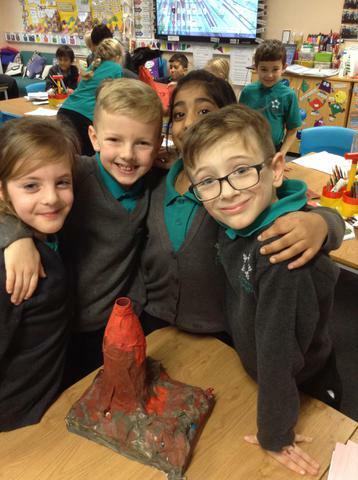 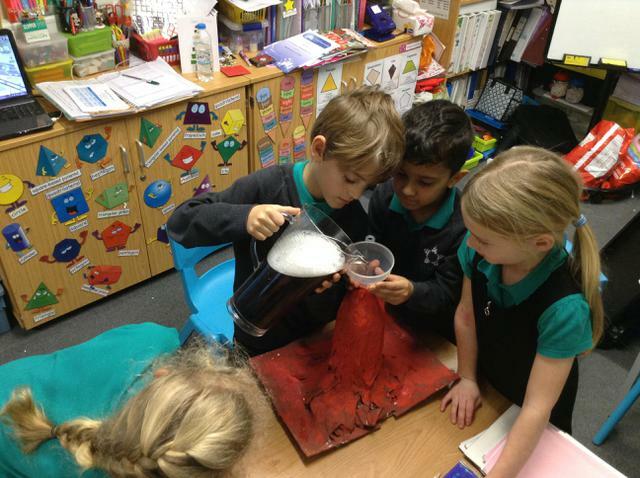 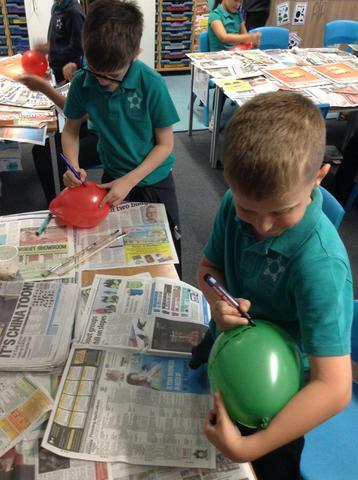 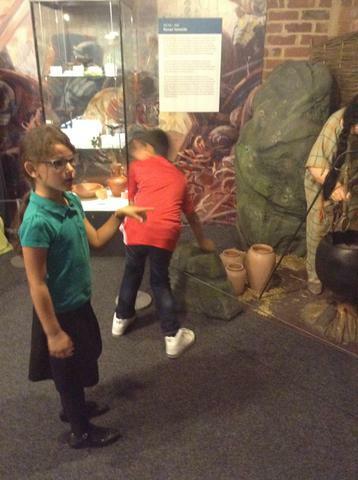 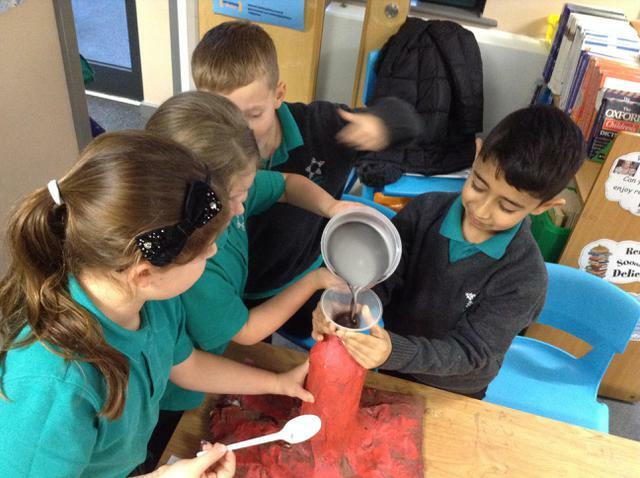 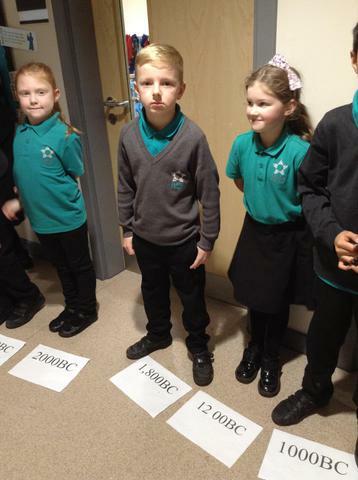 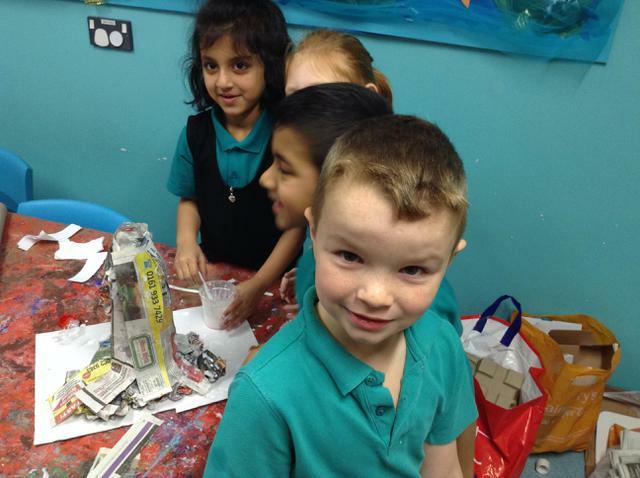 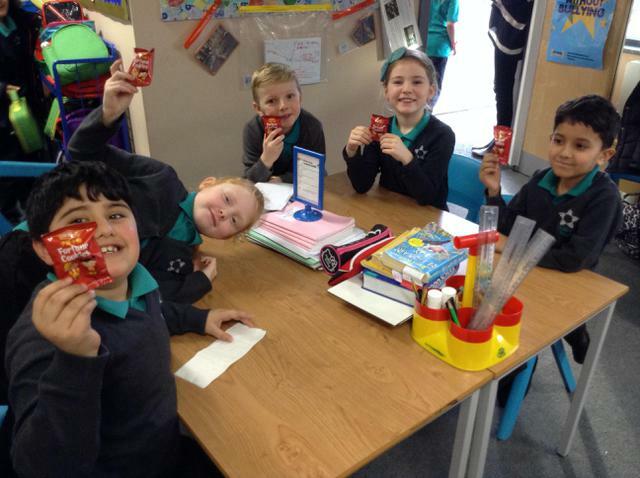 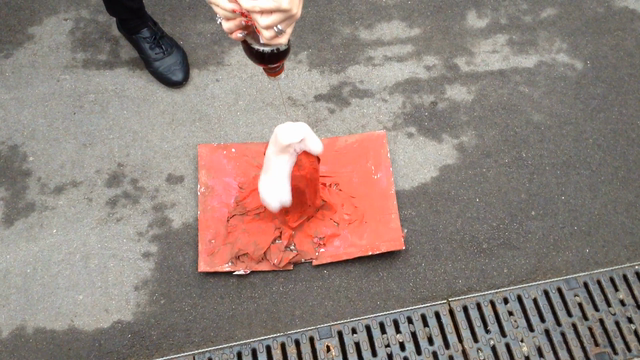 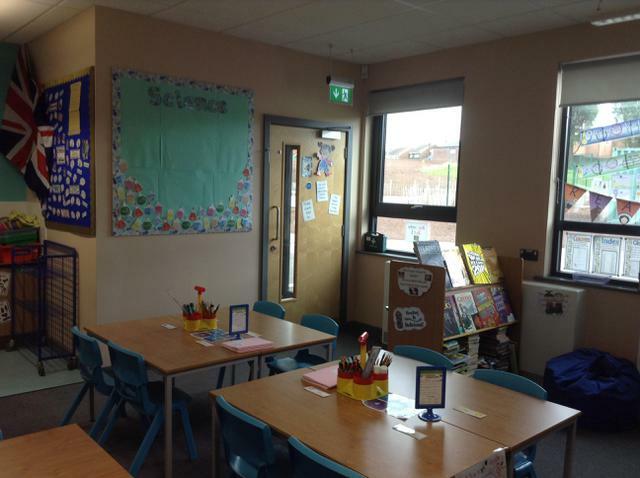 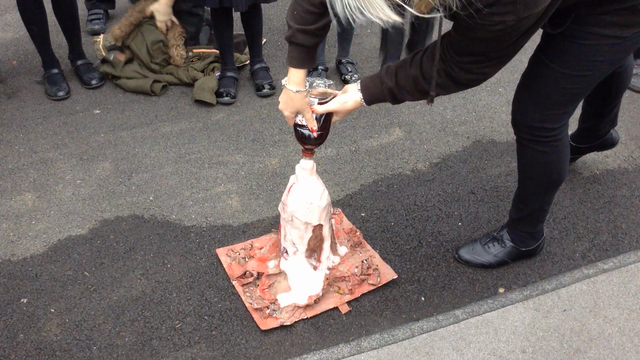 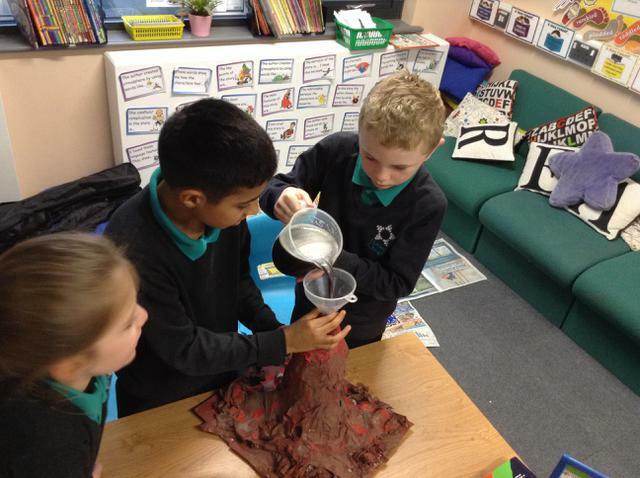 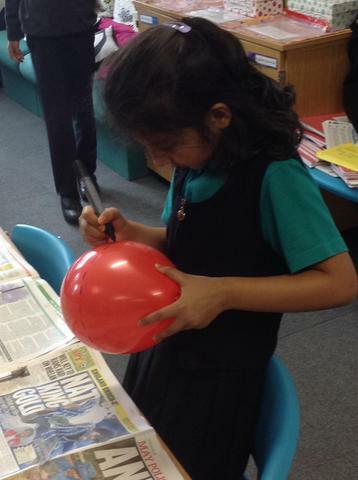 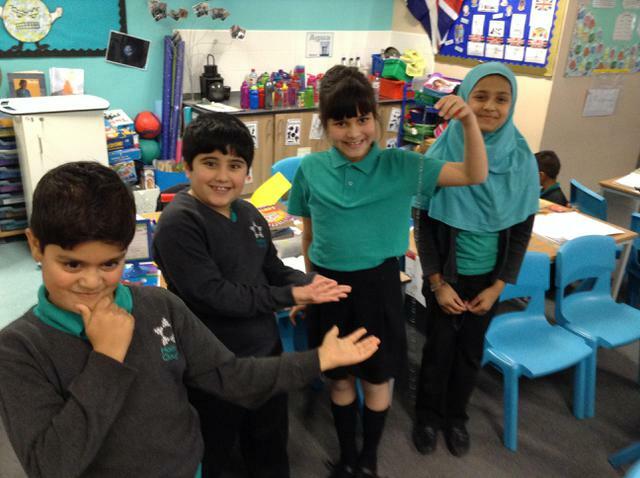 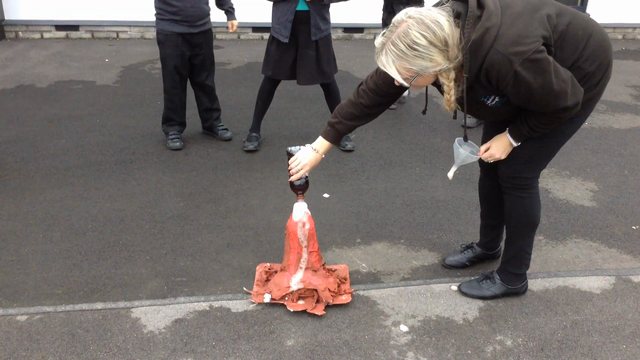 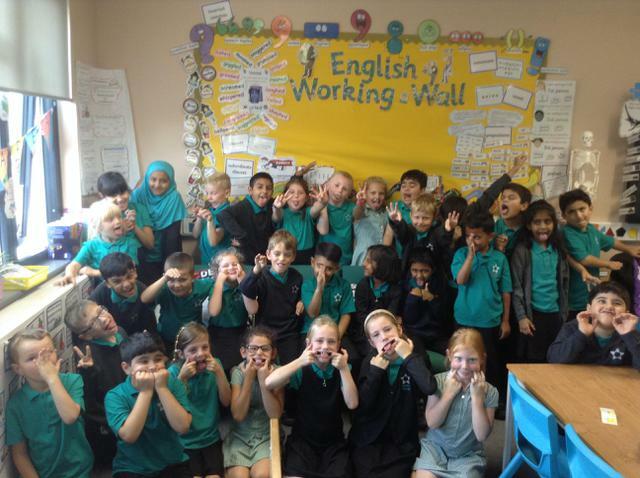 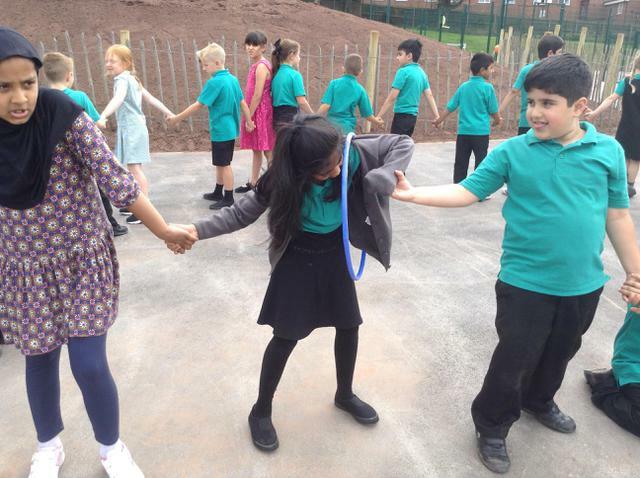 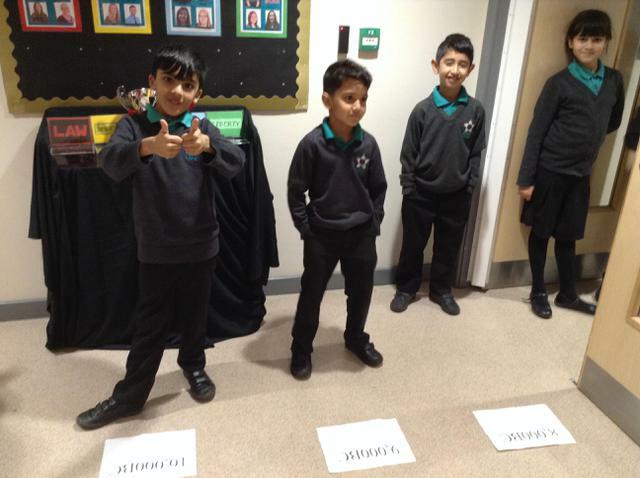 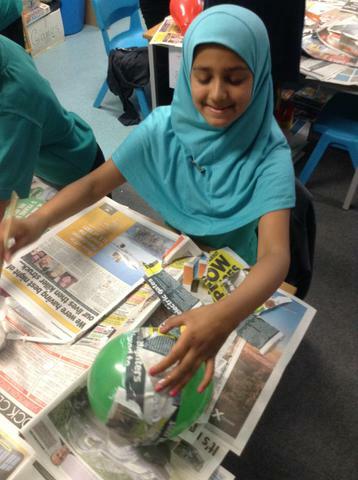 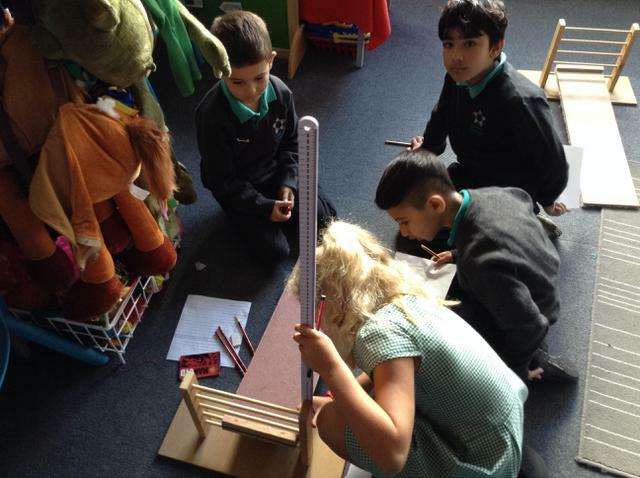 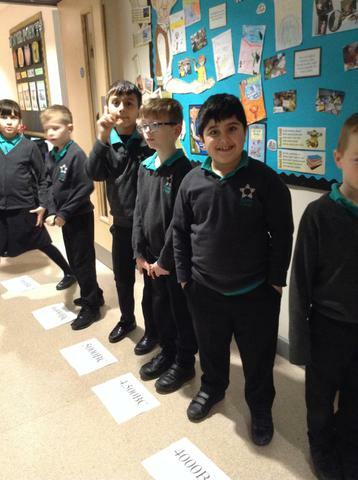 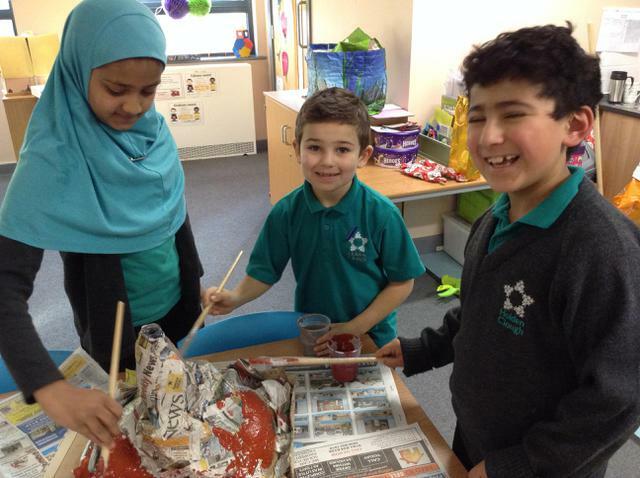 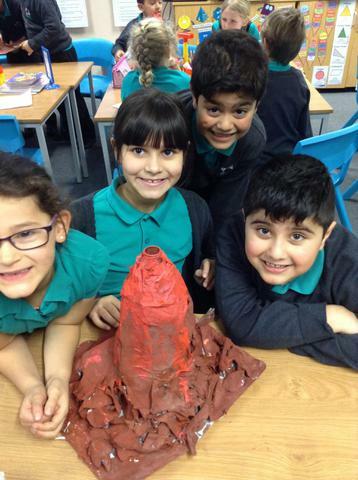 There have been eruptions in Year 3 this week!!! 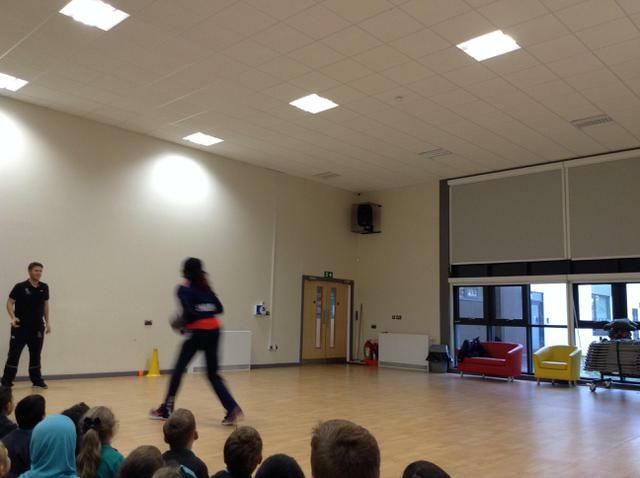 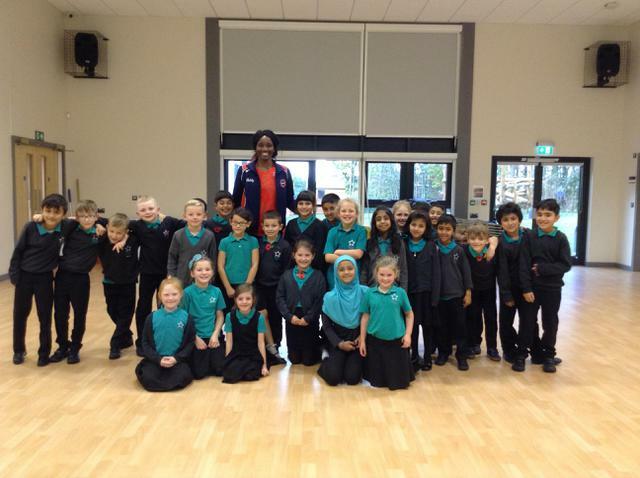 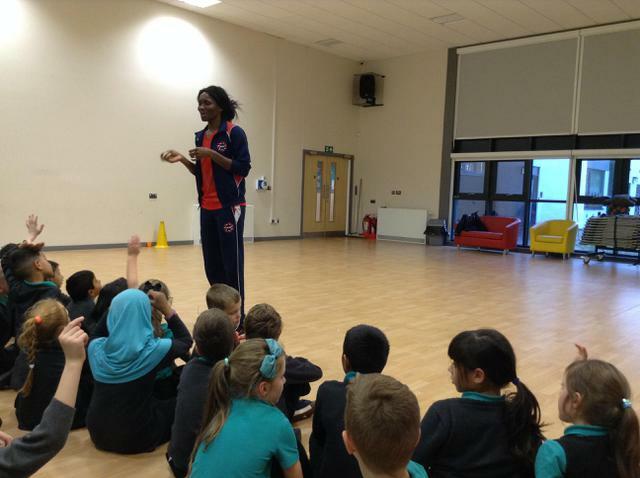 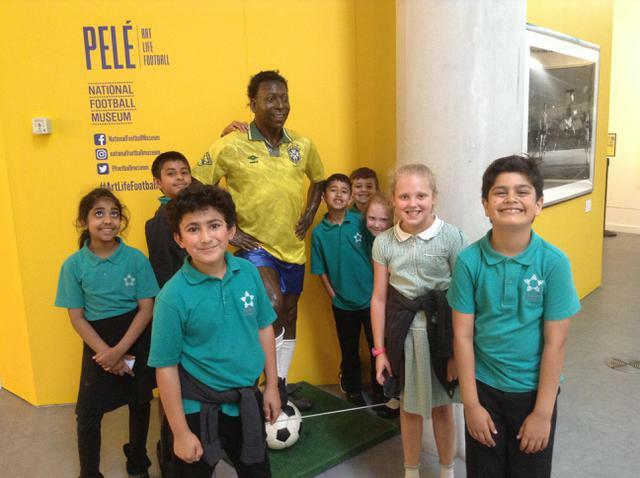 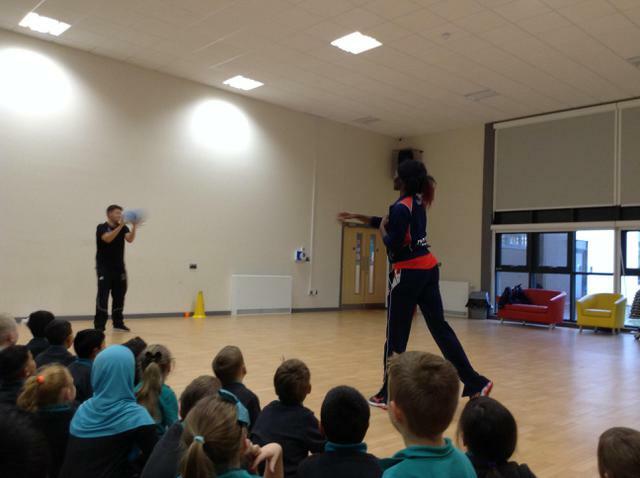 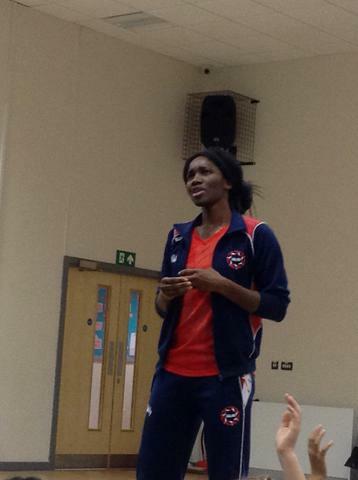 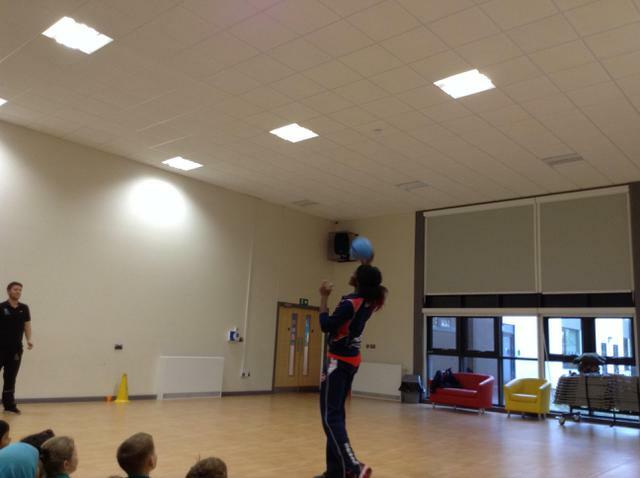 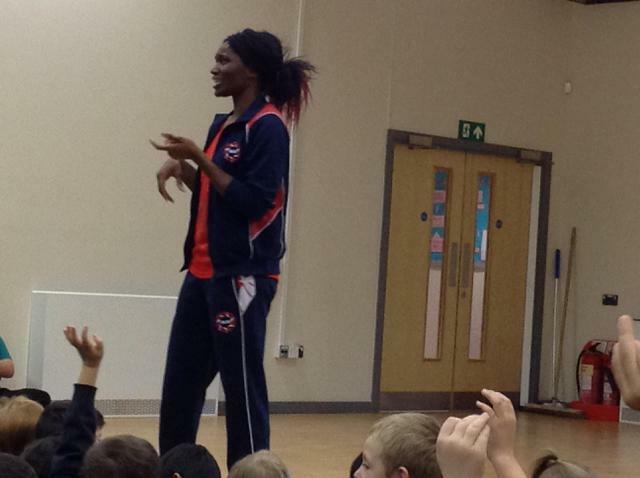 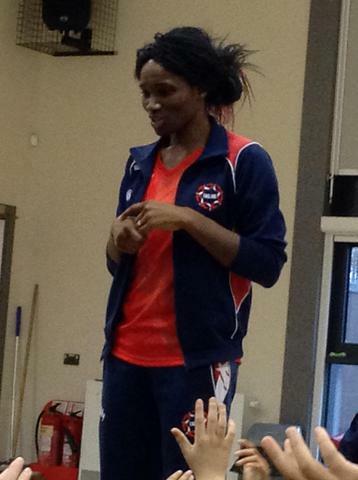 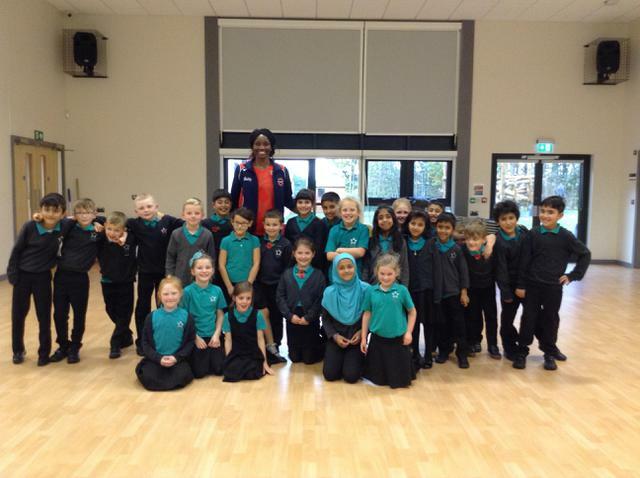 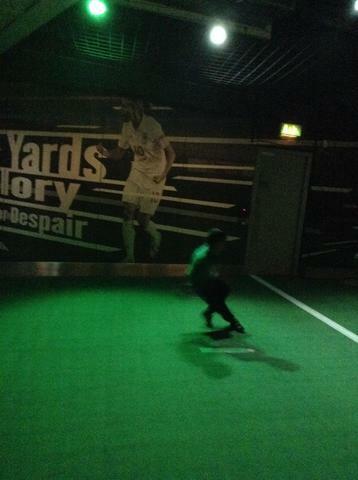 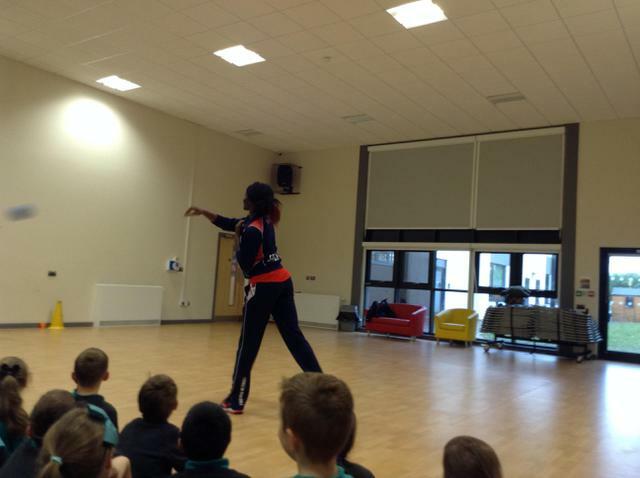 This week we had a visit from an England sporting star... Ama Agbeze the England Netball Captain! 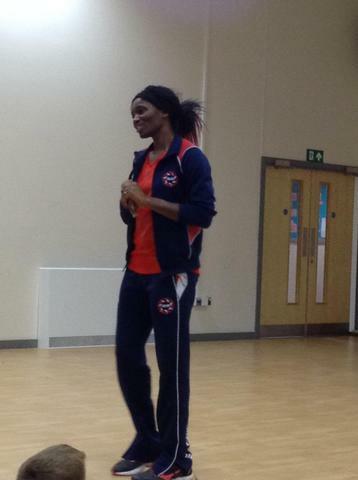 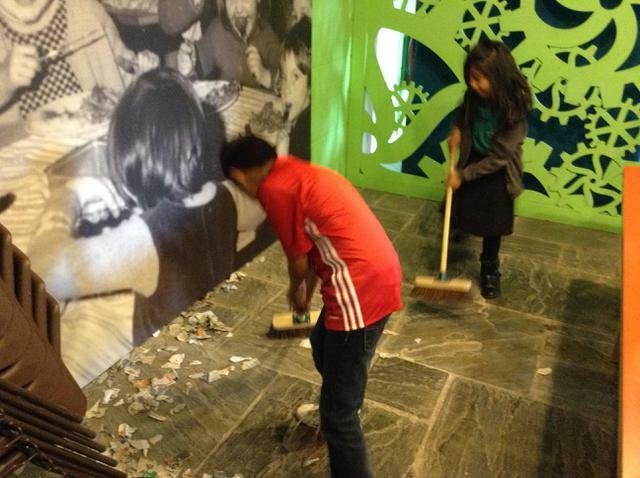 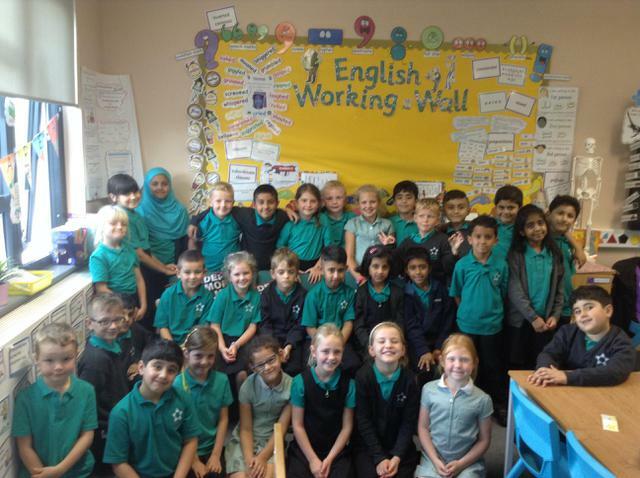 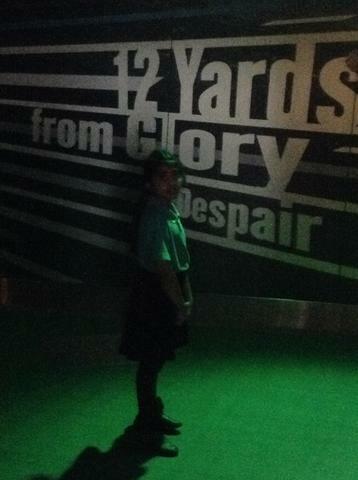 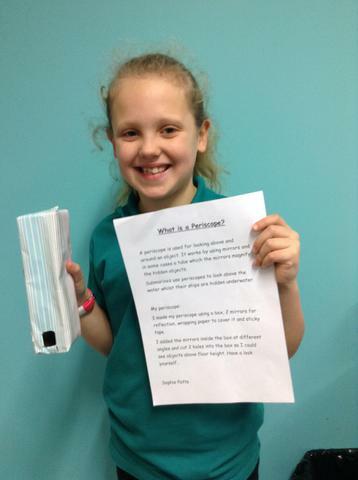 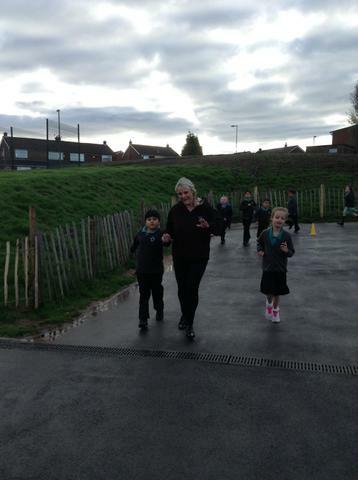 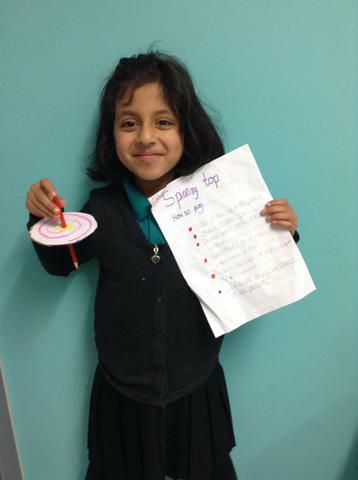 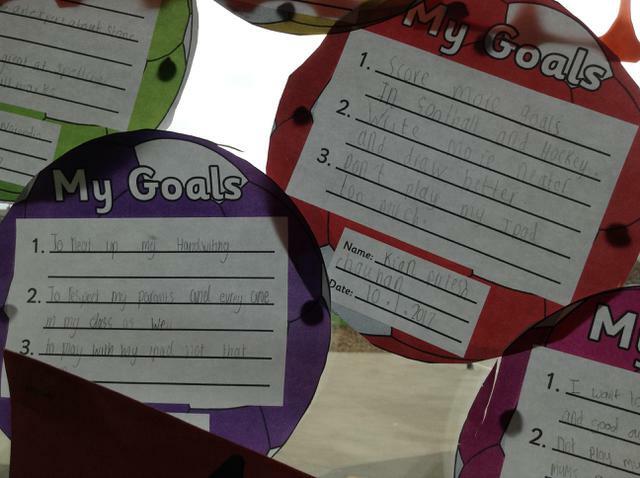 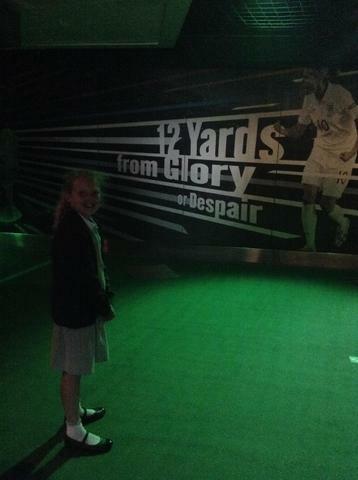 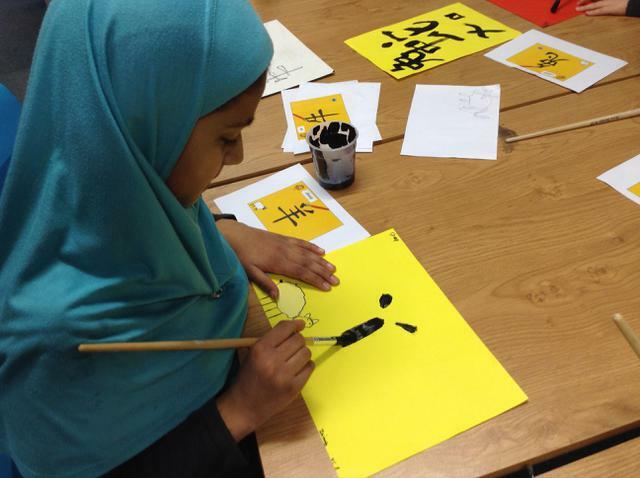 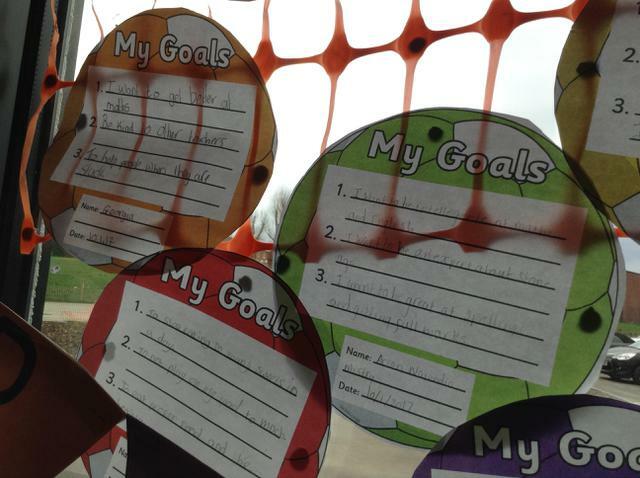 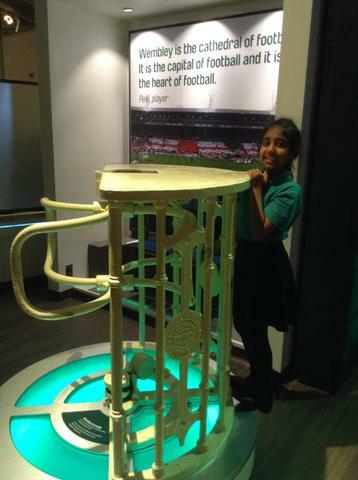 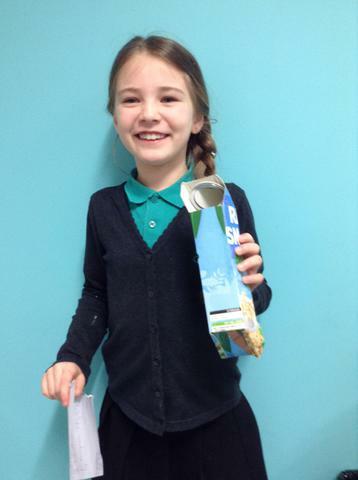 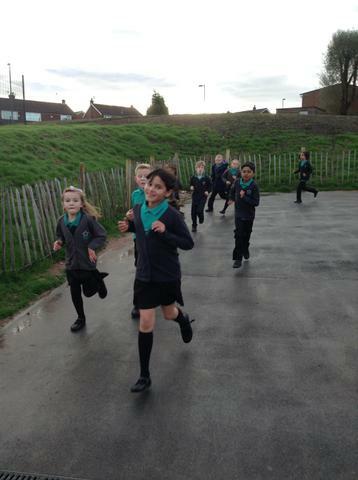 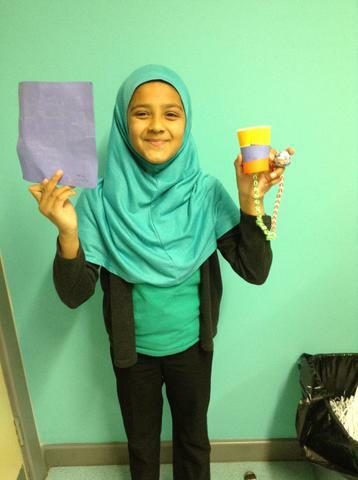 She told us all about her life and how hard work, stickability and determination is important to succeed. 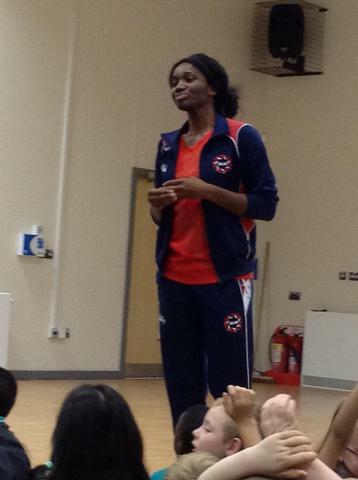 She also answered the great range of questions we had ready to ask her. 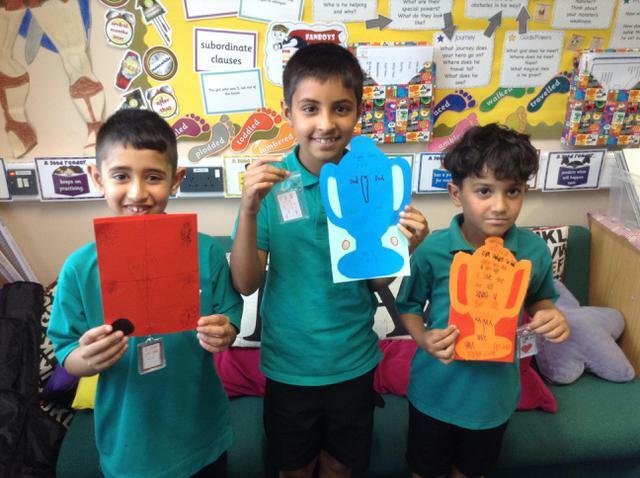 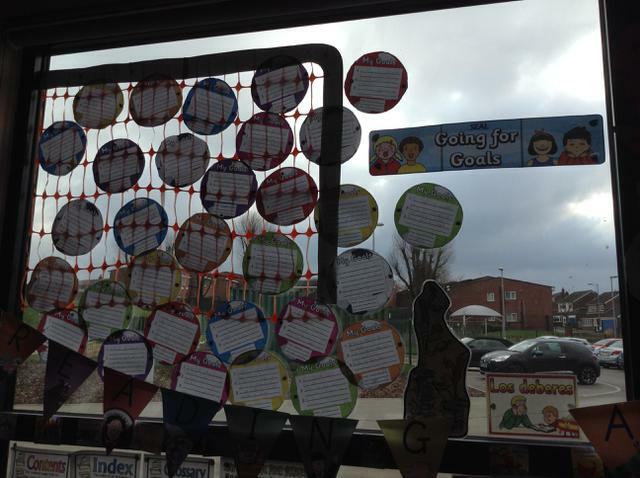 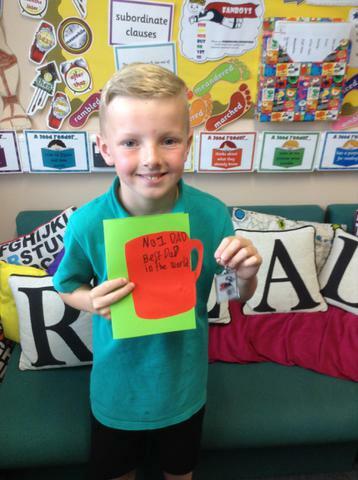 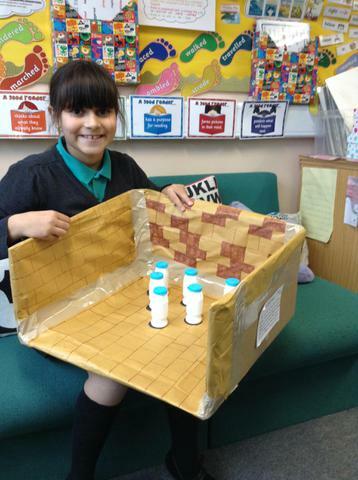 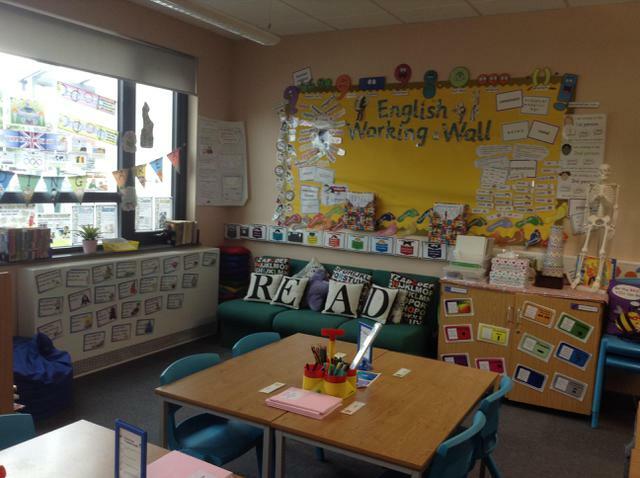 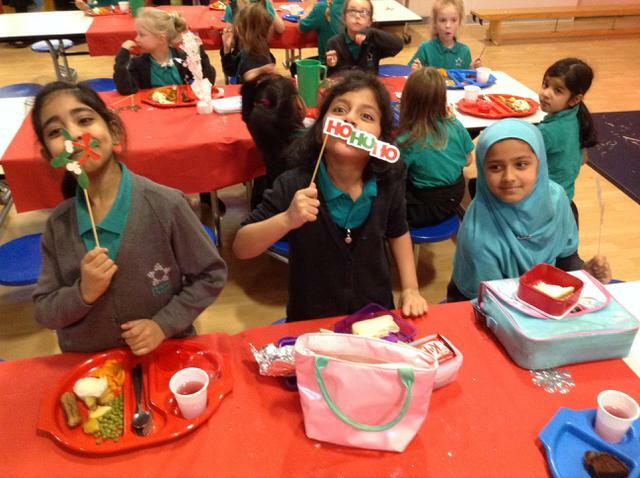 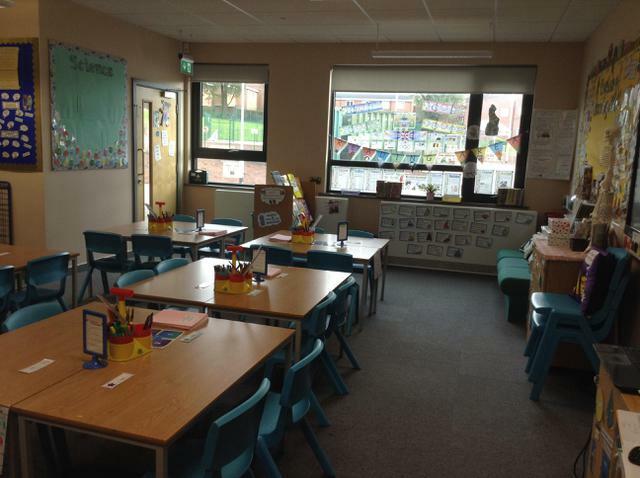 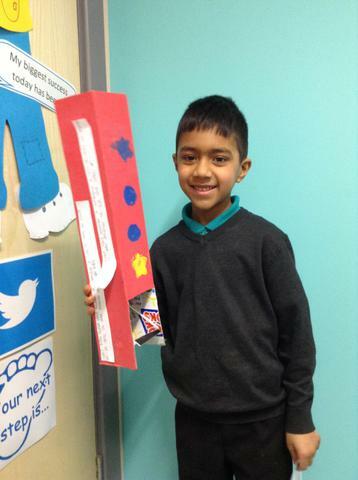 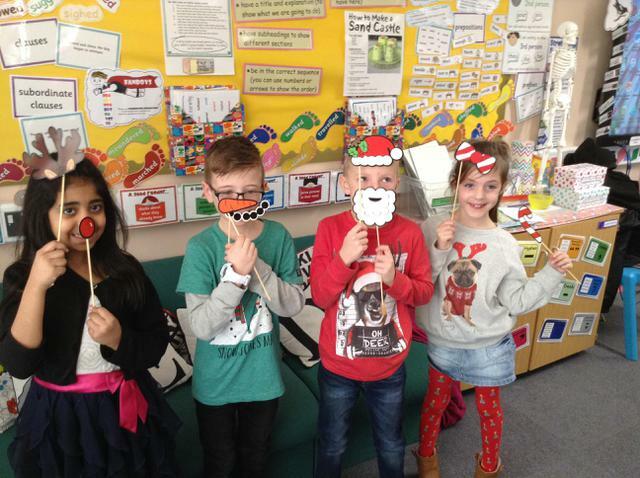 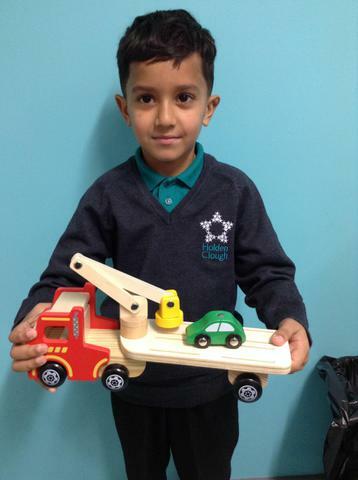 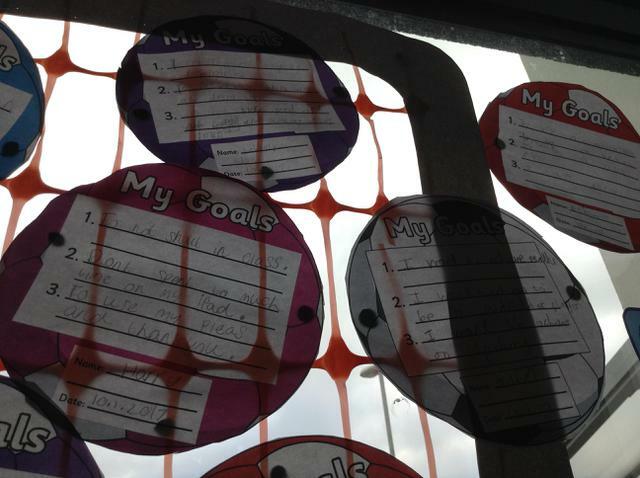 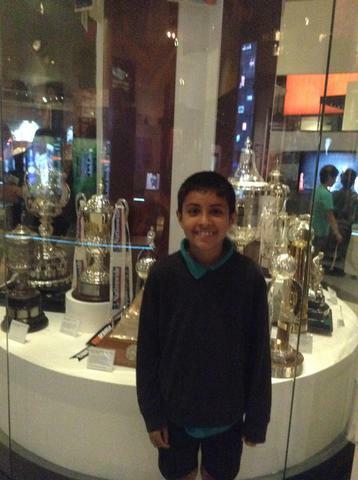 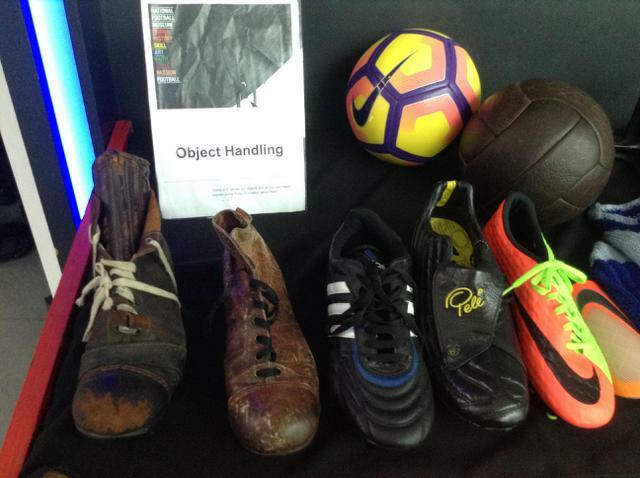 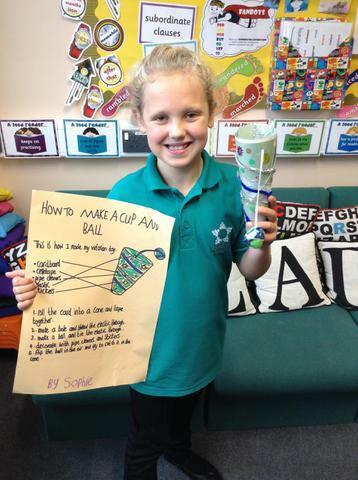 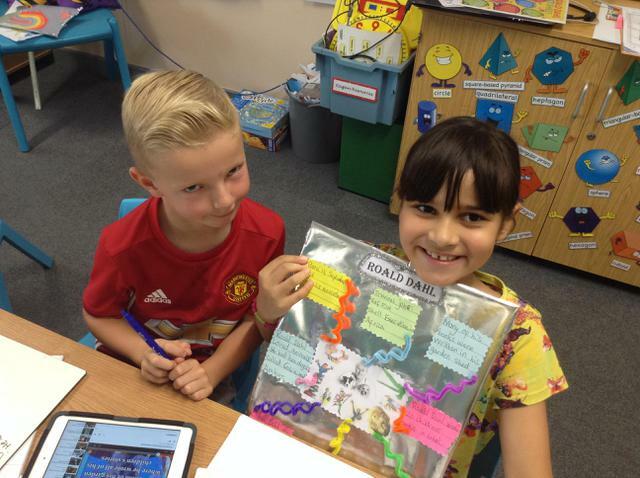 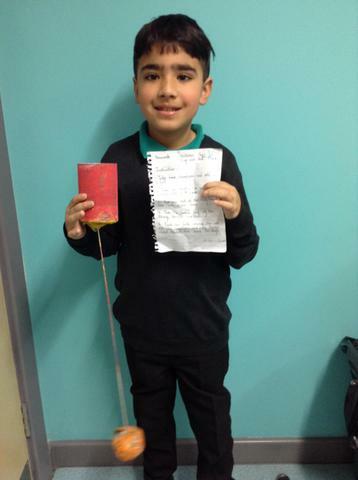 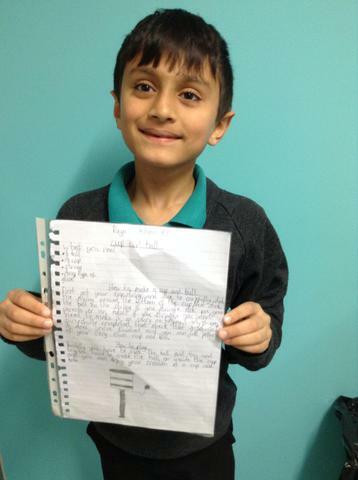 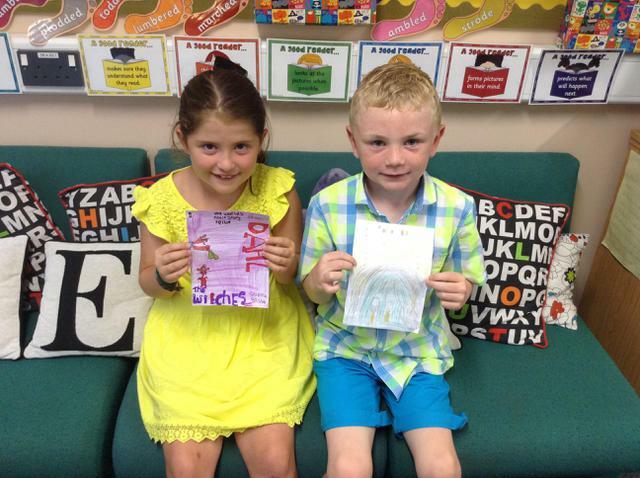 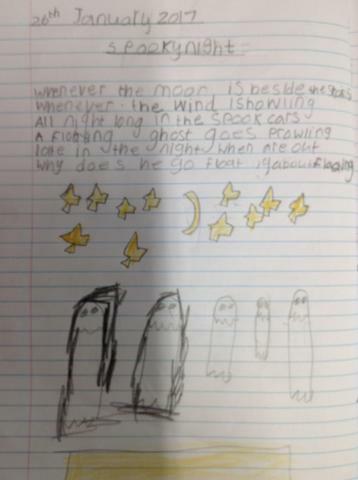 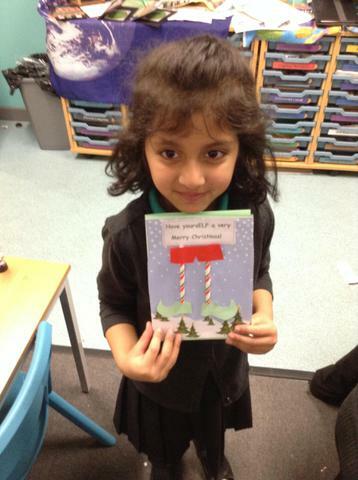 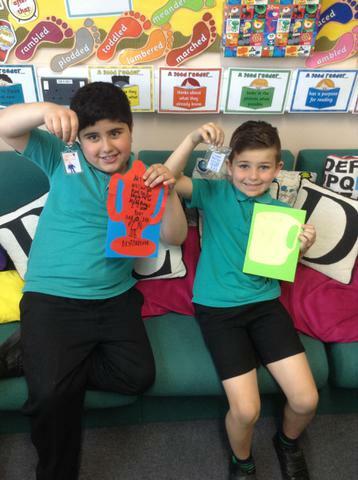 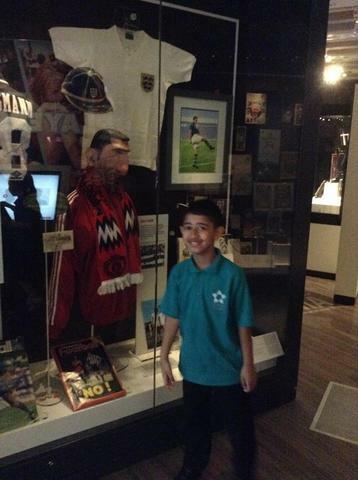 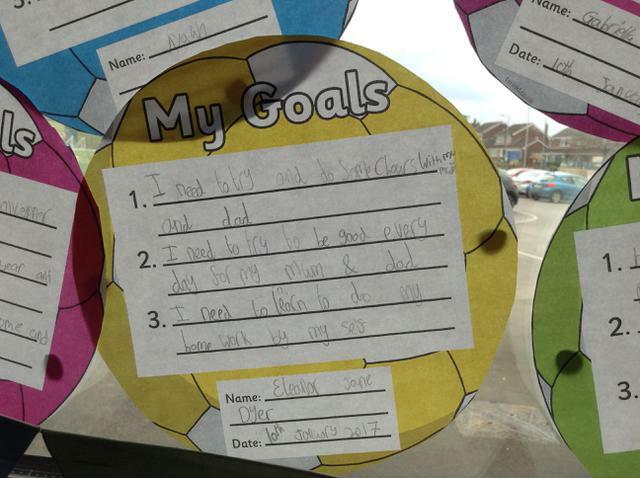 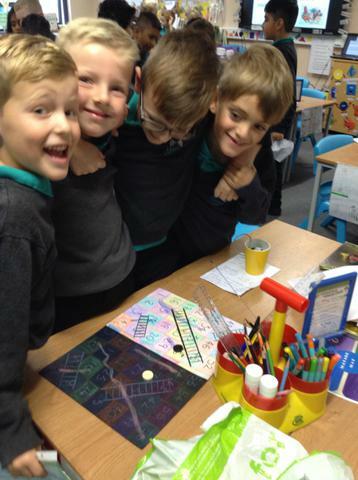 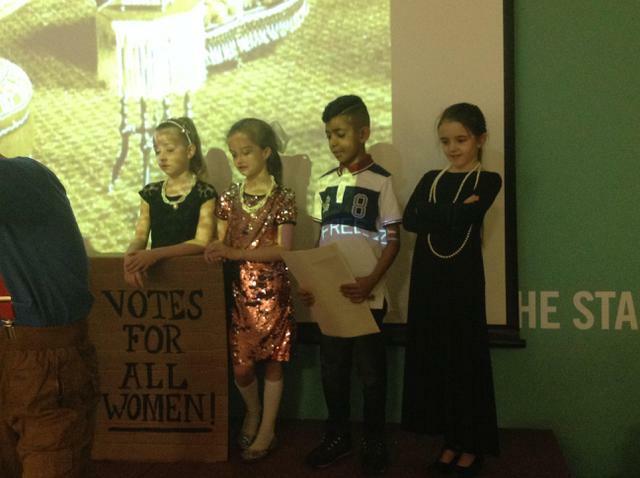 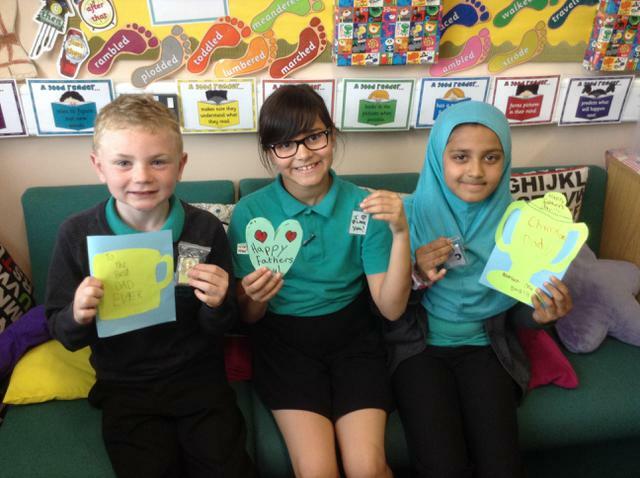 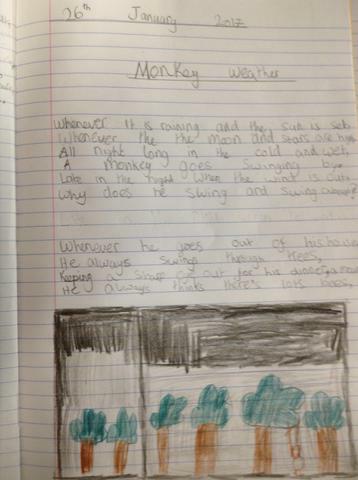 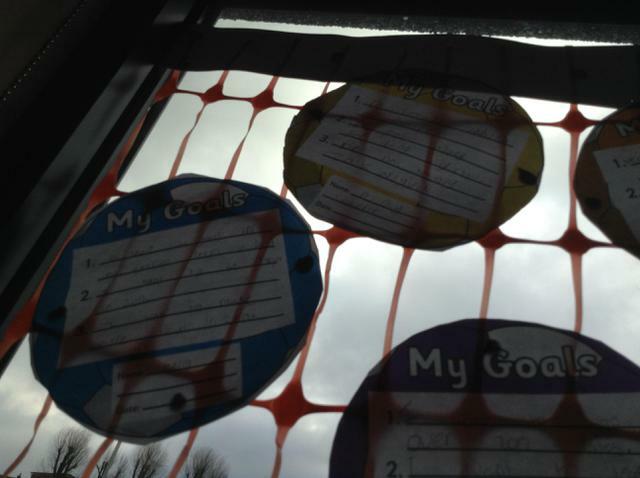 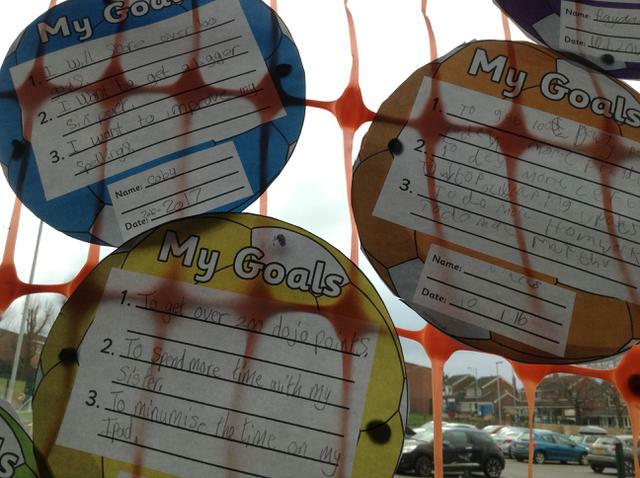 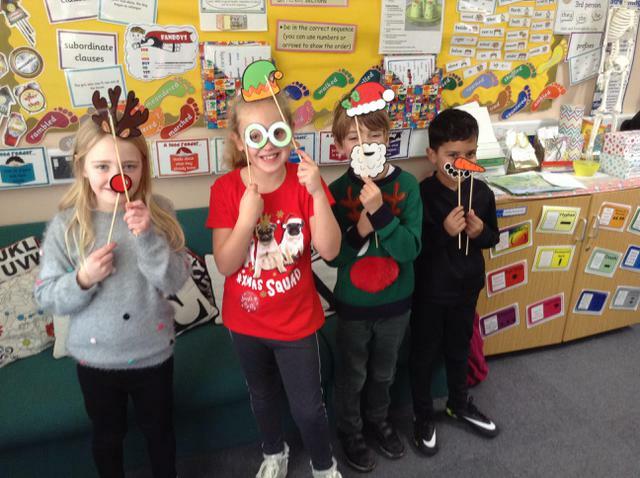 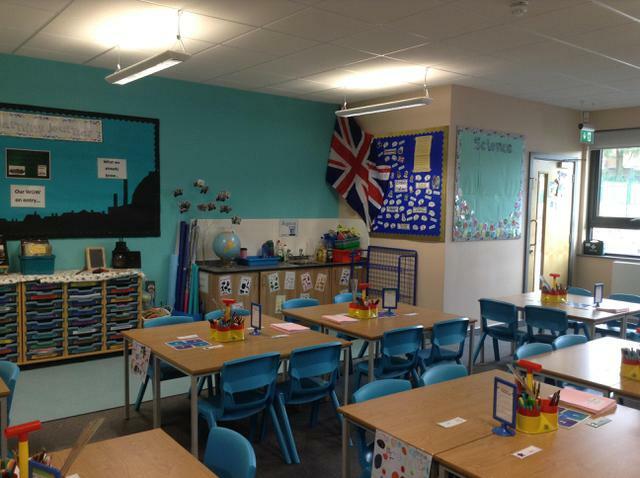 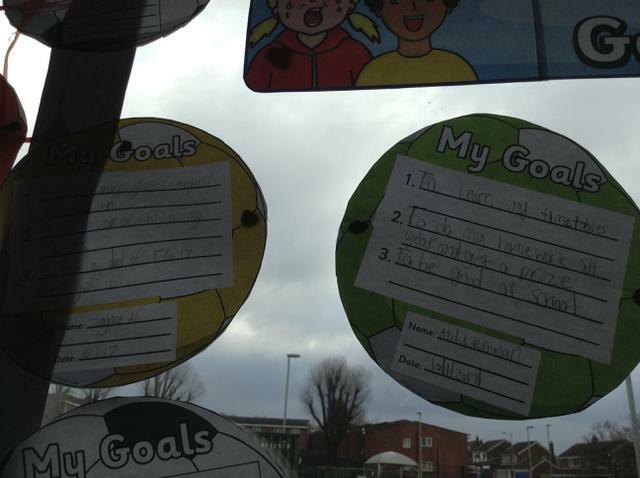 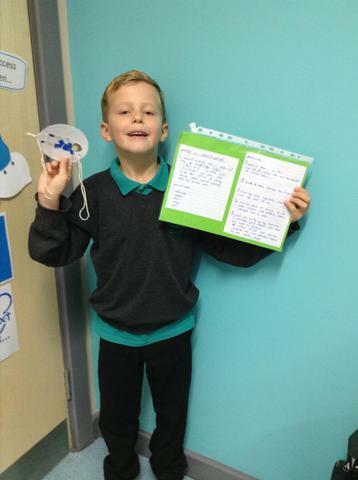 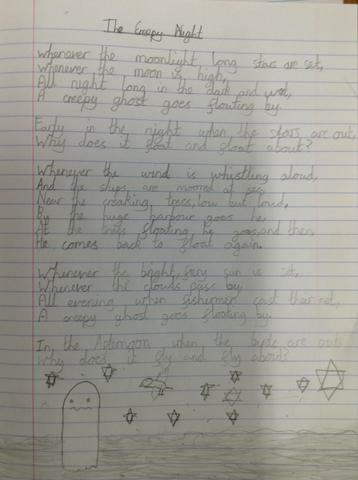 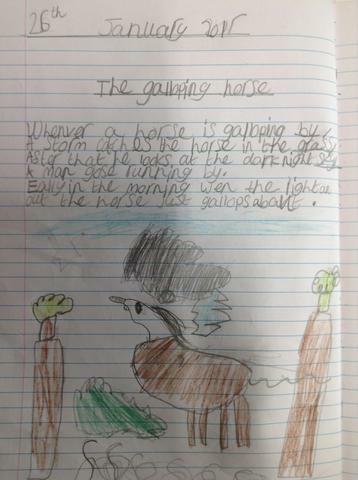 Have a look at some of our amazing homework! 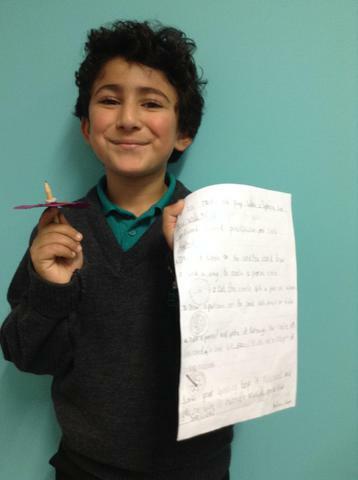 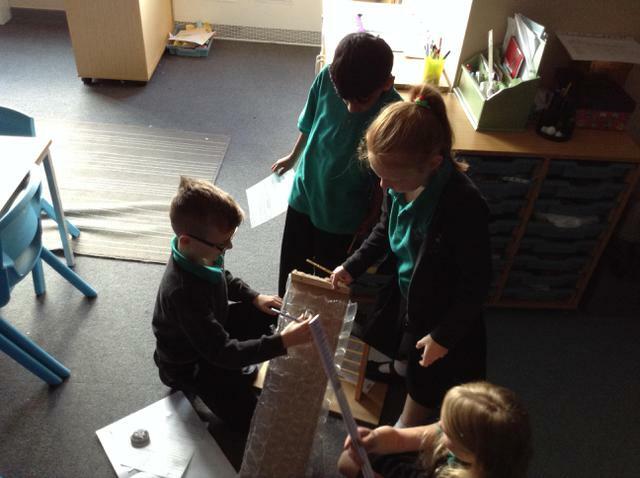 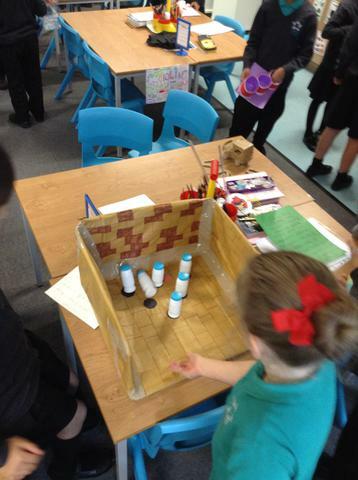 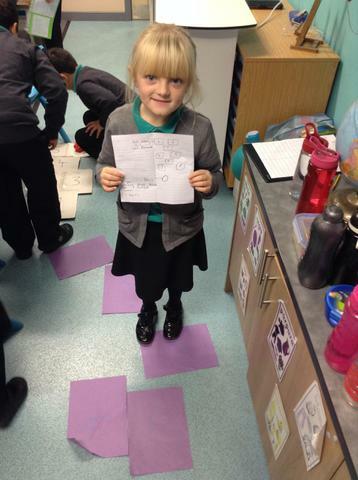 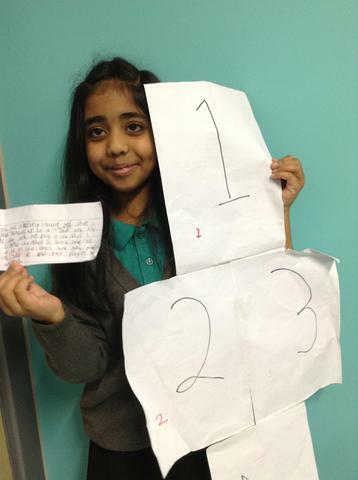 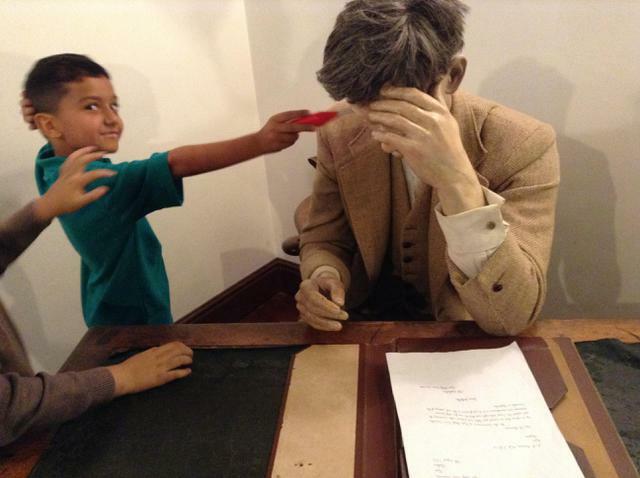 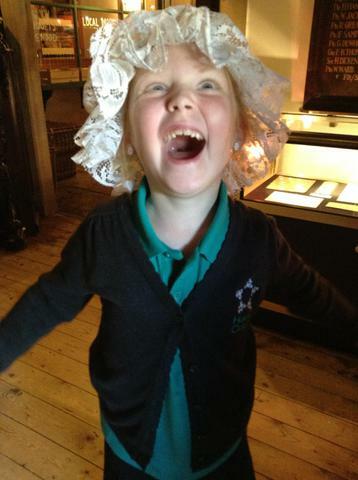 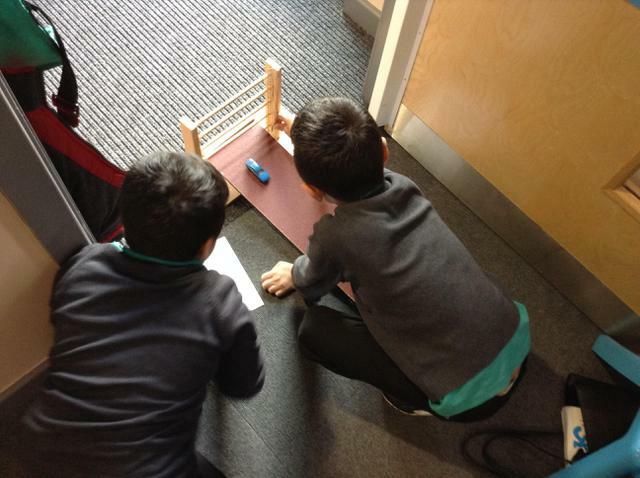 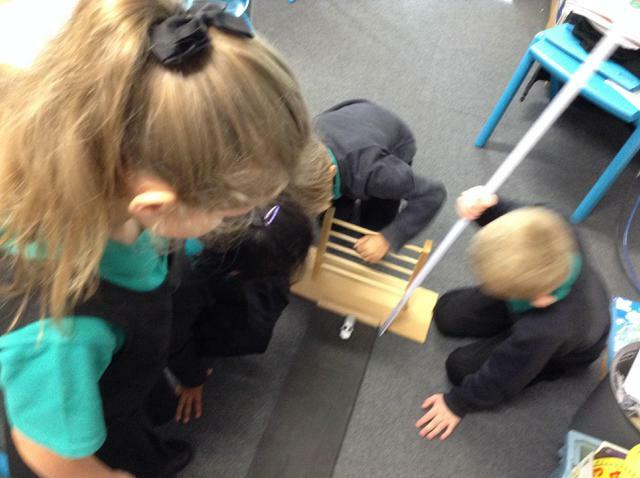 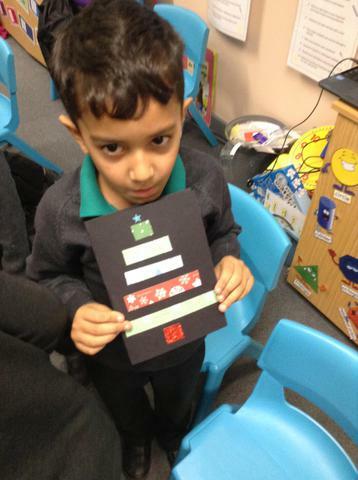 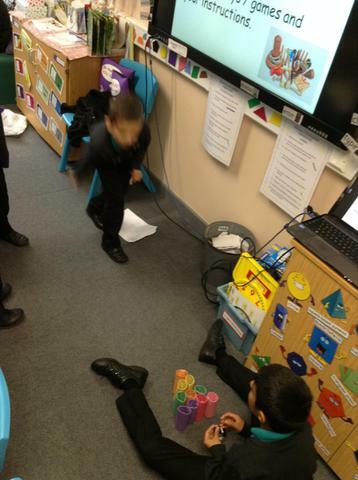 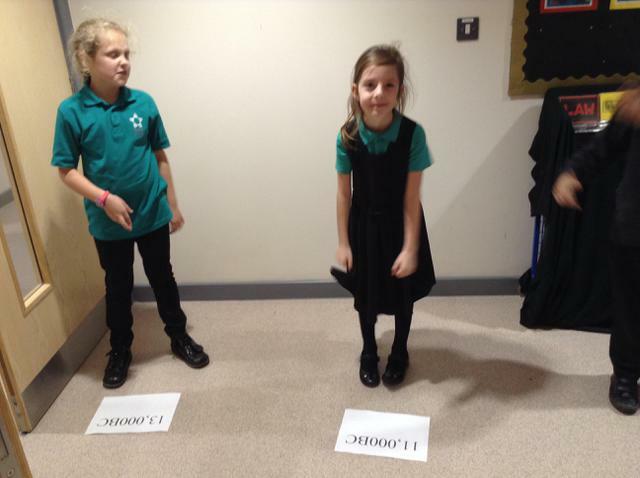 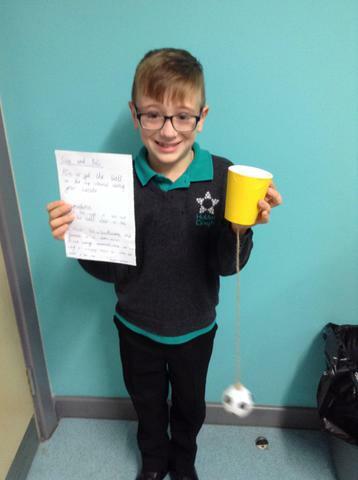 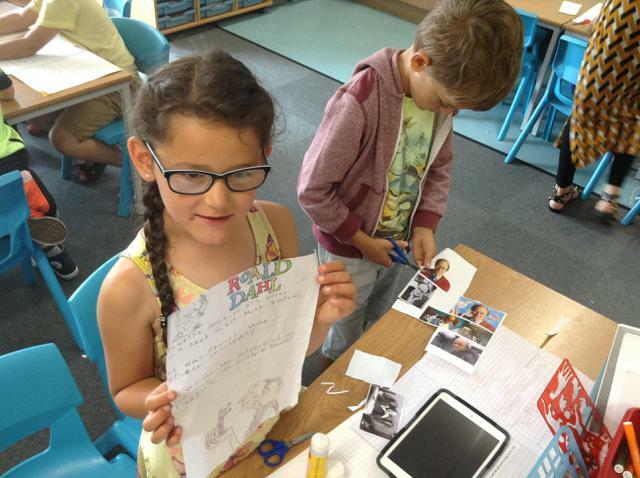 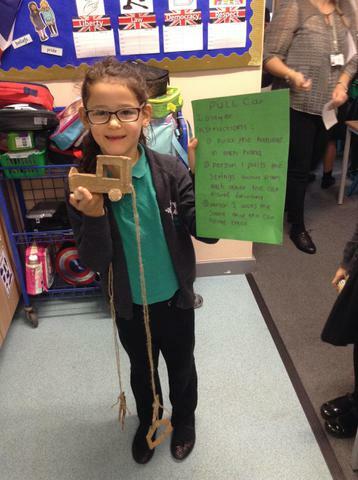 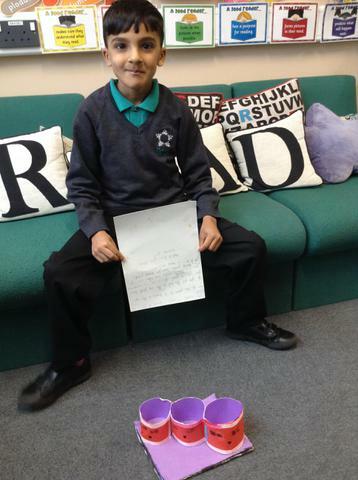 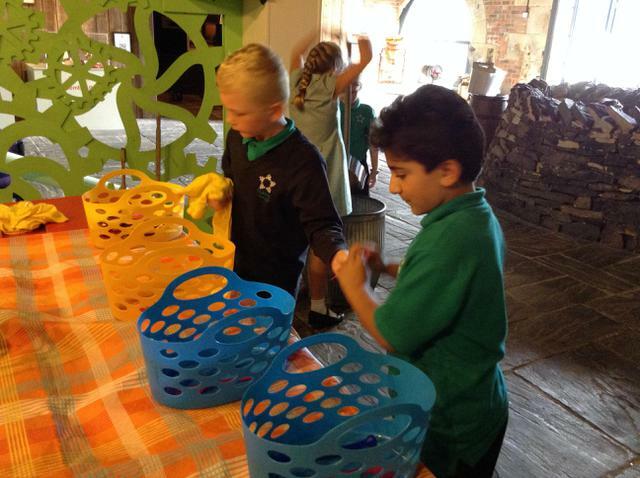 We were asked to make a toy or game that a Victorian child could have played with then write a set of instructions. 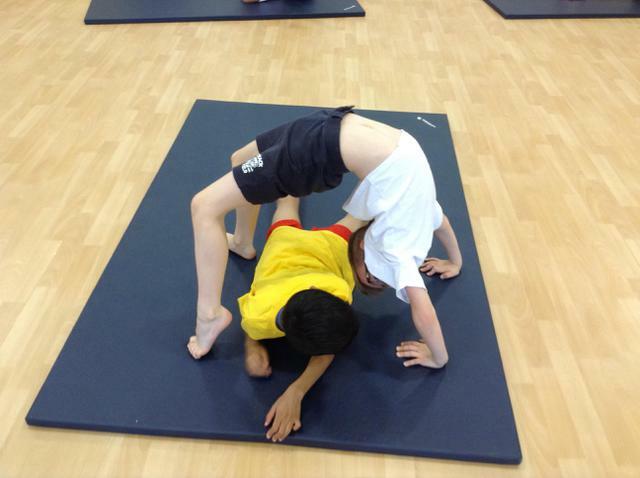 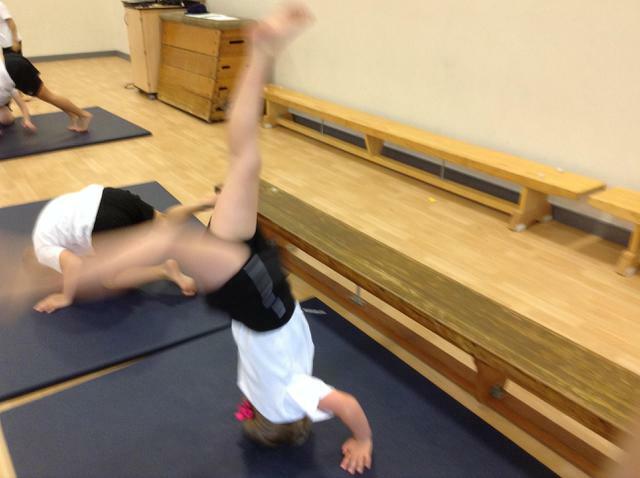 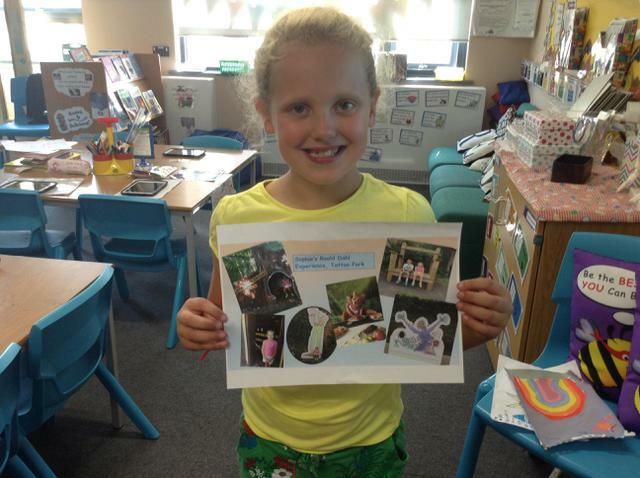 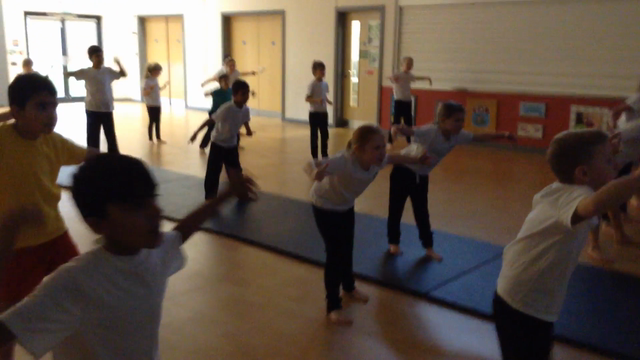 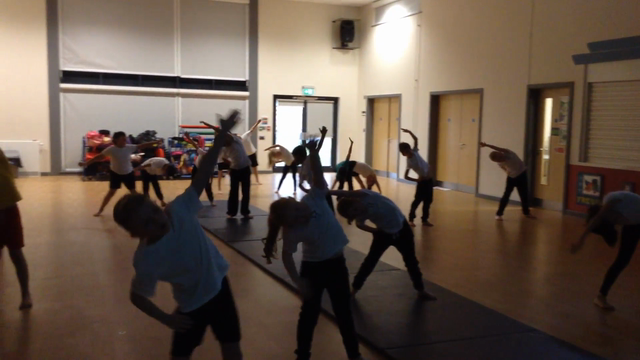 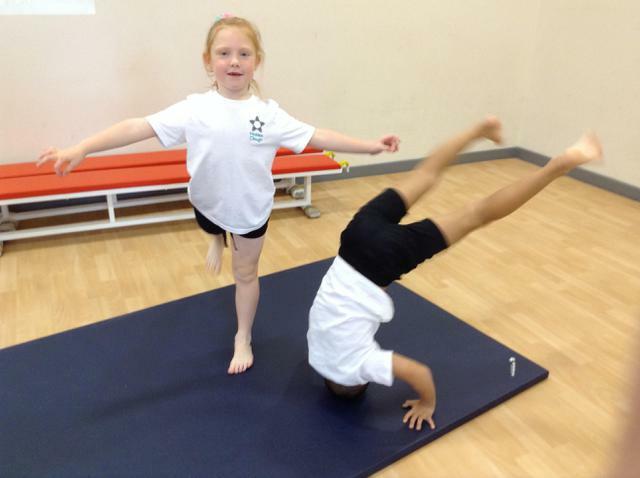 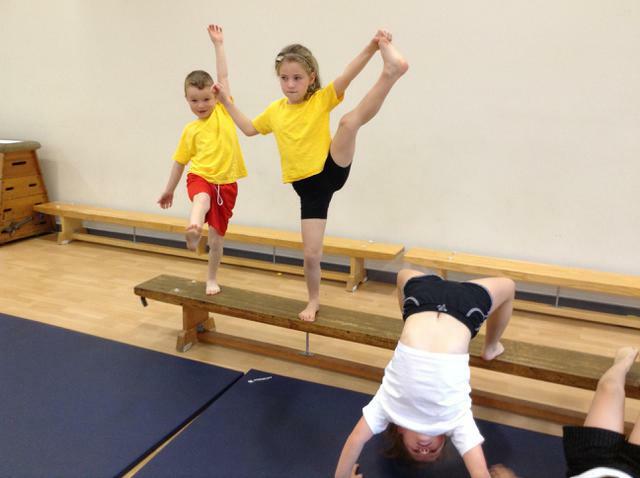 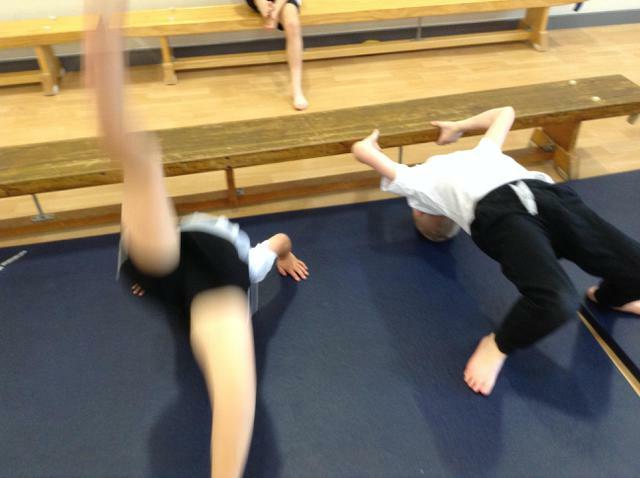 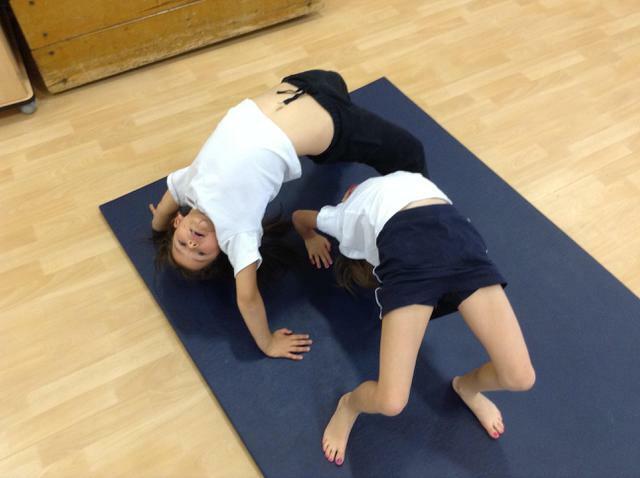 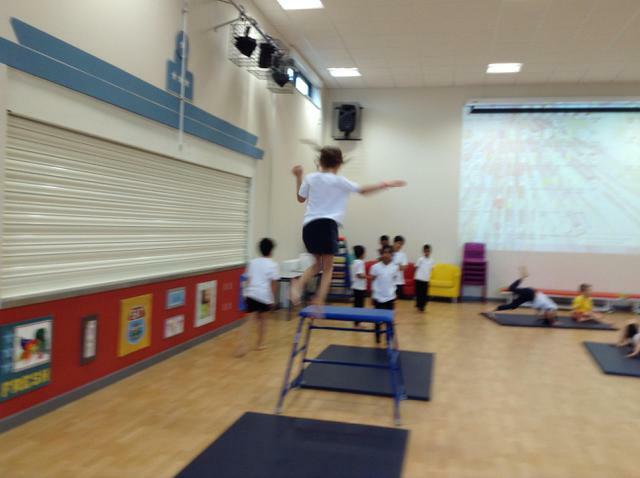 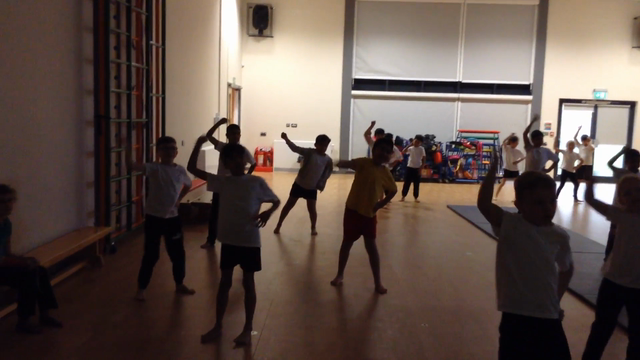 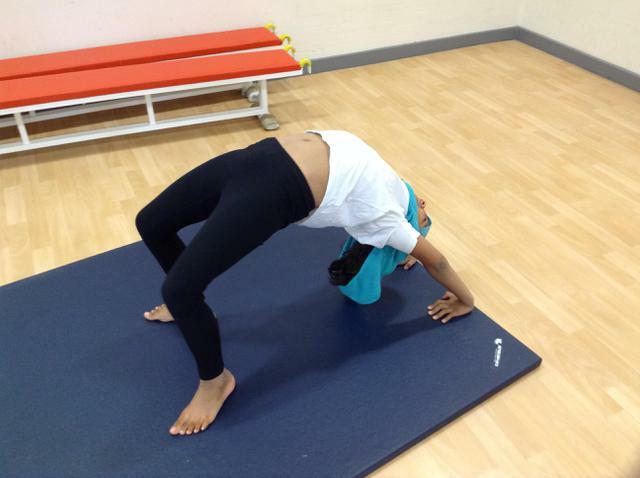 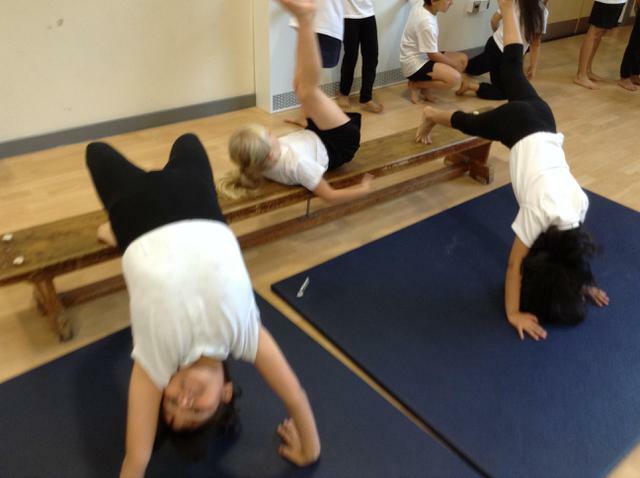 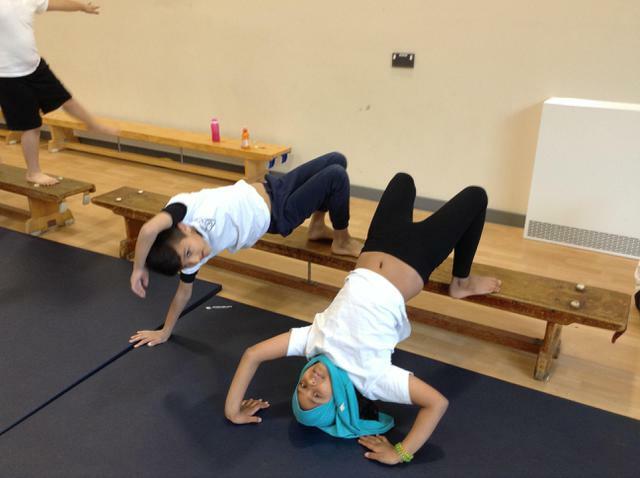 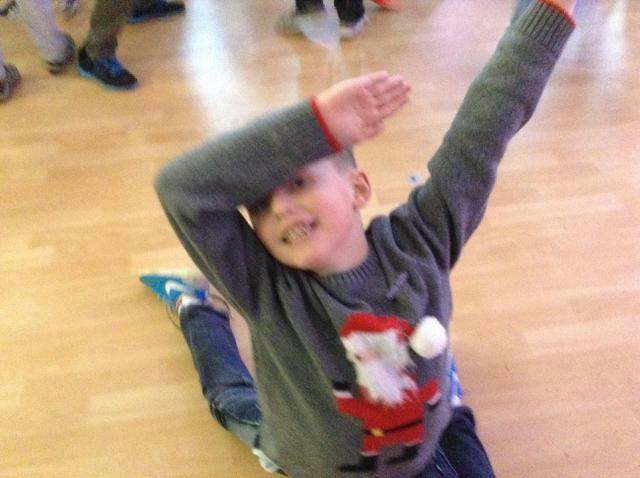 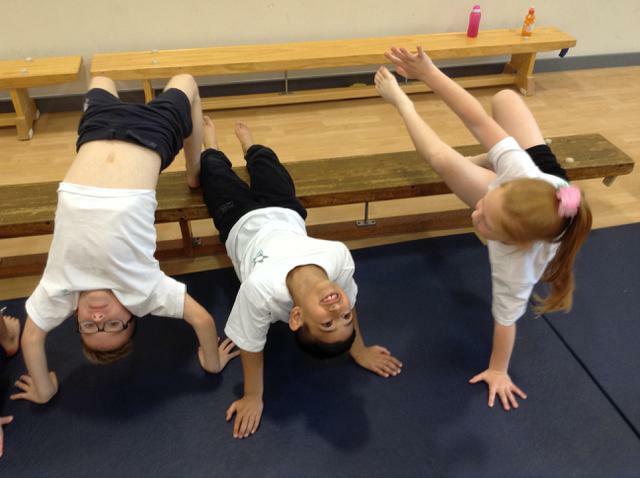 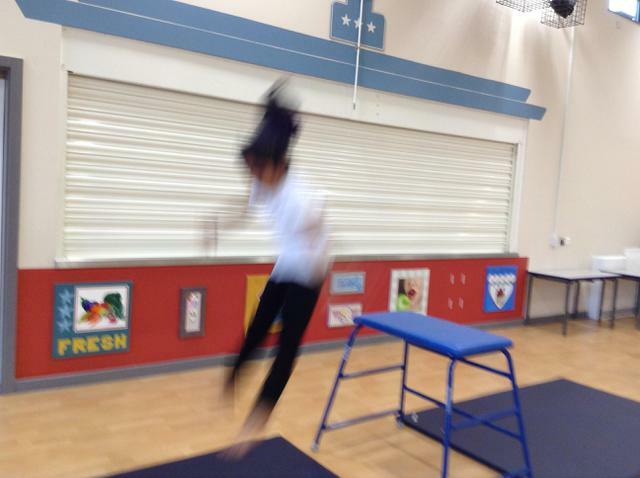 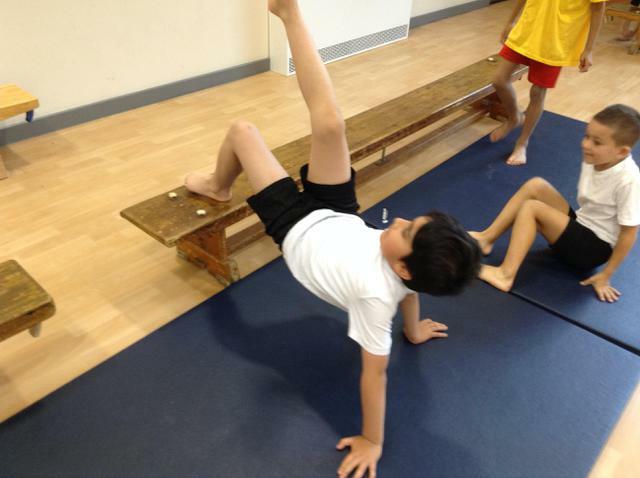 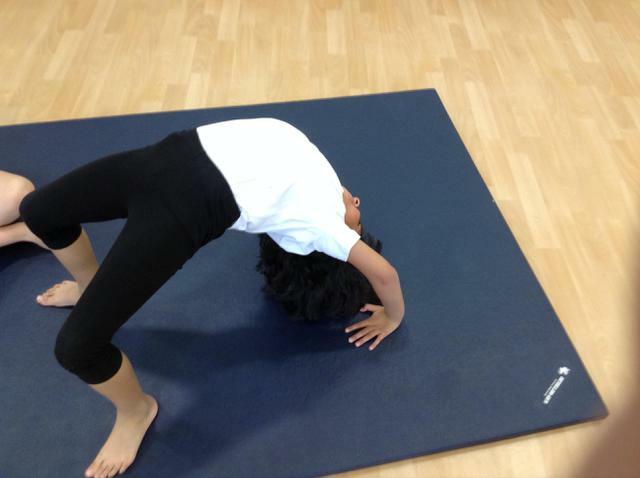 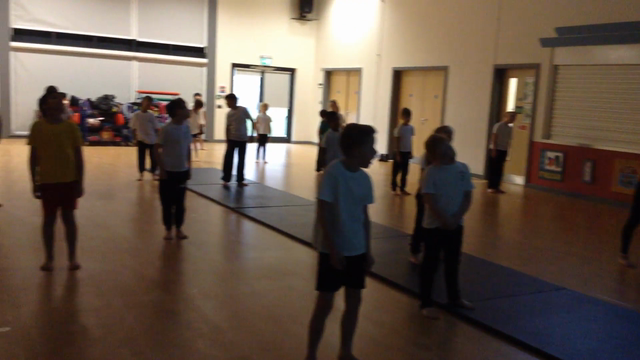 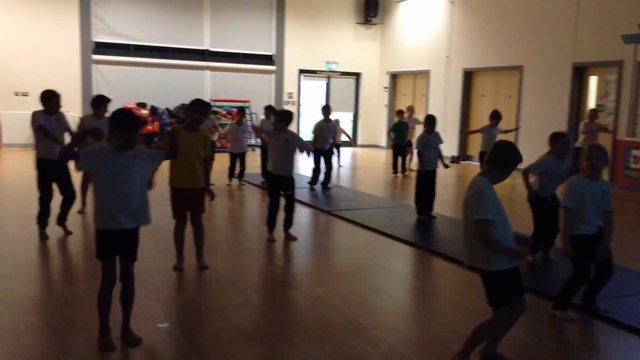 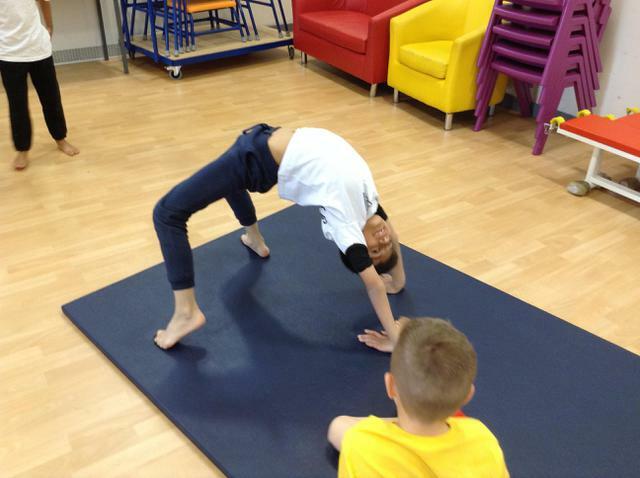 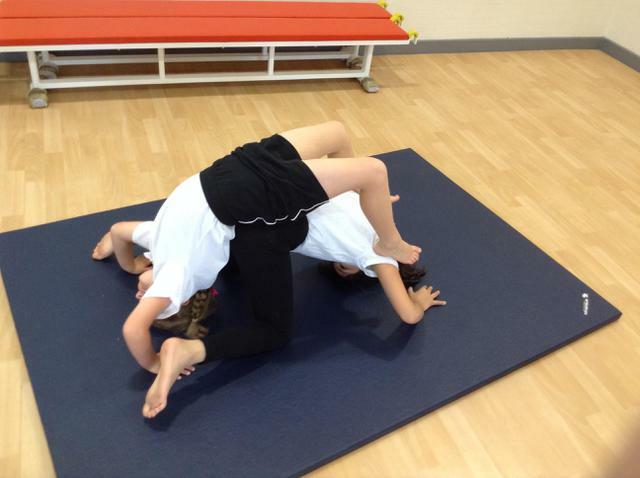 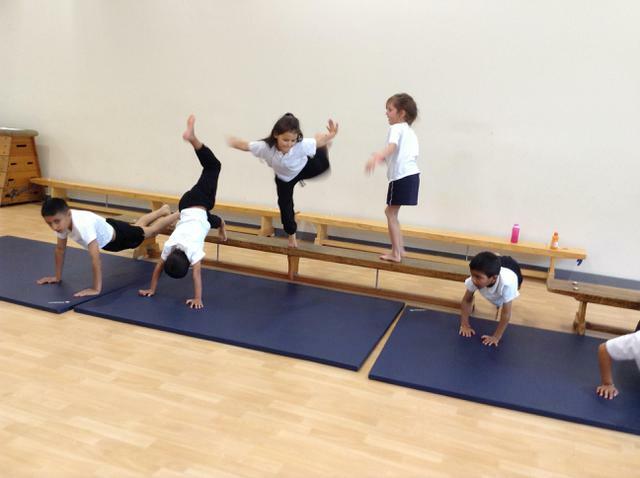 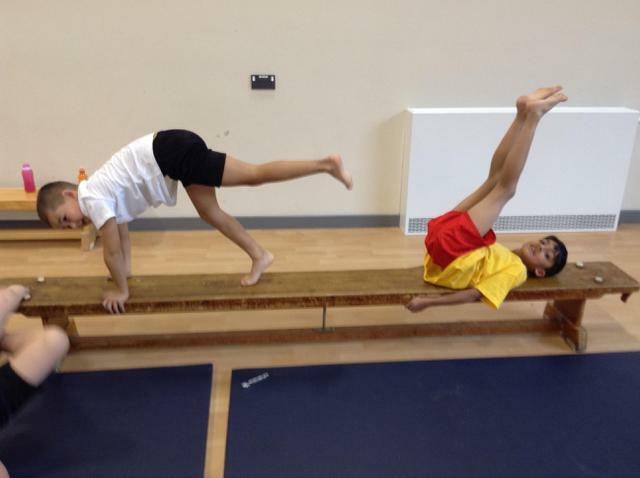 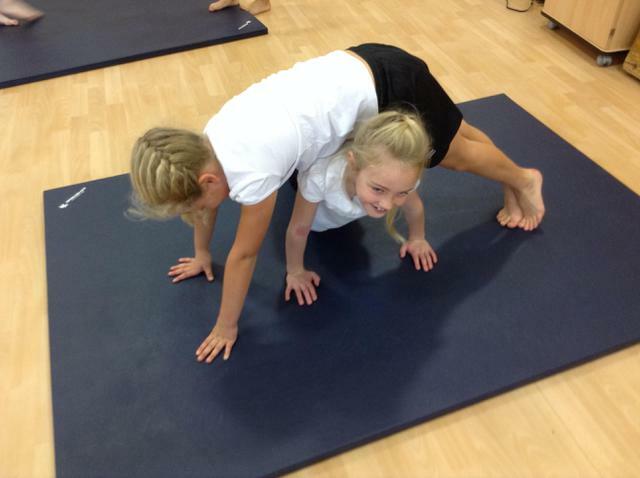 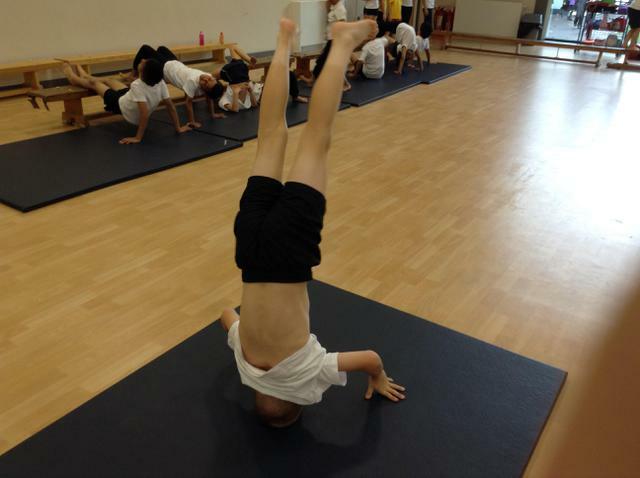 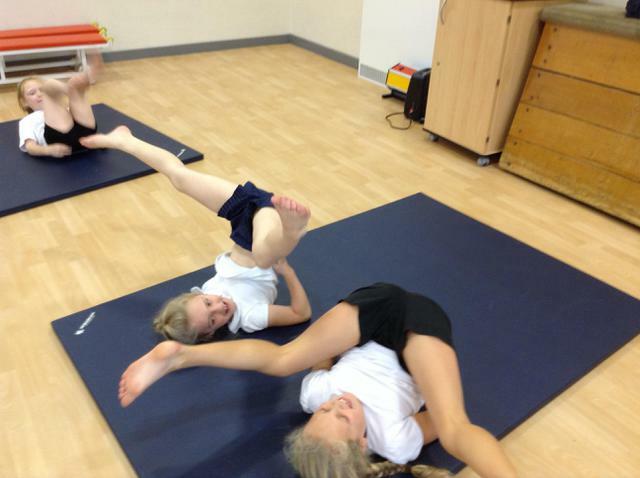 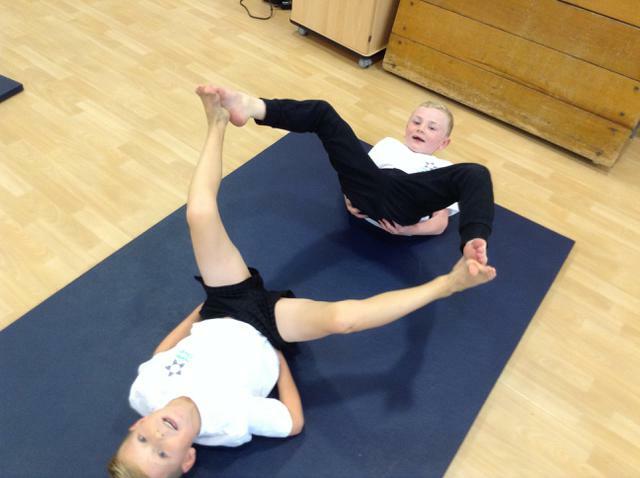 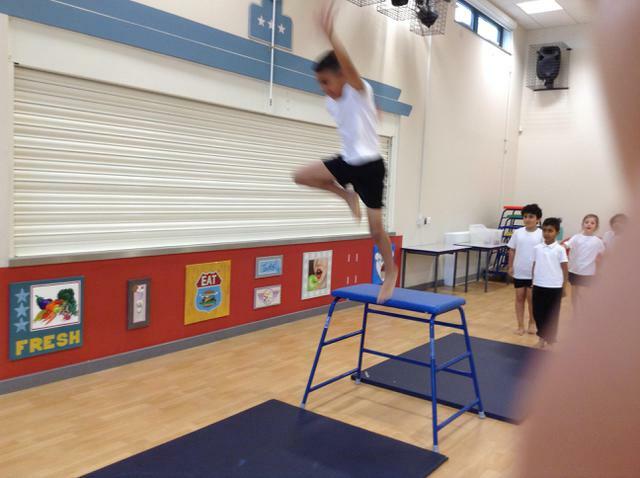 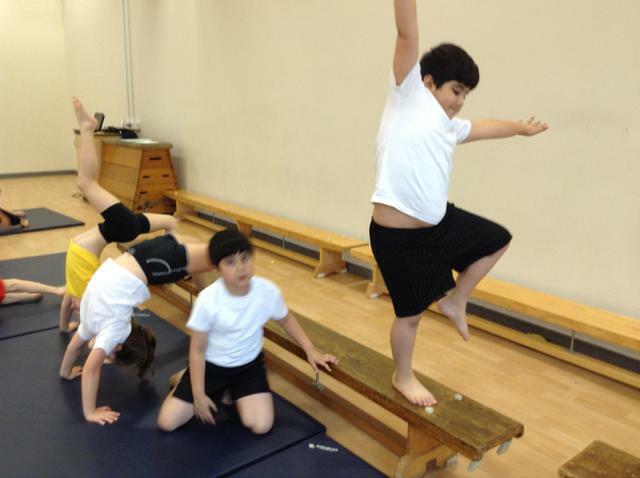 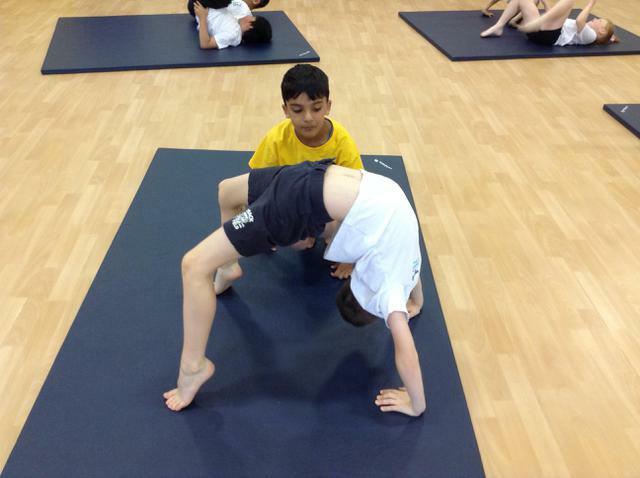 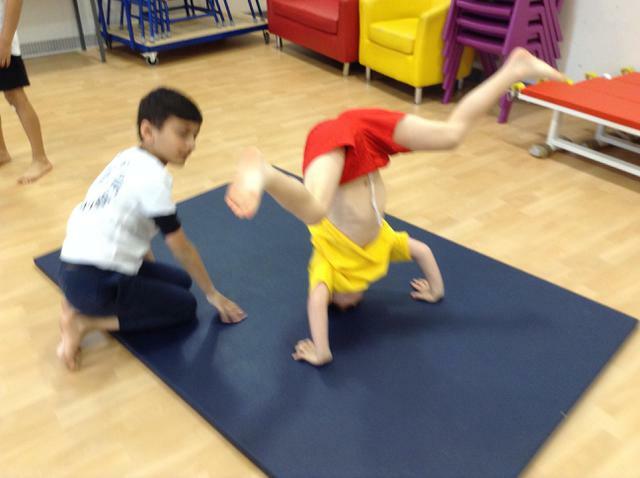 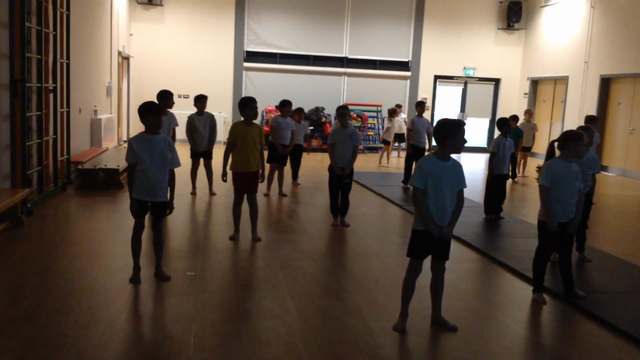 Gymnastics...bending, stretching, curling and travelling. 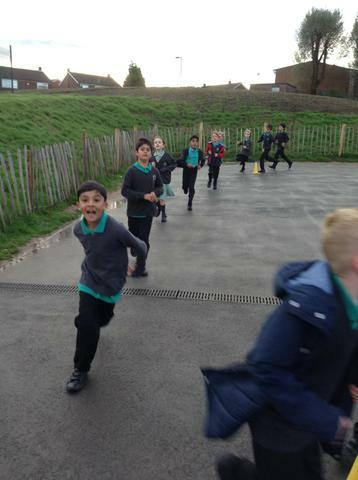 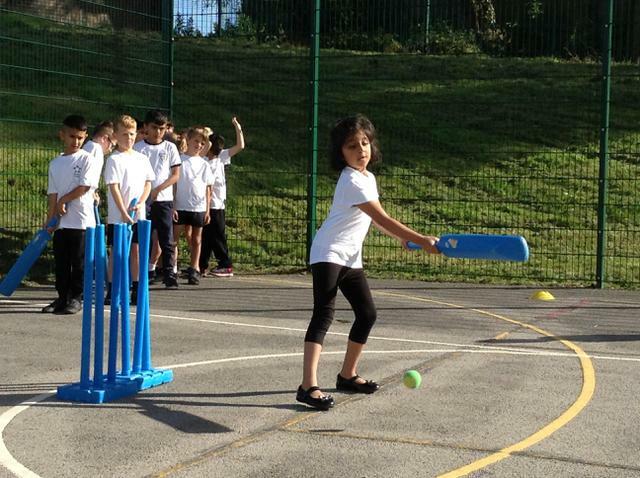 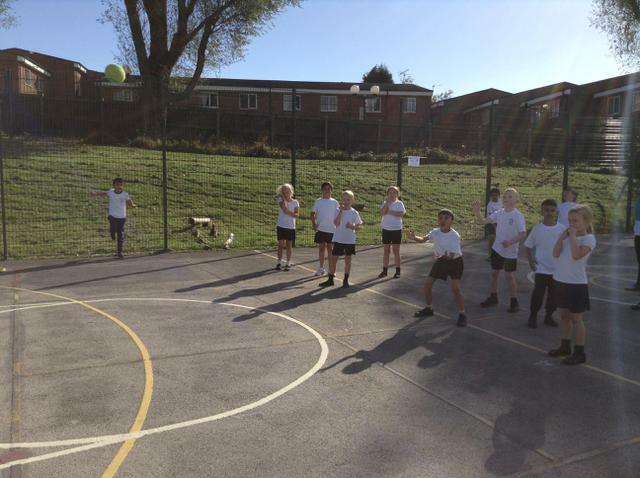 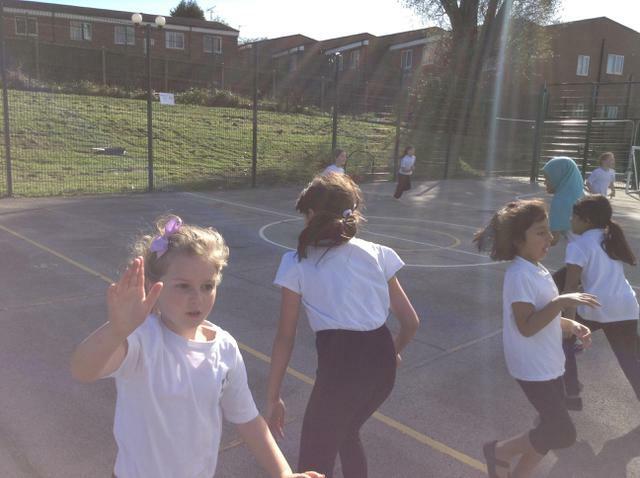 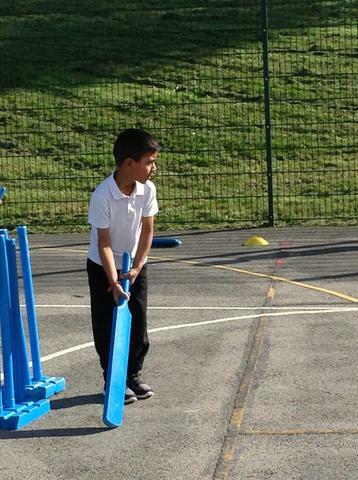 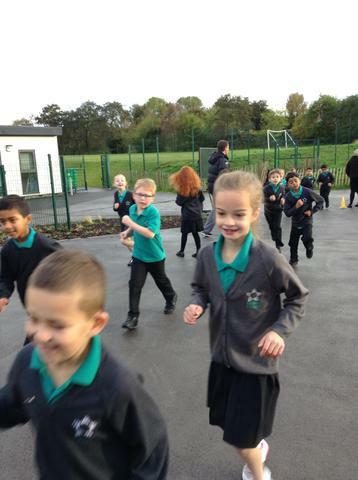 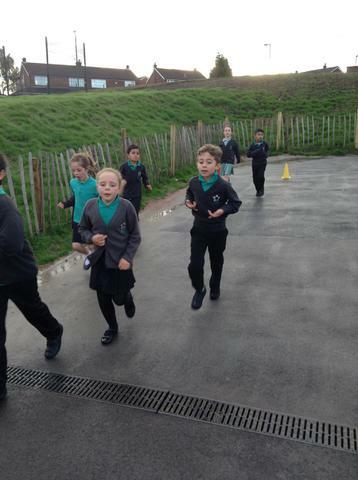 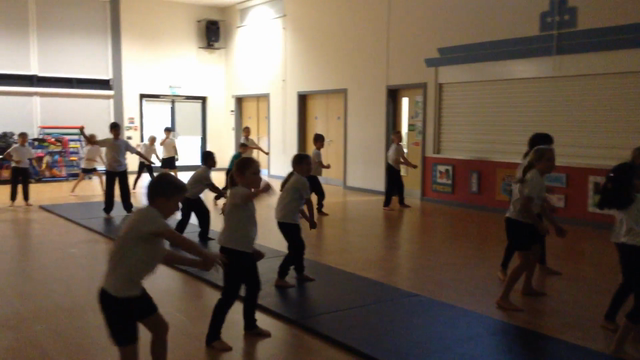 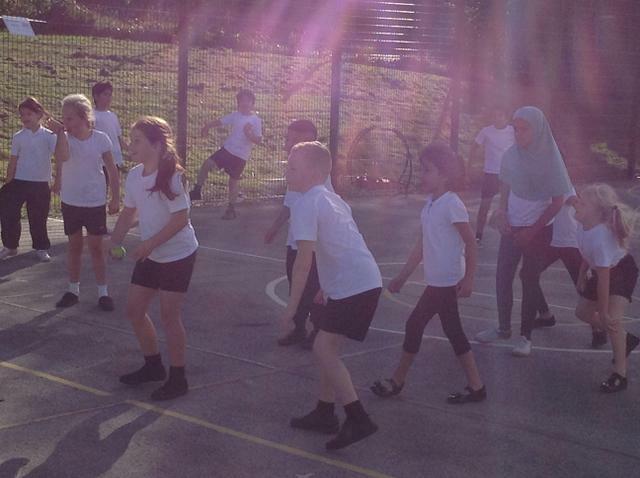 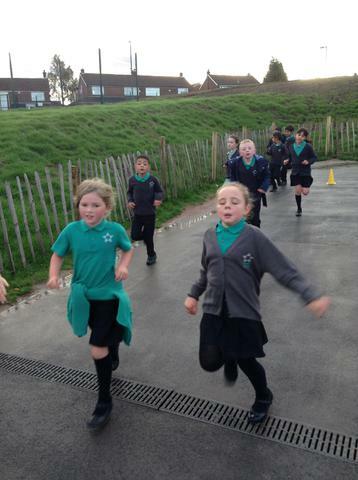 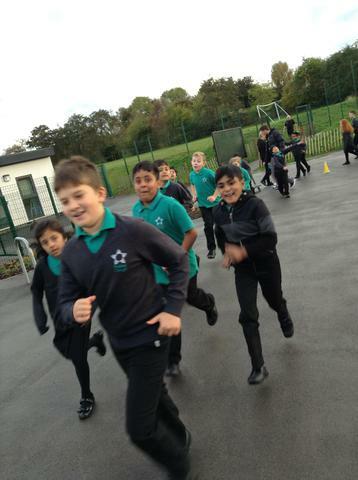 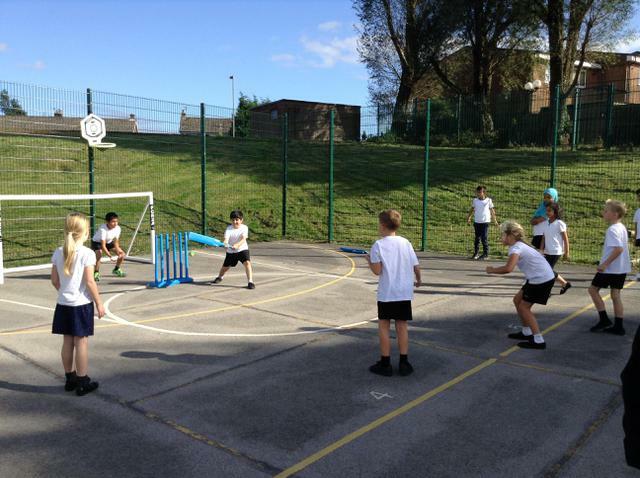 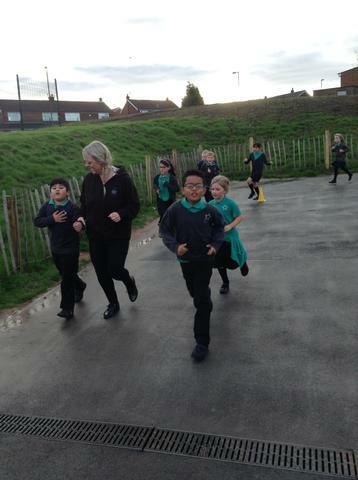 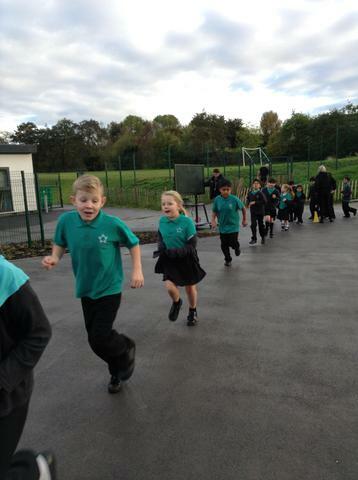 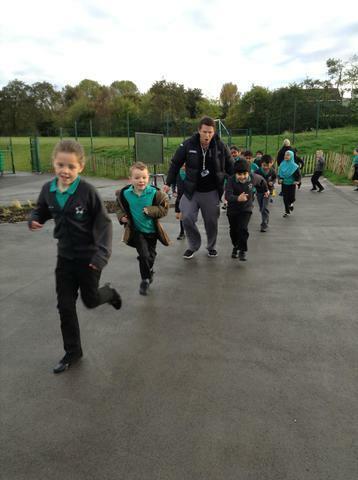 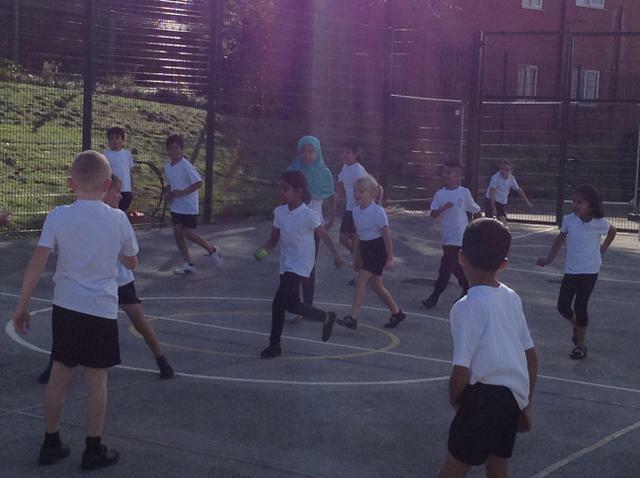 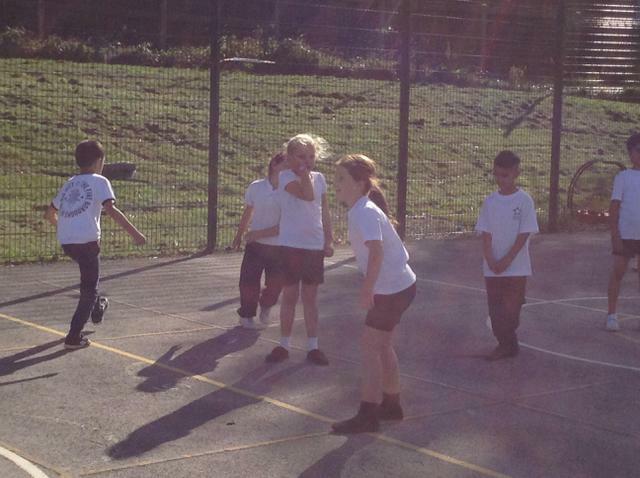 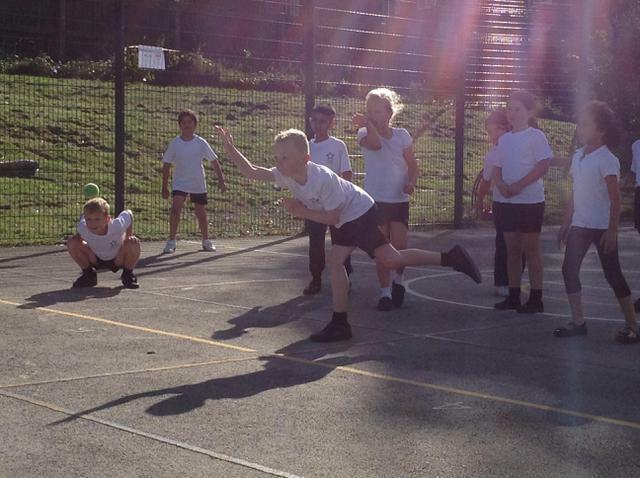 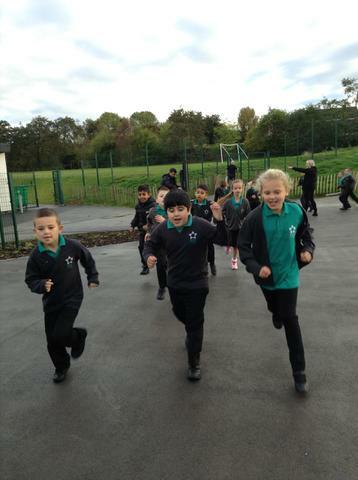 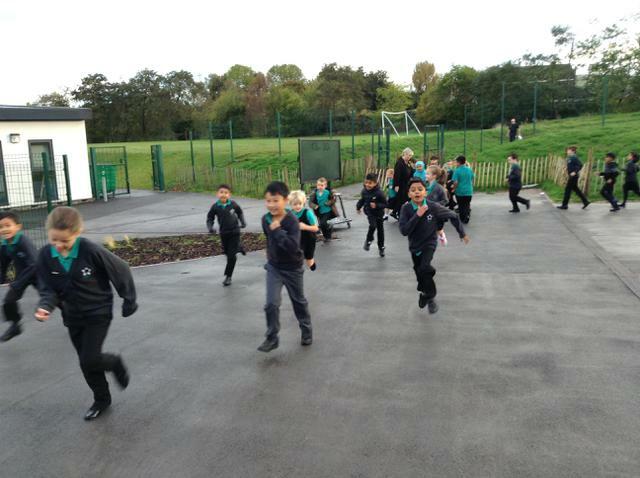 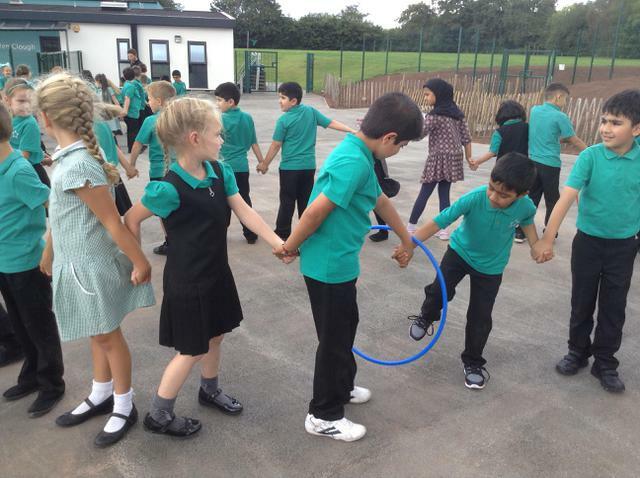 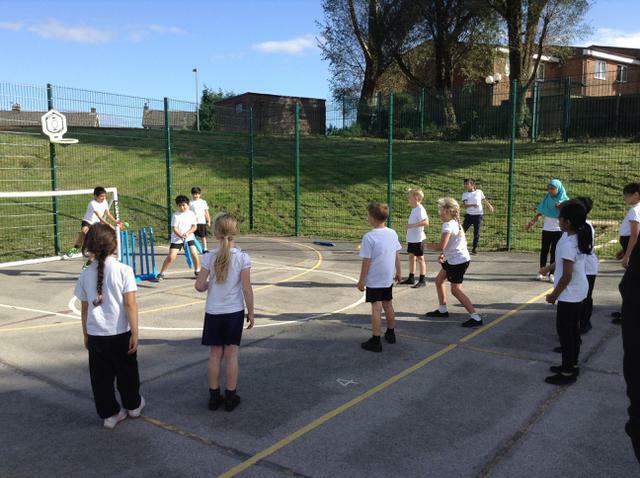 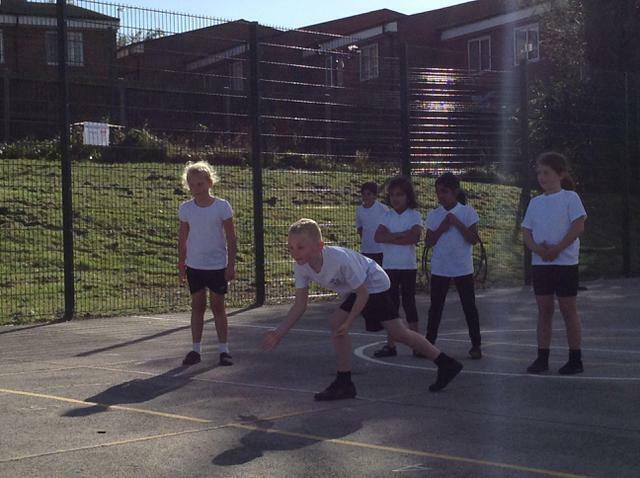 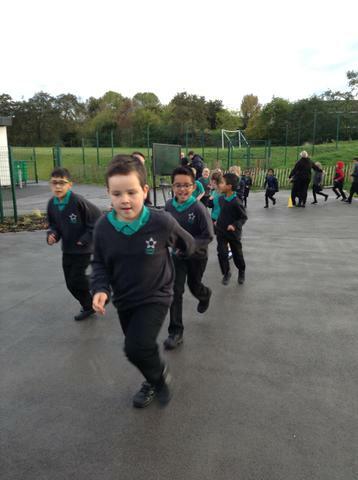 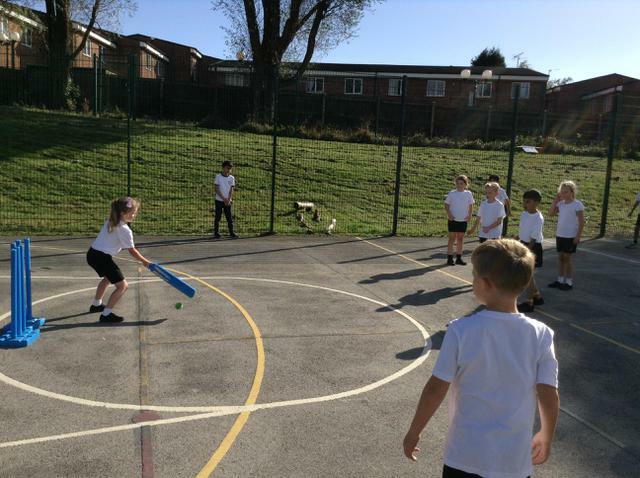 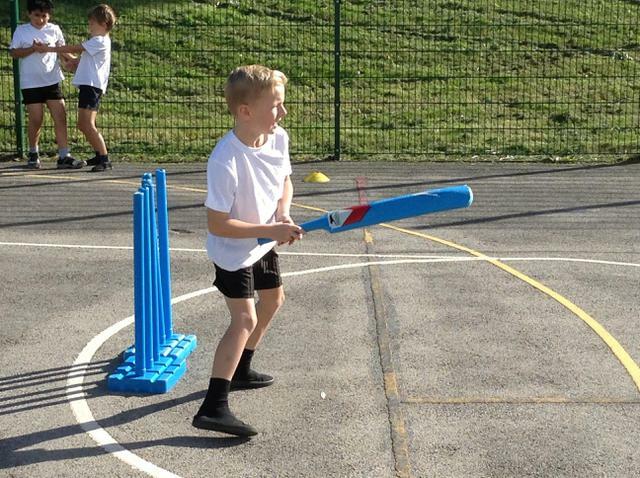 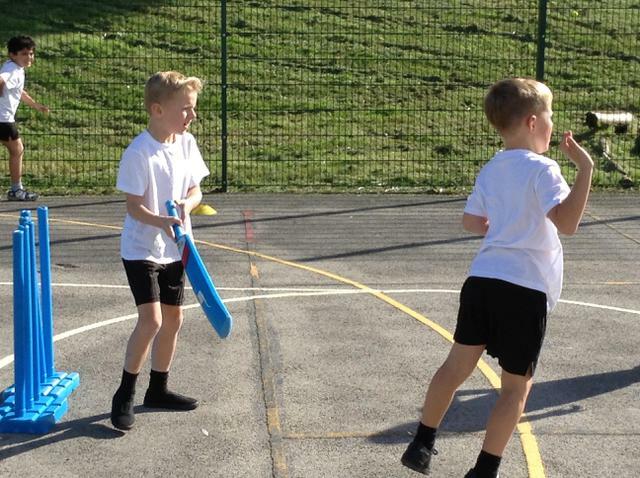 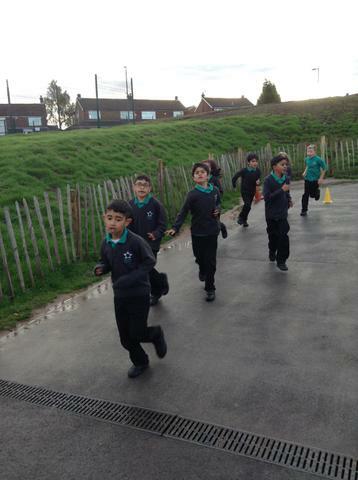 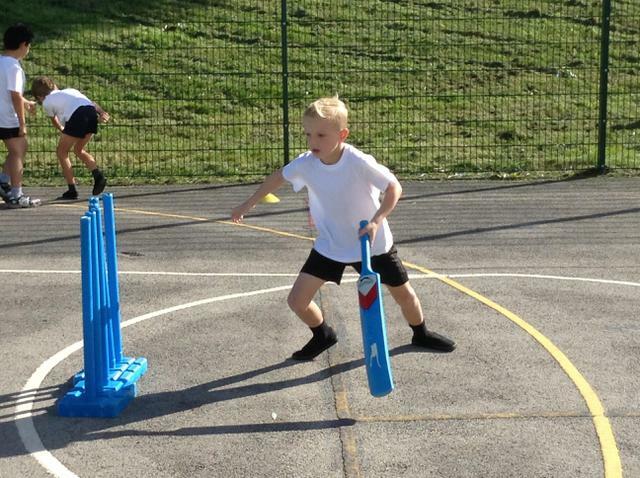 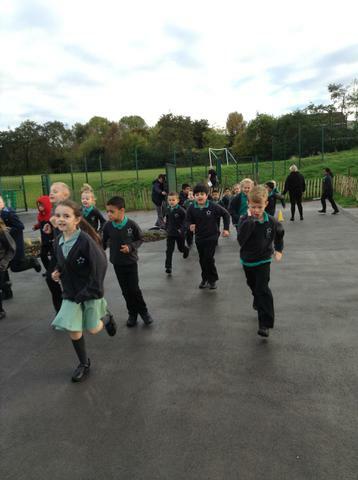 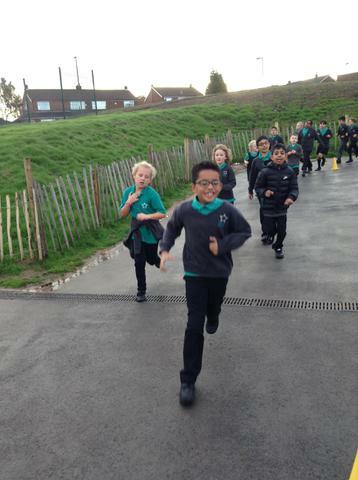 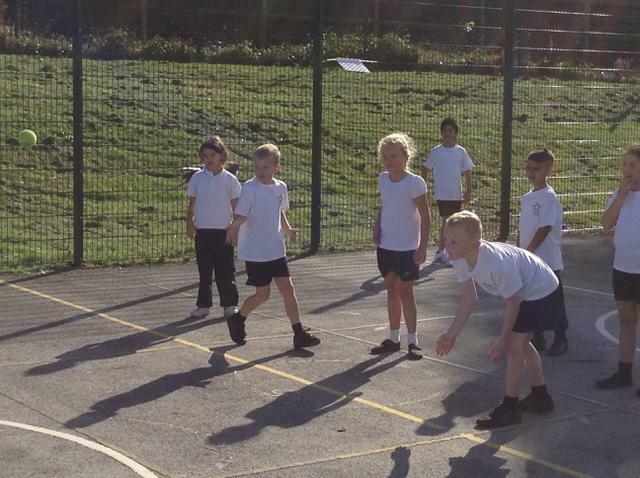 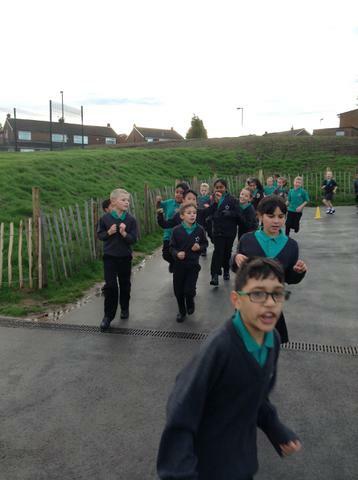 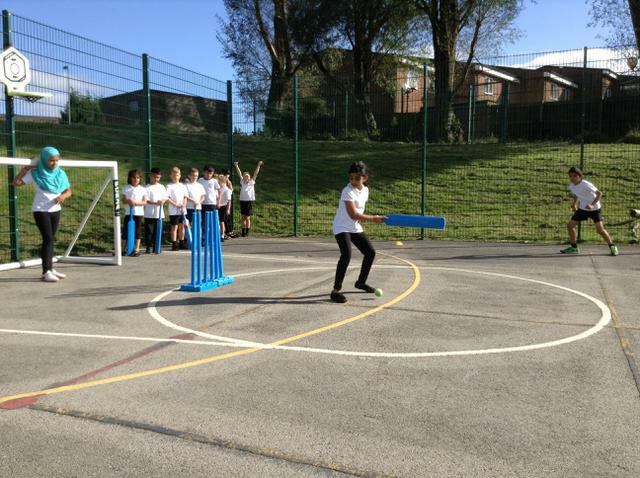 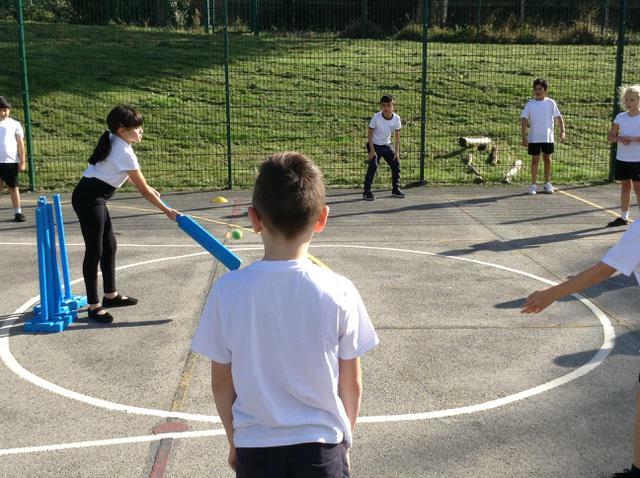 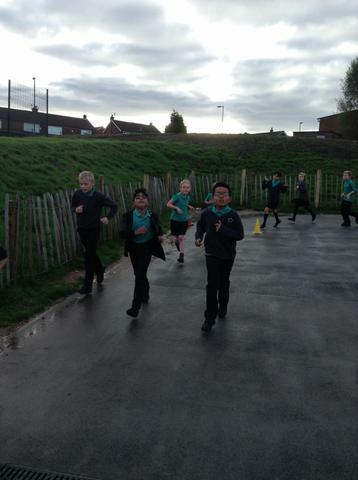 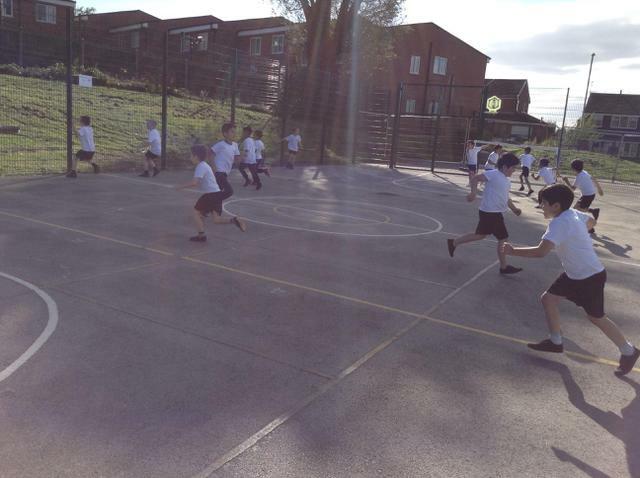 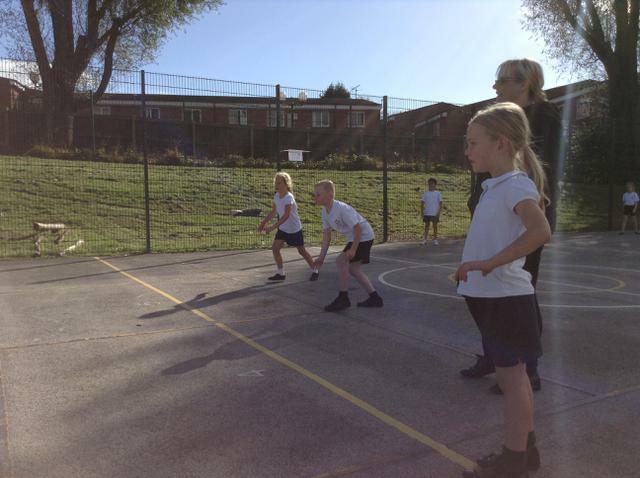 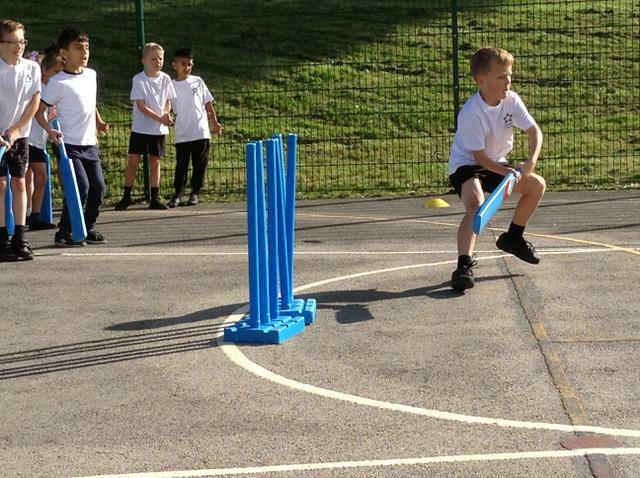 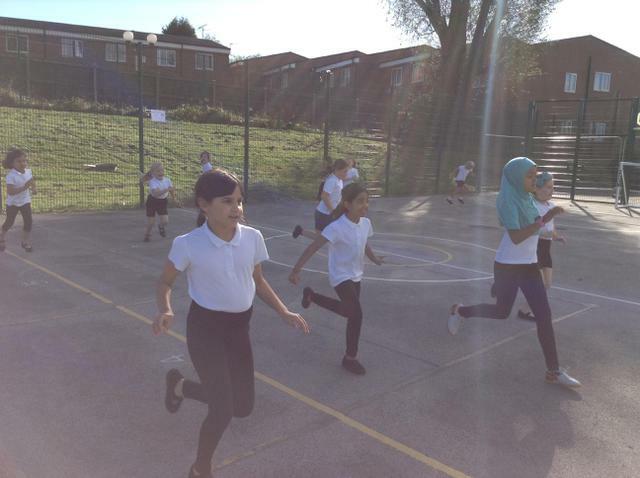 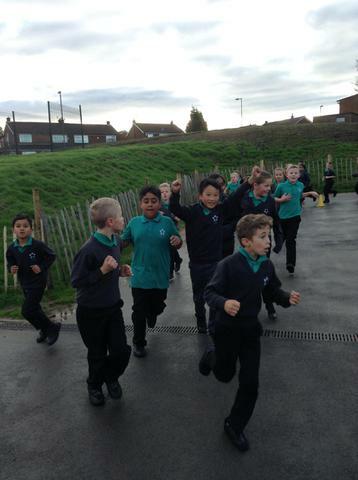 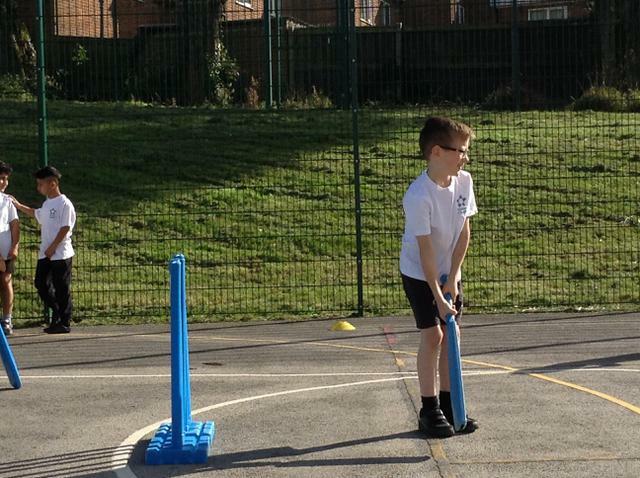 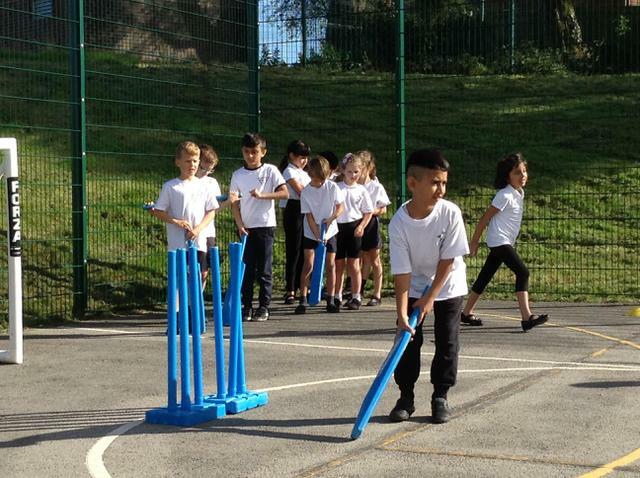 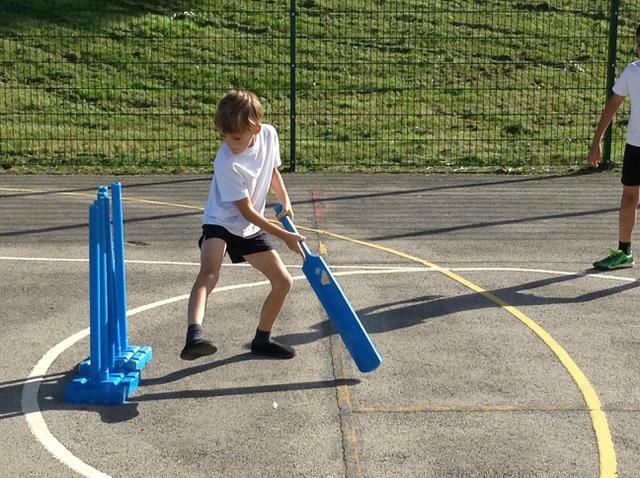 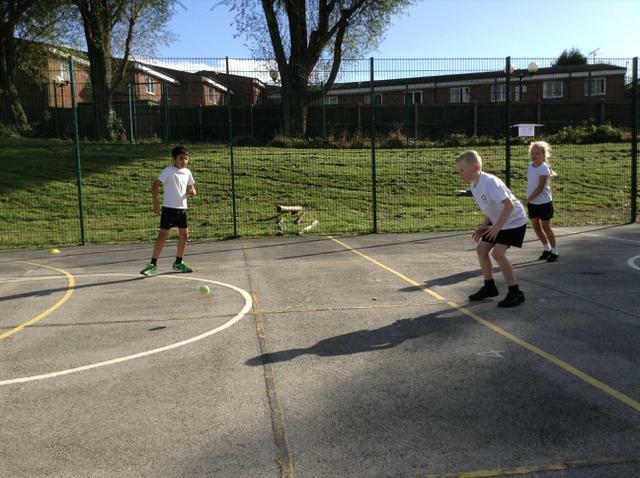 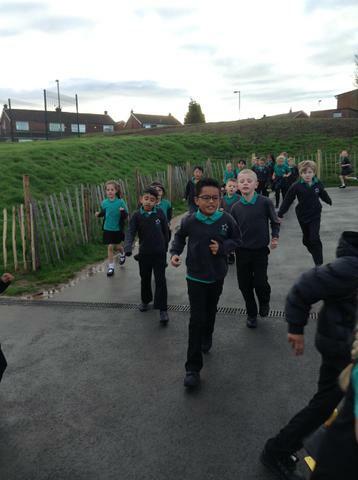 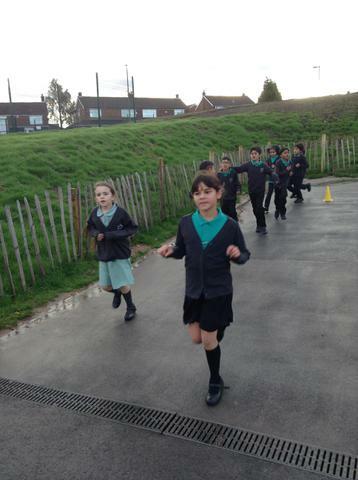 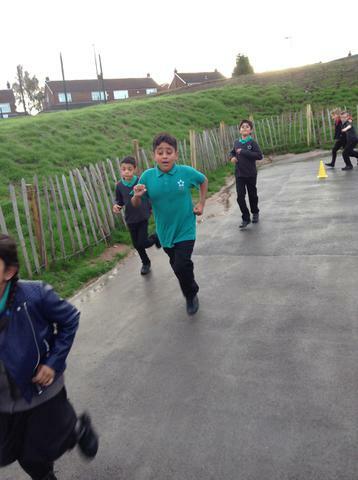 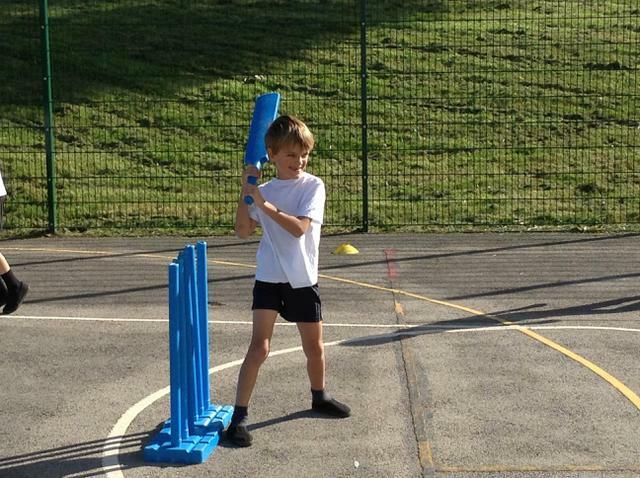 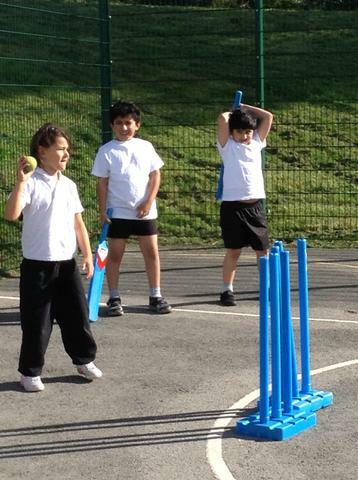 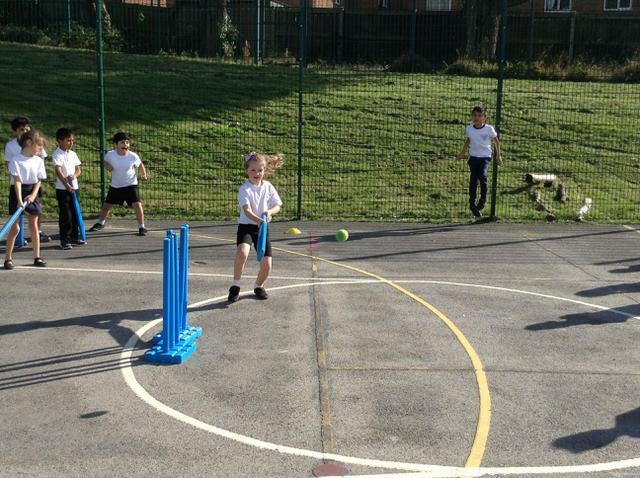 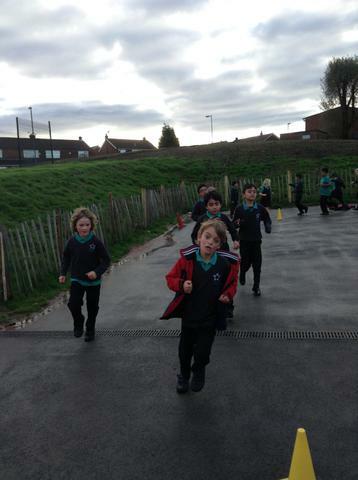 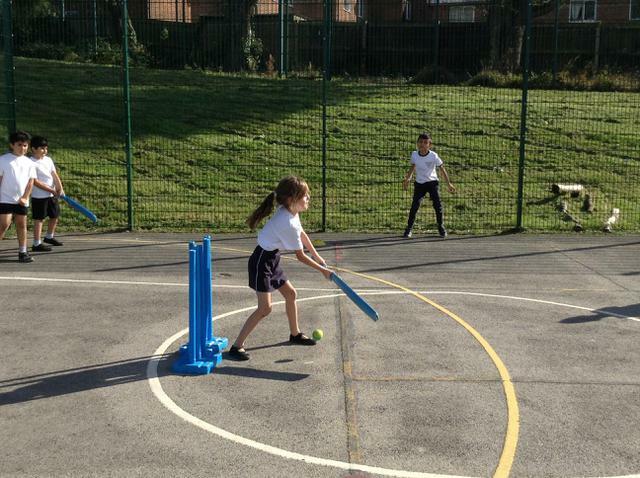 Year 3 enjoying a game of quick cricket in PE. 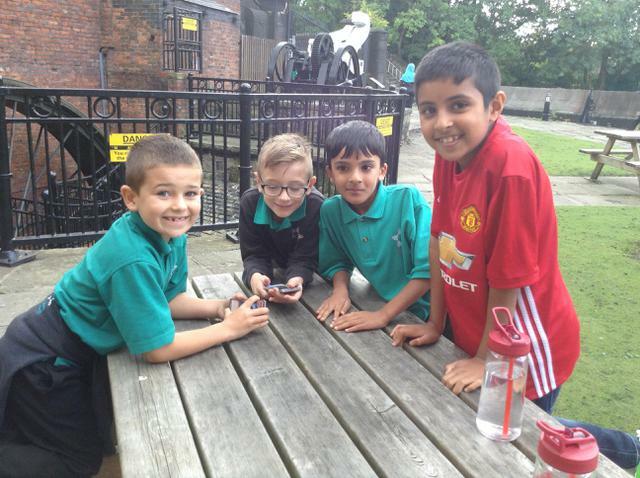 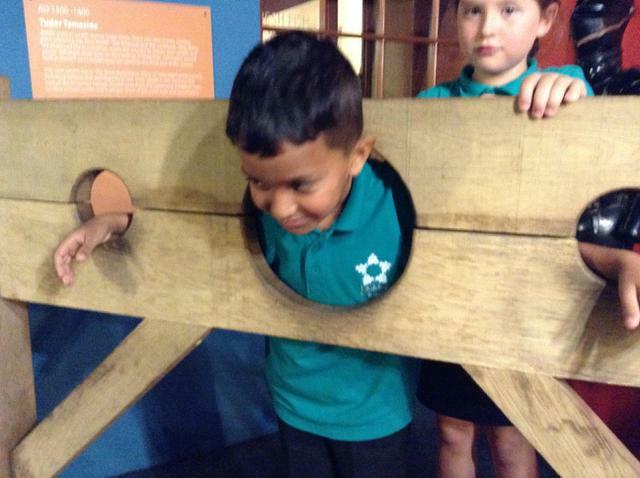 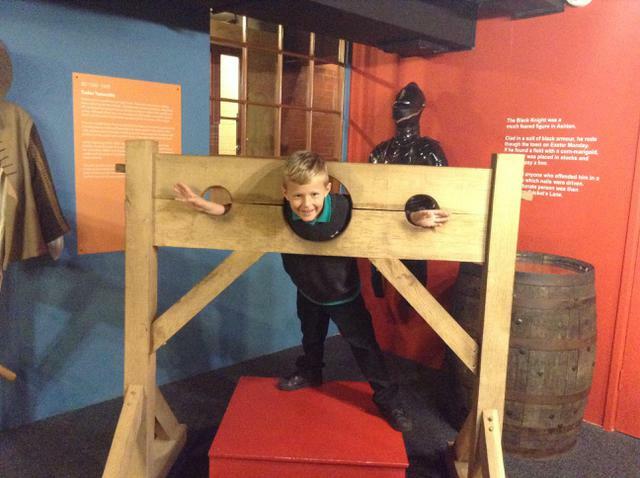 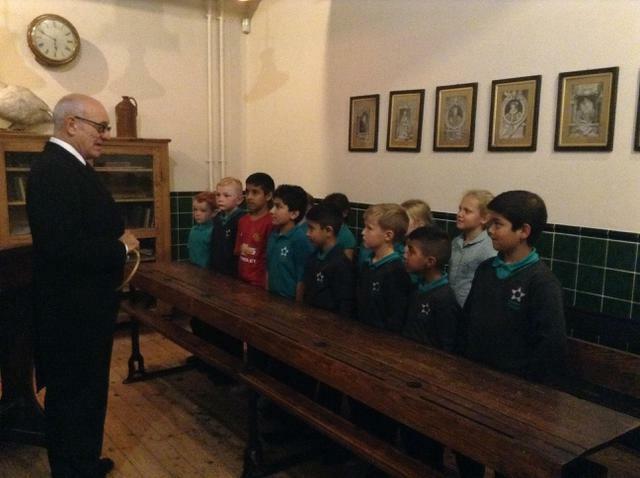 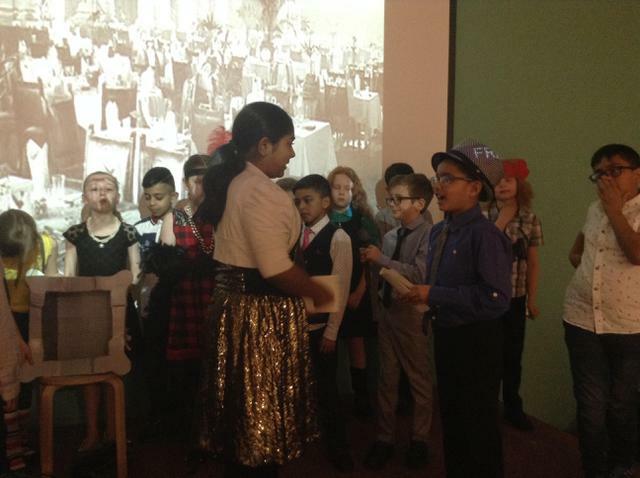 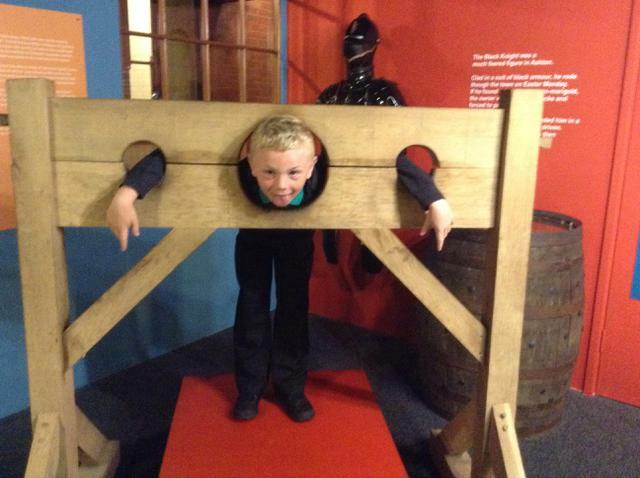 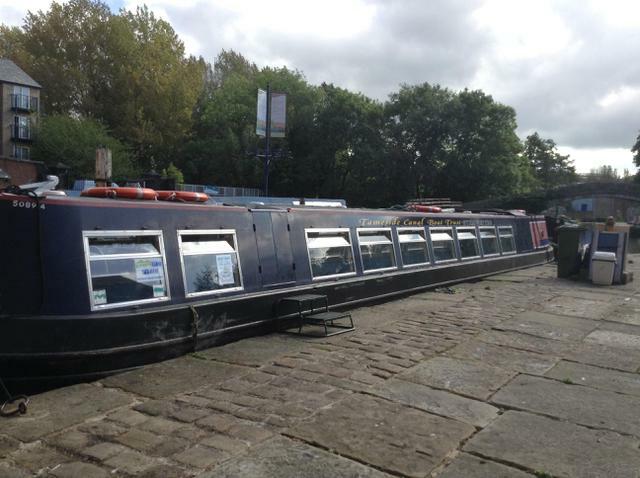 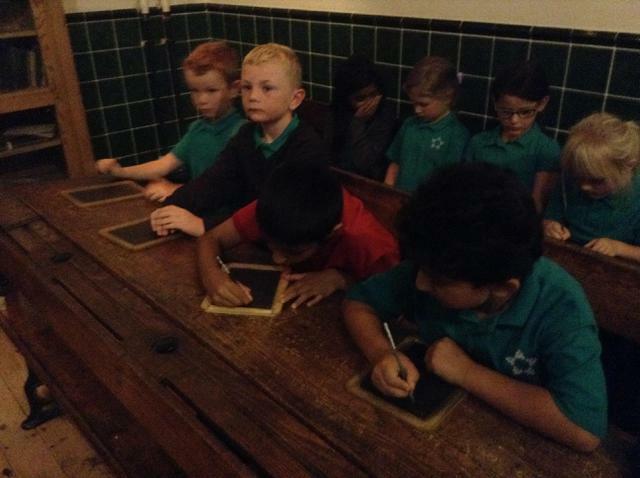 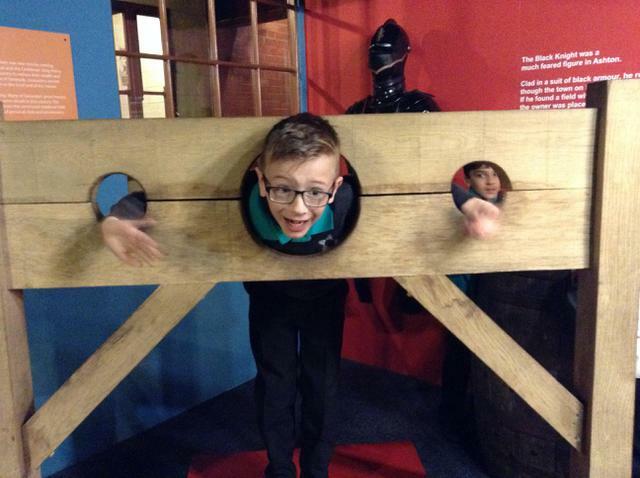 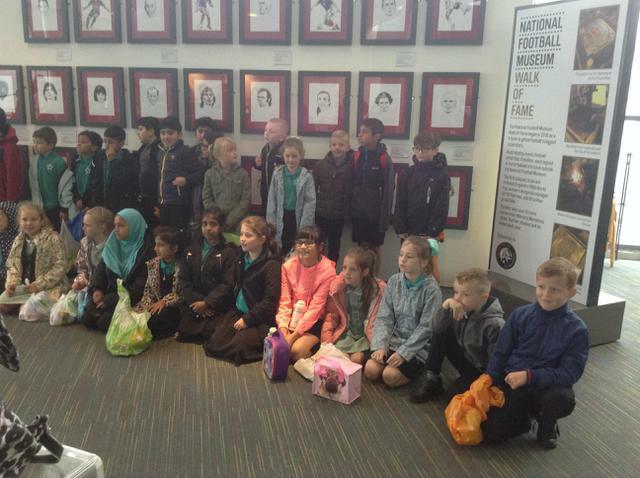 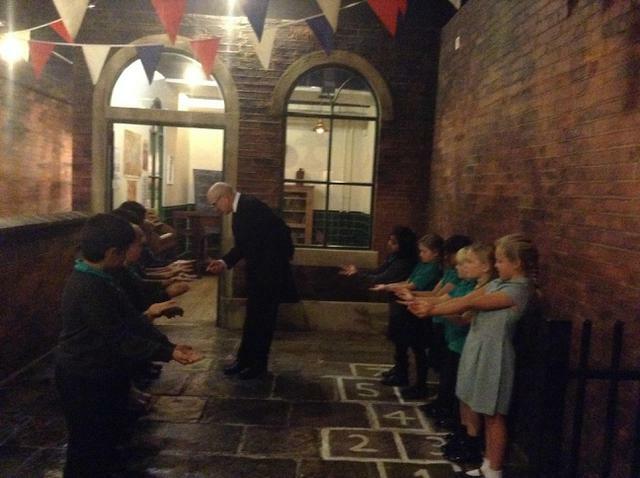 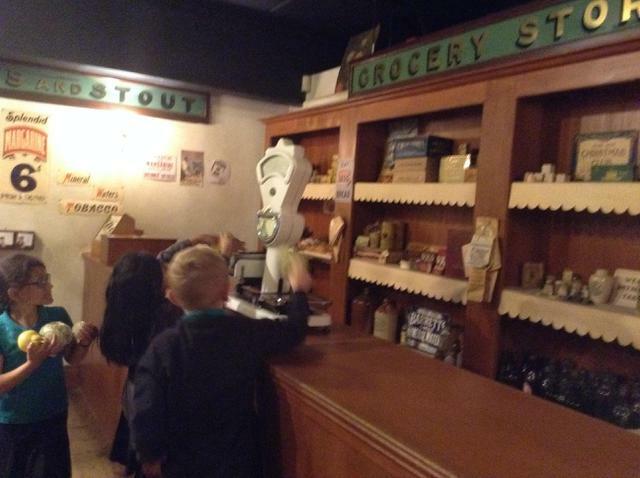 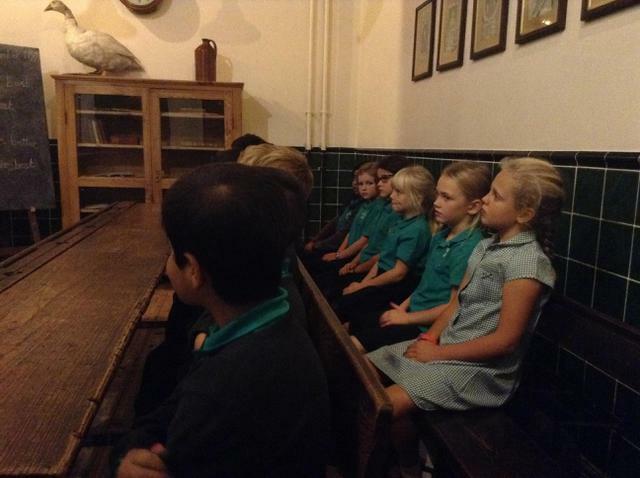 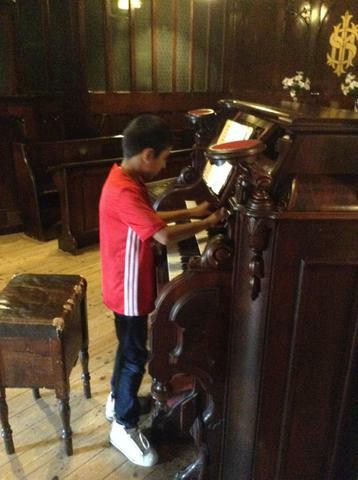 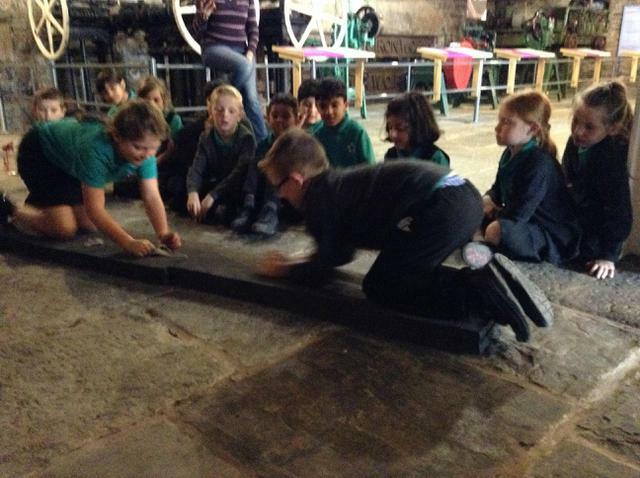 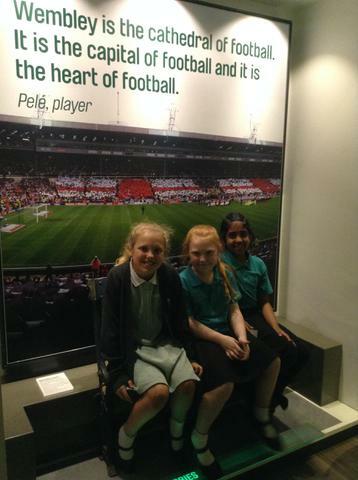 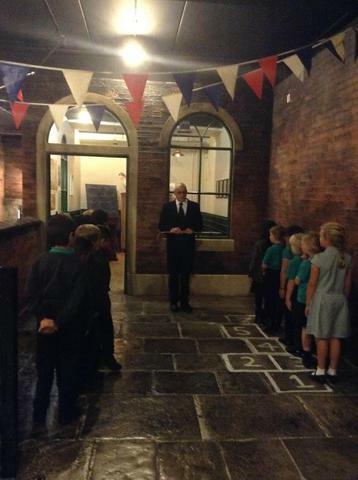 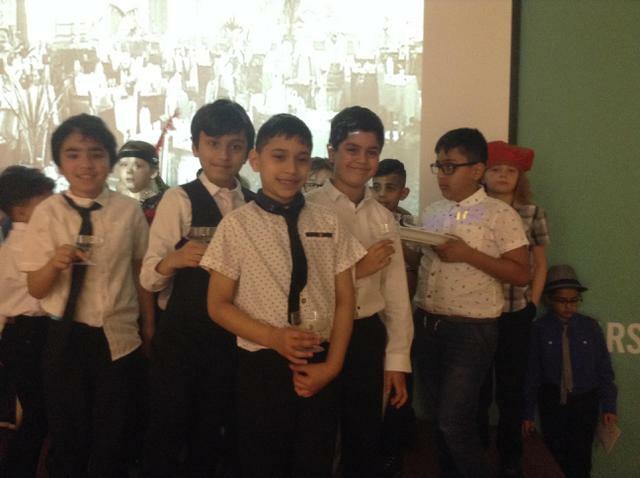 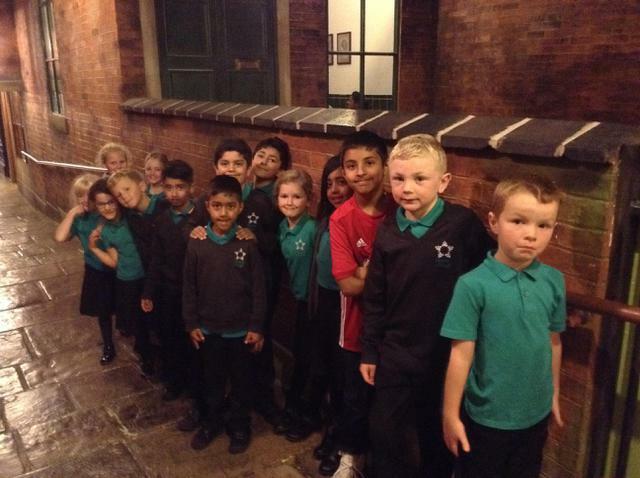 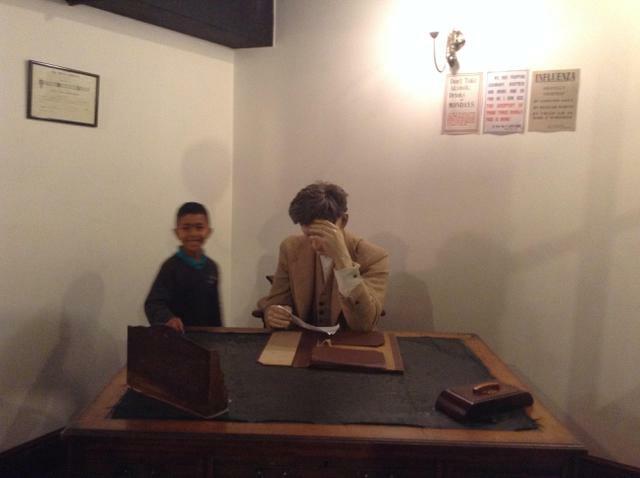 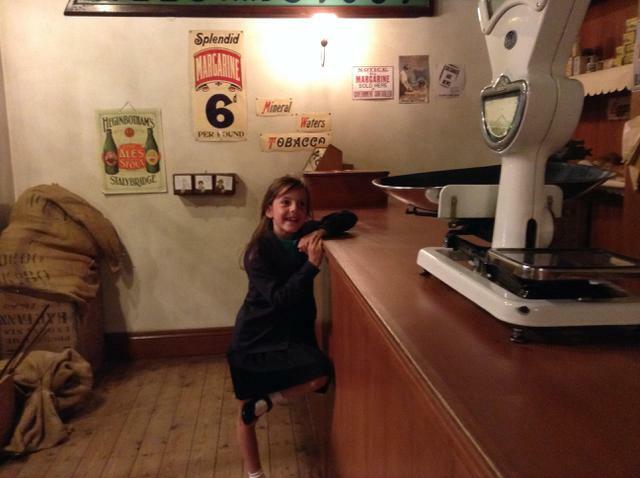 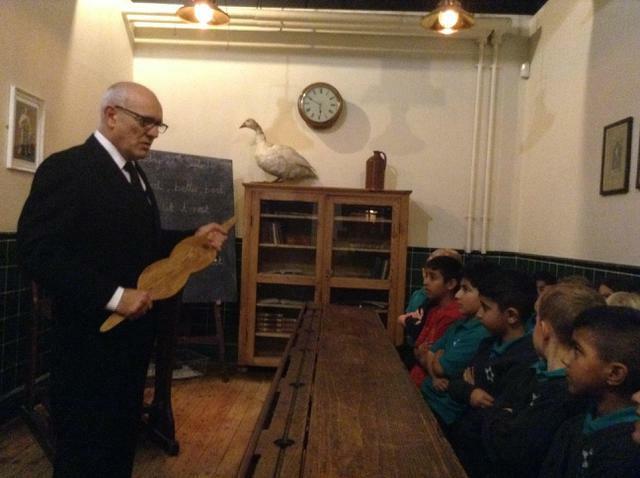 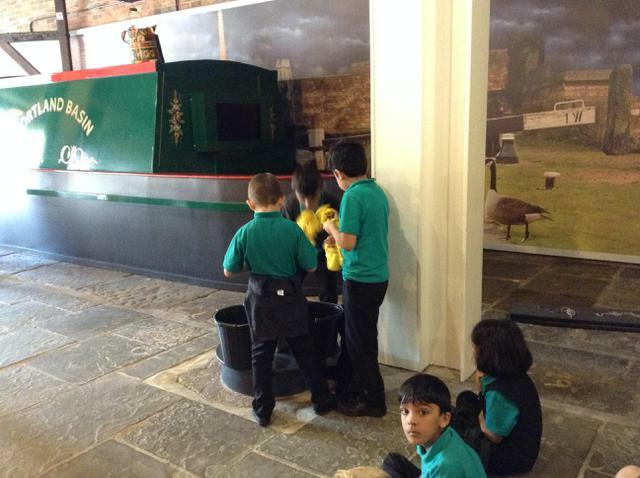 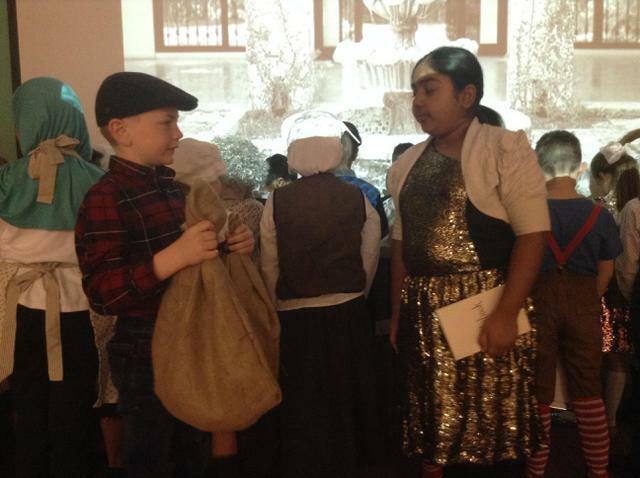 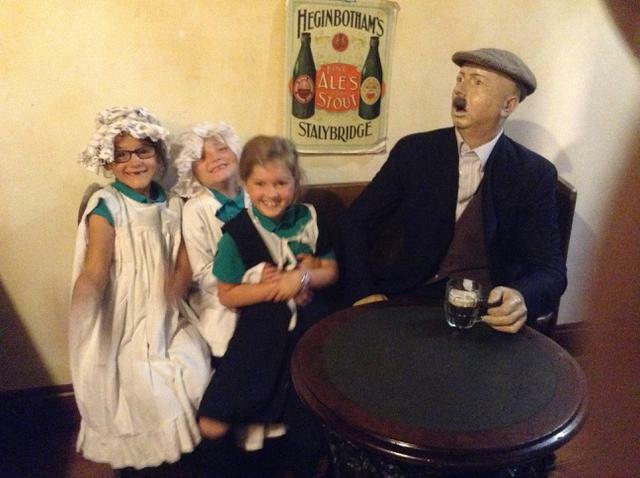 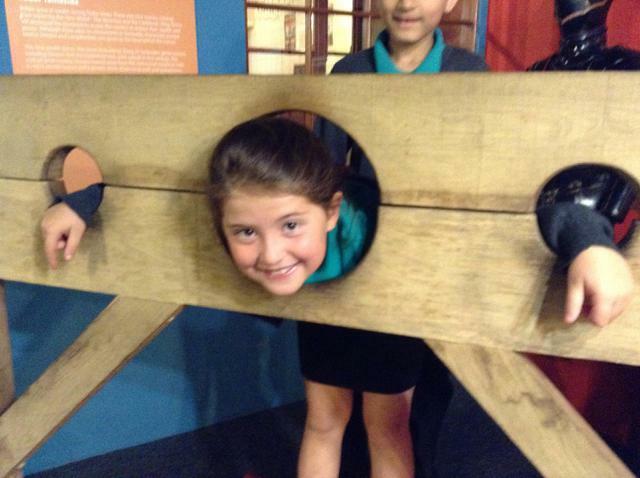 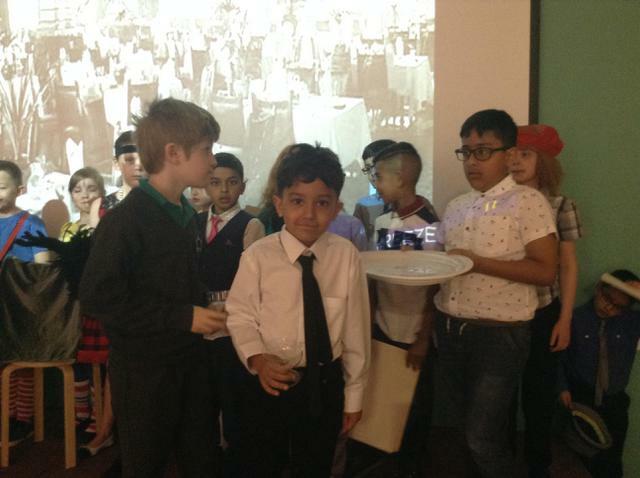 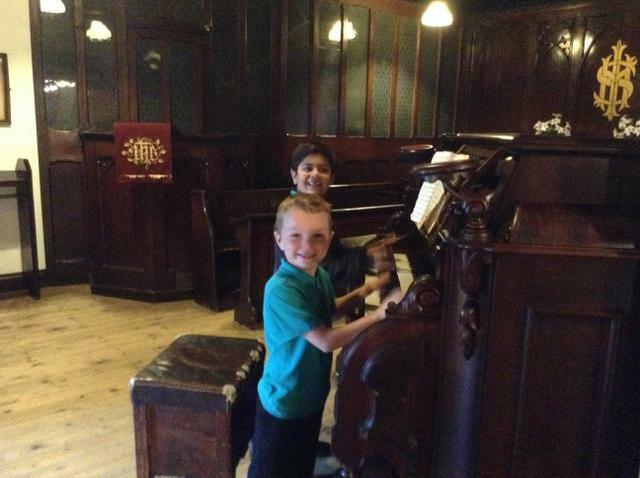 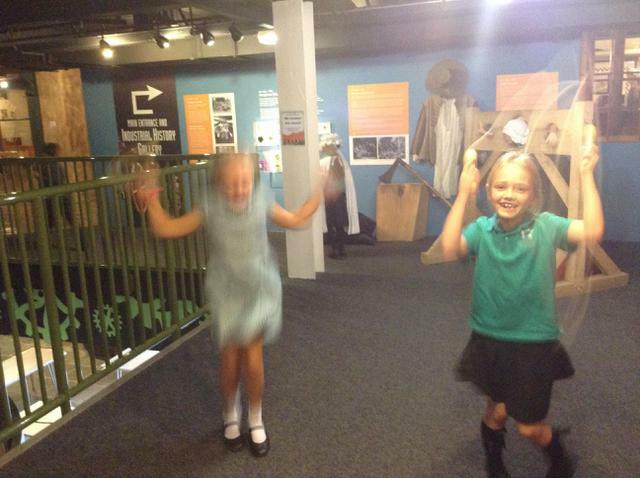 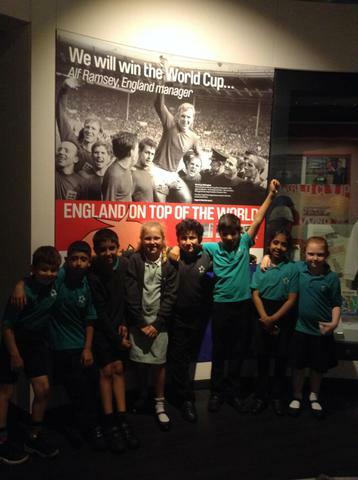 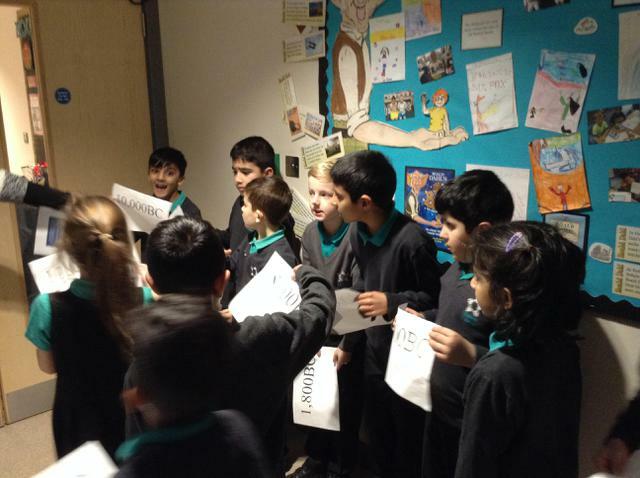 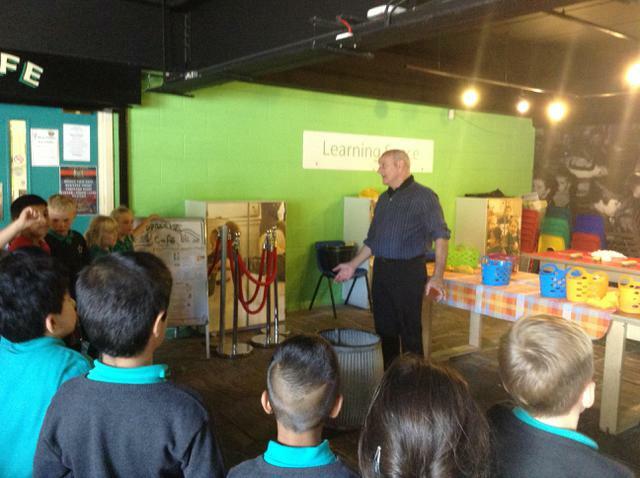 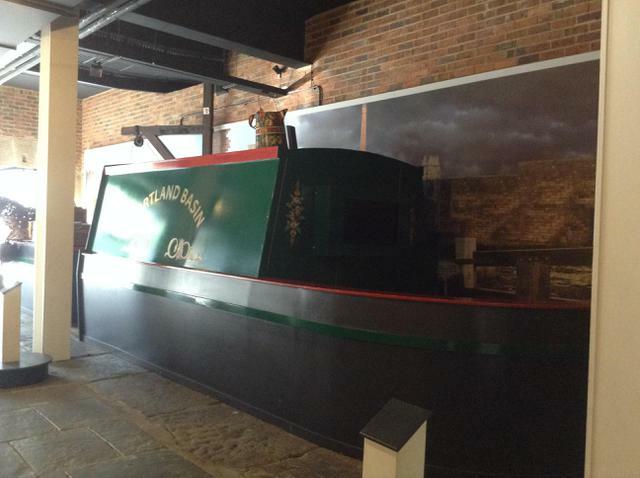 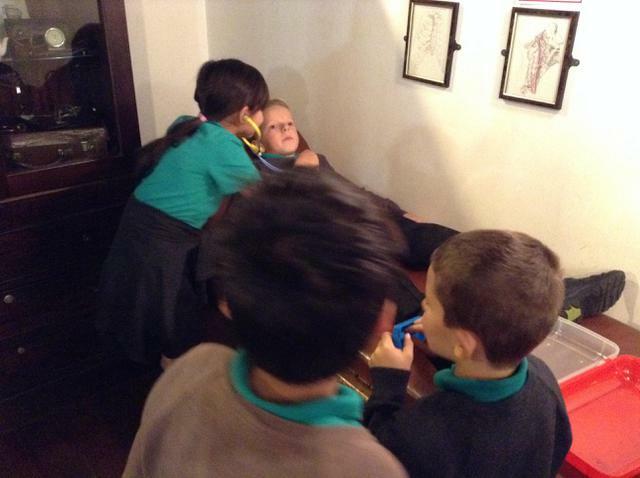 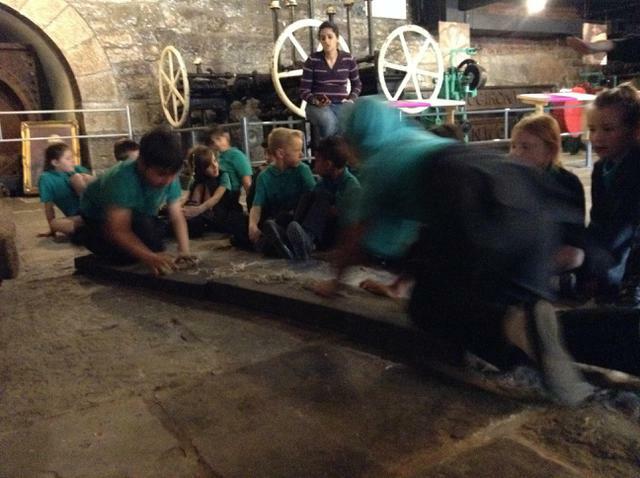 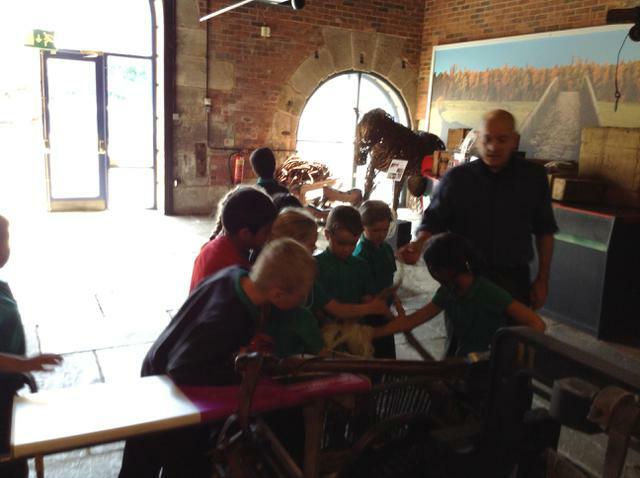 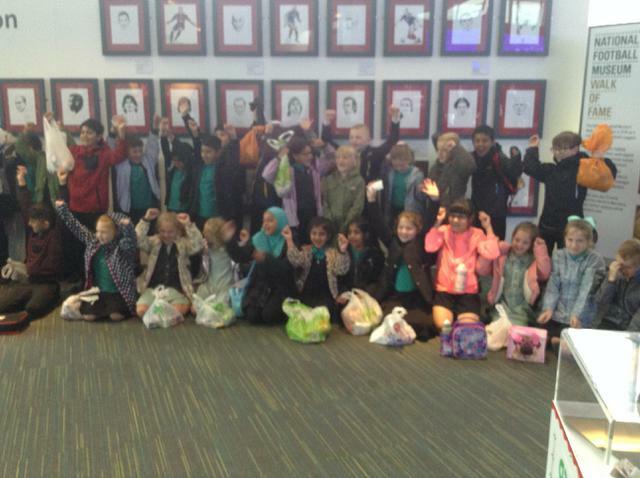 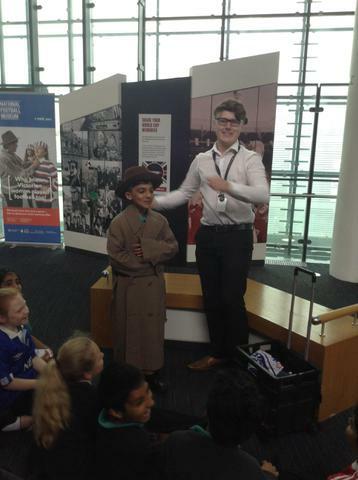 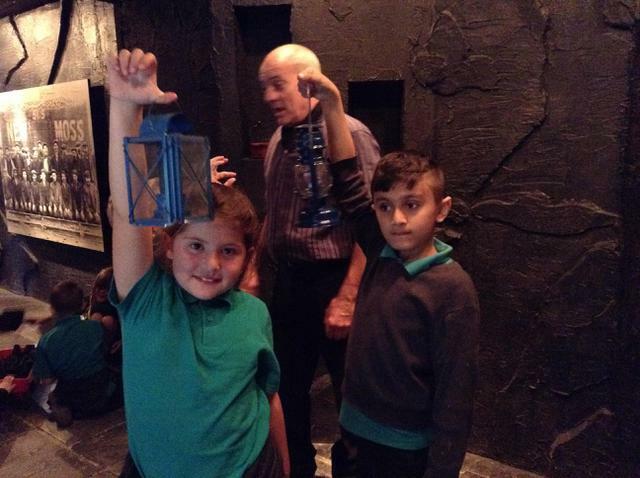 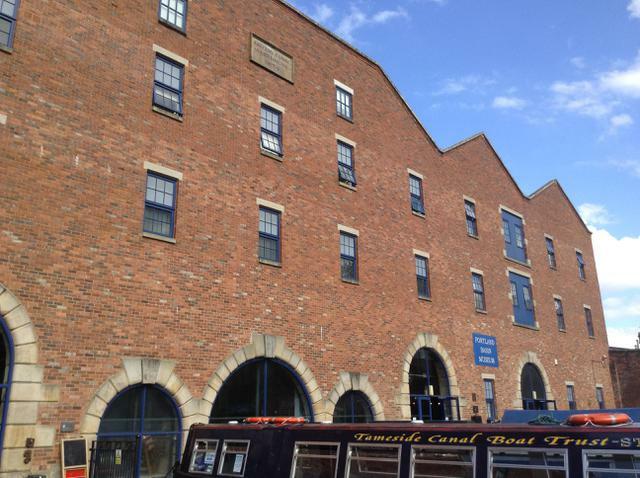 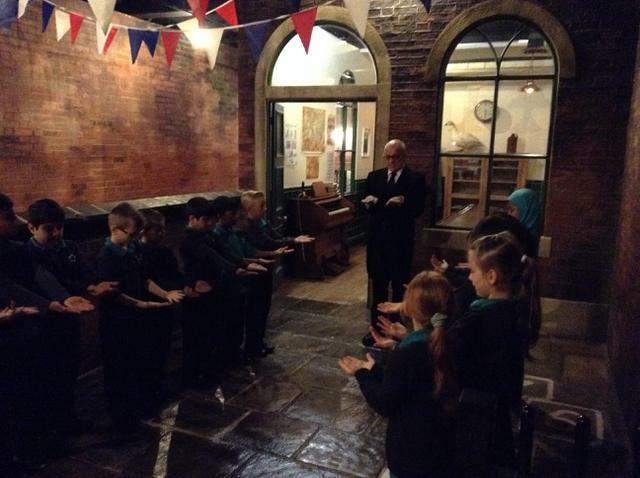 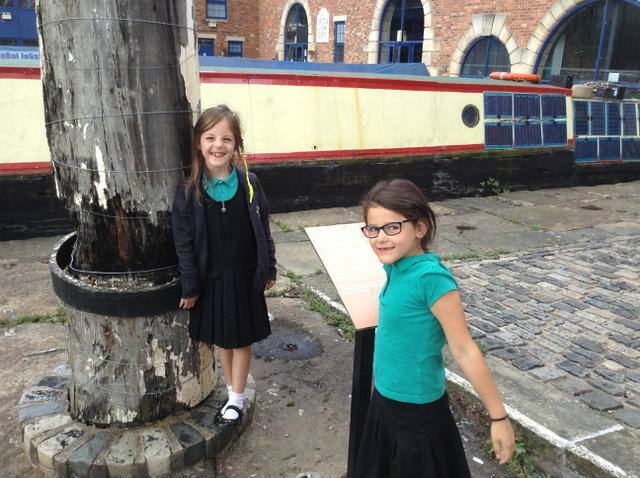 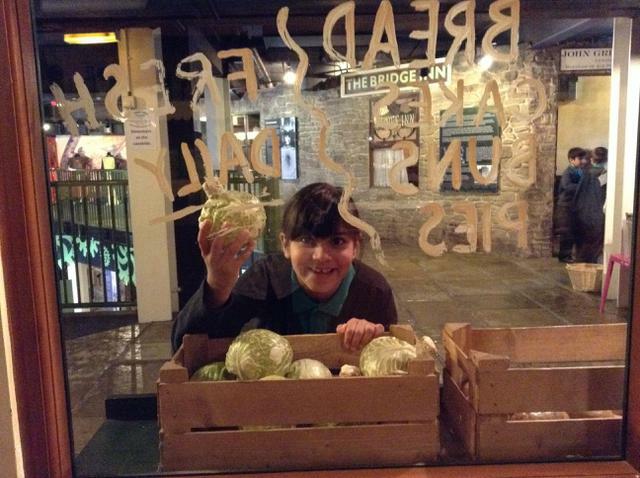 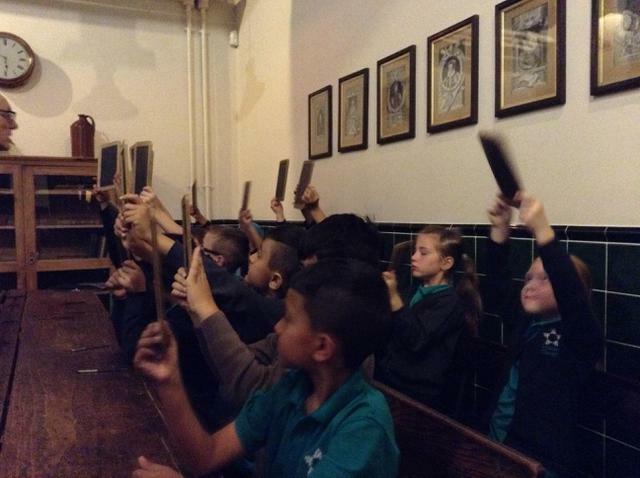 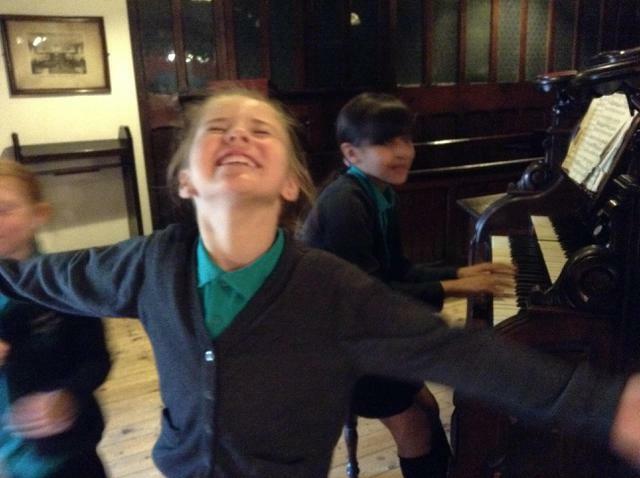 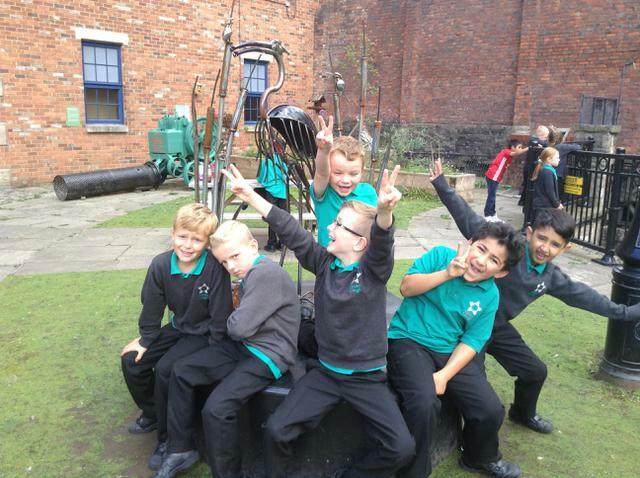 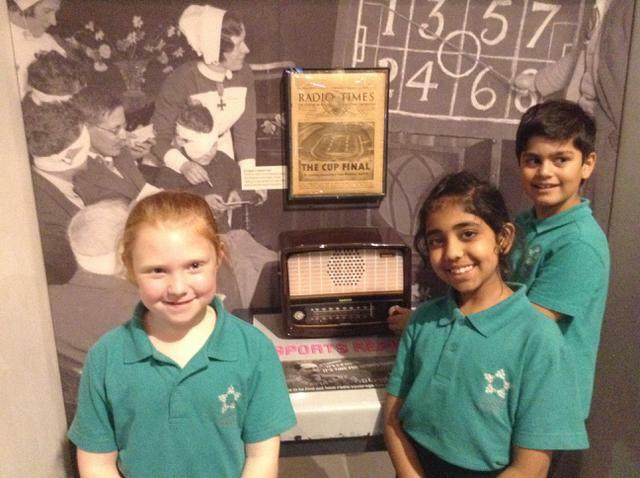 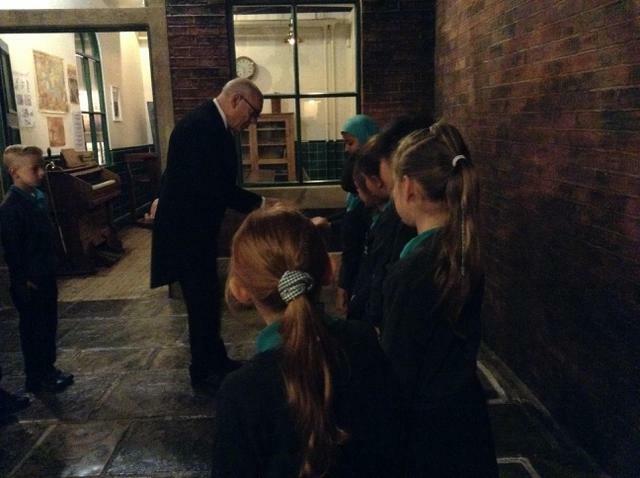 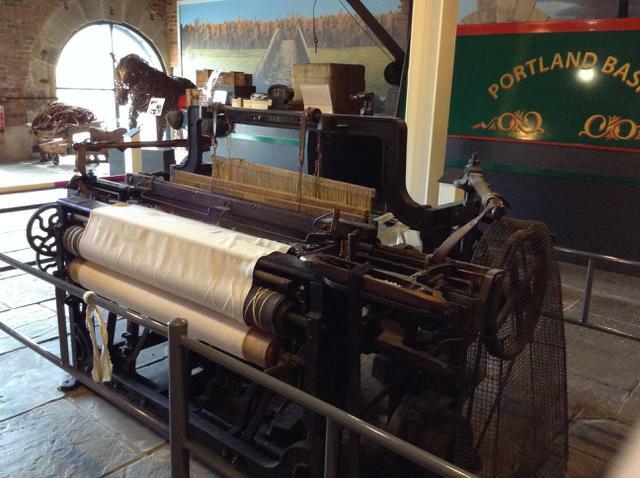 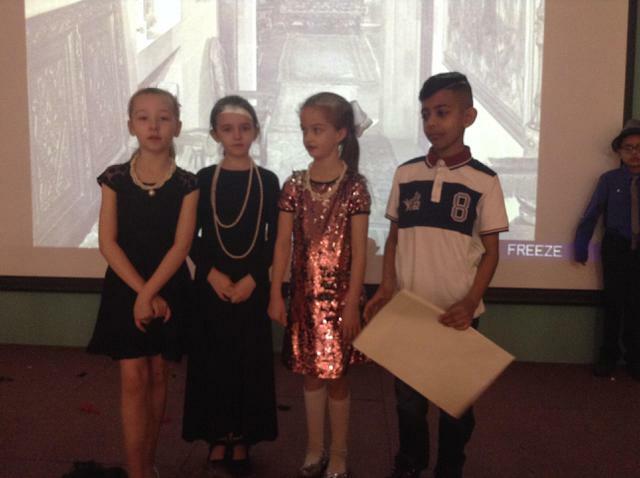 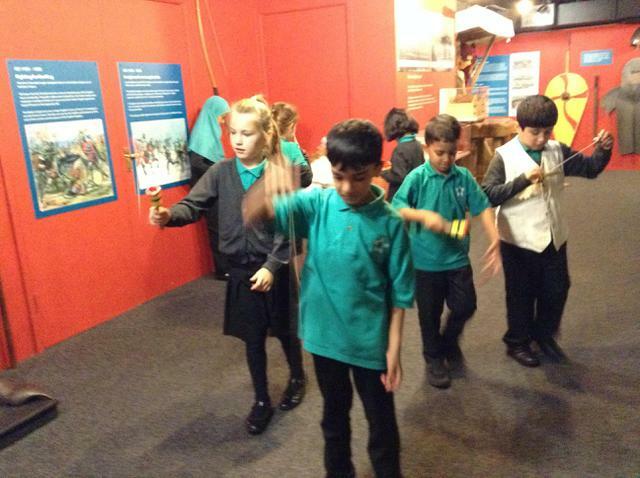 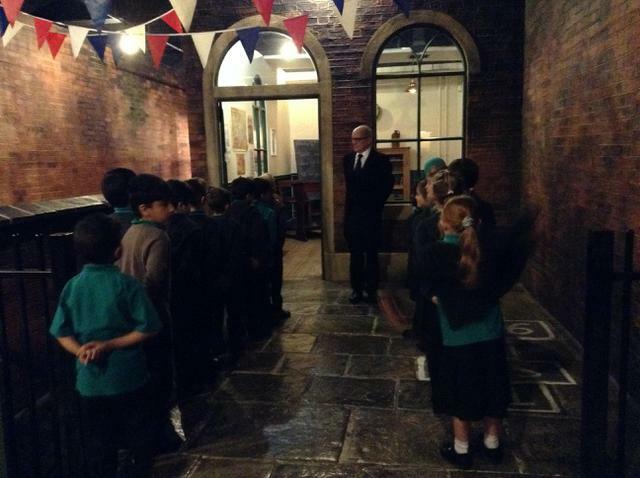 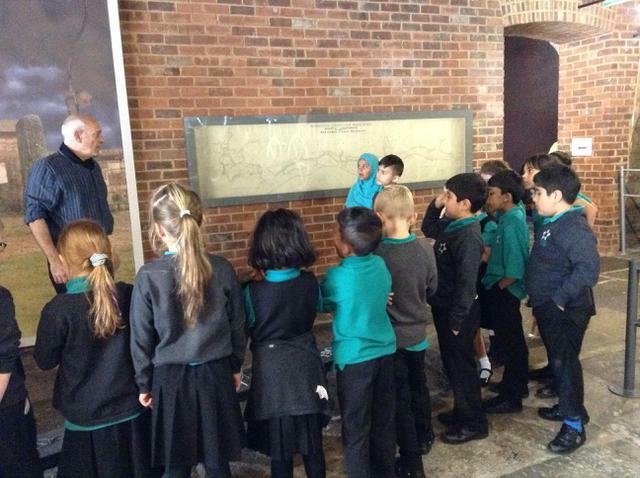 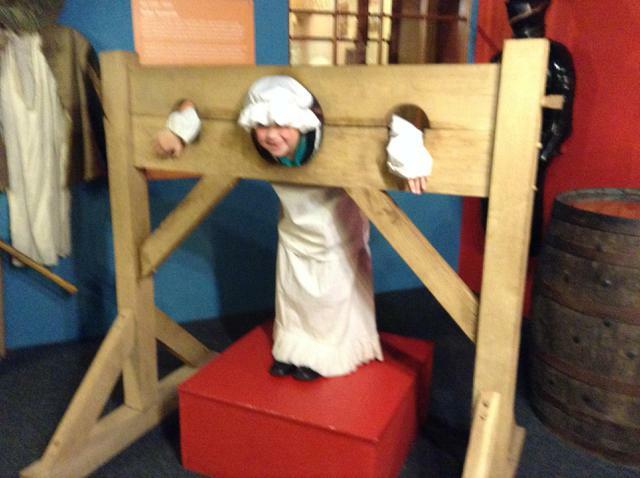 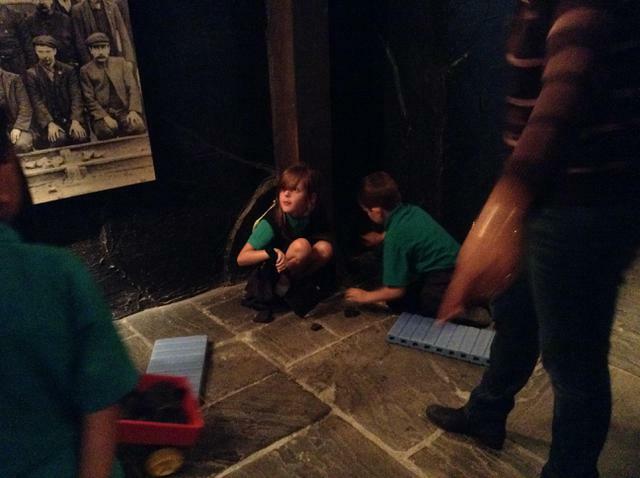 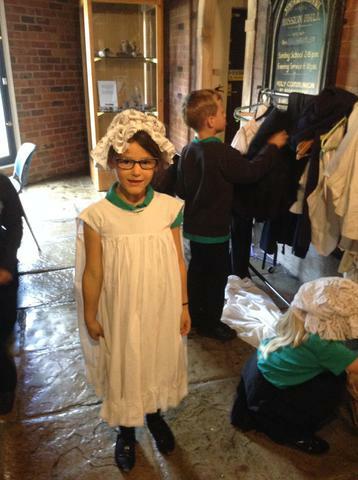 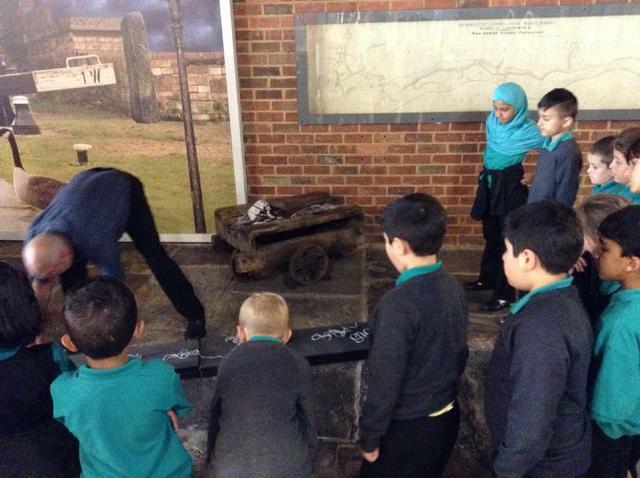 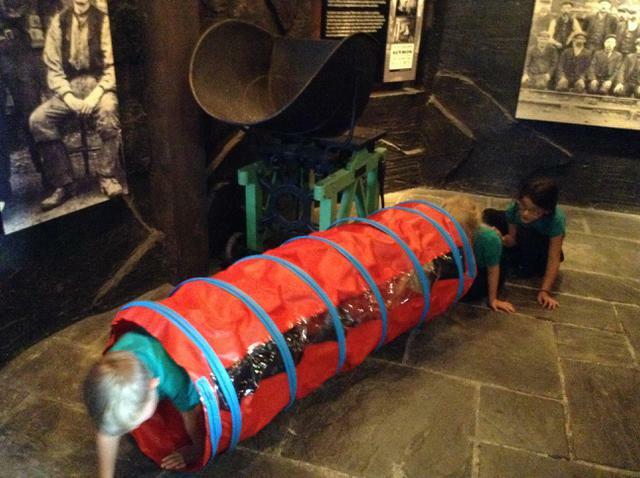 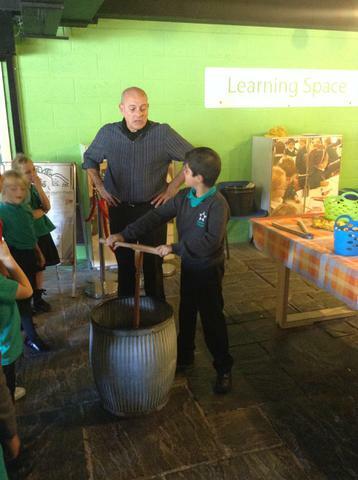 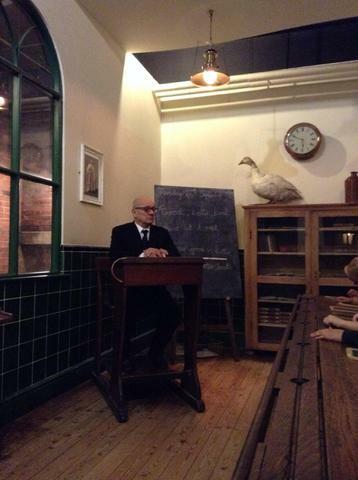 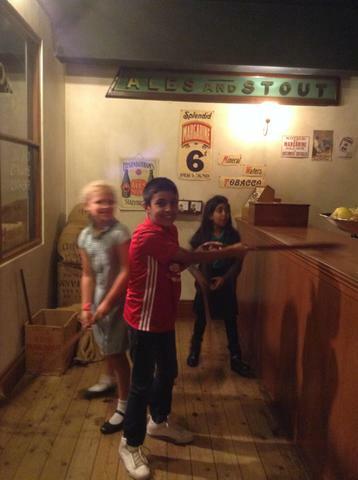 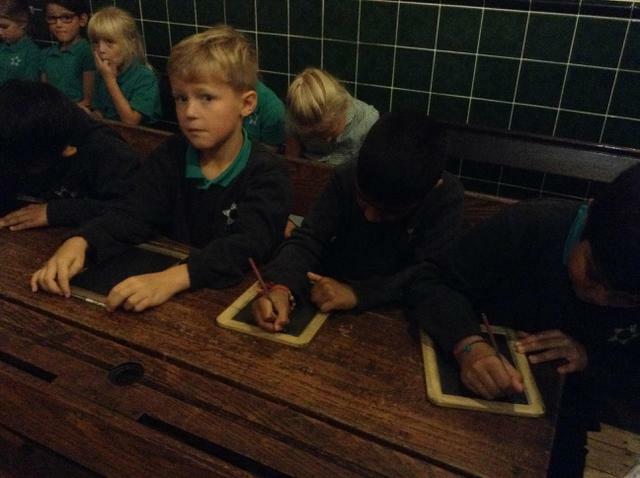 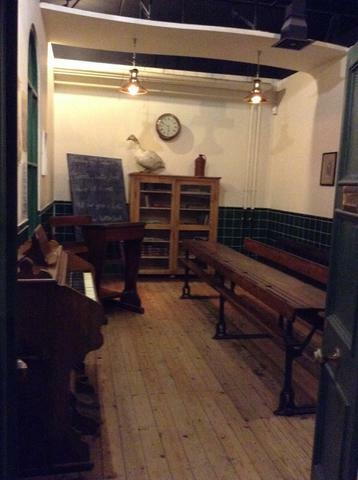 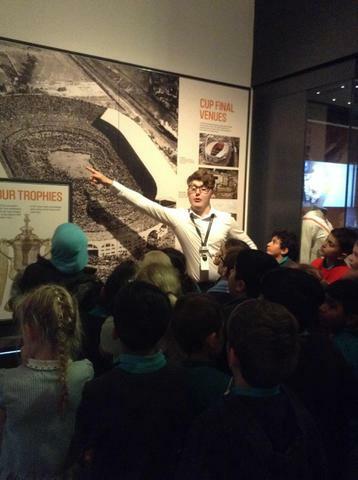 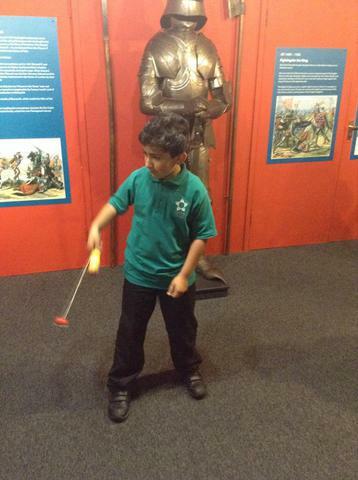 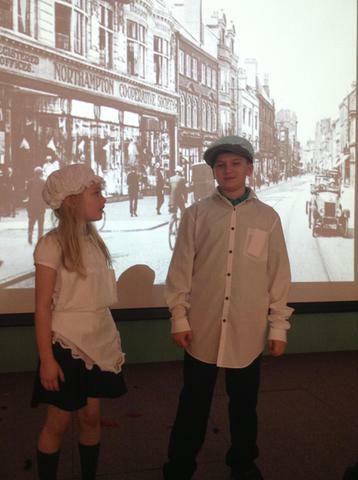 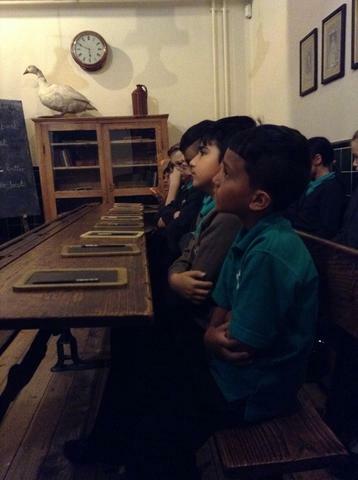 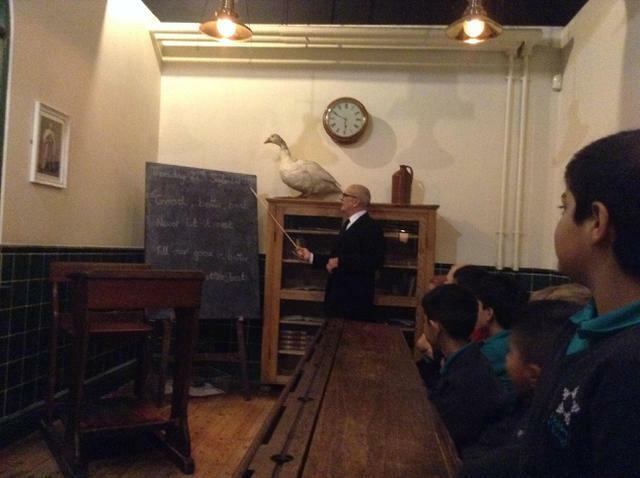 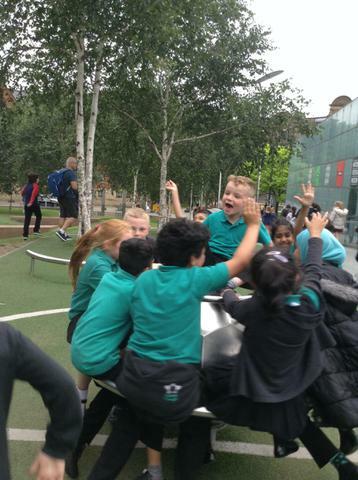 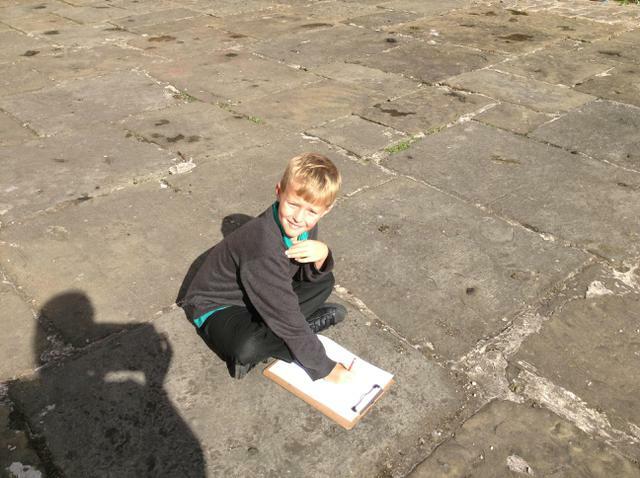 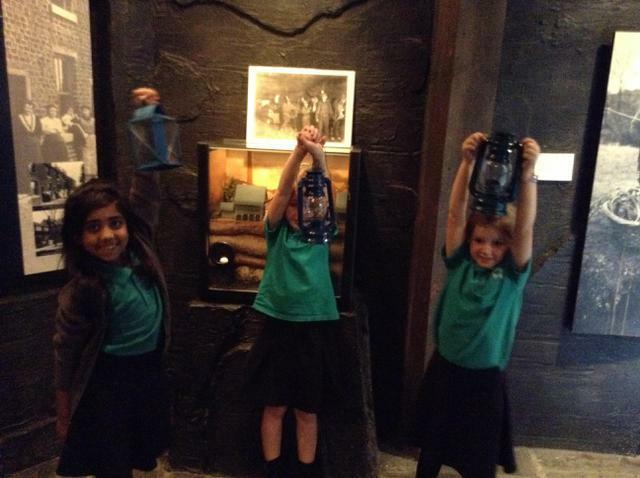 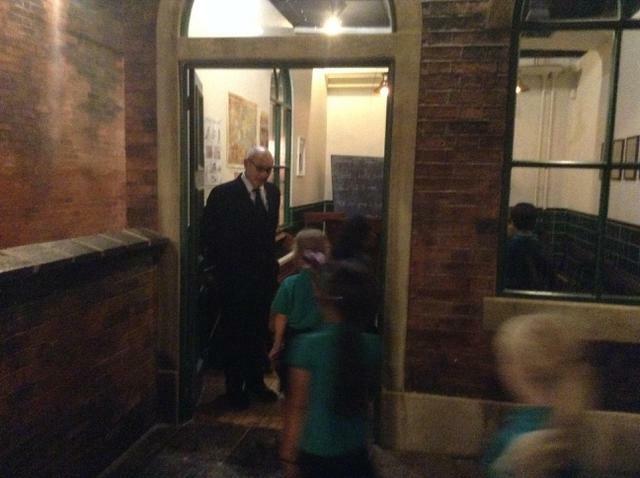 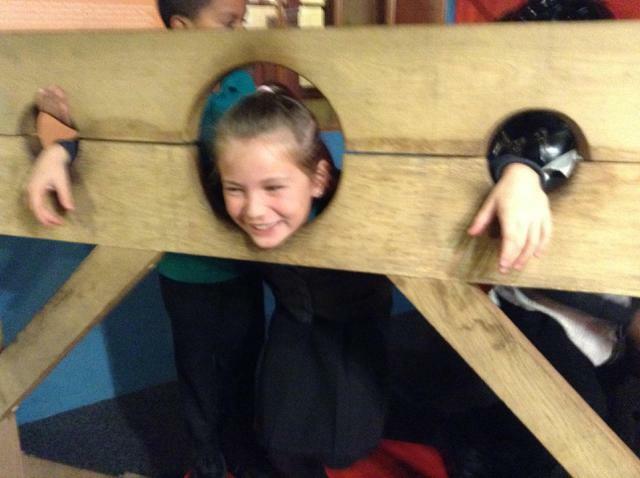 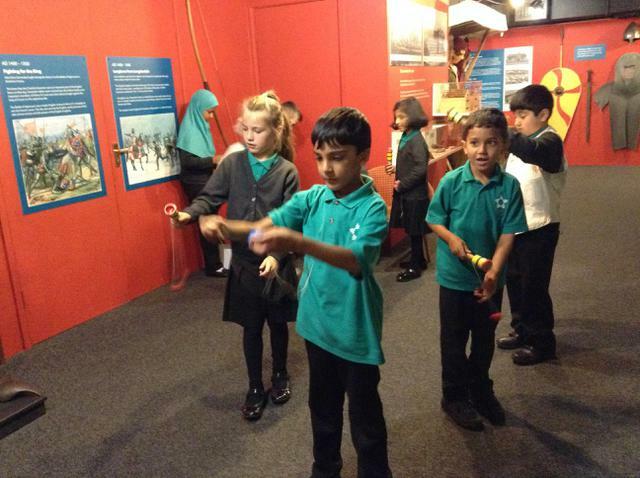 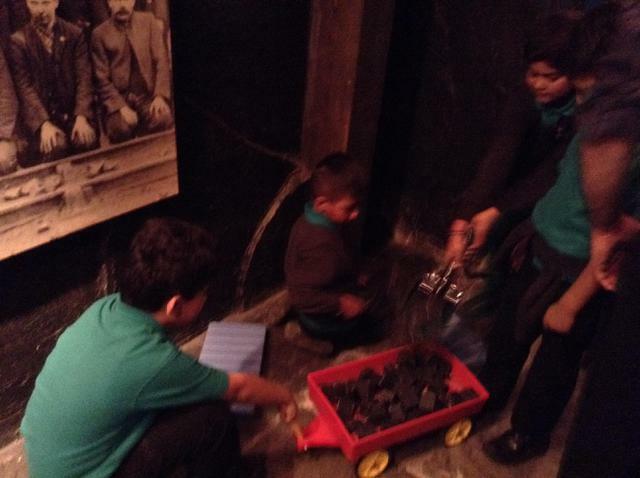 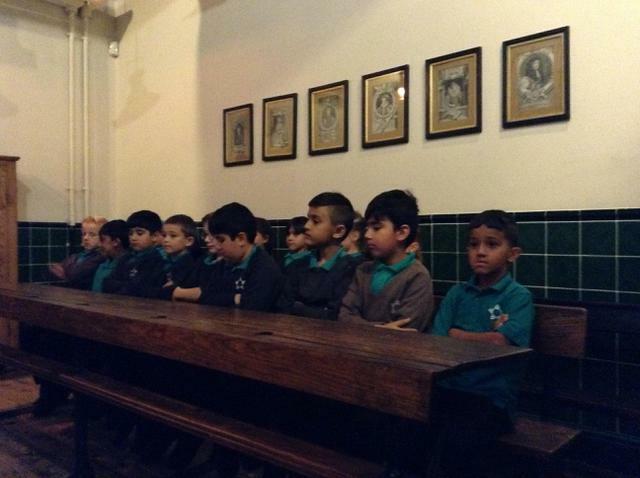 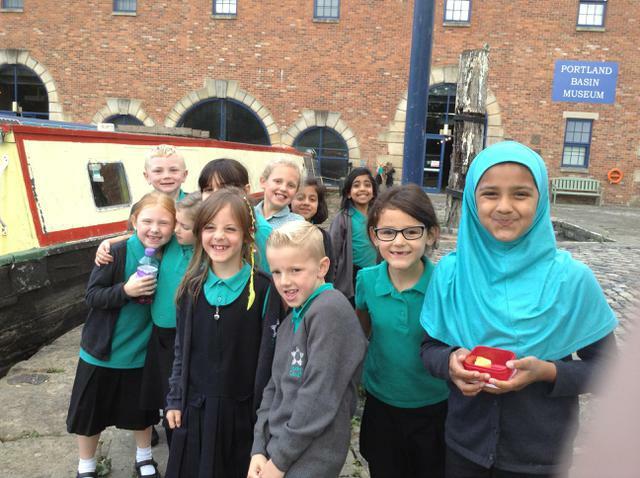 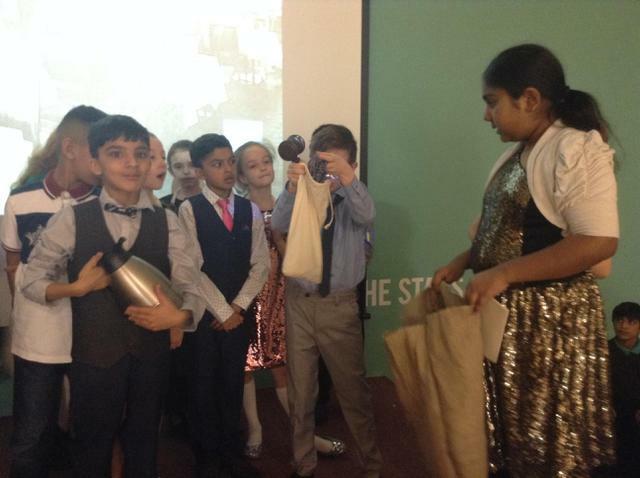 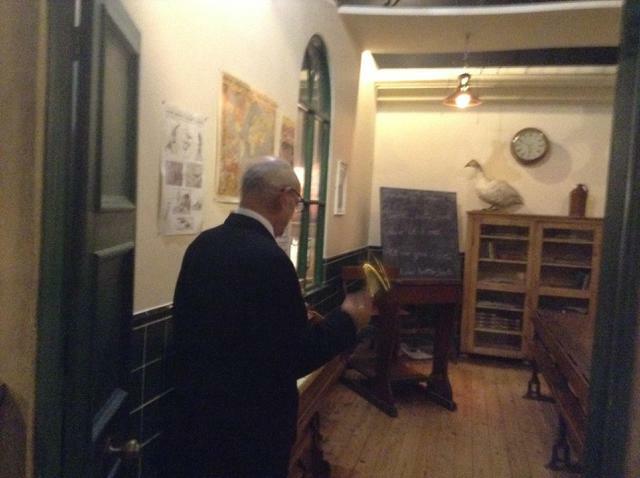 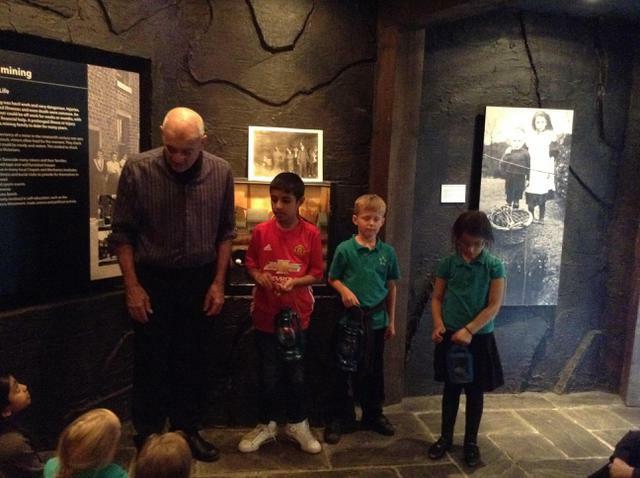 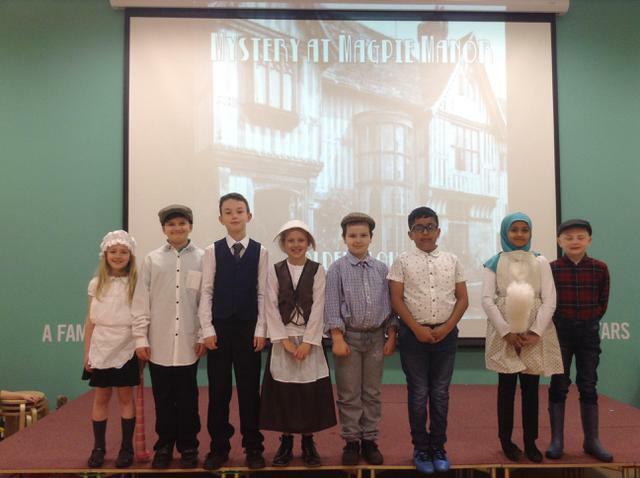 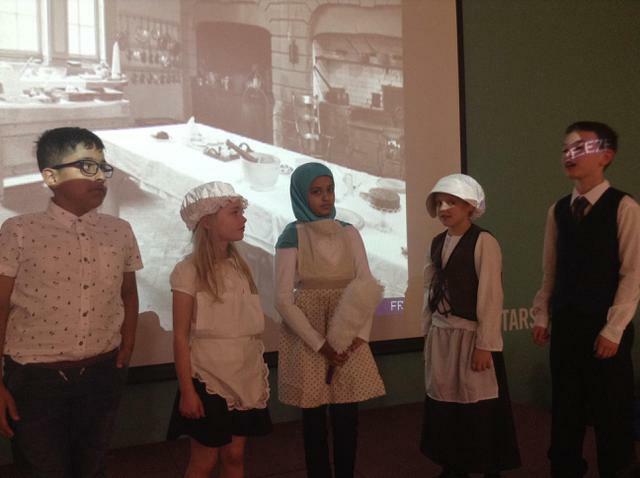 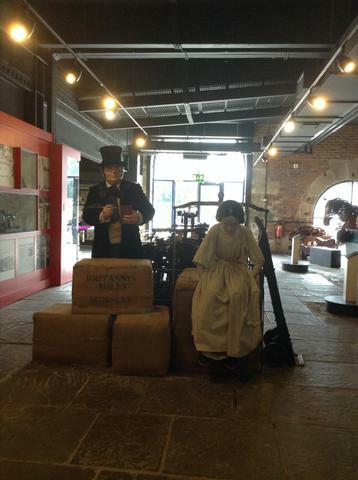 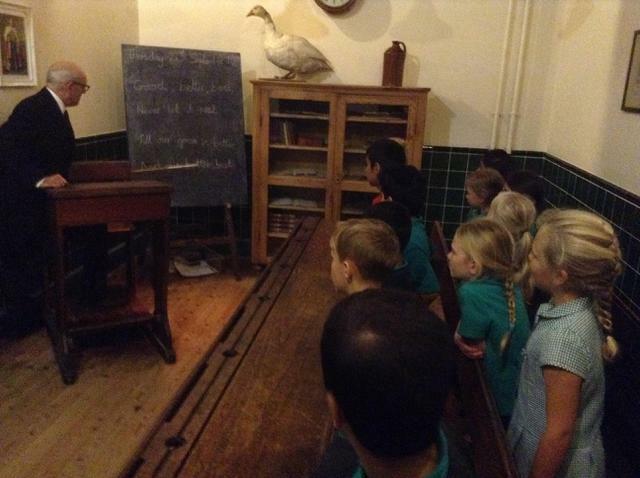 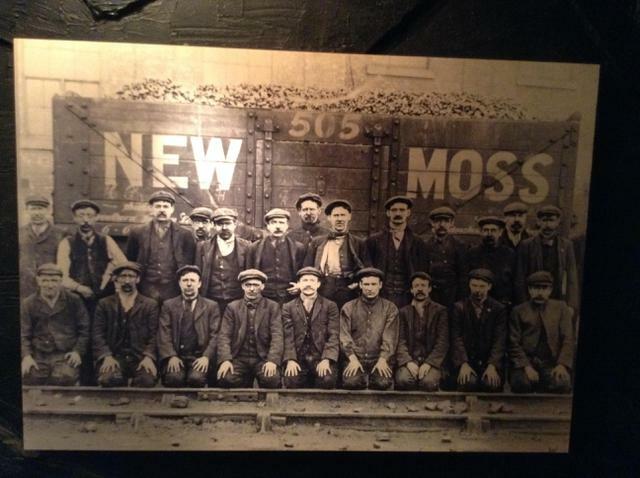 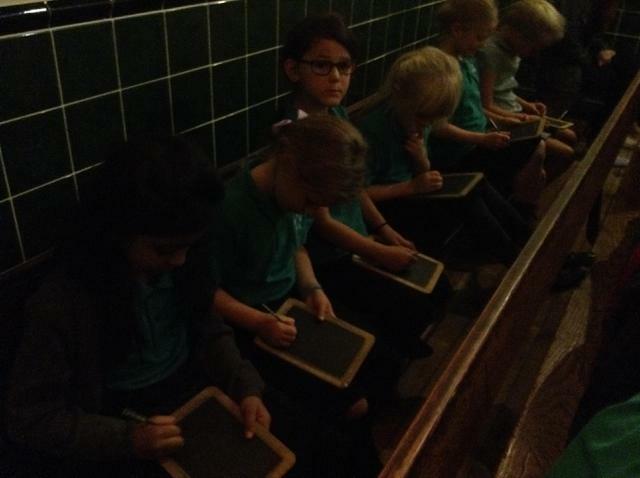 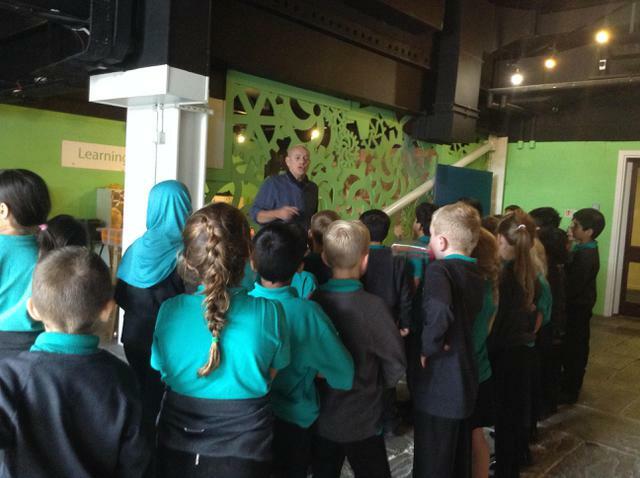 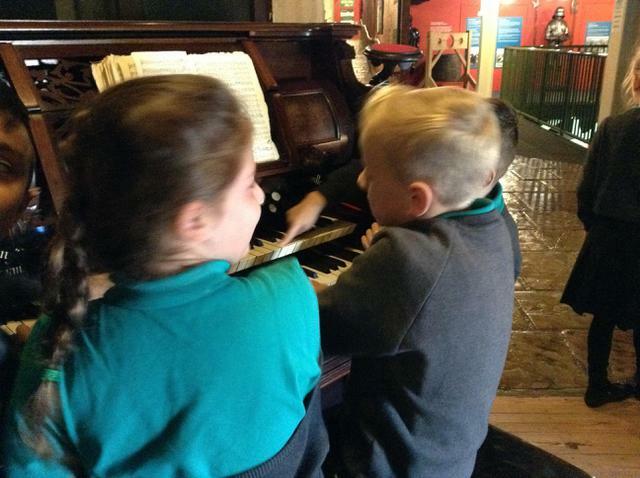 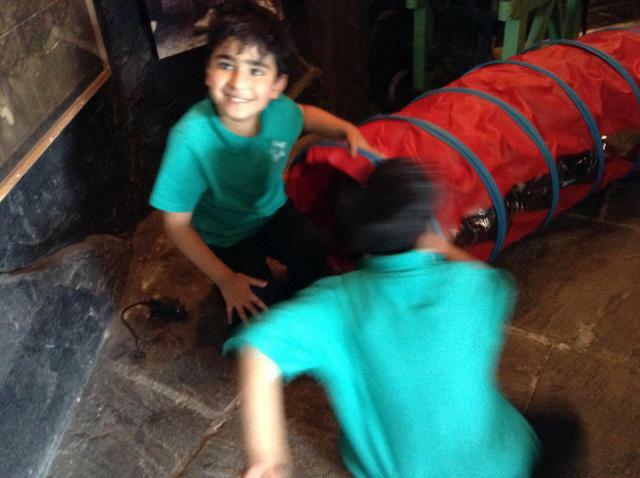 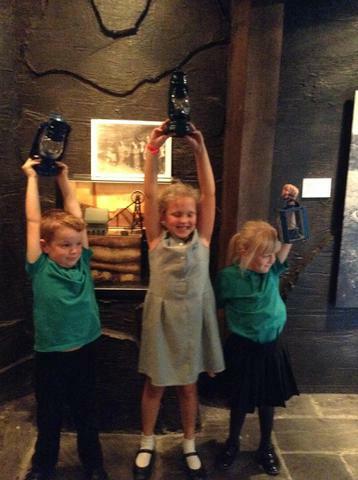 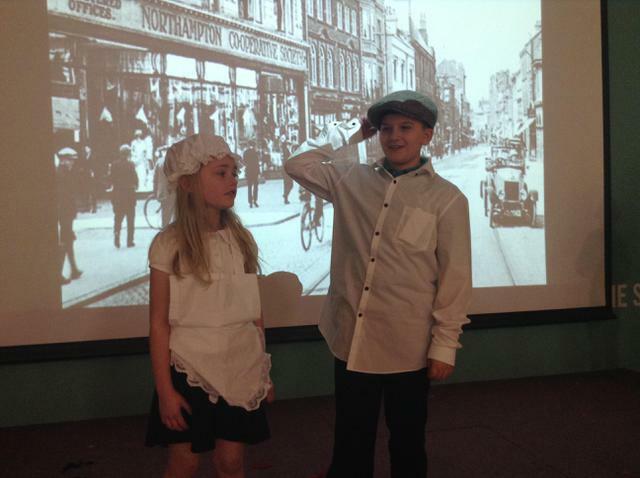 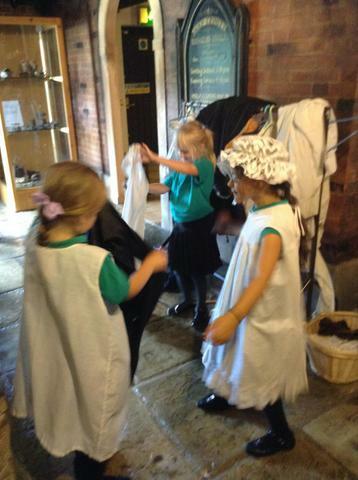 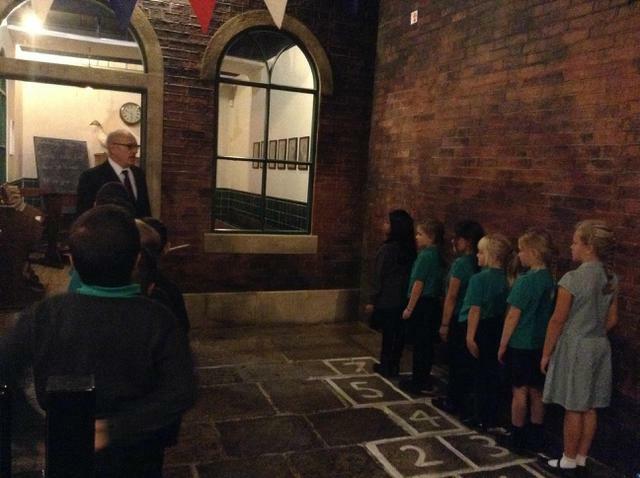 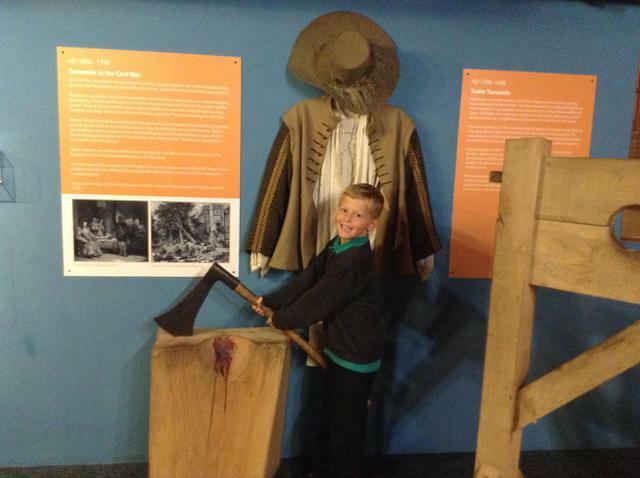 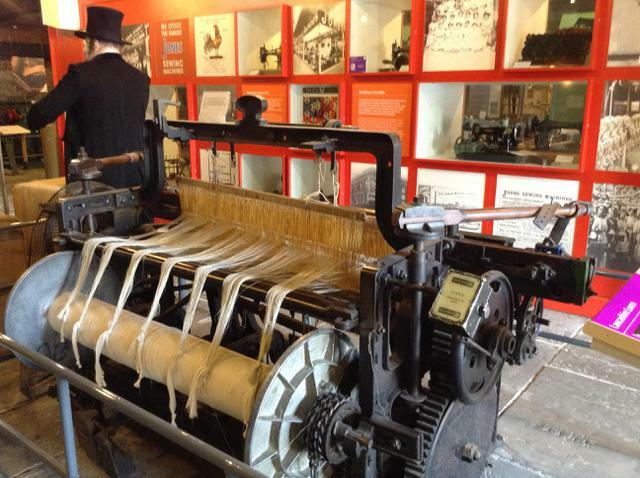 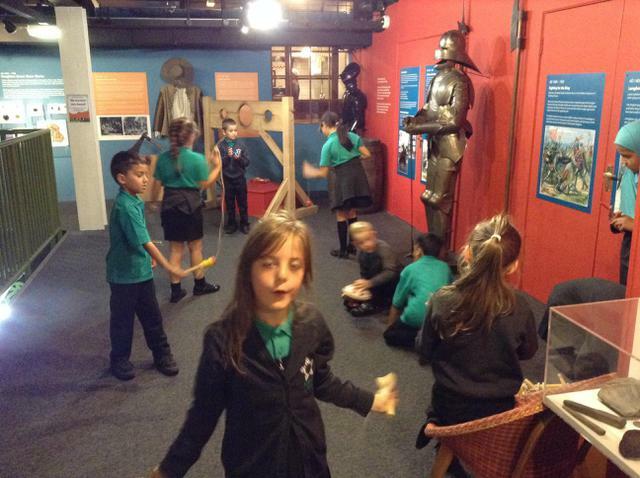 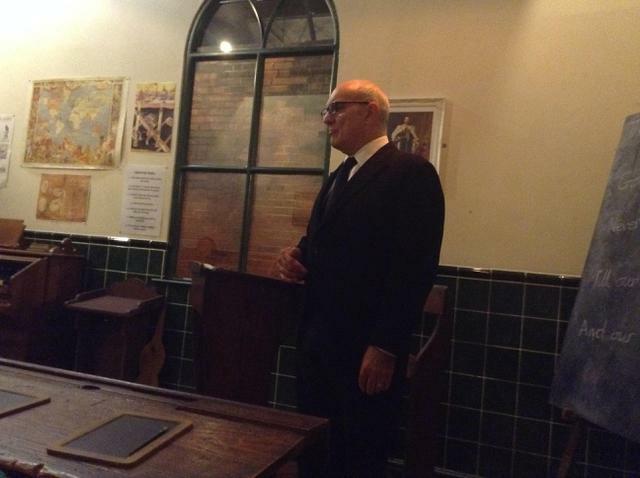 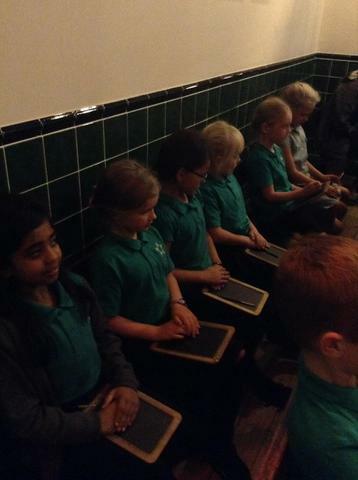 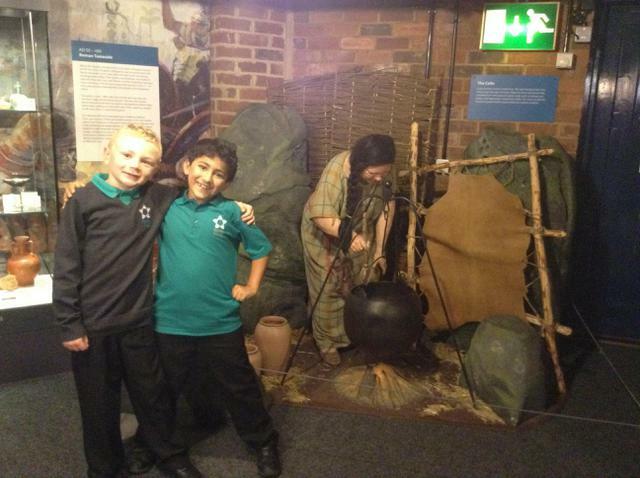 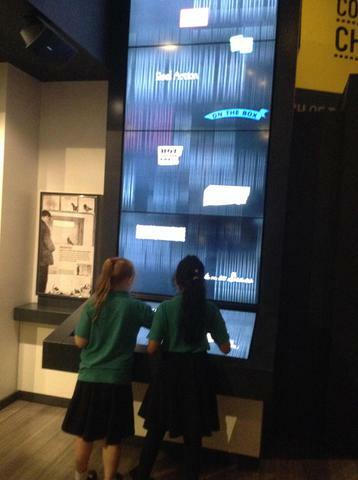 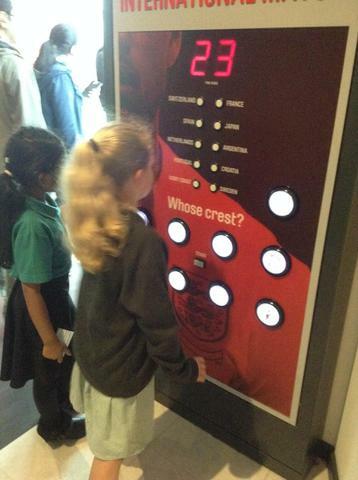 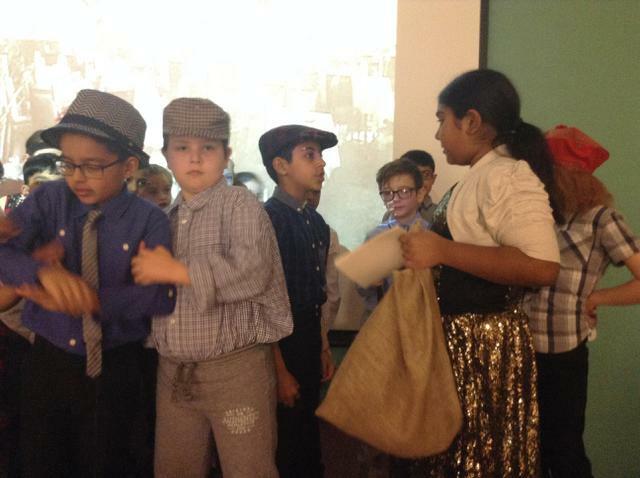 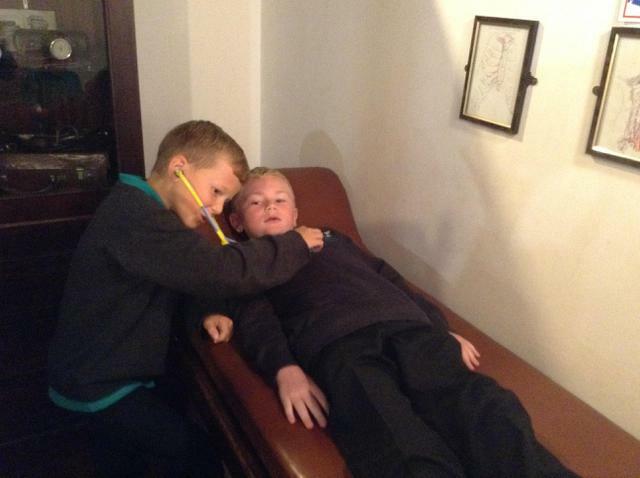 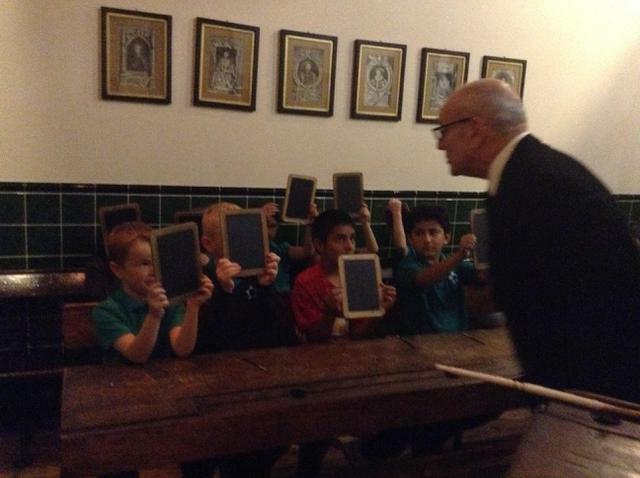 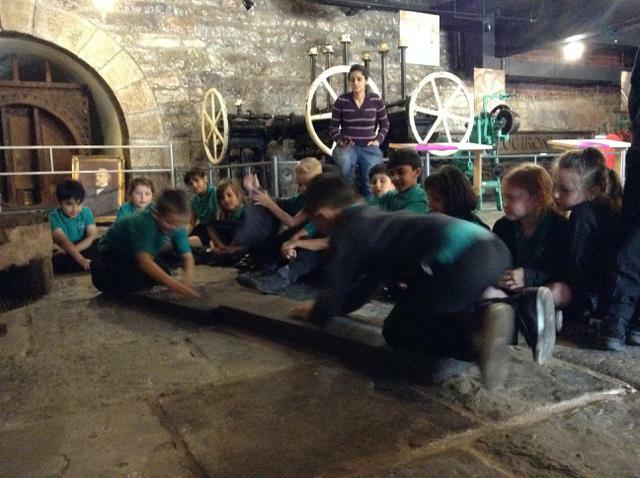 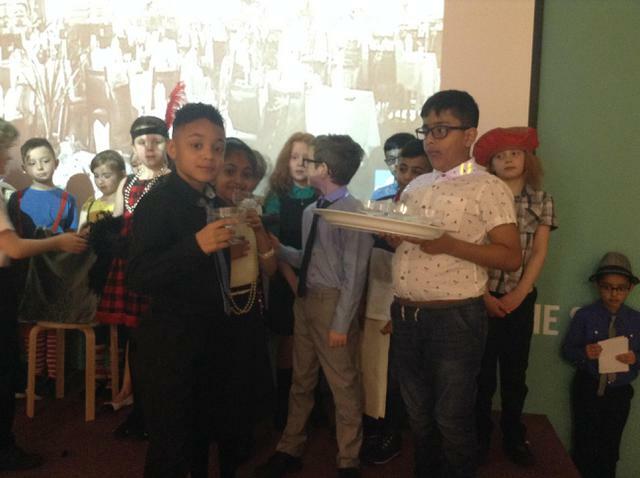 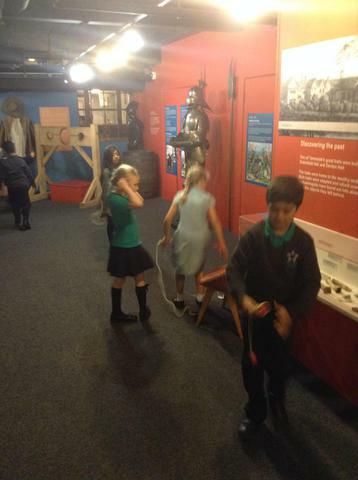 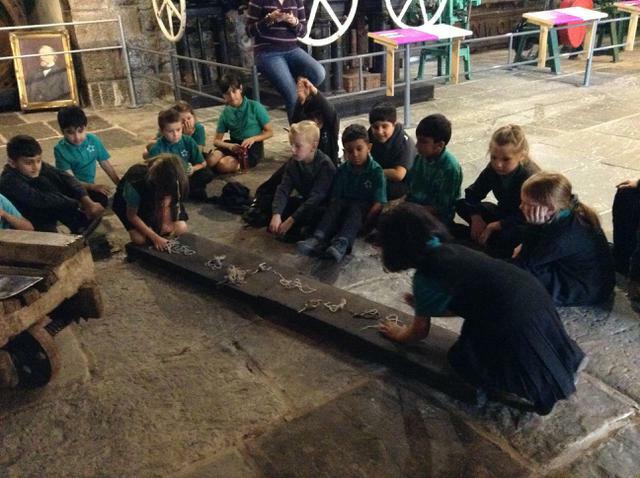 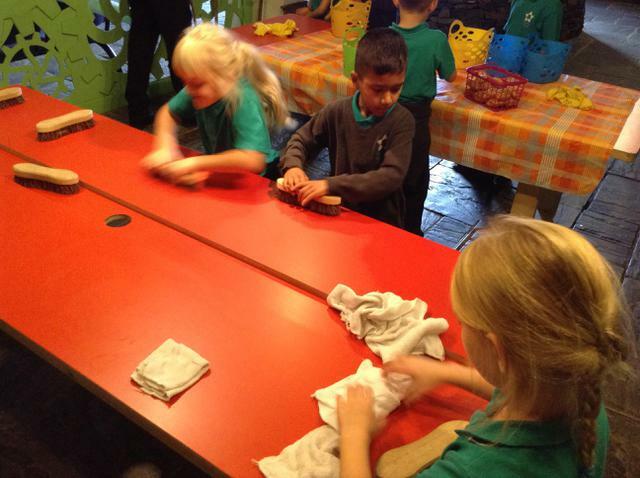 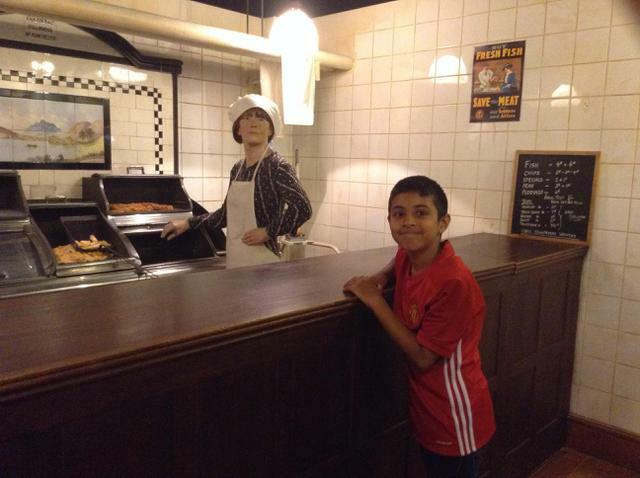 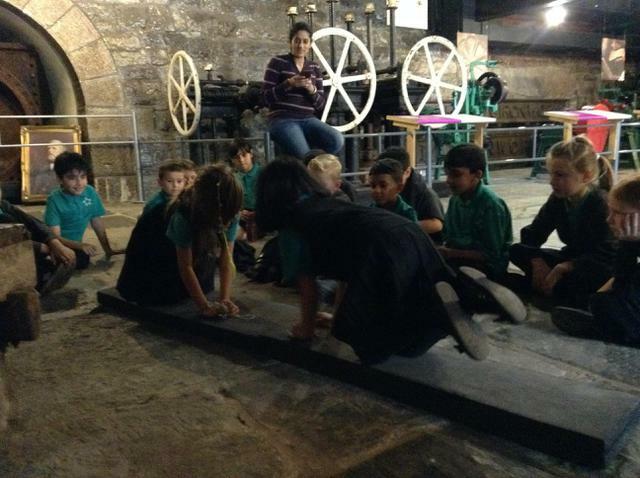 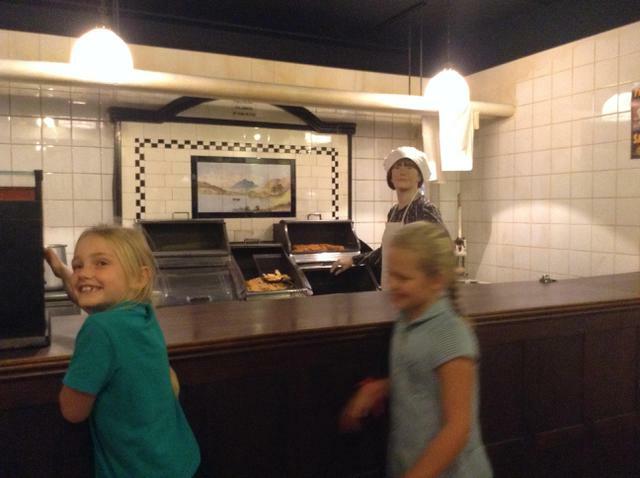 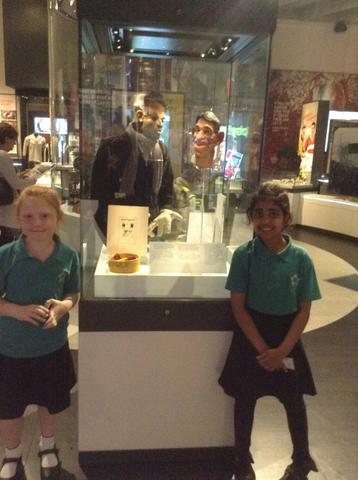 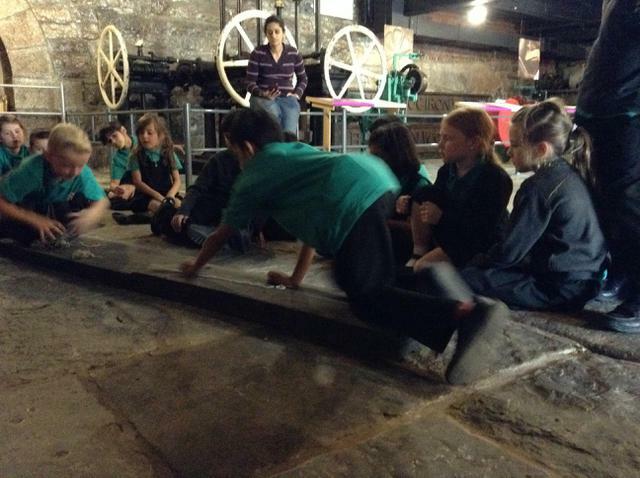 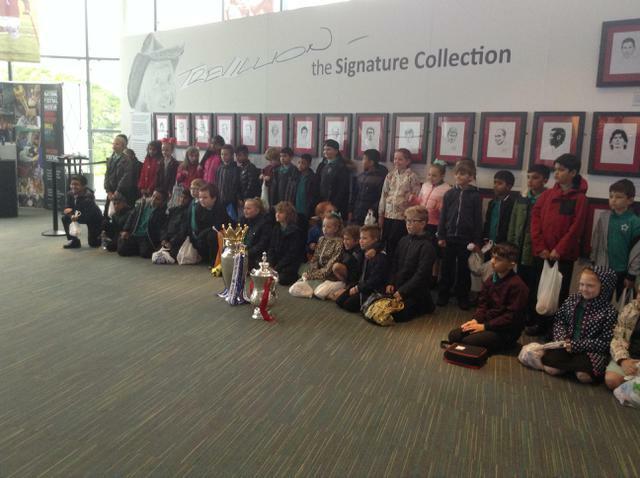 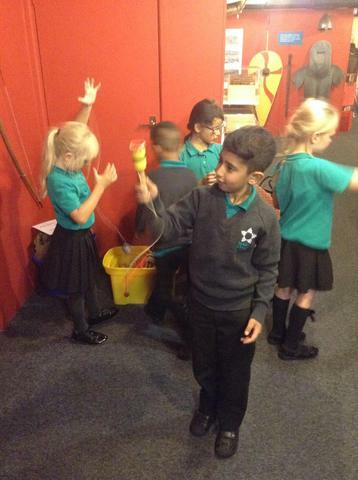 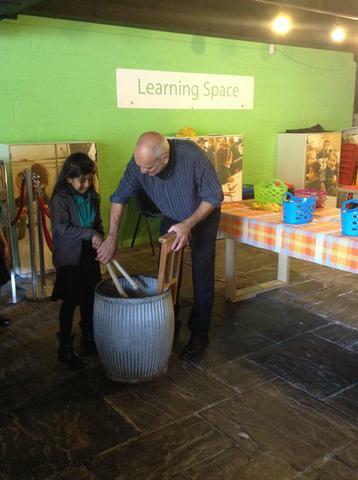 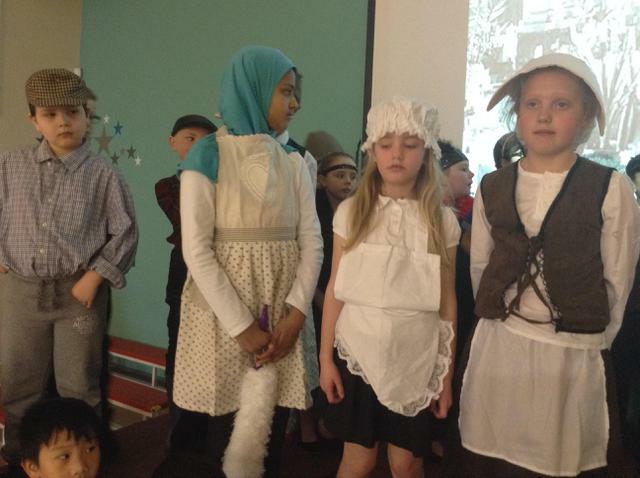 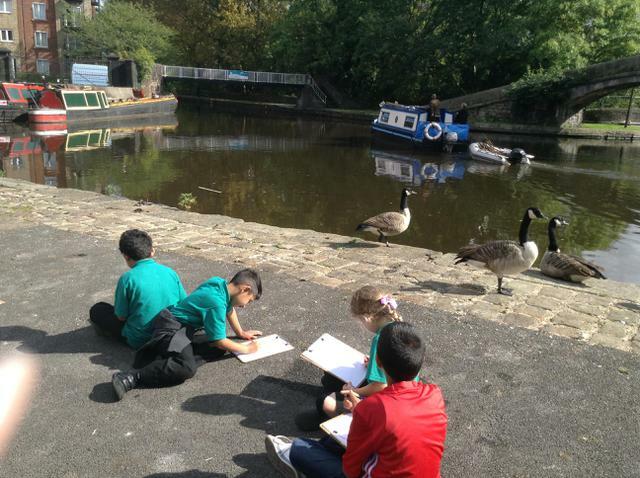 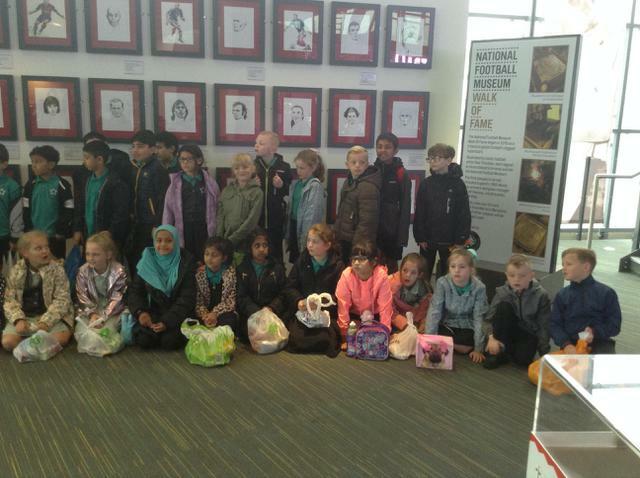 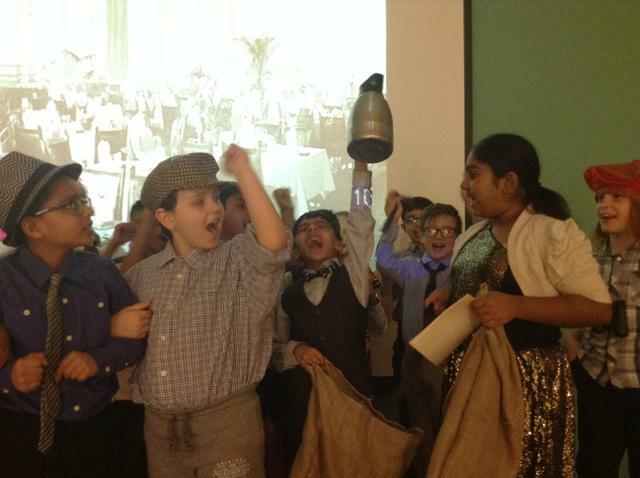 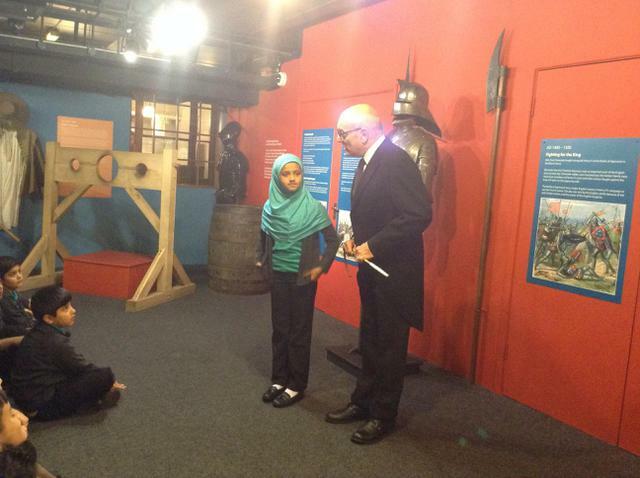 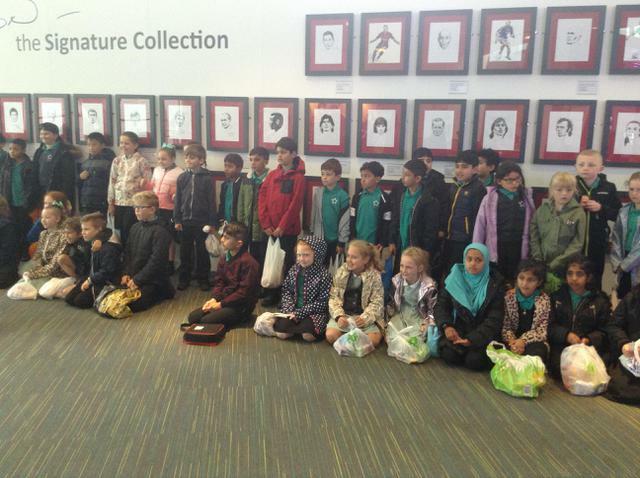 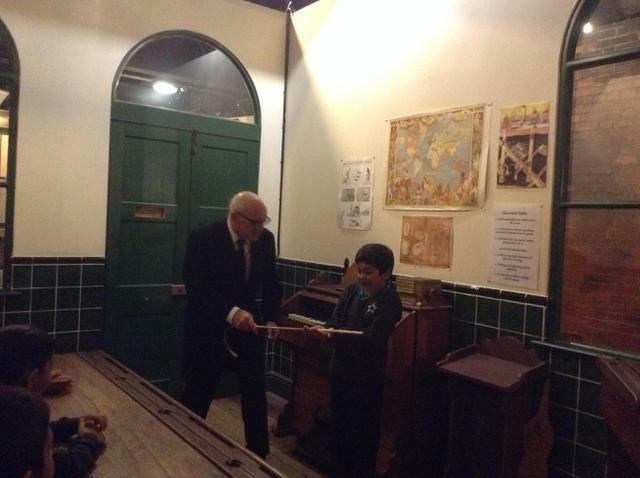 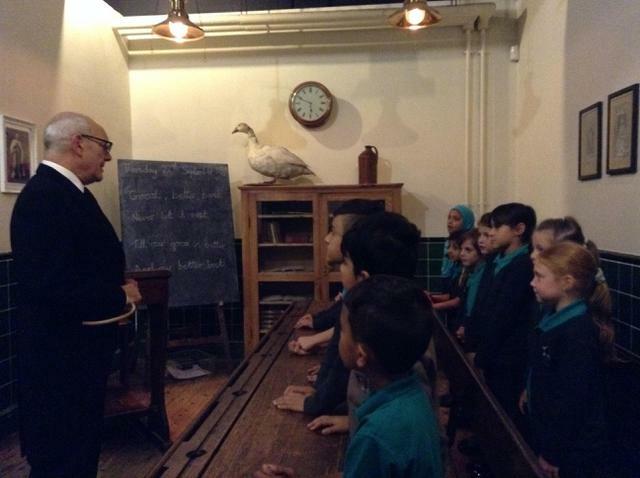 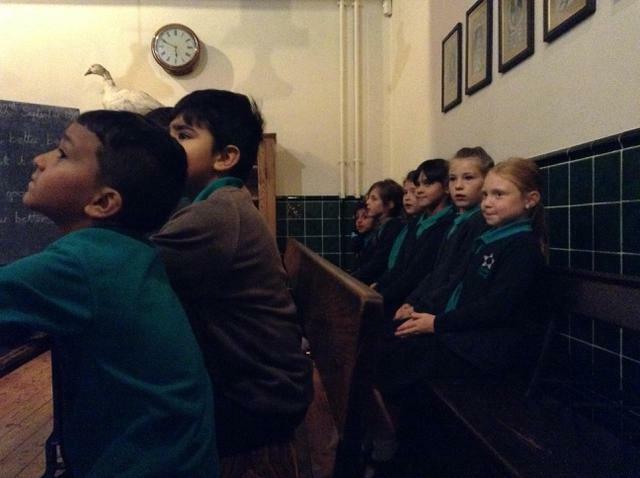 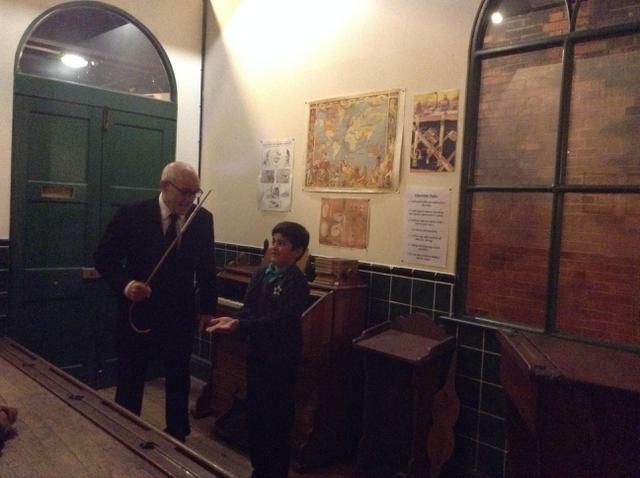 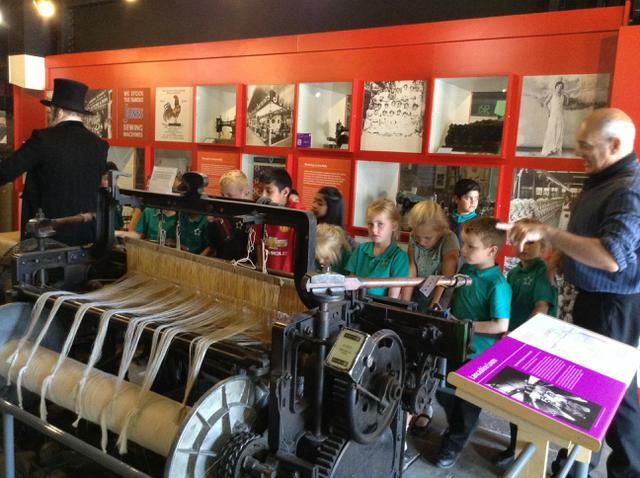 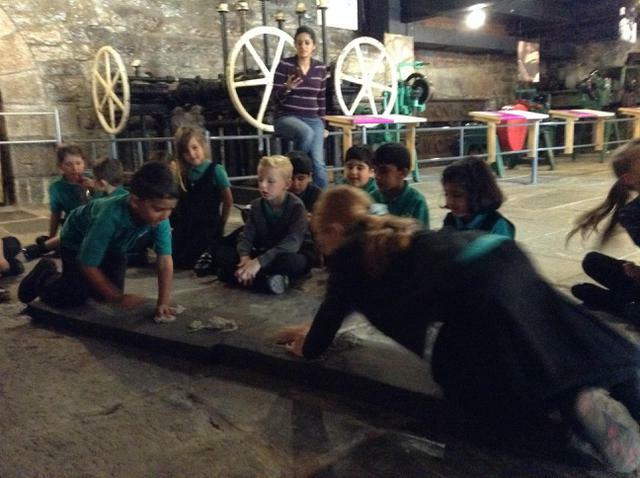 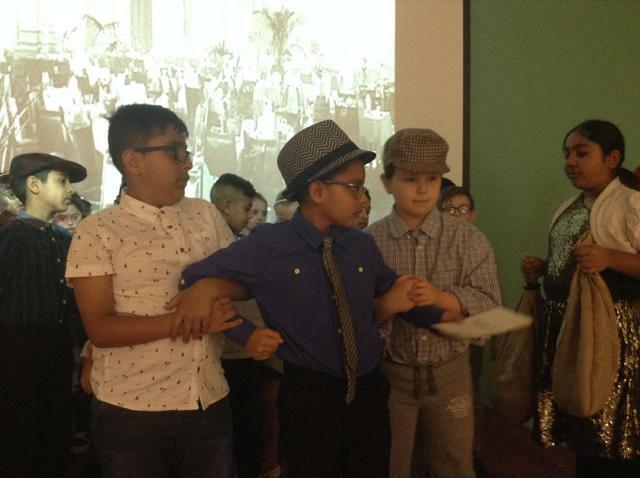 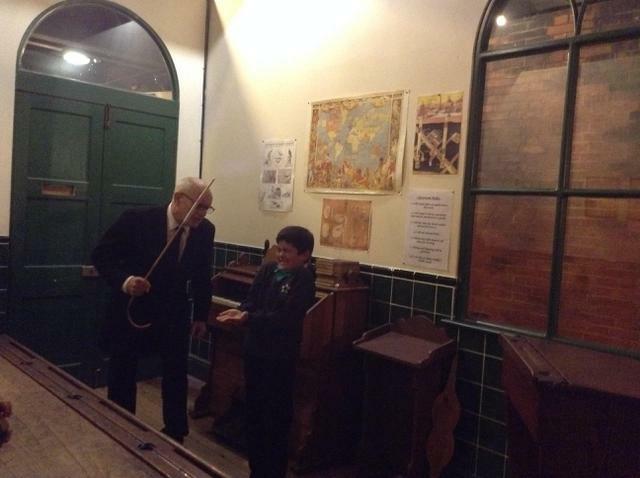 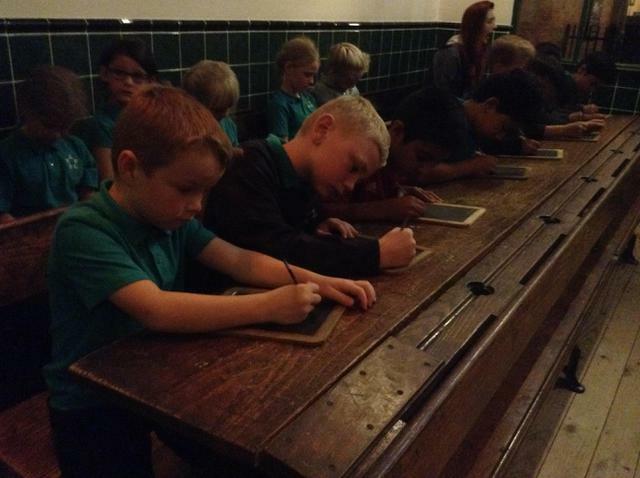 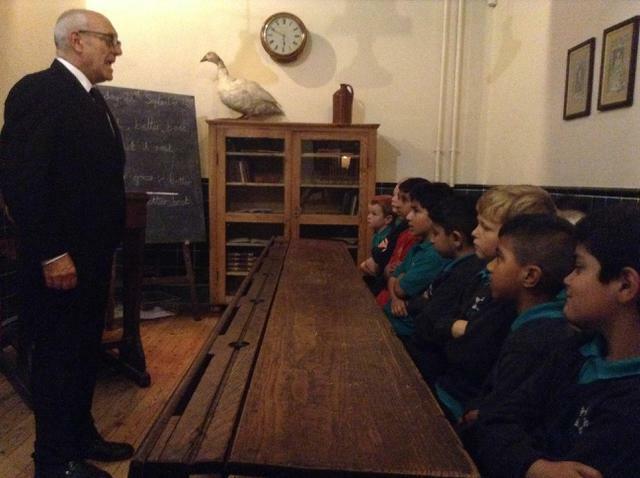 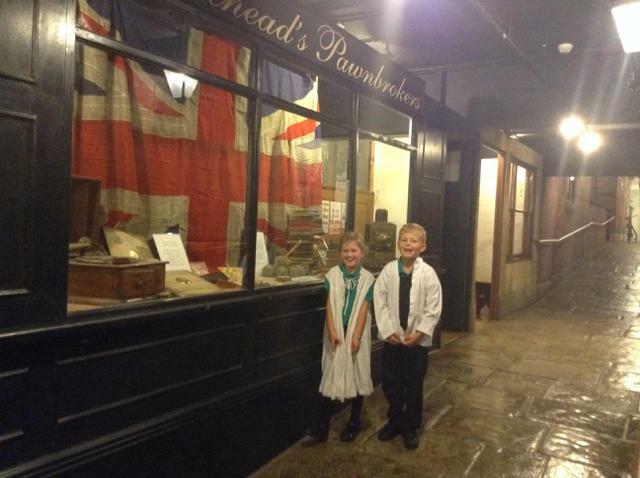 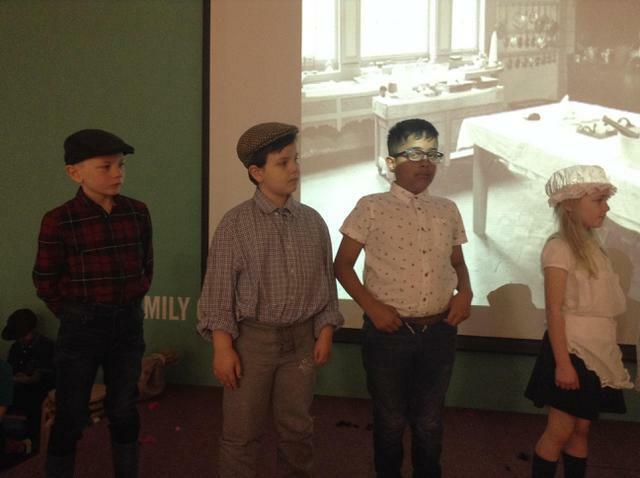 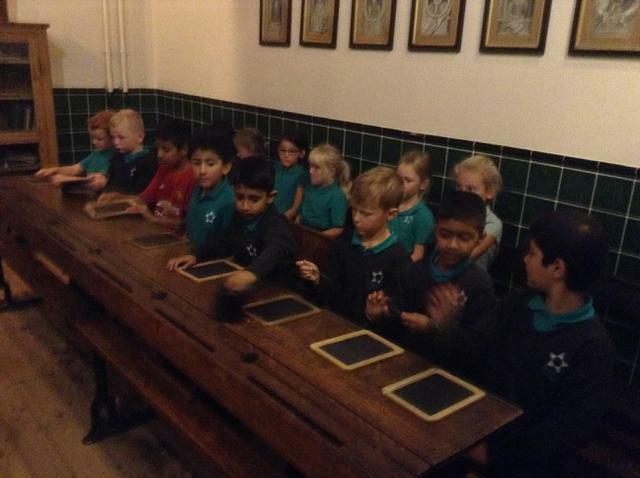 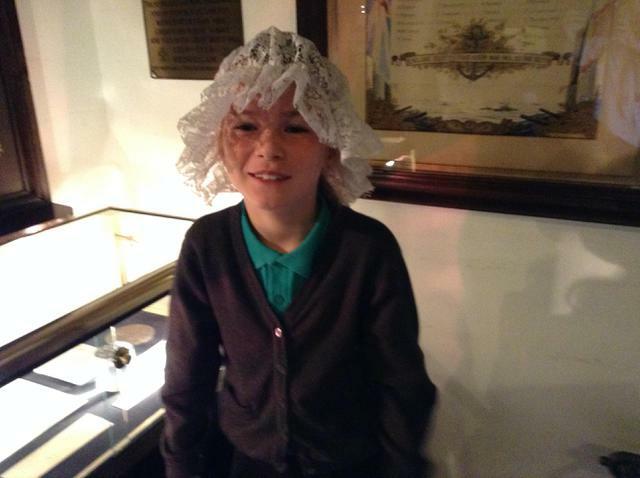 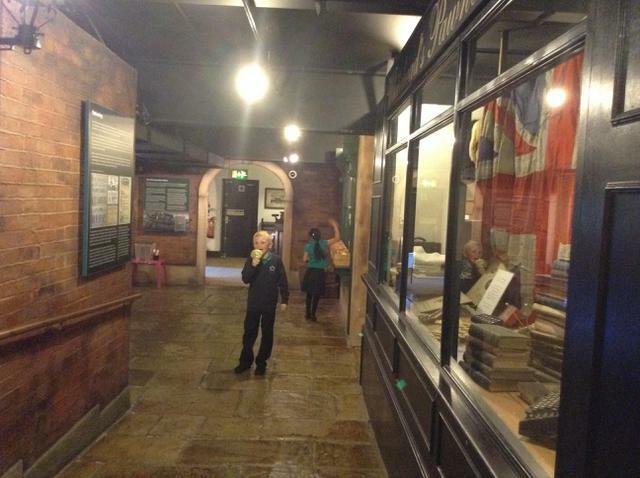 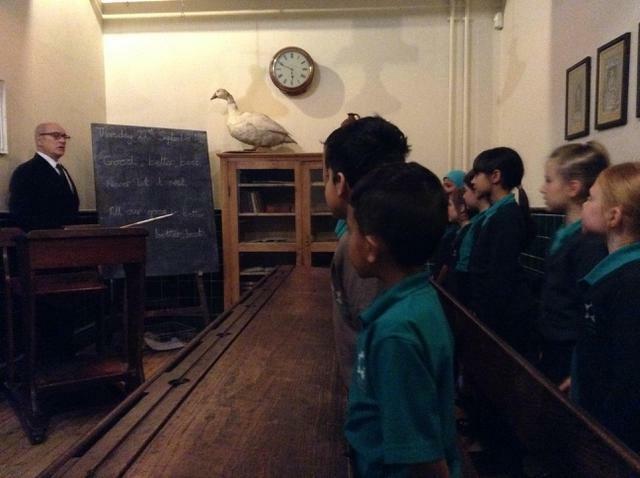 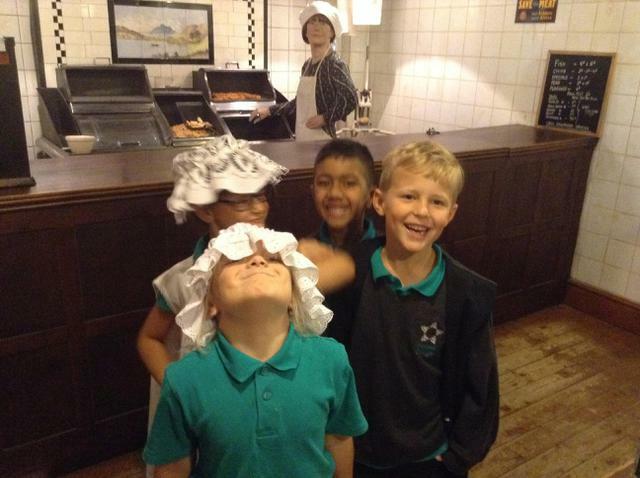 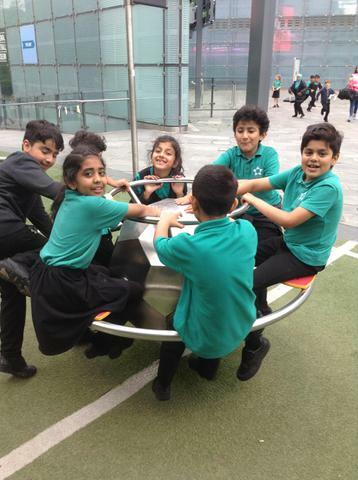 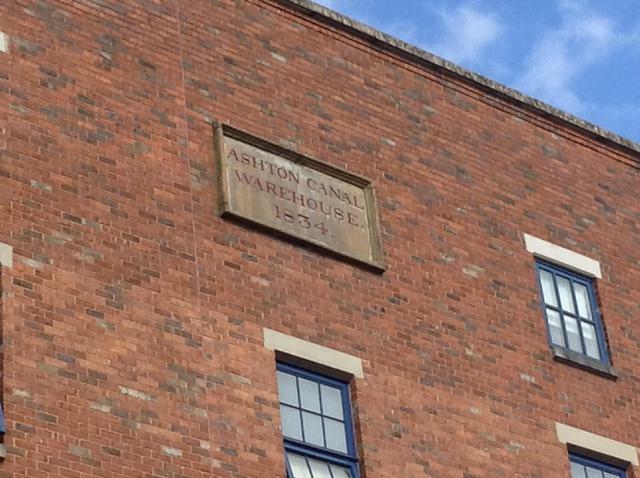 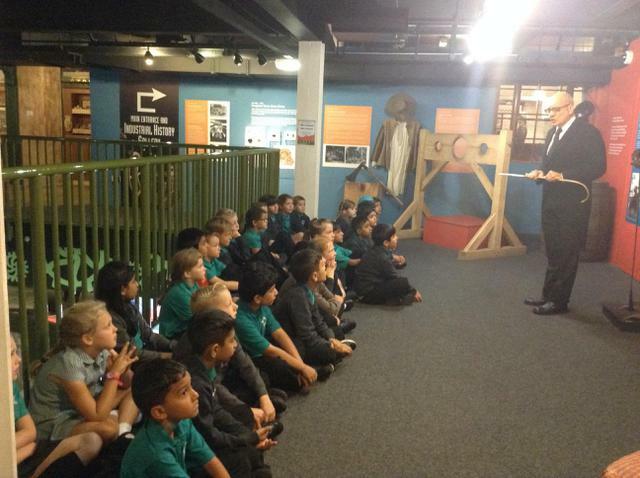 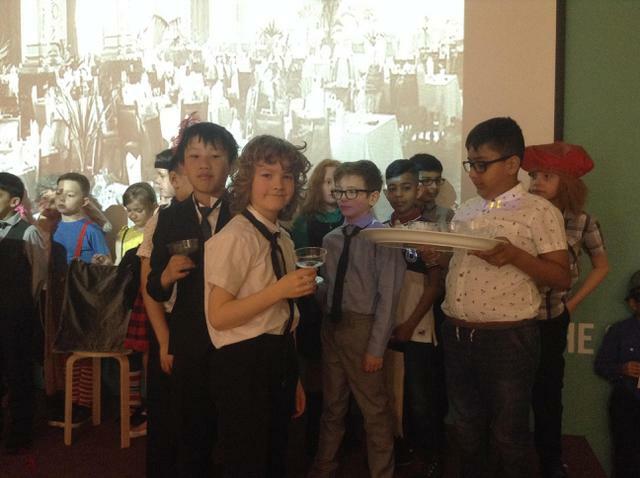 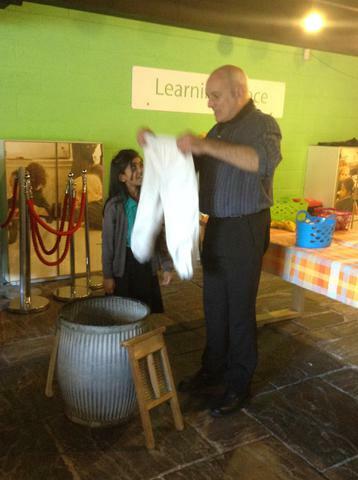 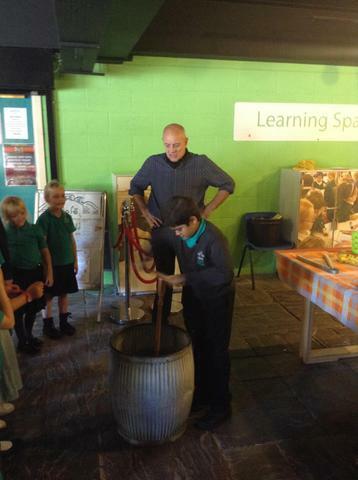 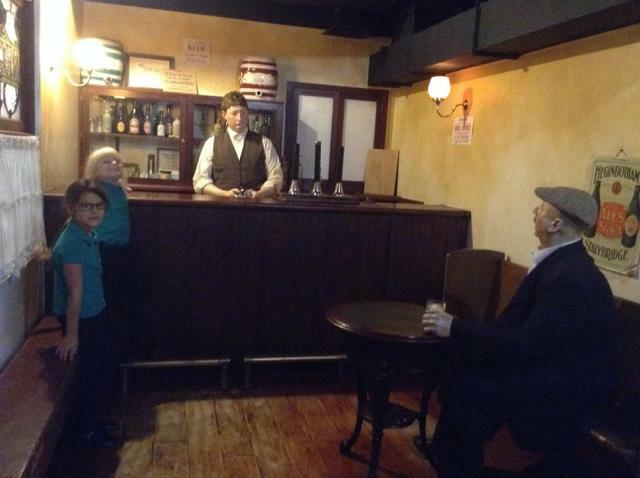 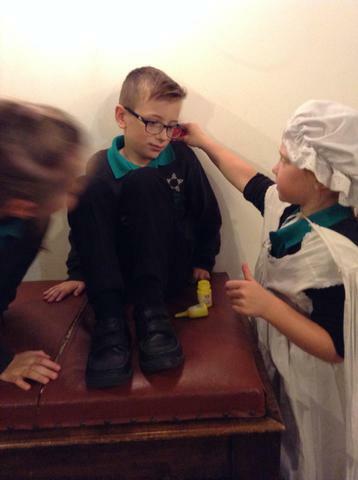 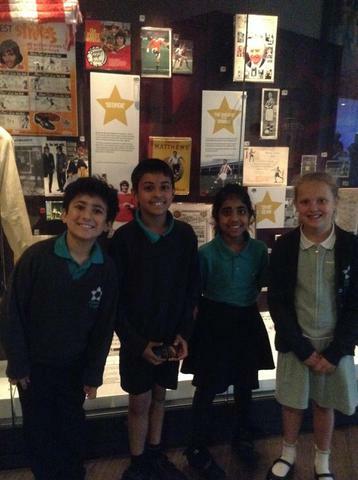 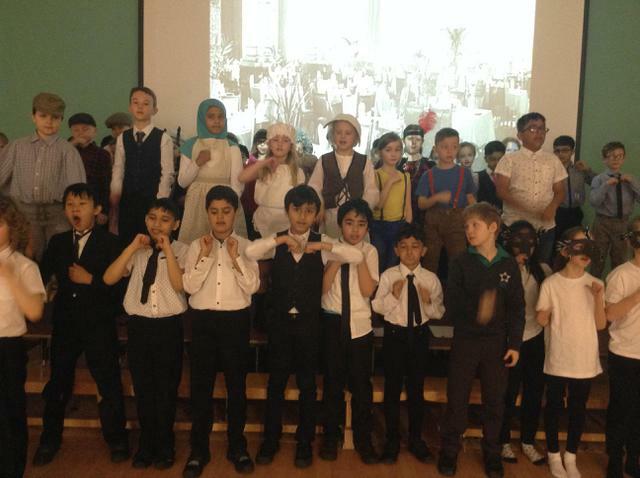 We all enjoyed our visit to Portland Basin and found out lots of interesting information about life in Victorian Ashton. 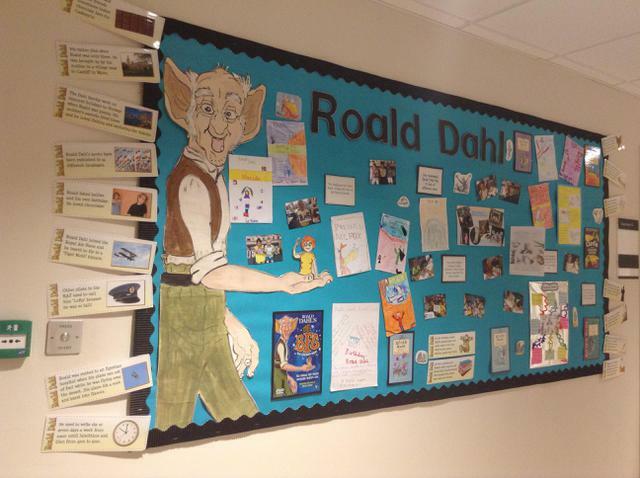 On Tuesday 13th September we will be celebrating the life and work of the famous author, Roald Dahl. 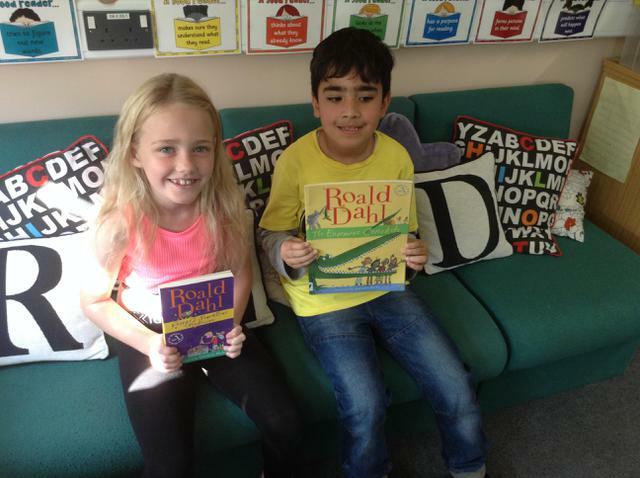 Roald Dahl would have been celebrating his 100th birthday. 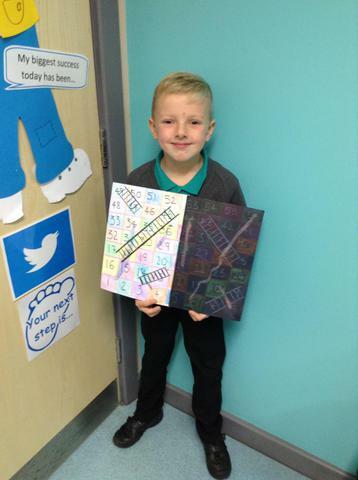 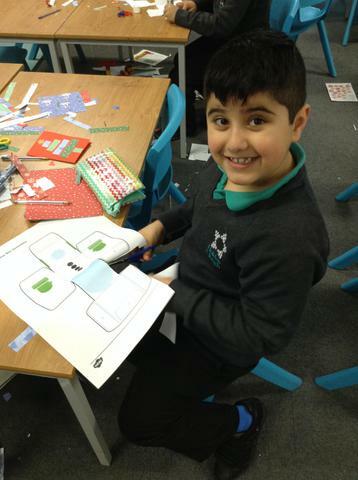 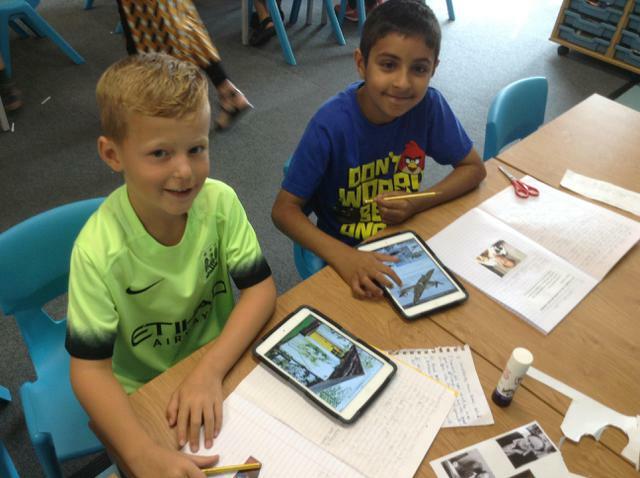 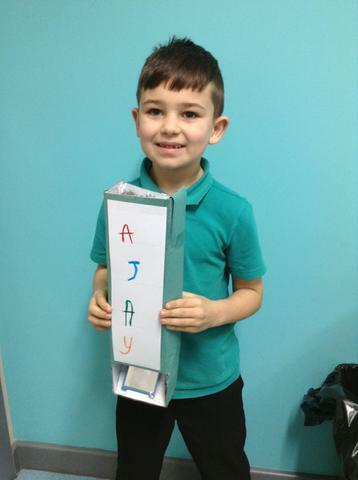 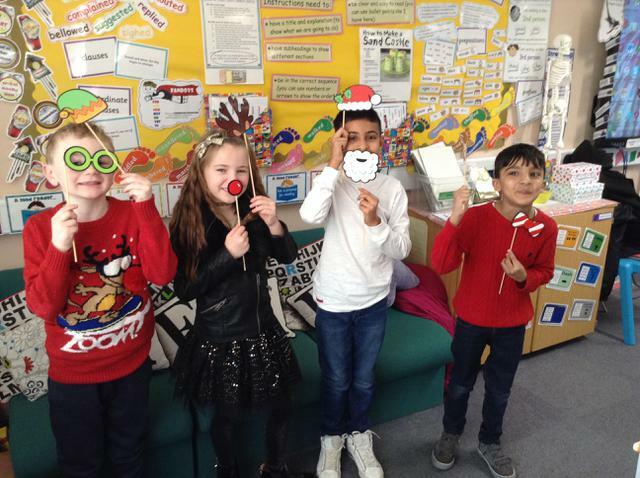 During the day we will be finding out about his life, looking at the books he had published, the amazing characters he created and the interesting word choices he used to capture our imagination. 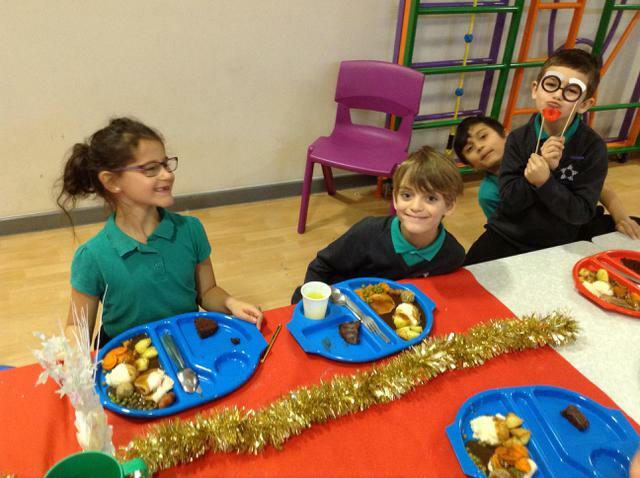 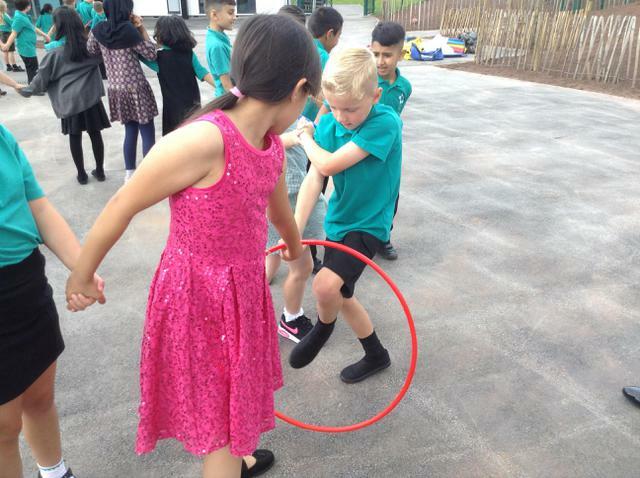 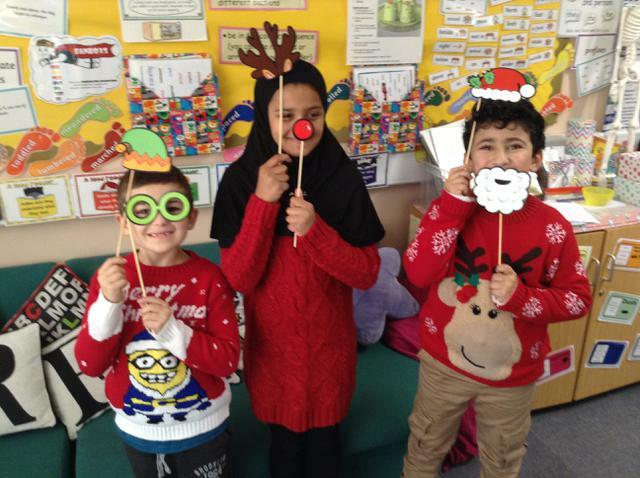 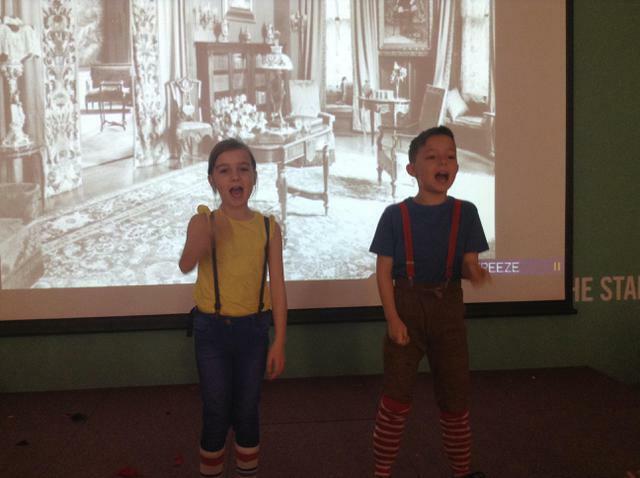 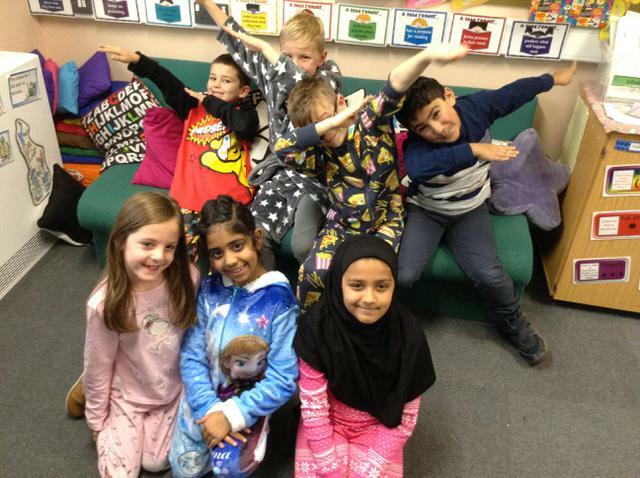 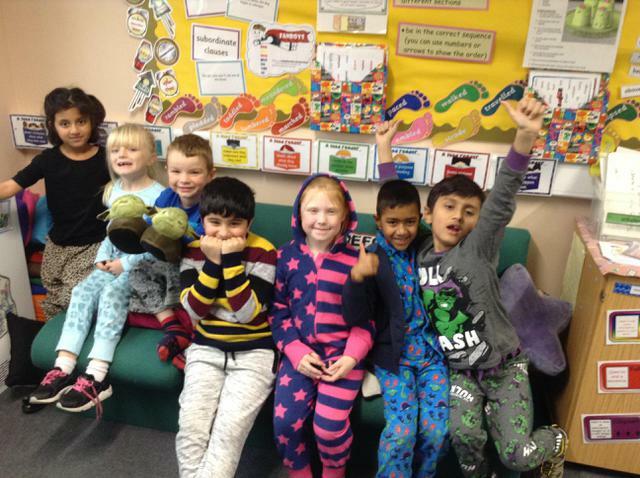 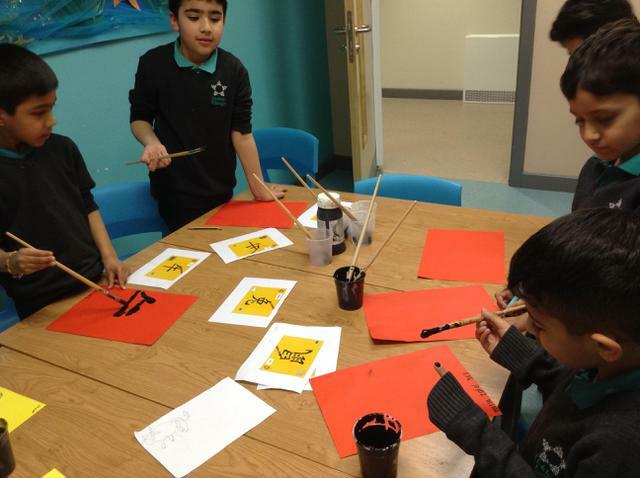 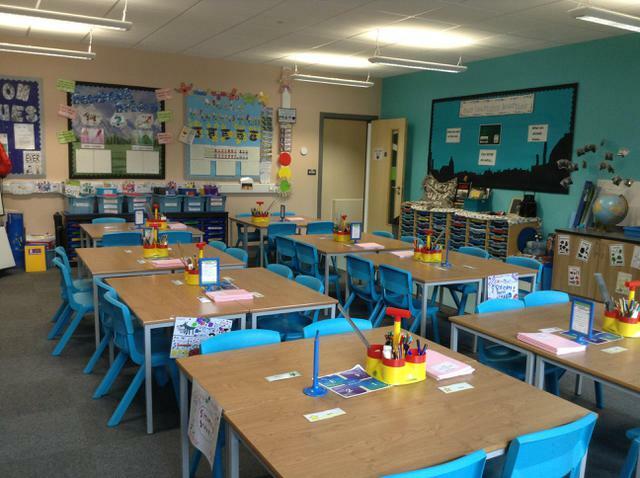 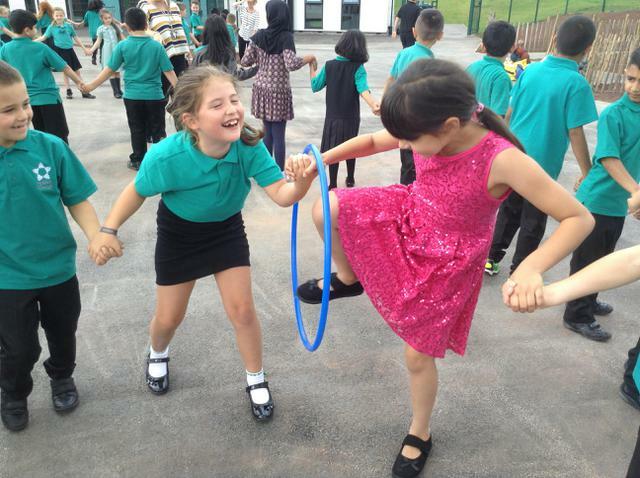 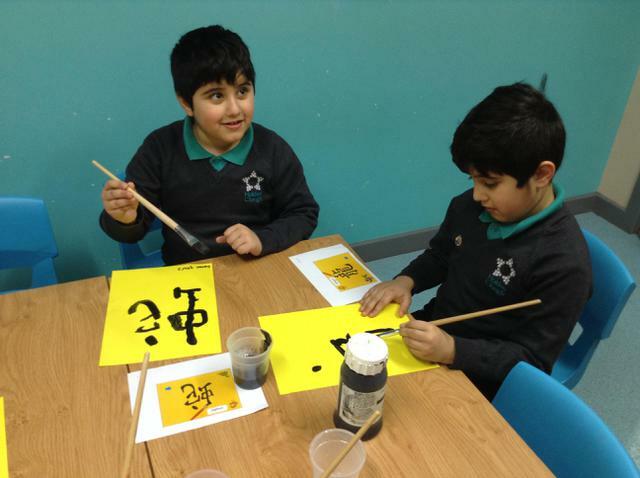 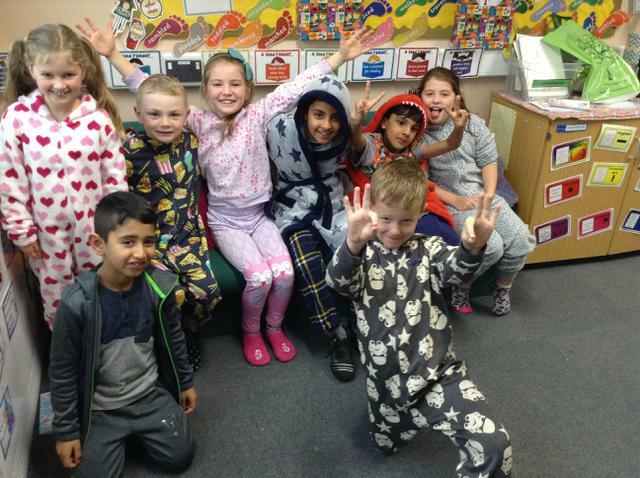 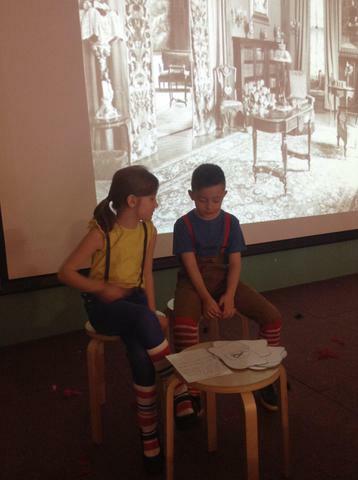 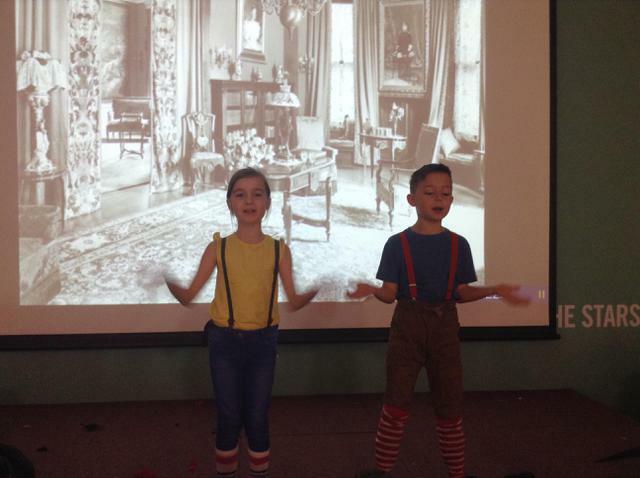 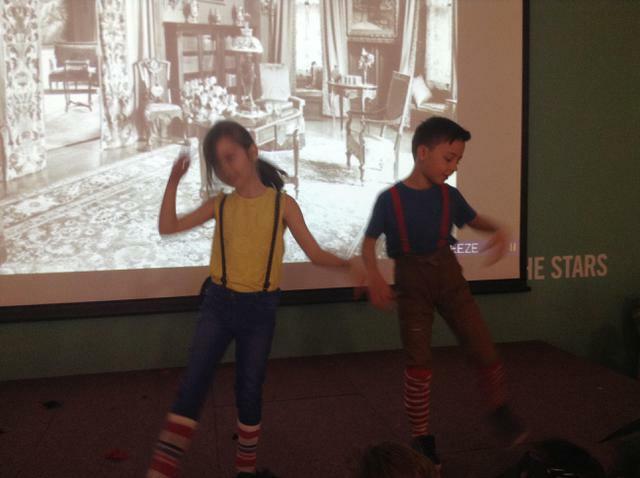 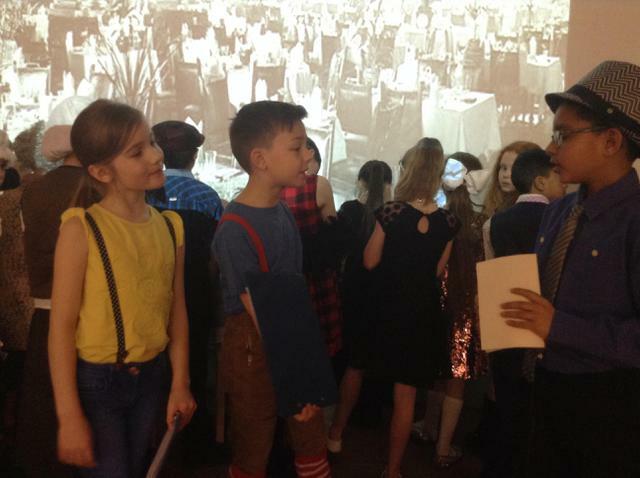 Children can come to school dressed in their own brightly coloured clothes because Dahl loved colour, especially the colour yellow! 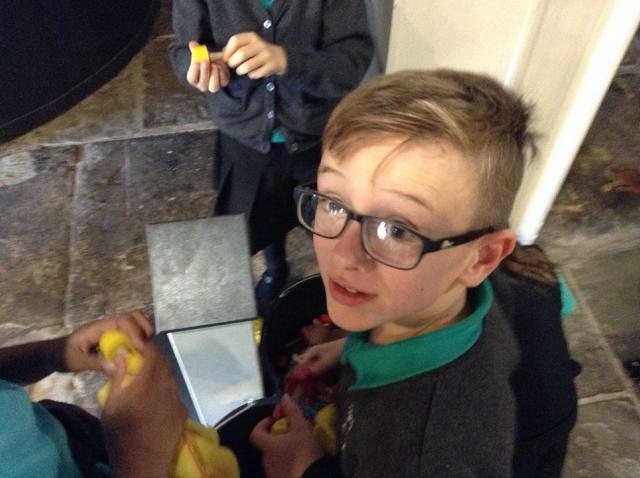 If you can find something yellow for your child to wear that would be great! 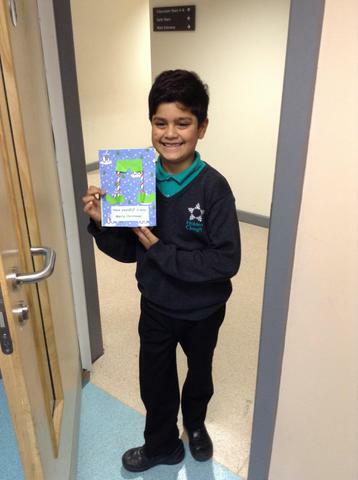 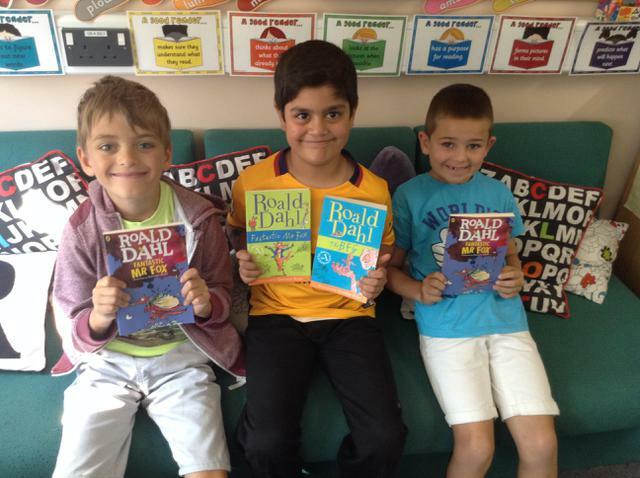 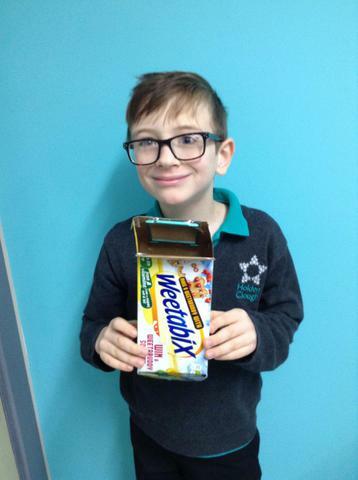 If your child has a favourite Roald Dahl book they can bring this into class, to share during the morning. 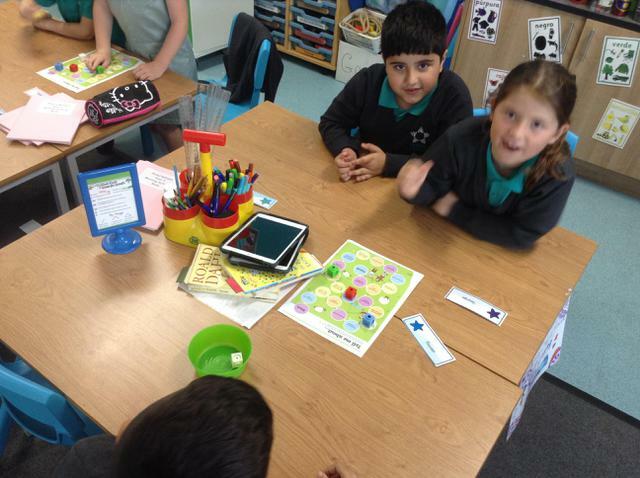 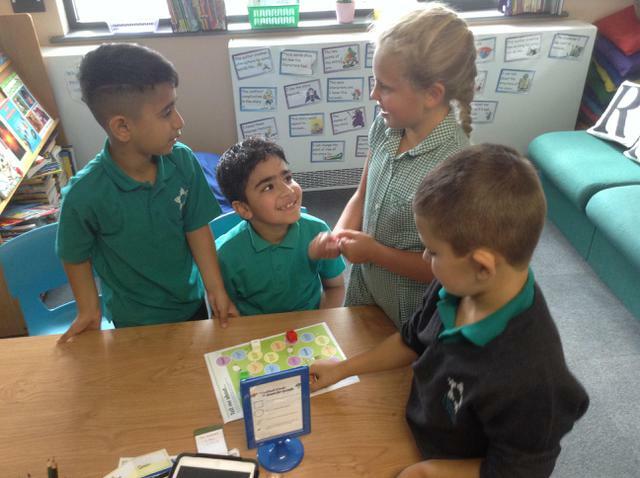 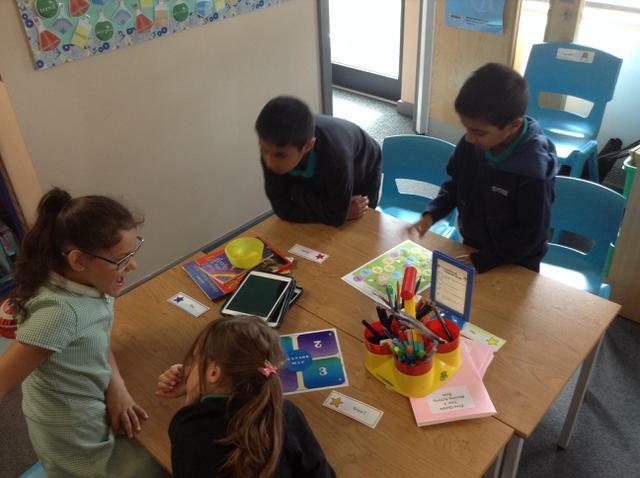 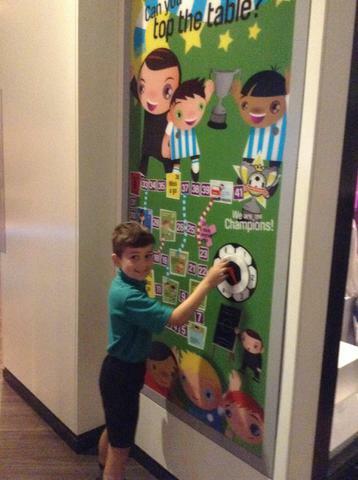 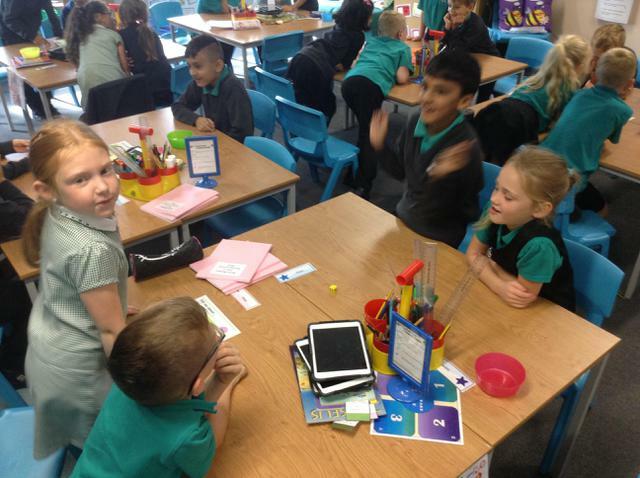 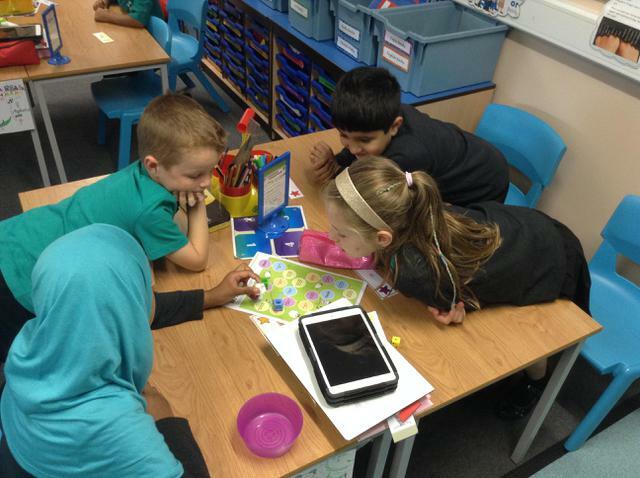 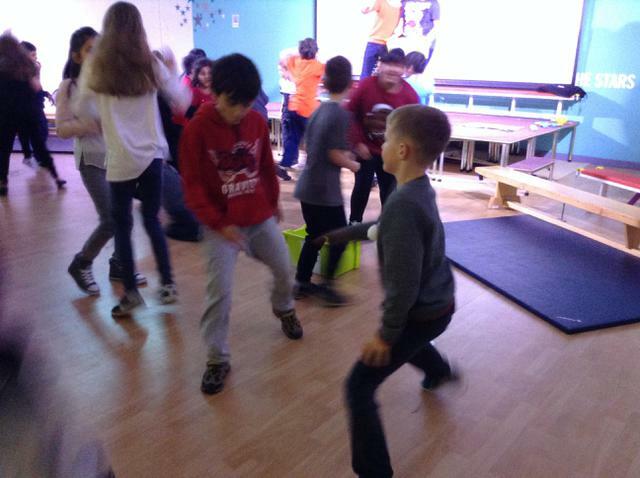 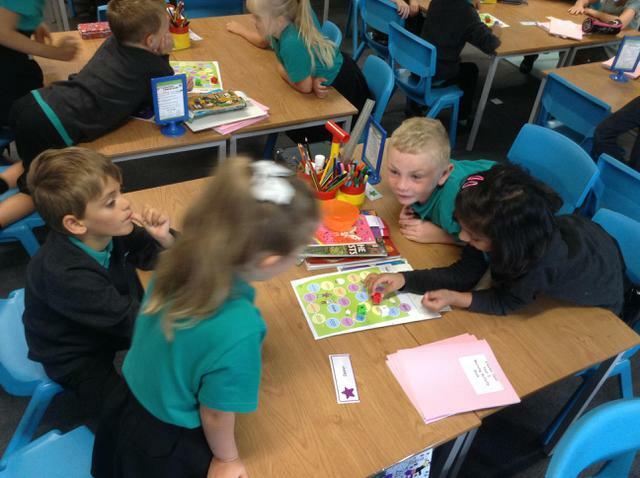 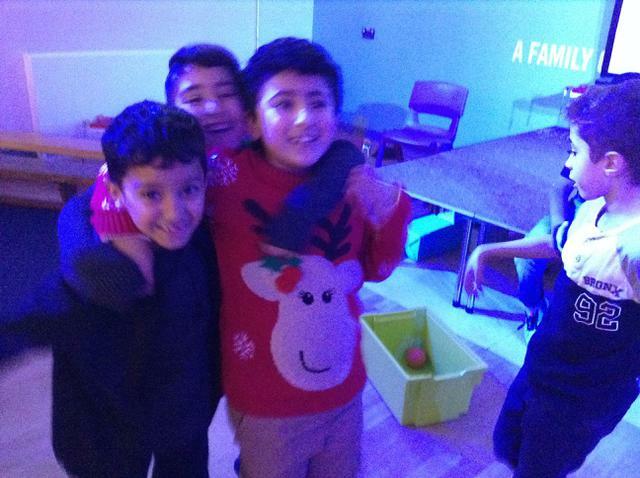 We had lots of fun this week participating in Kagan and team building activities.